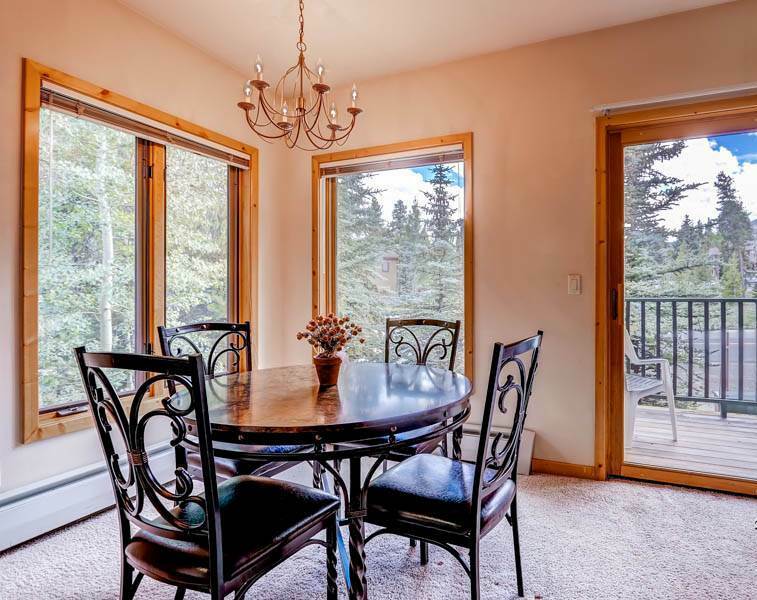 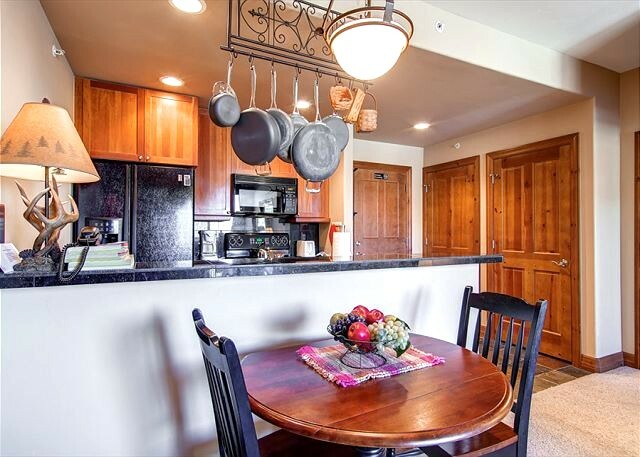 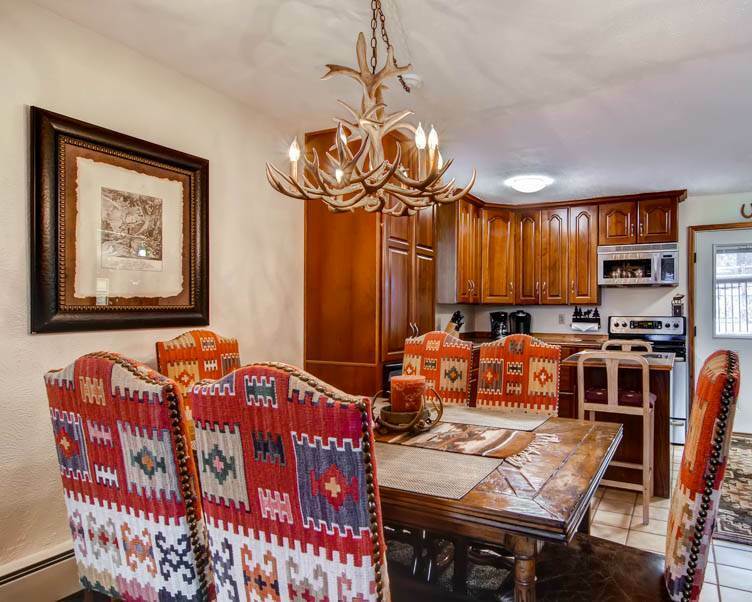 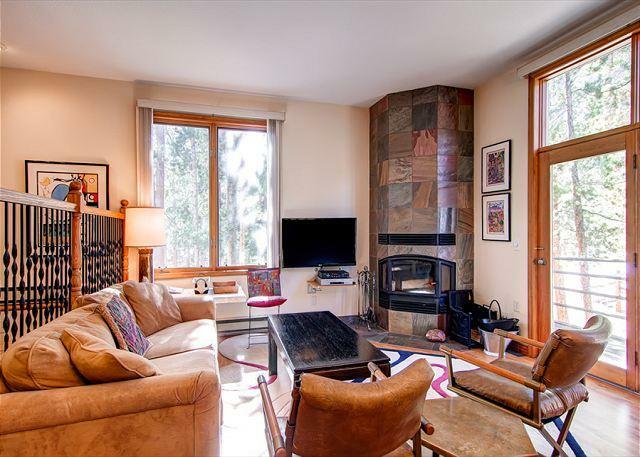 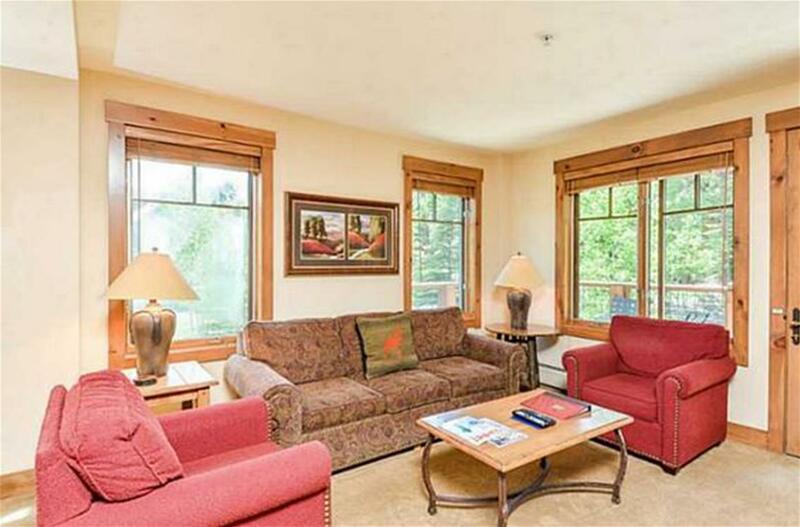 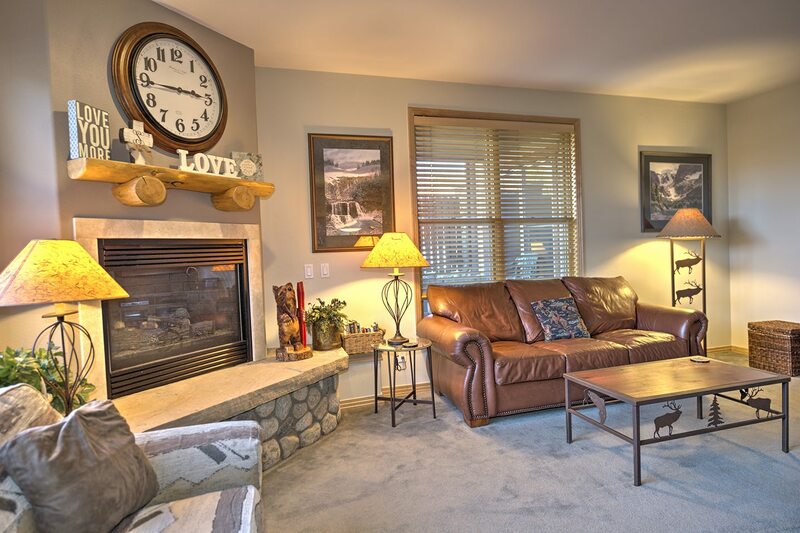 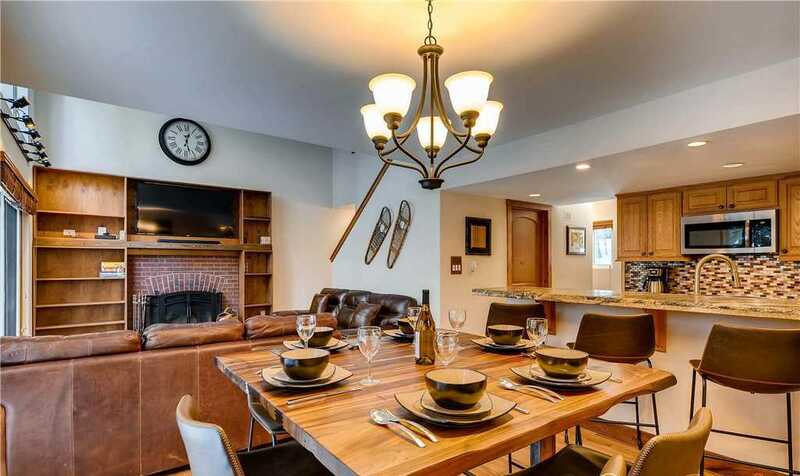 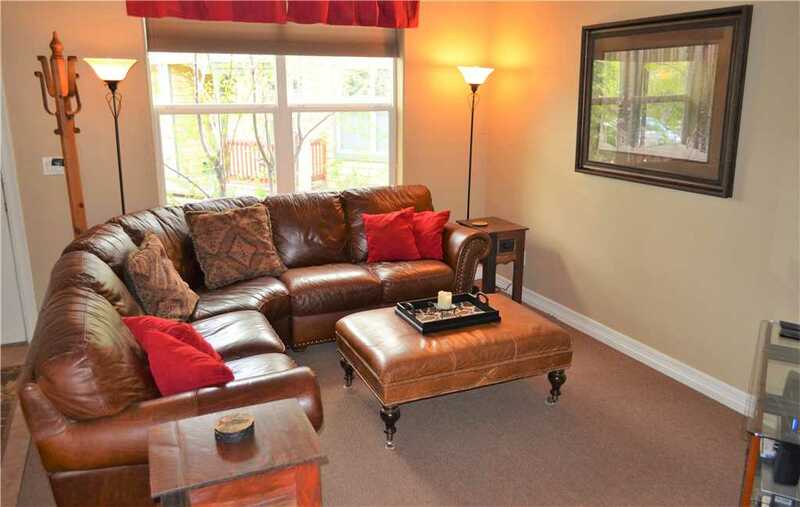 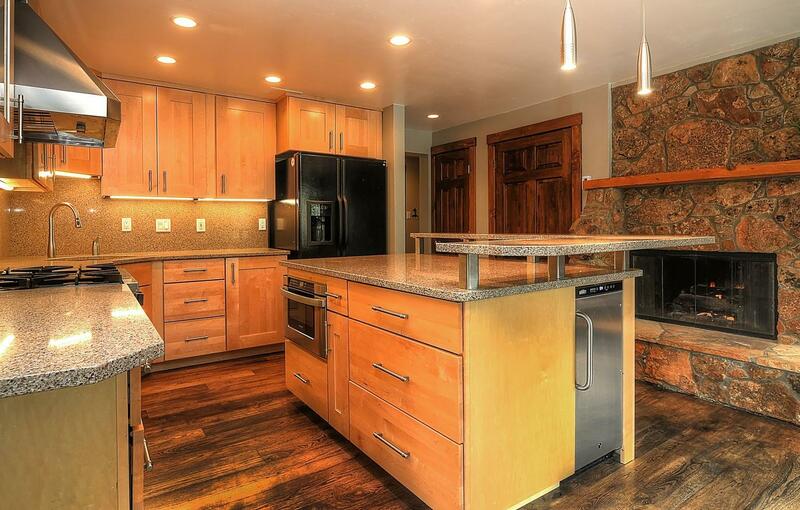 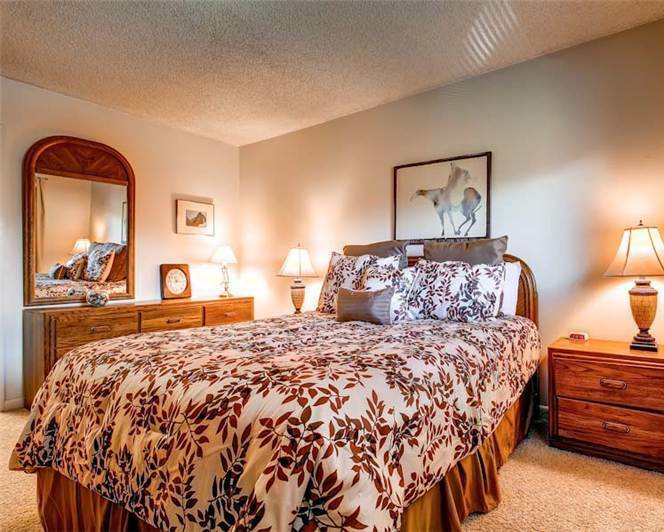 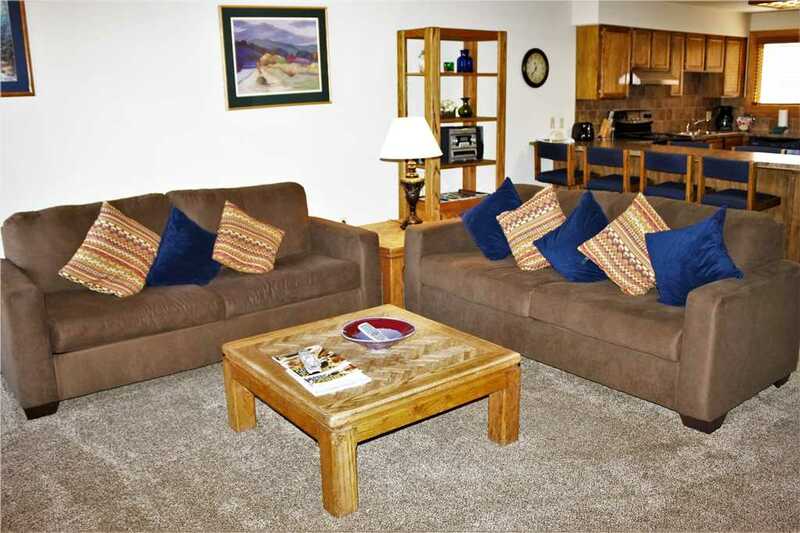 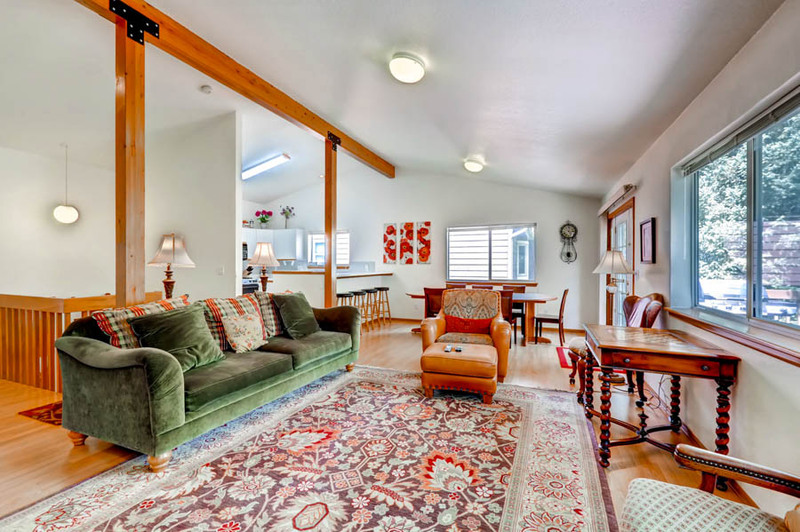 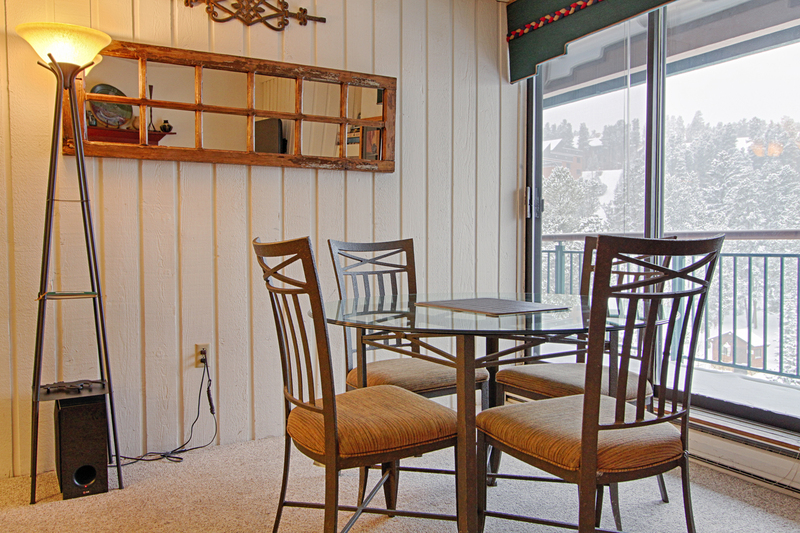 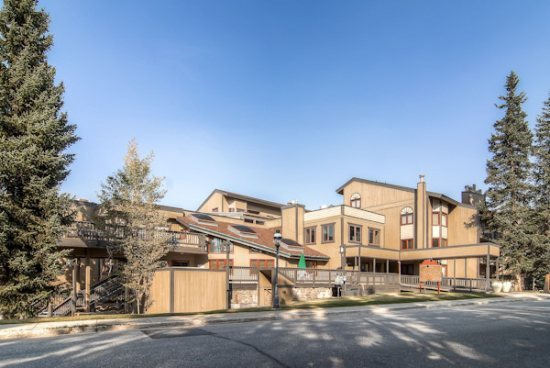 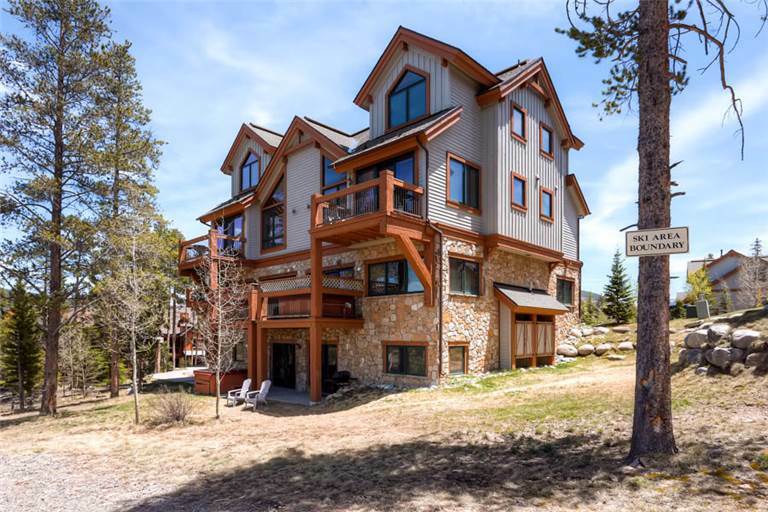 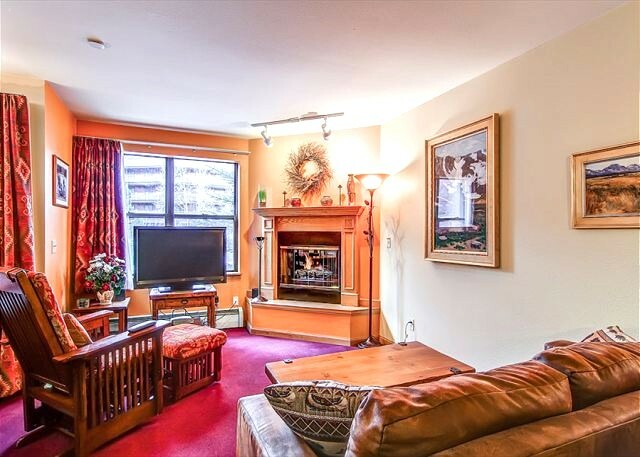 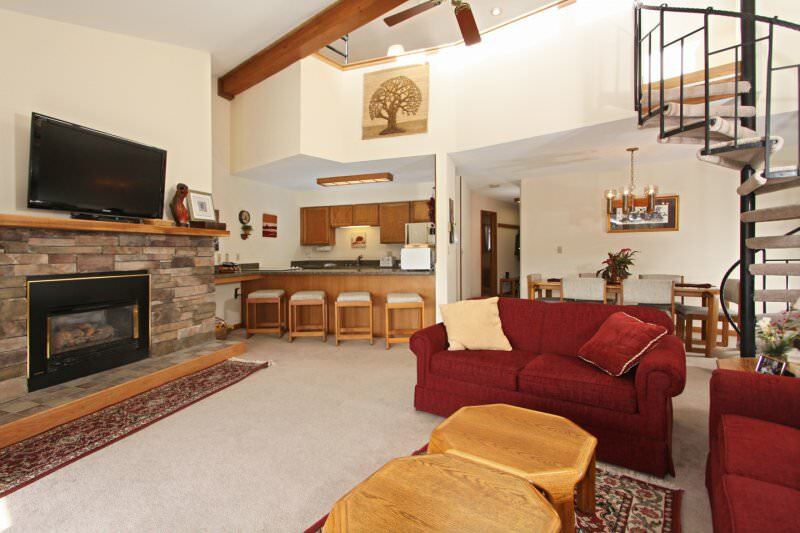 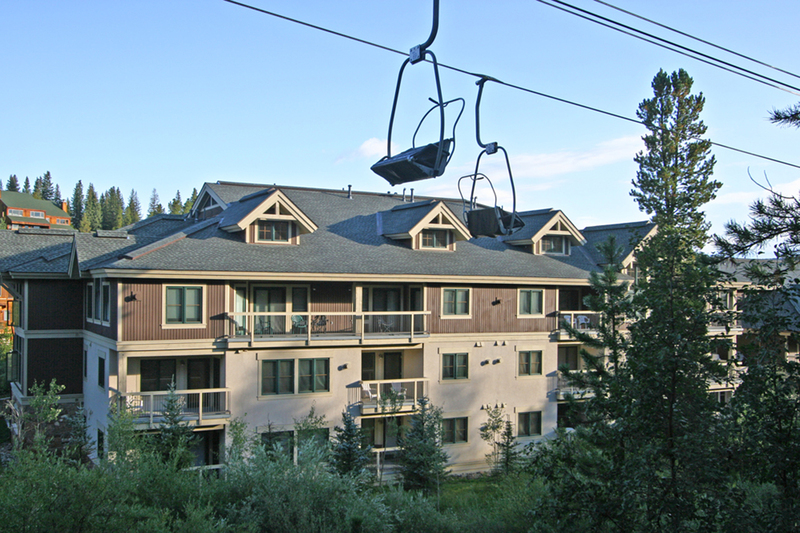 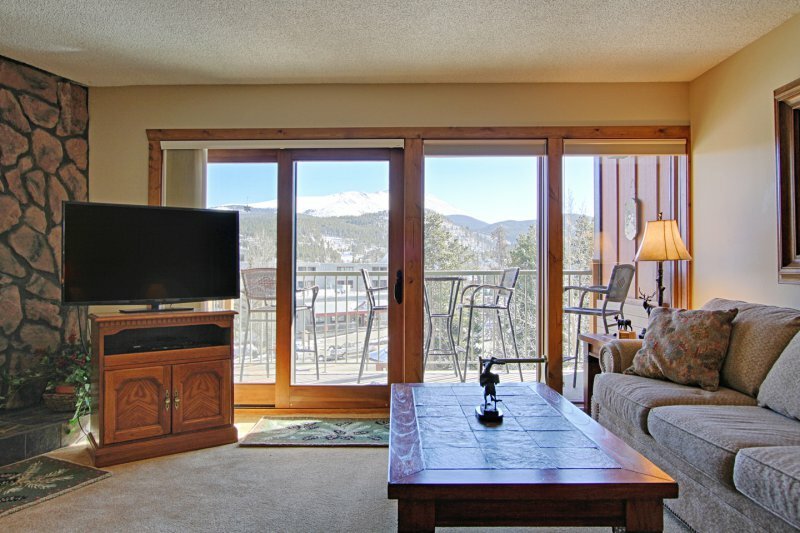 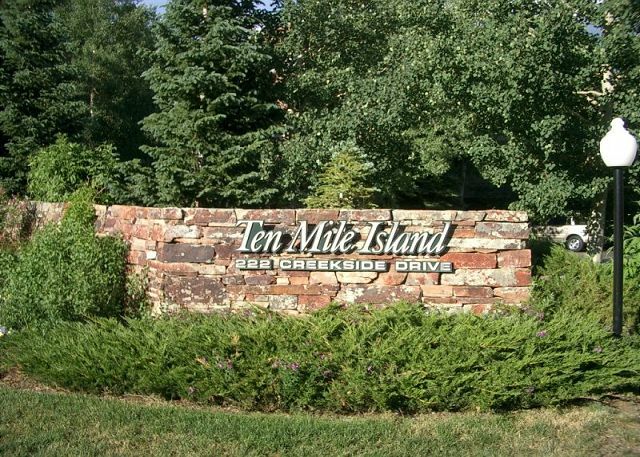 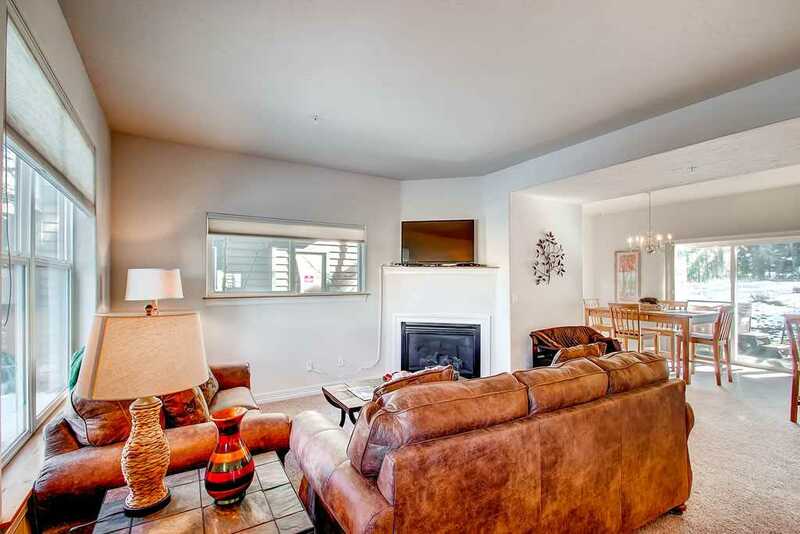 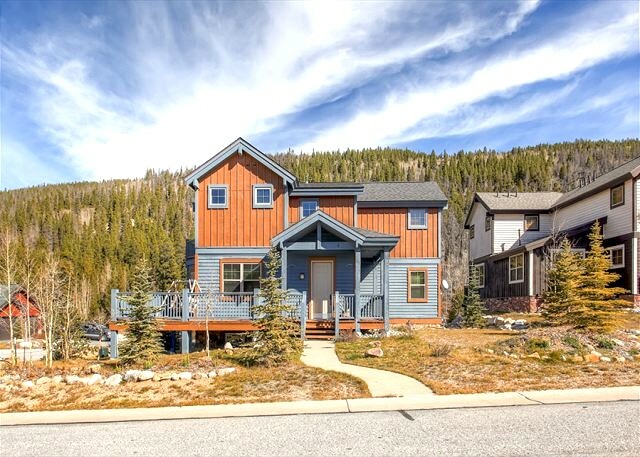 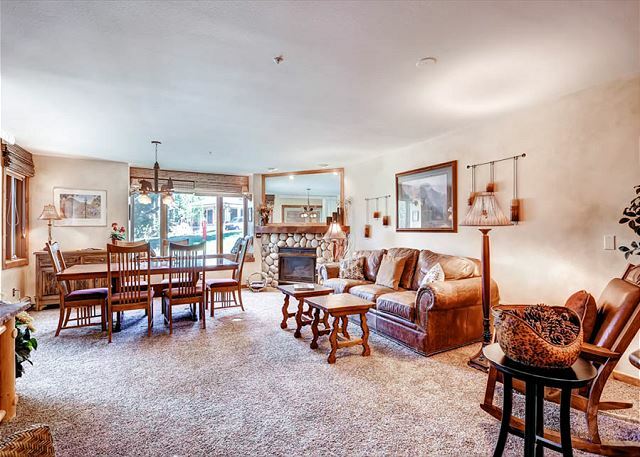 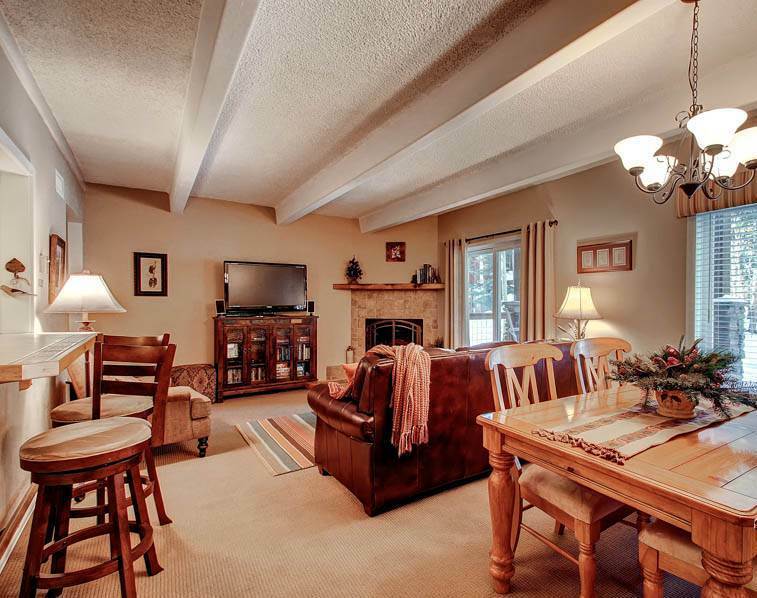 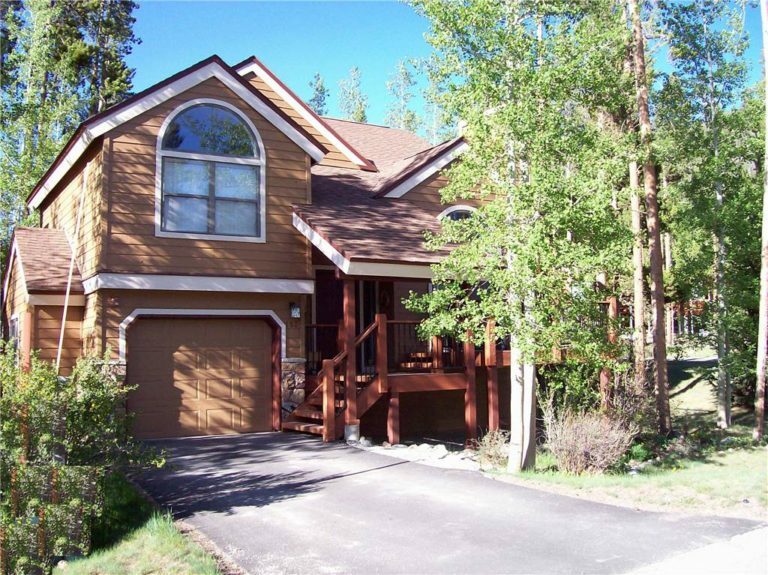 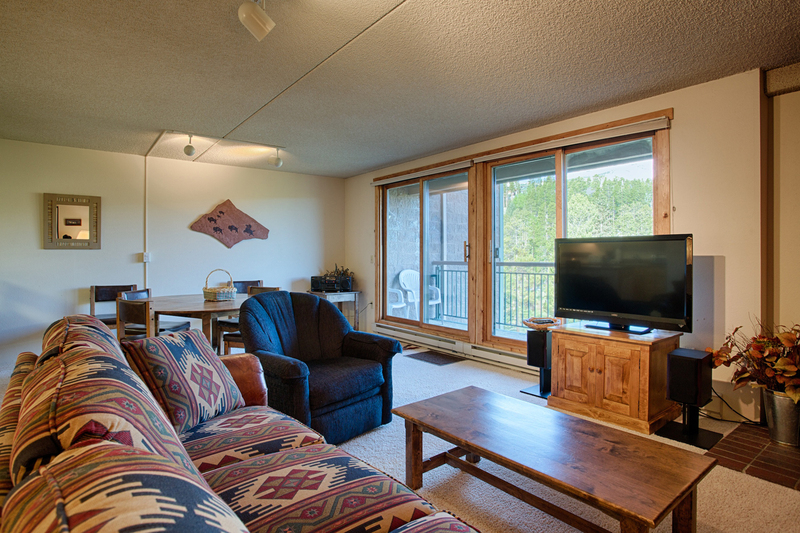 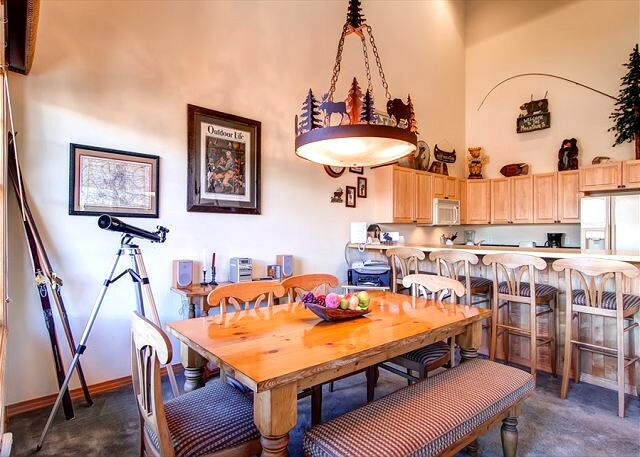 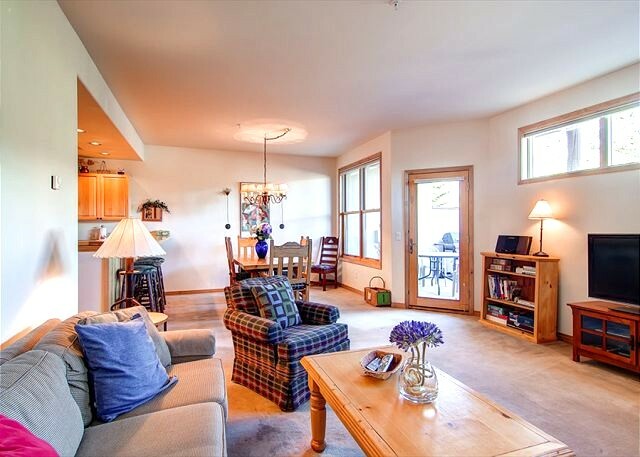 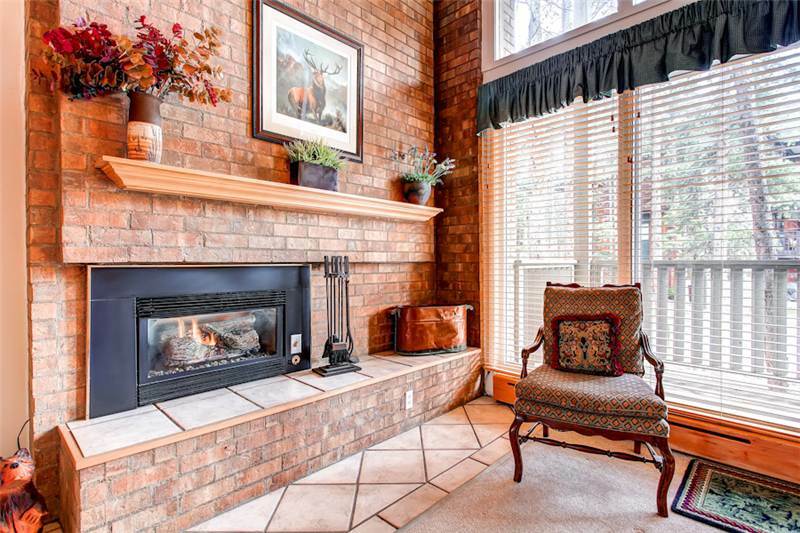 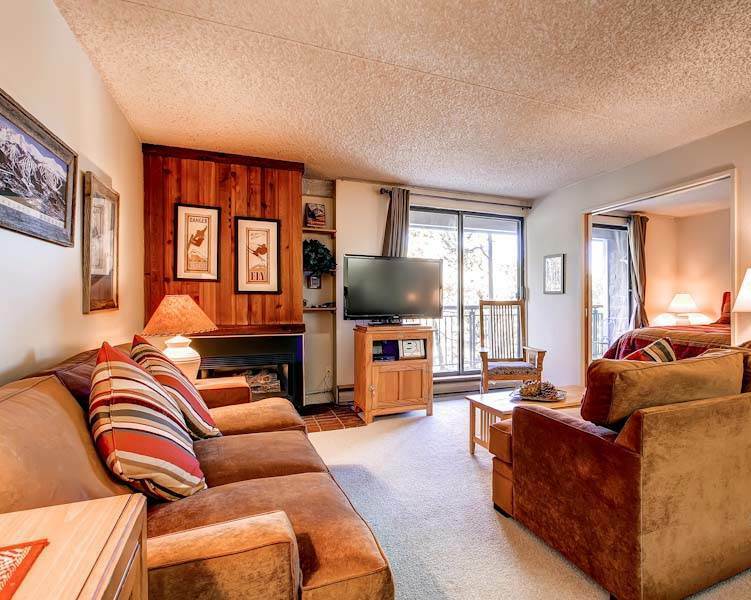 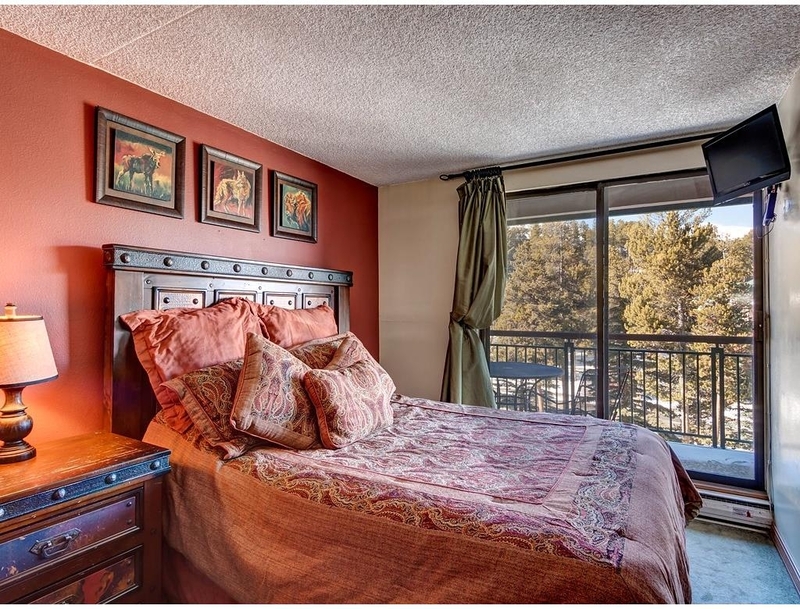 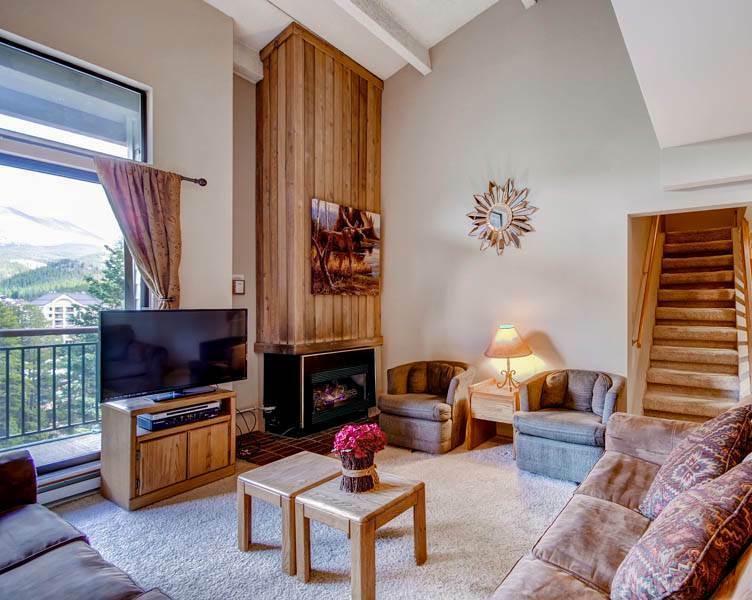 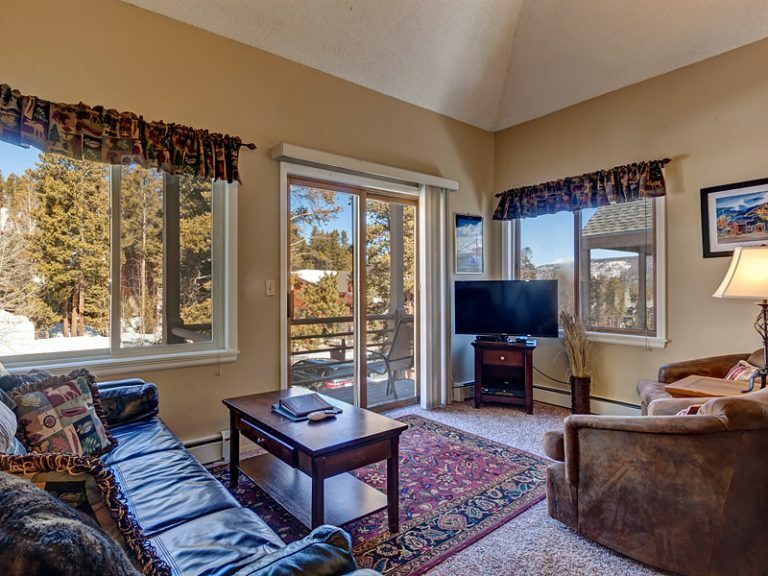 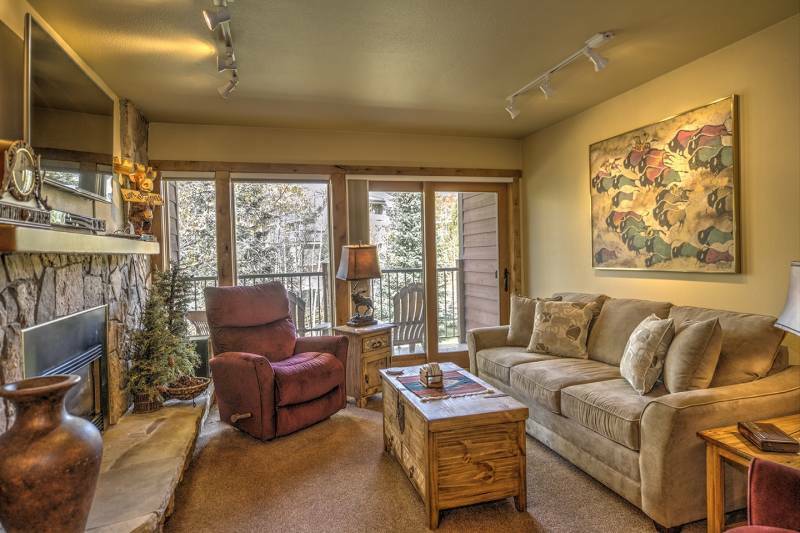 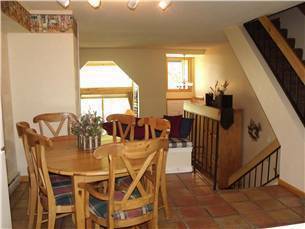 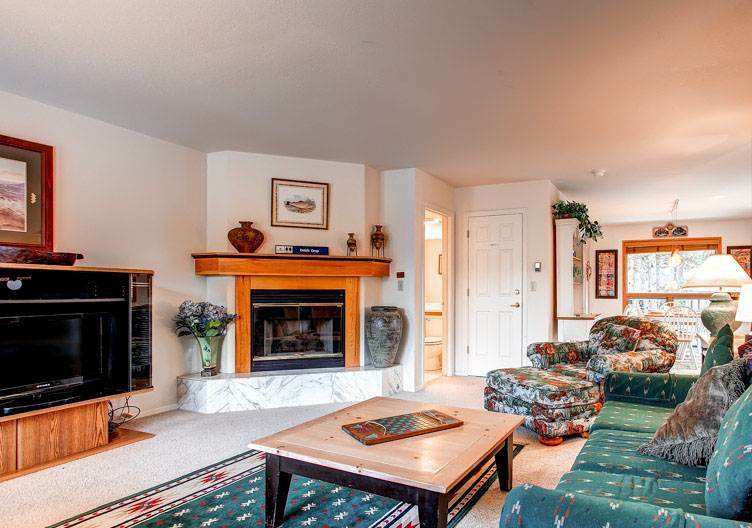 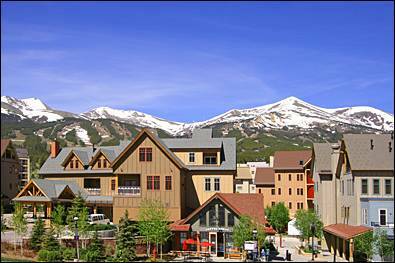 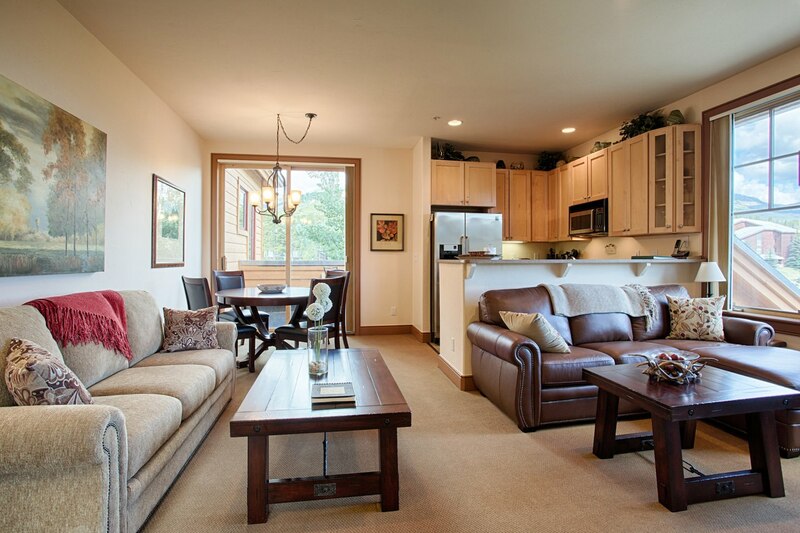 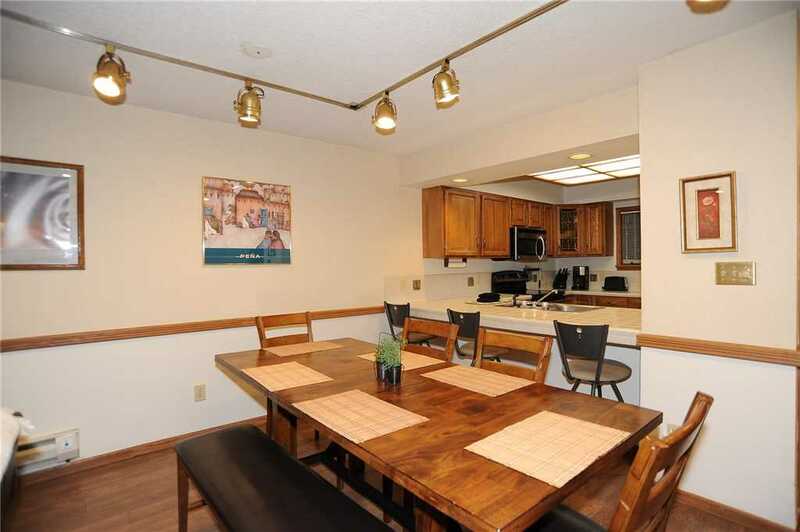 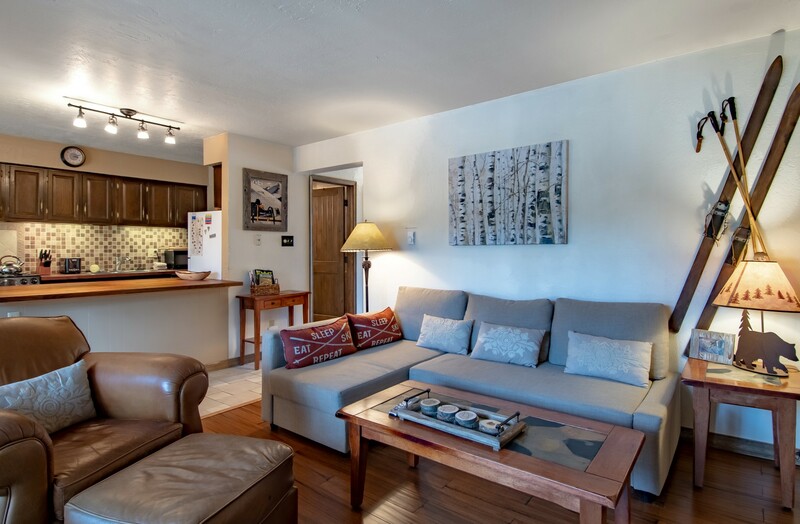 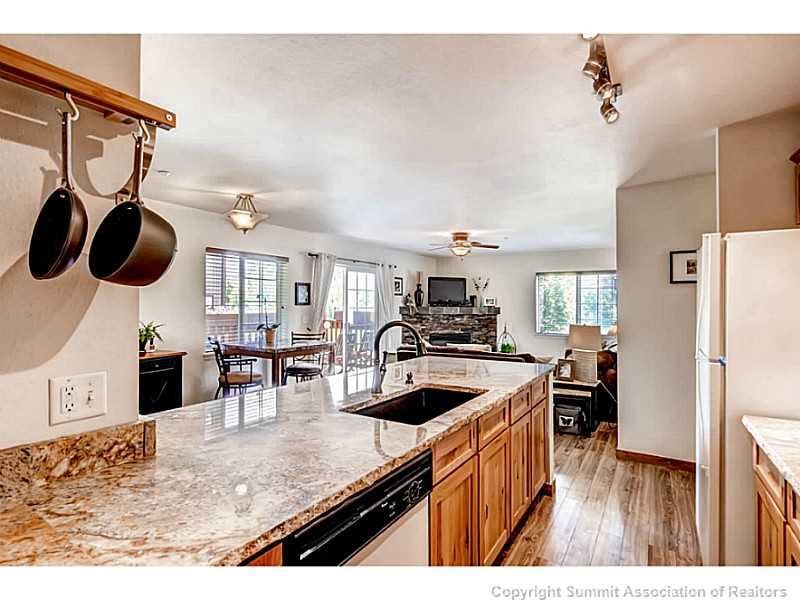 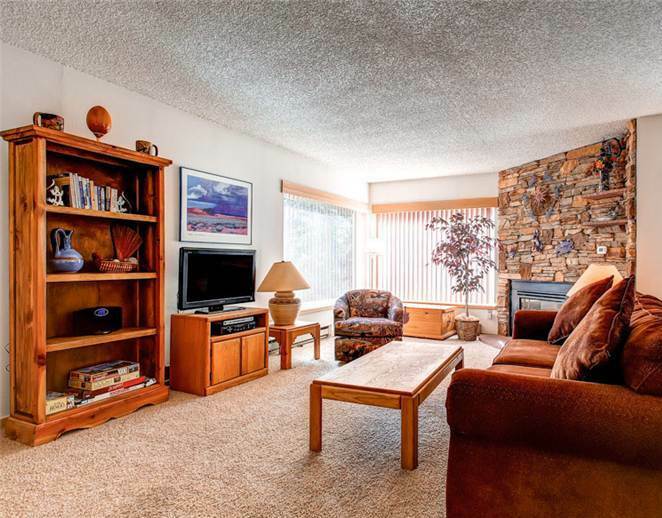 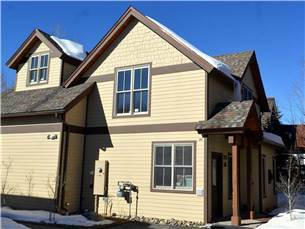 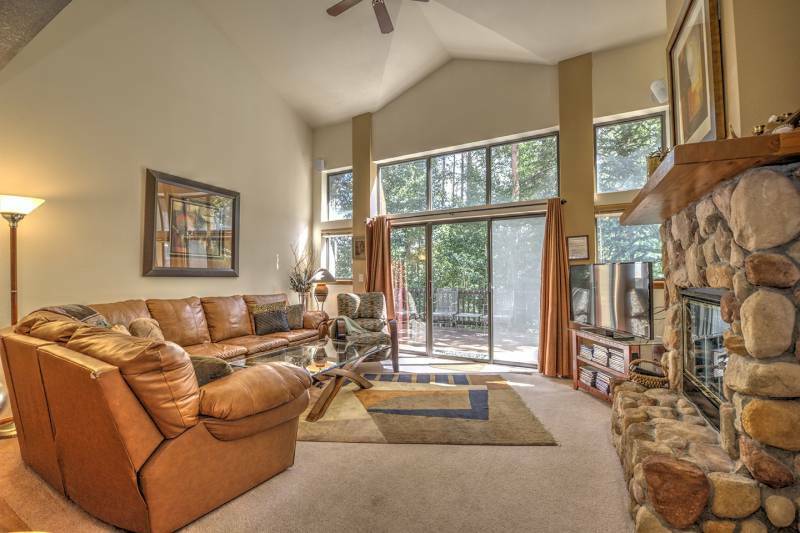 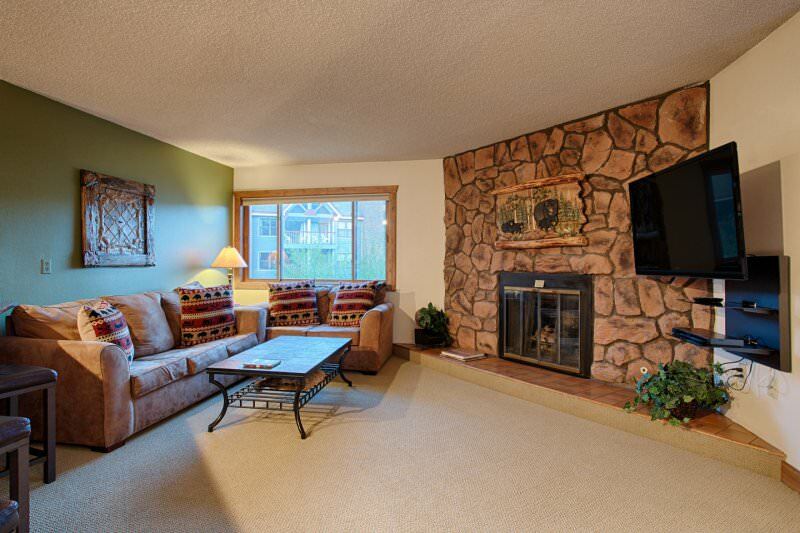 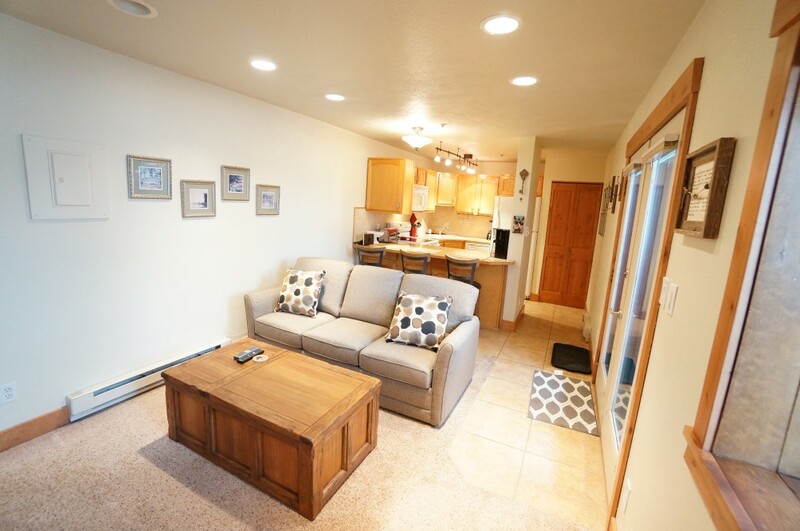 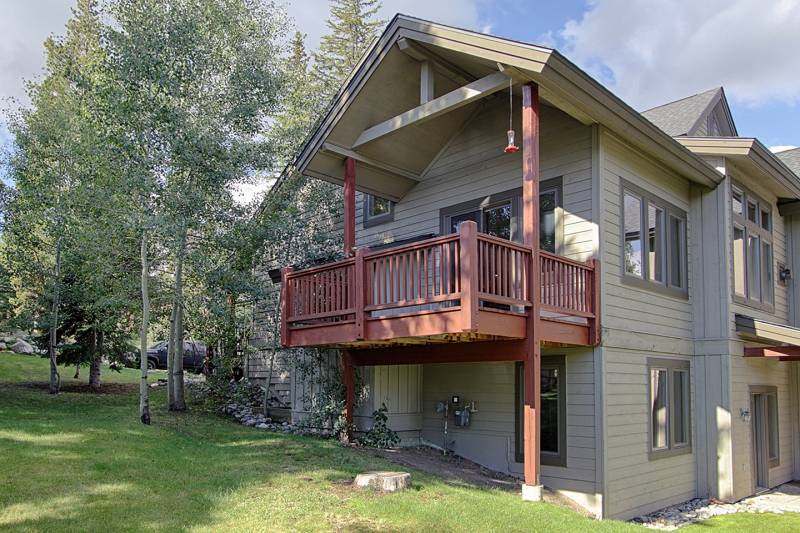 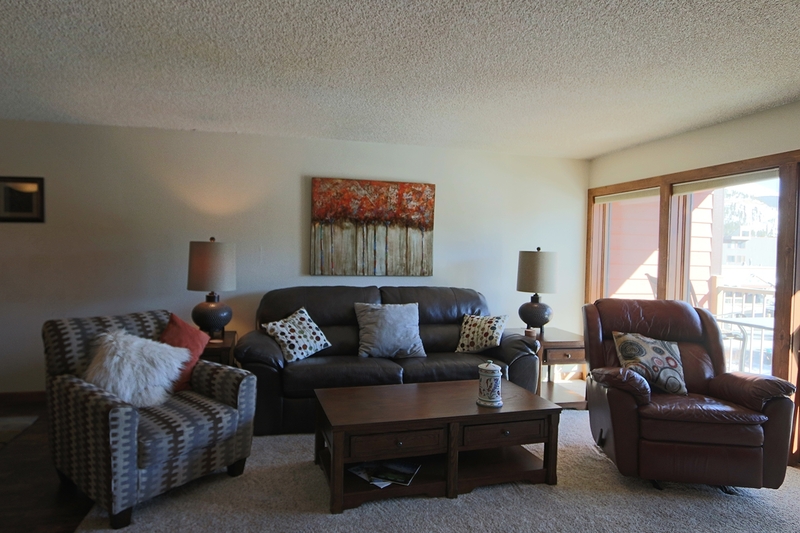 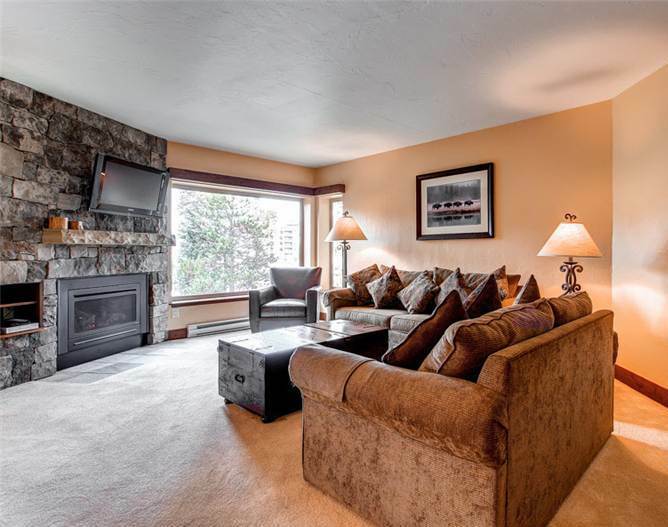 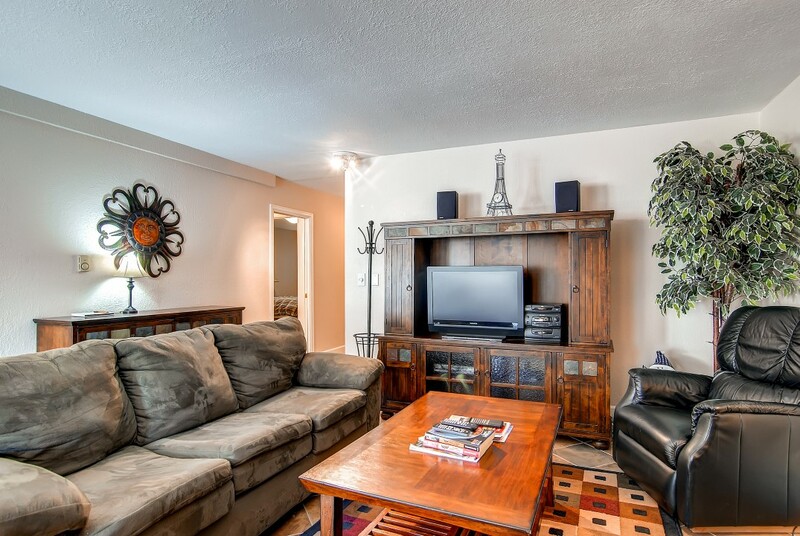 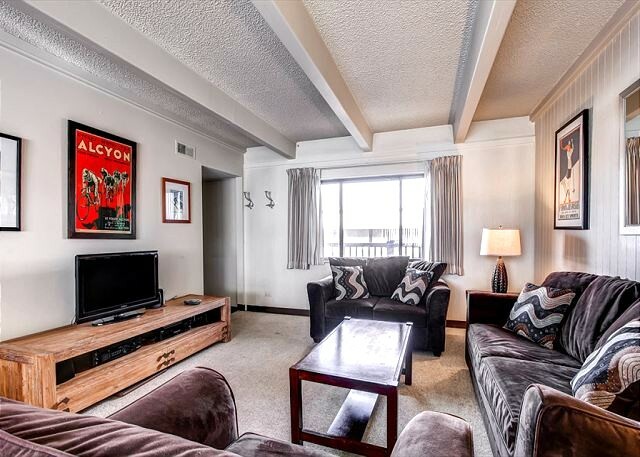 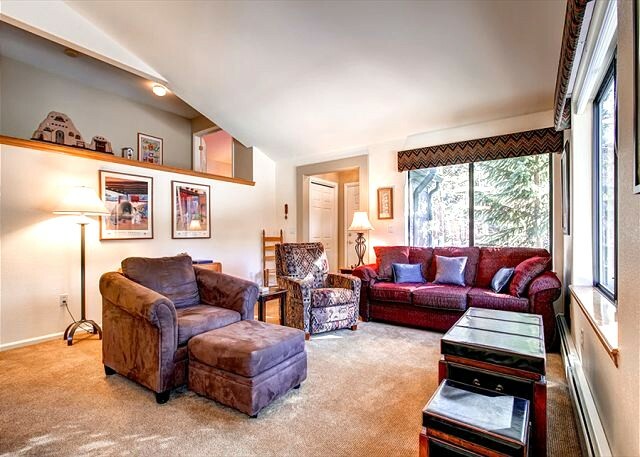 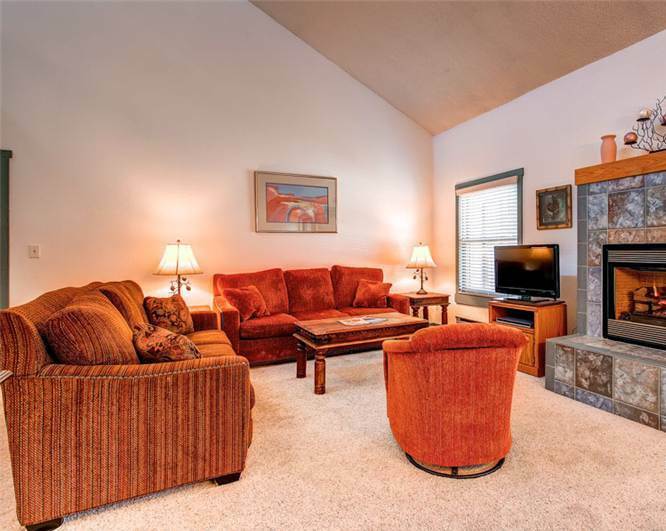 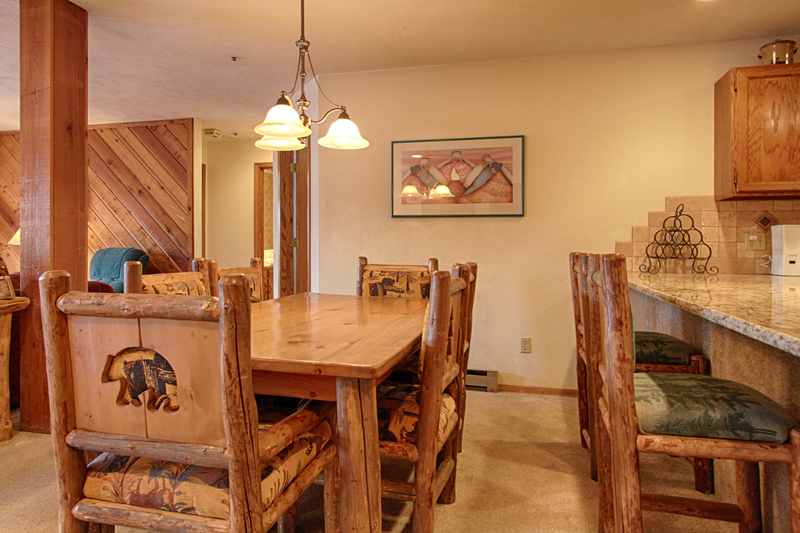 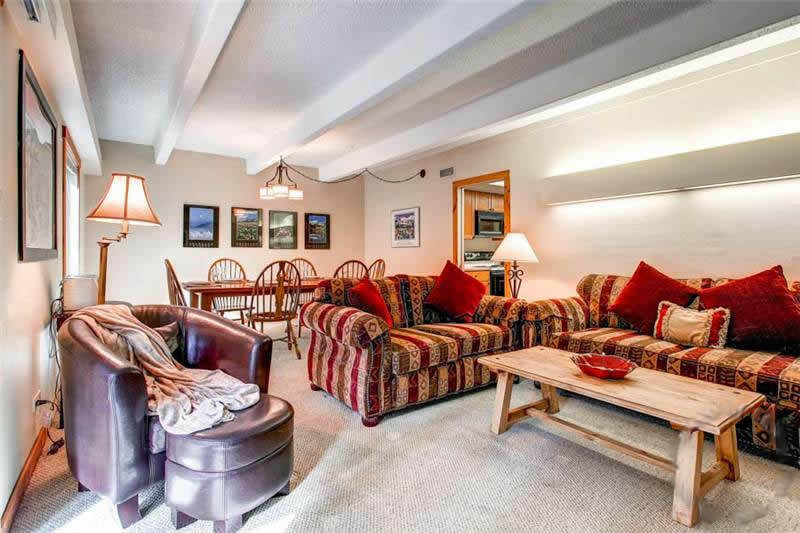 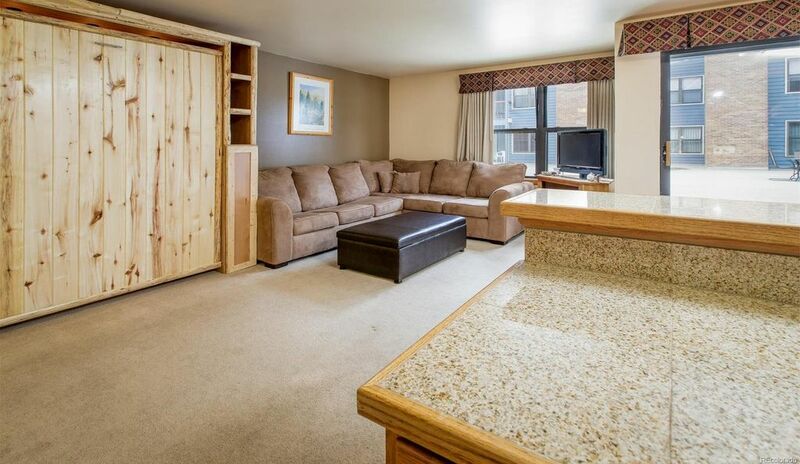 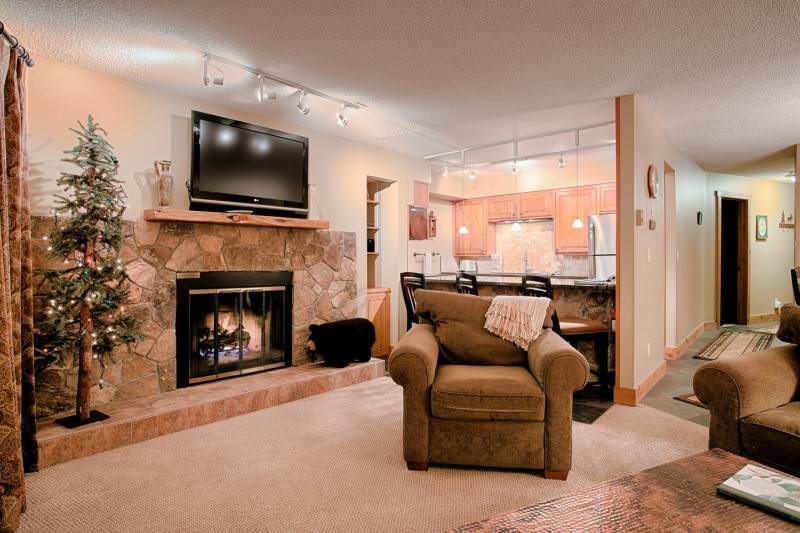 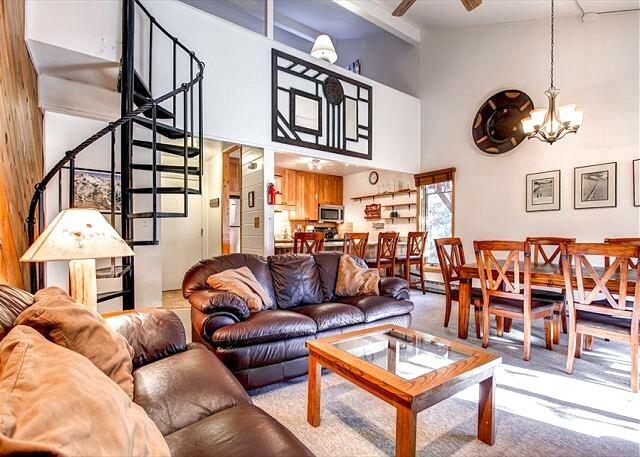 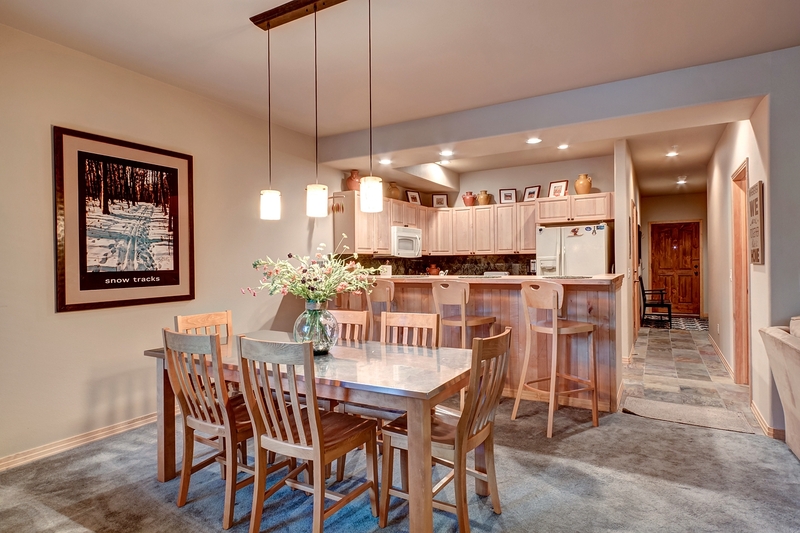 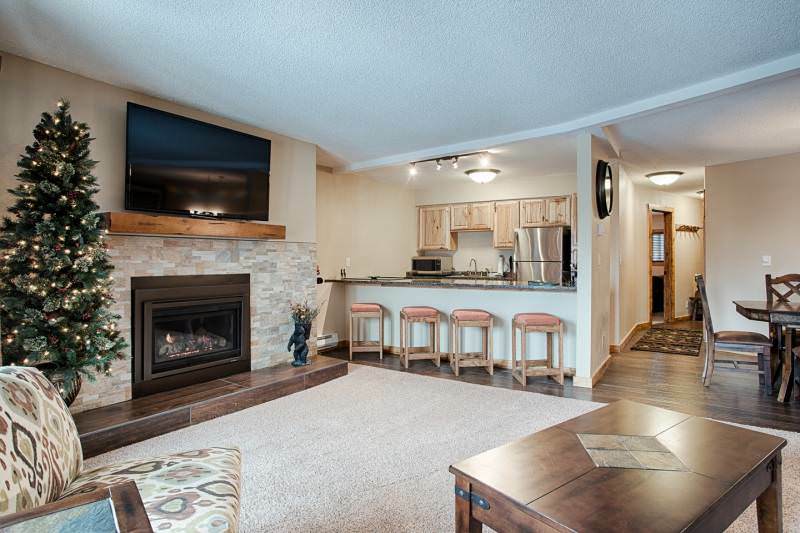 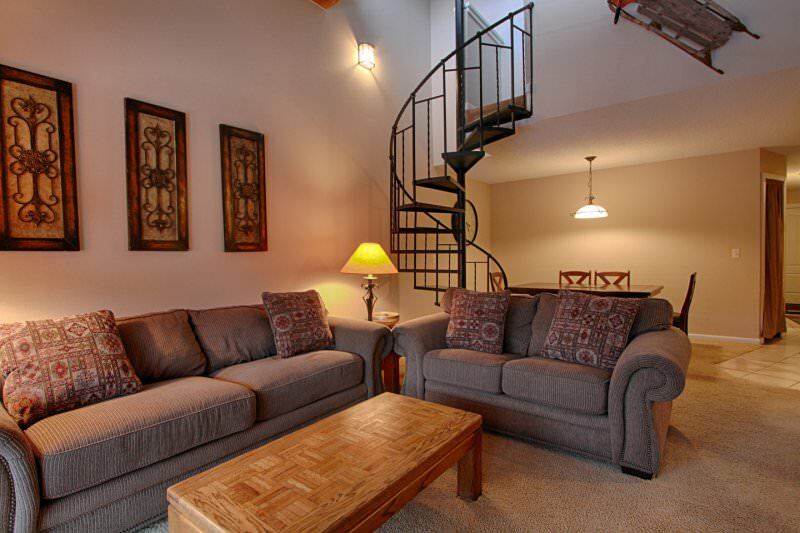 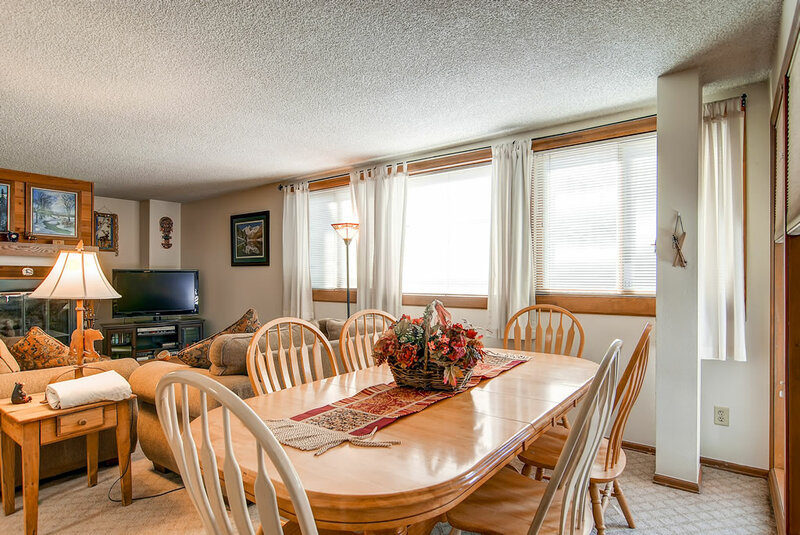 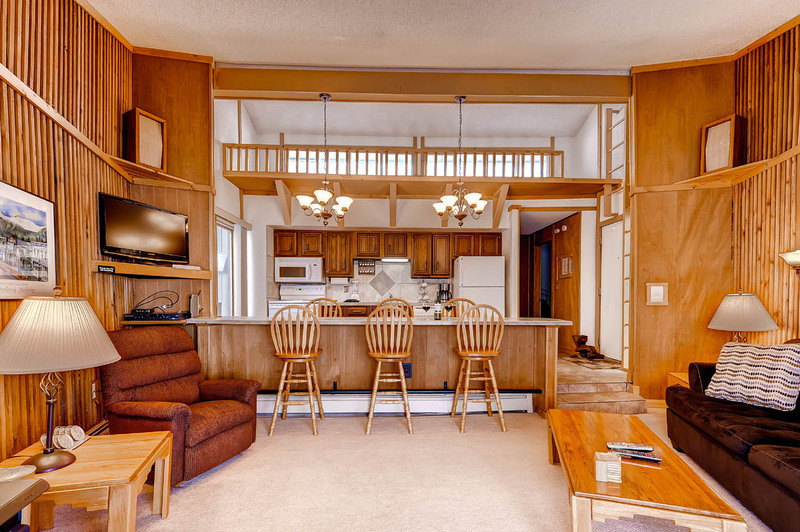 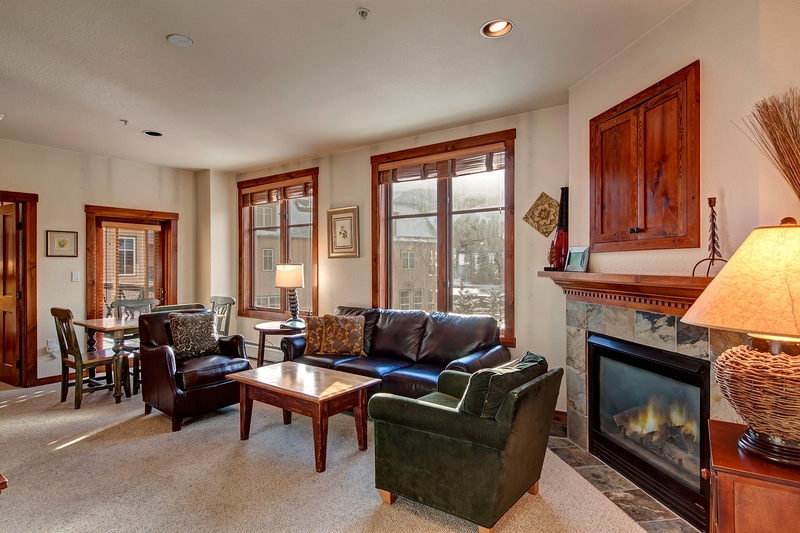 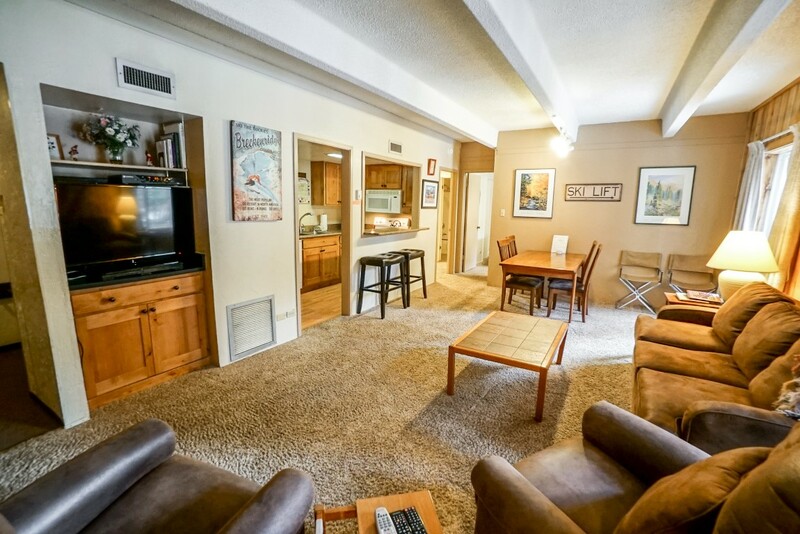 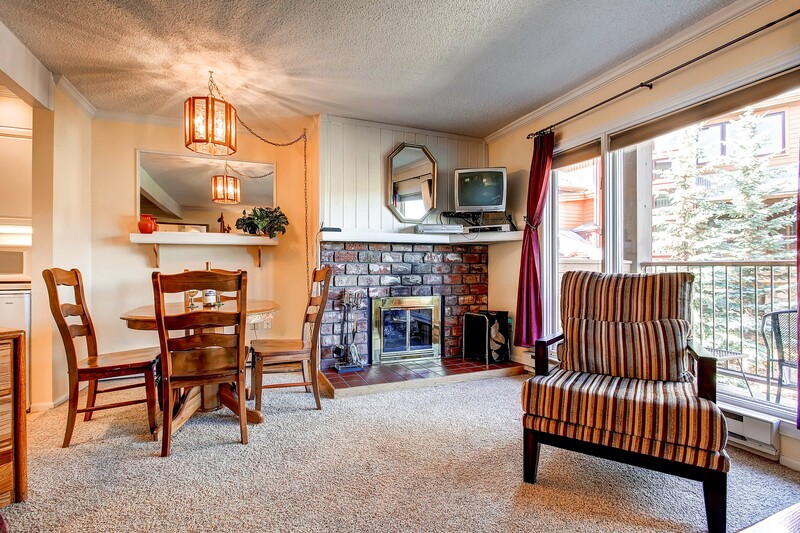 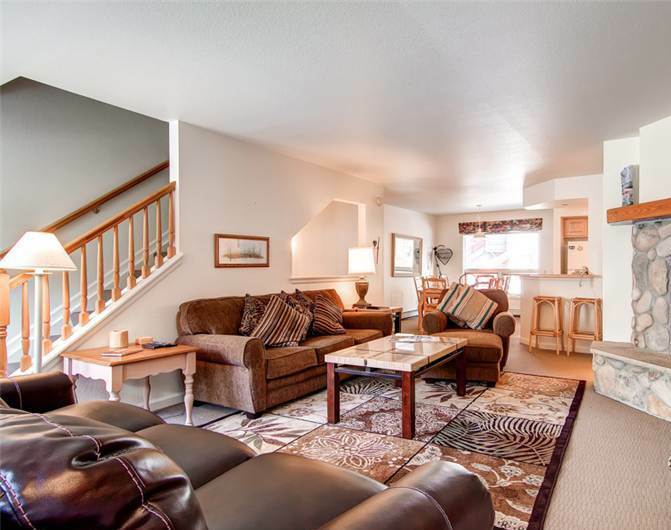 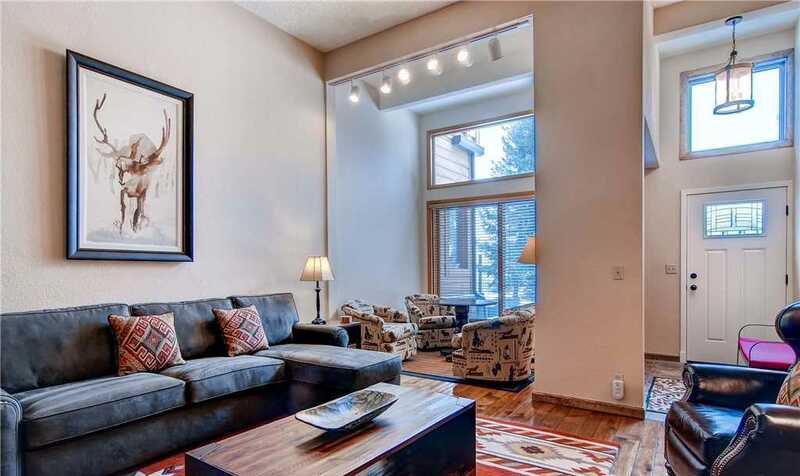 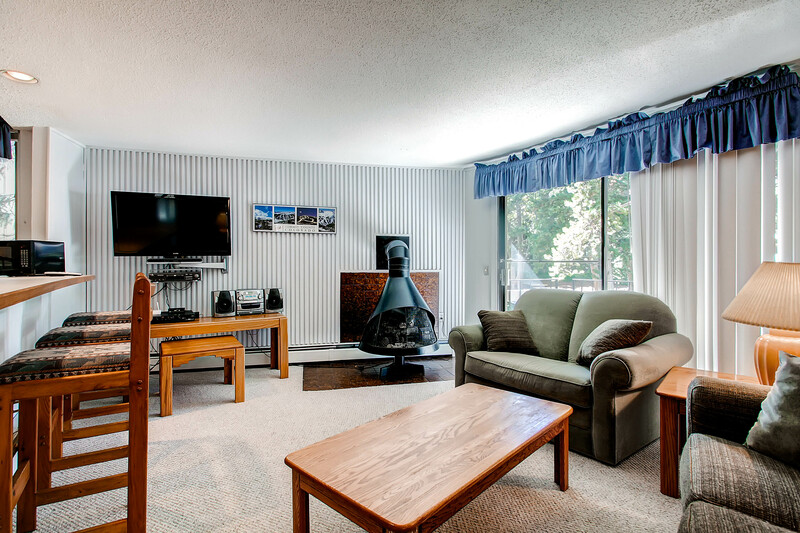 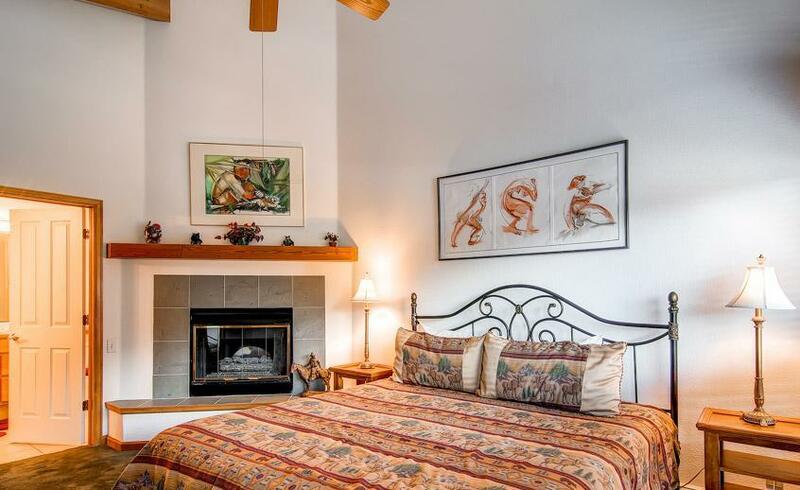 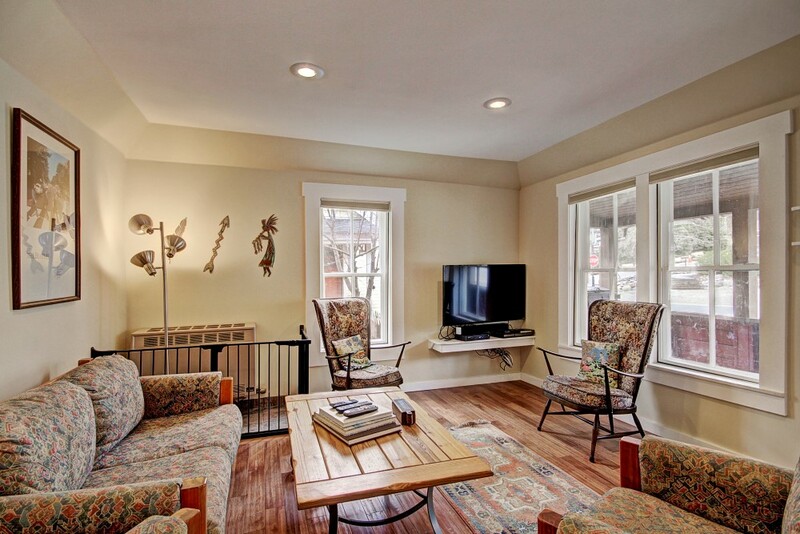 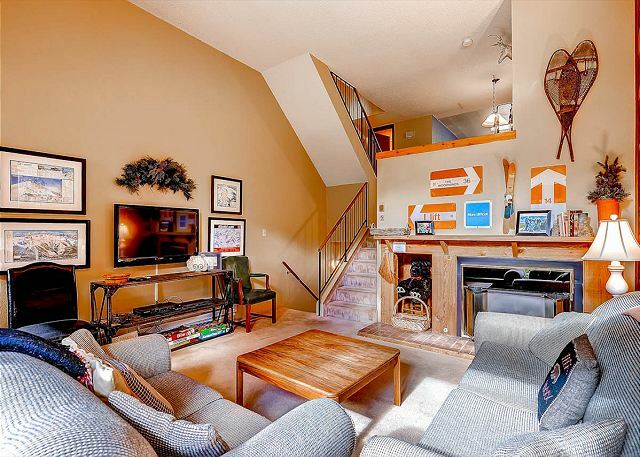 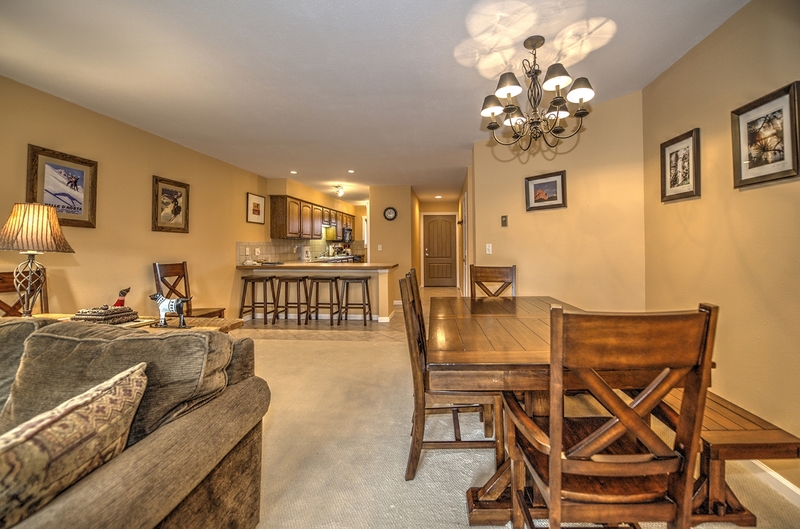 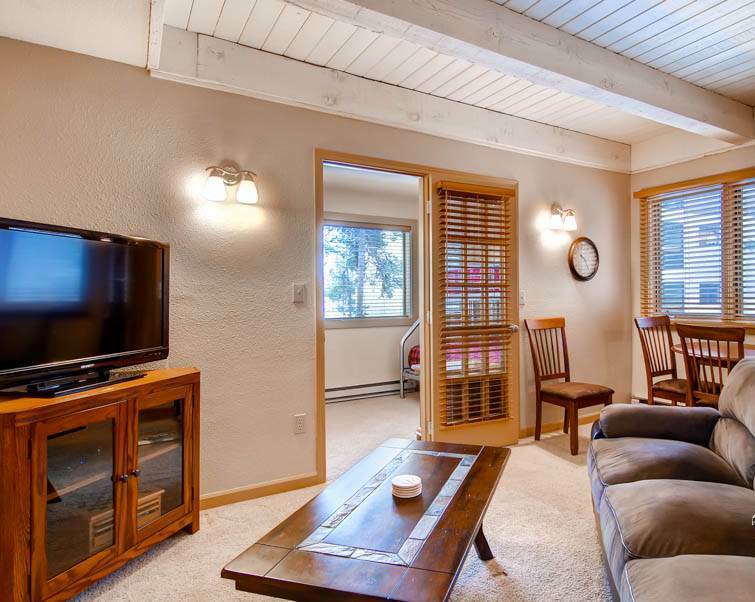 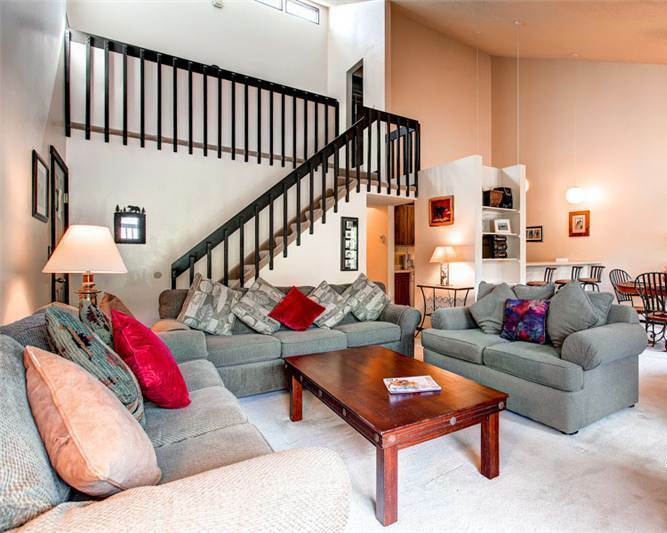 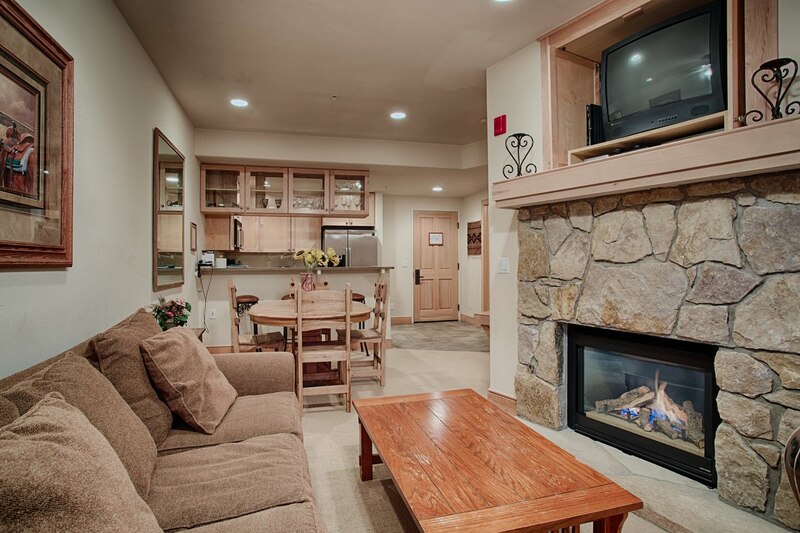 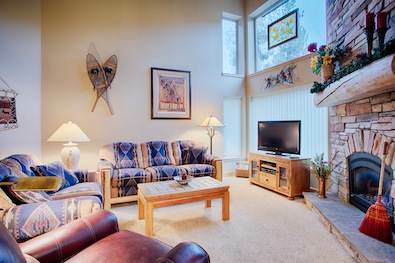 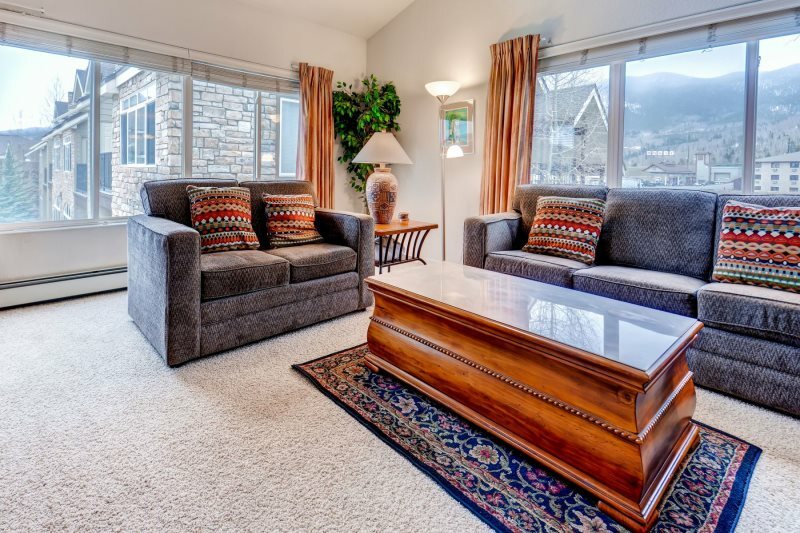 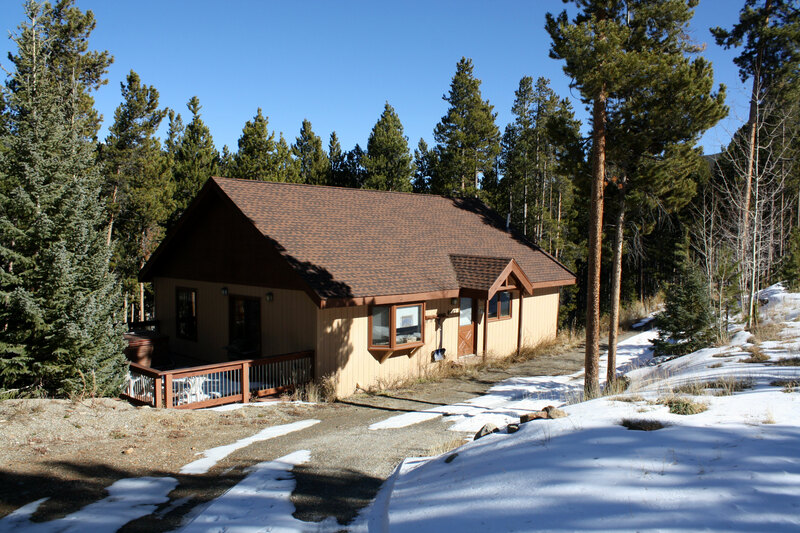 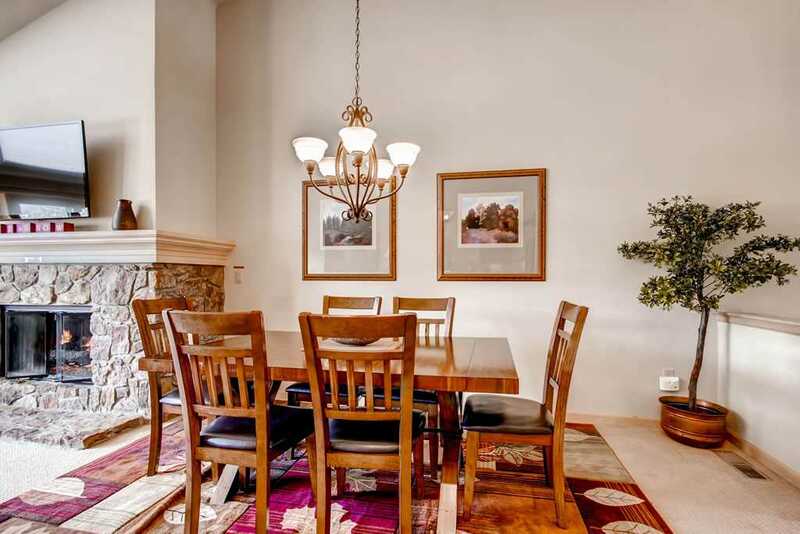 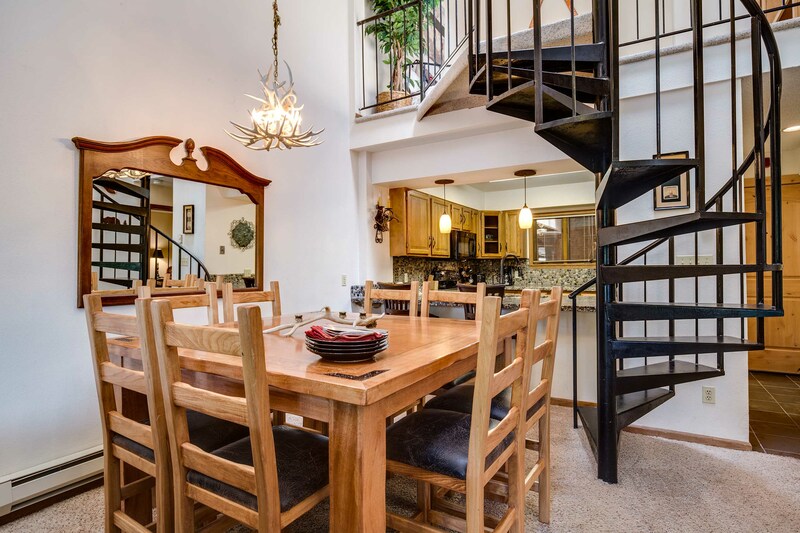 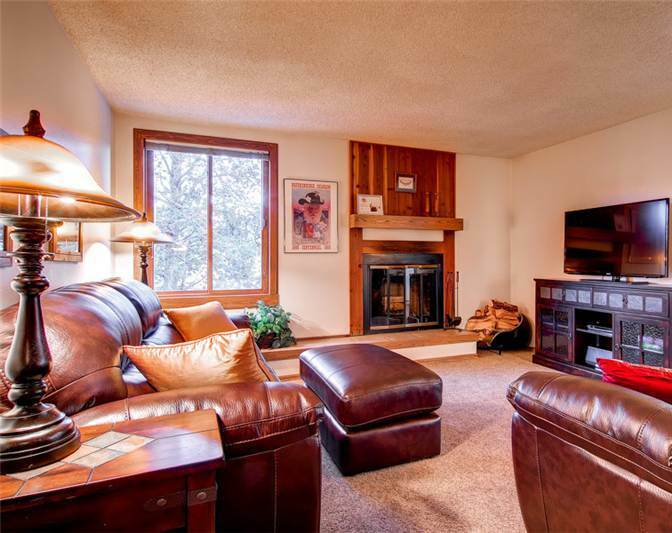 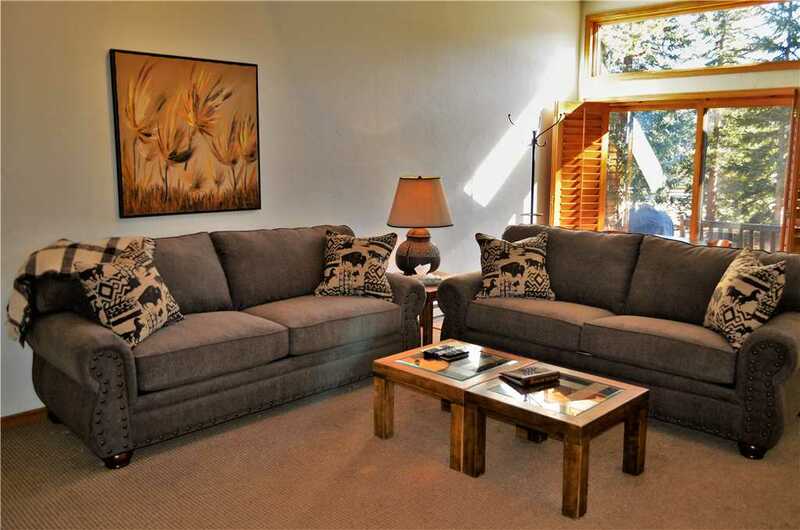 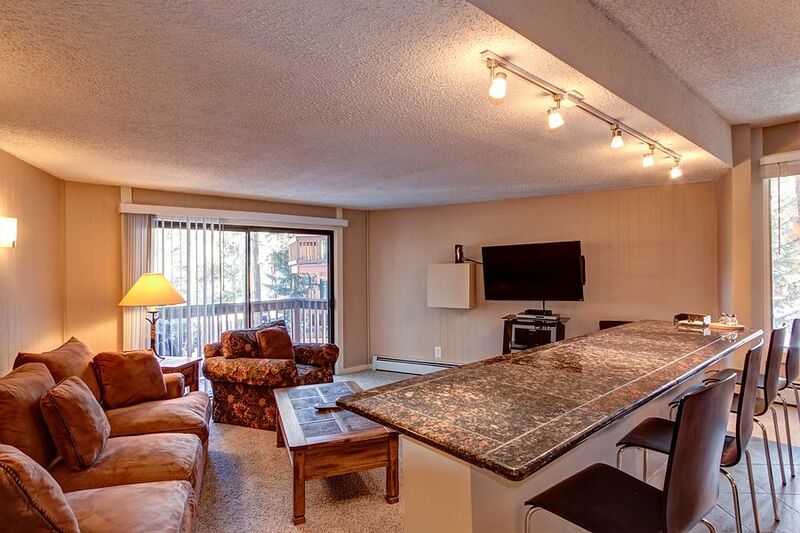 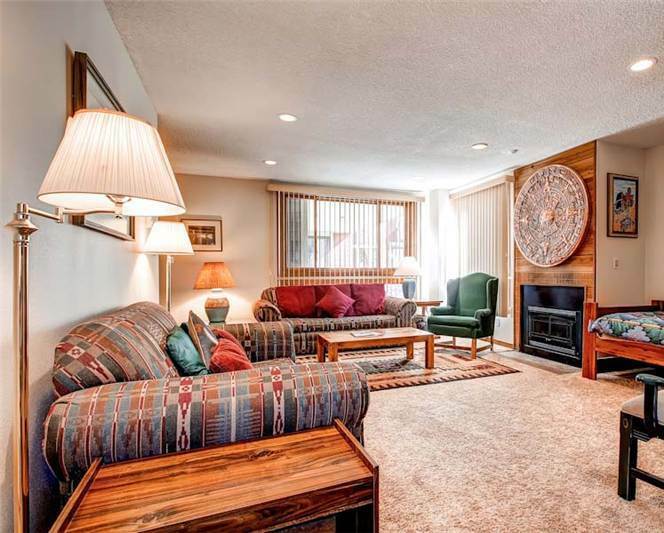 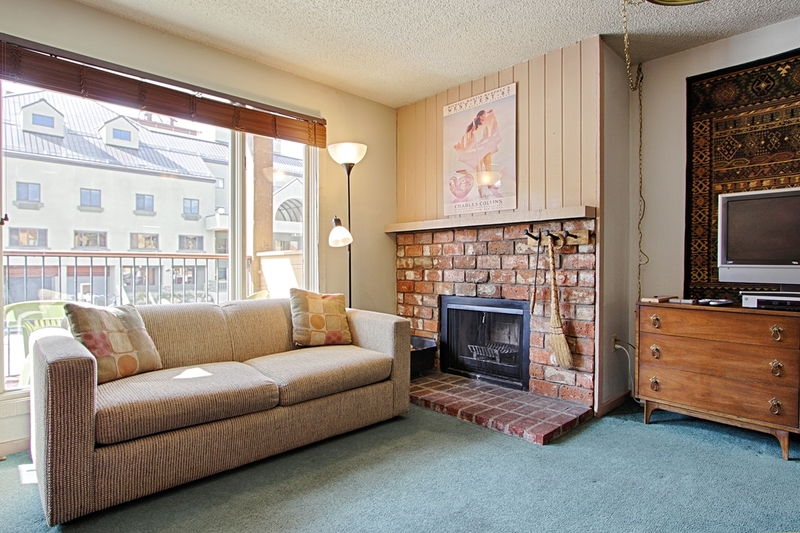 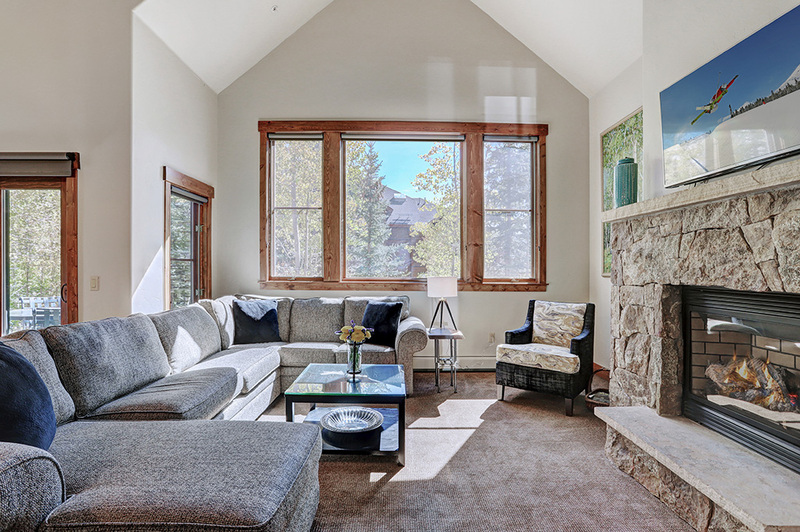 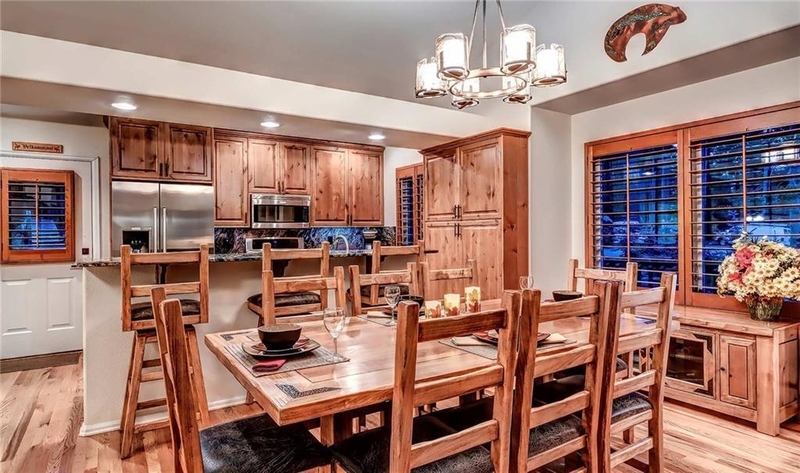 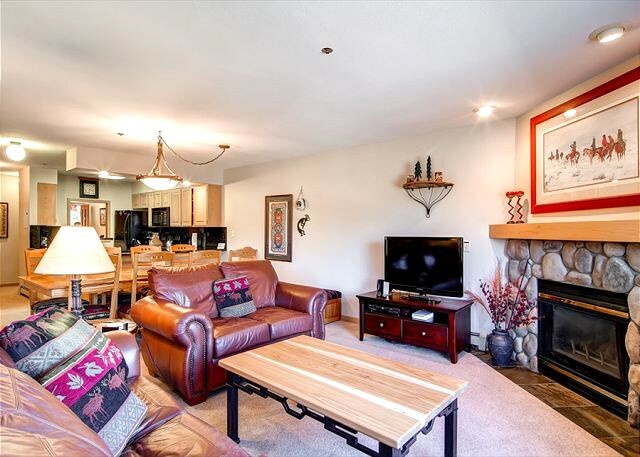 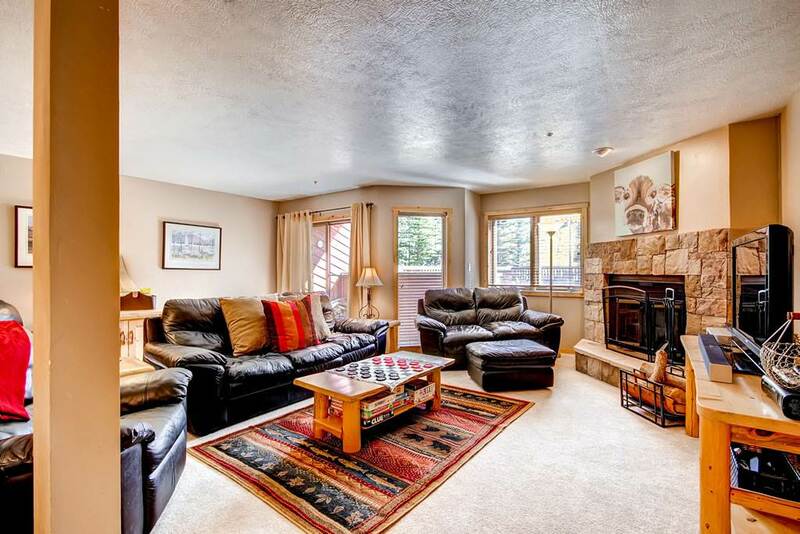 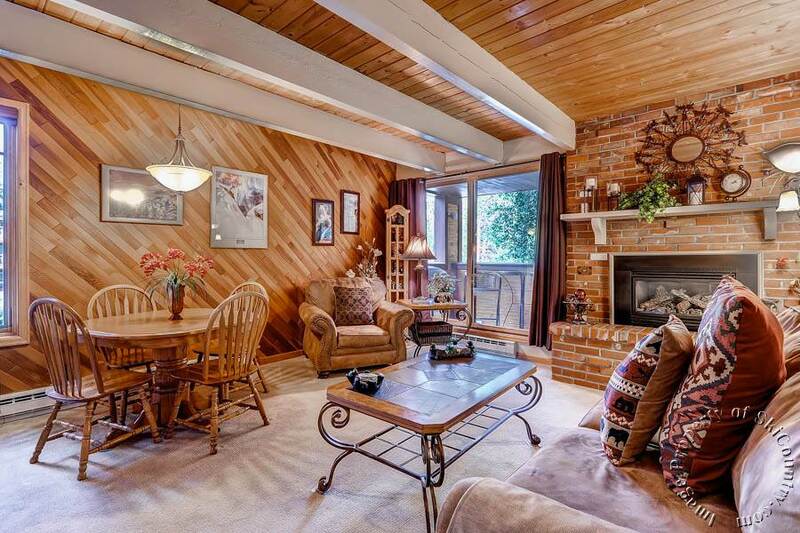 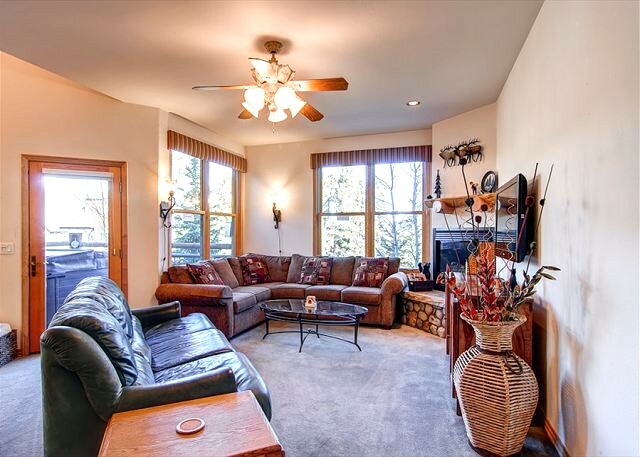 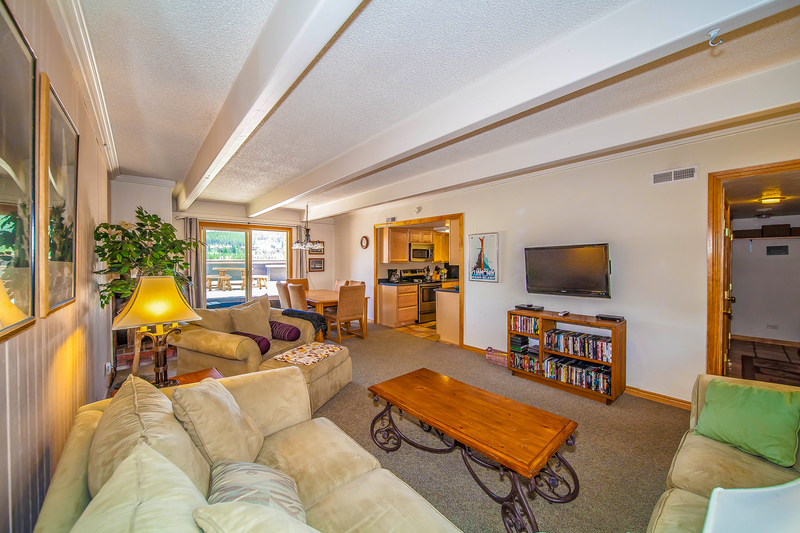 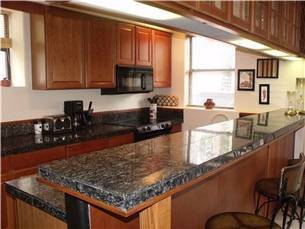 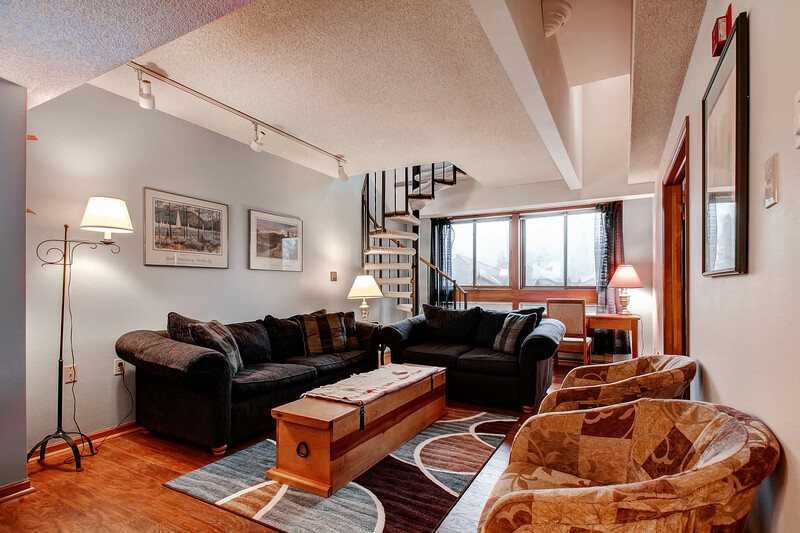 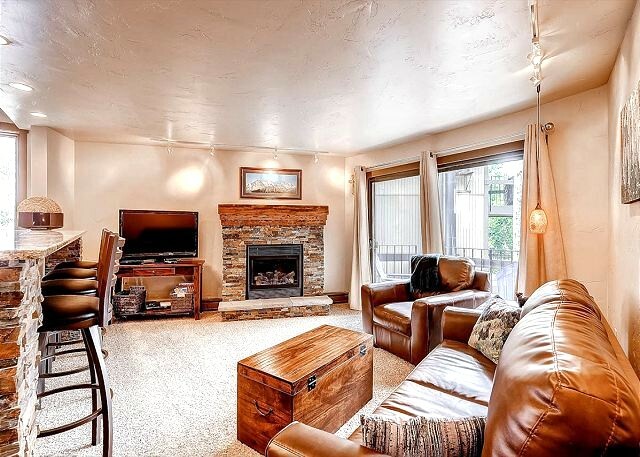 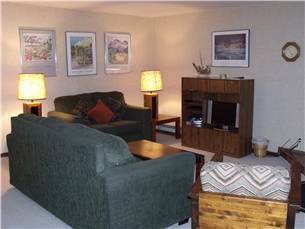 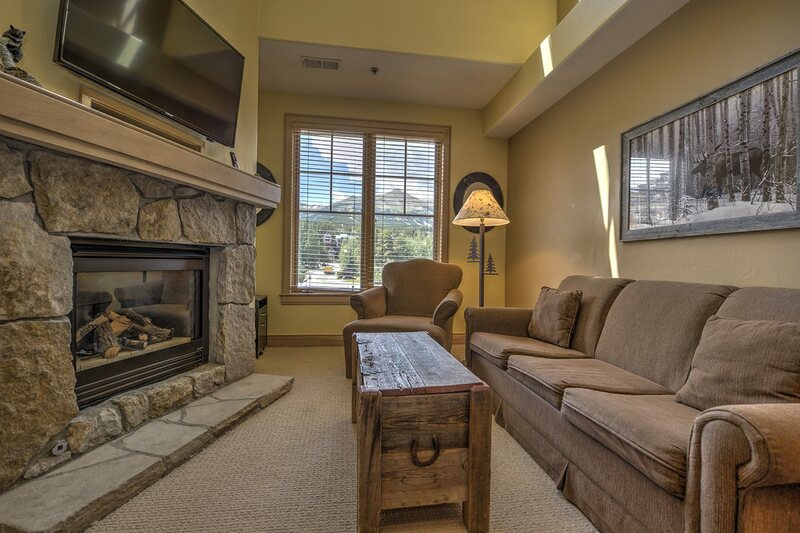 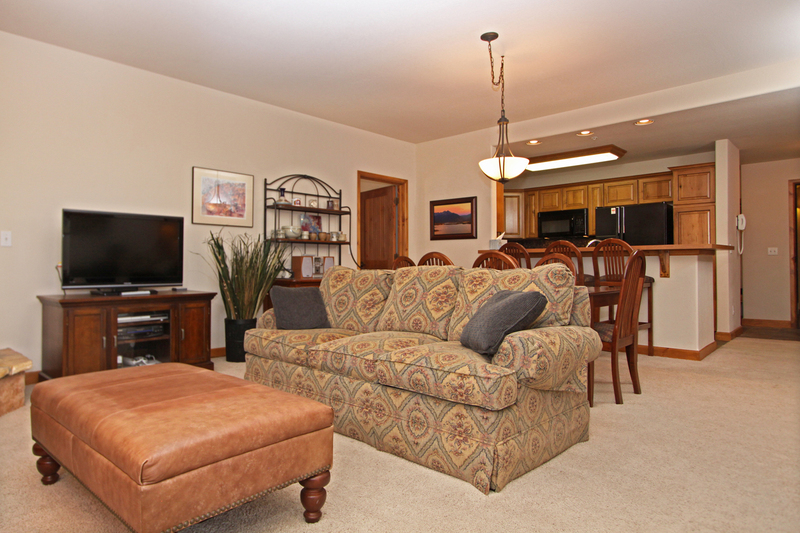 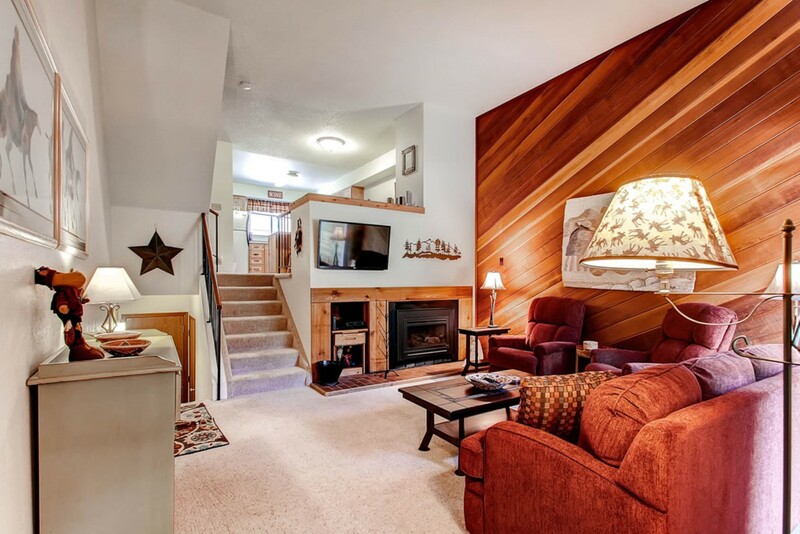 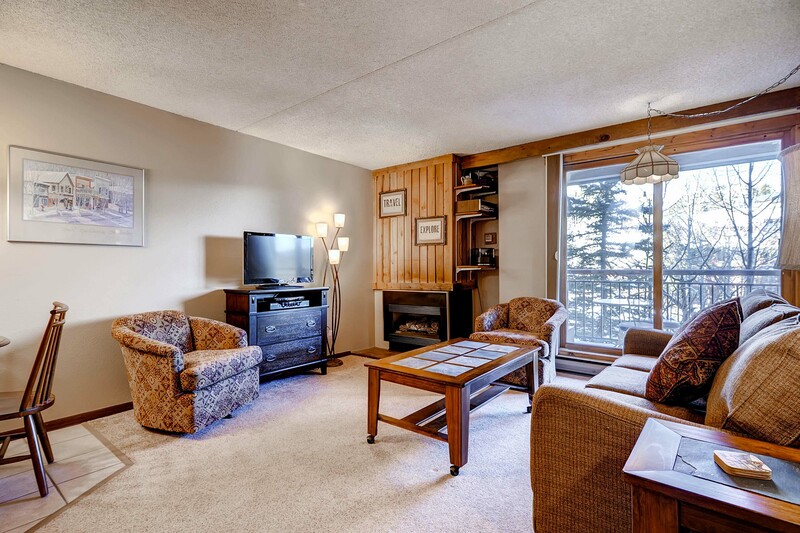 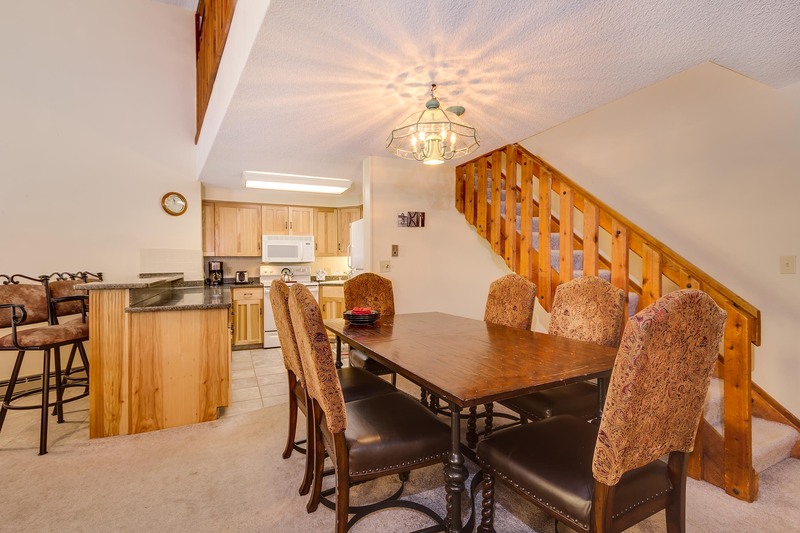 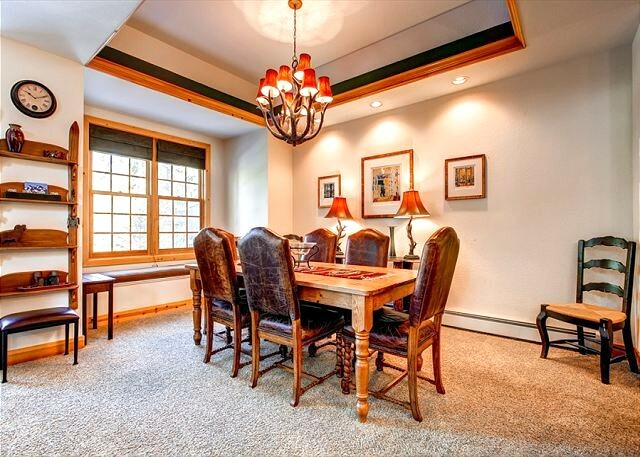 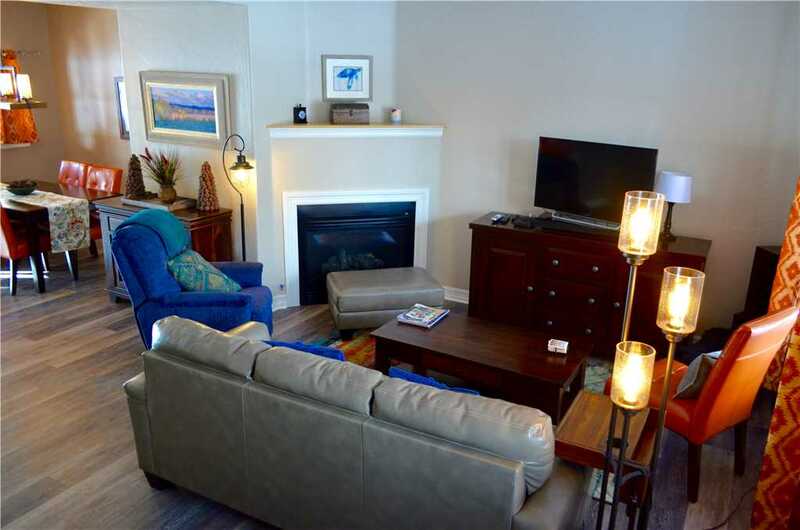 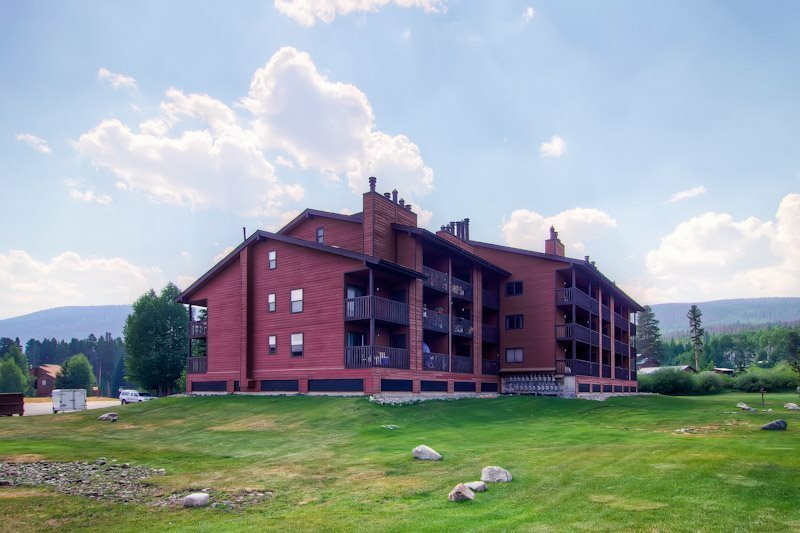 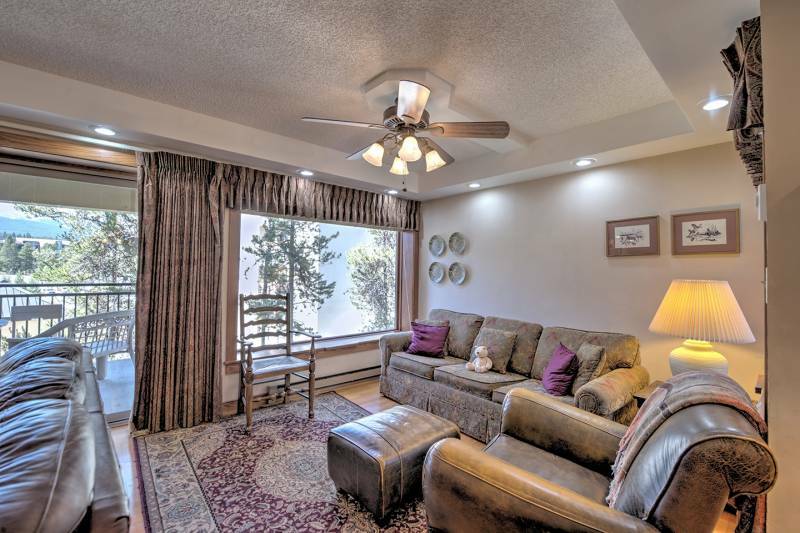 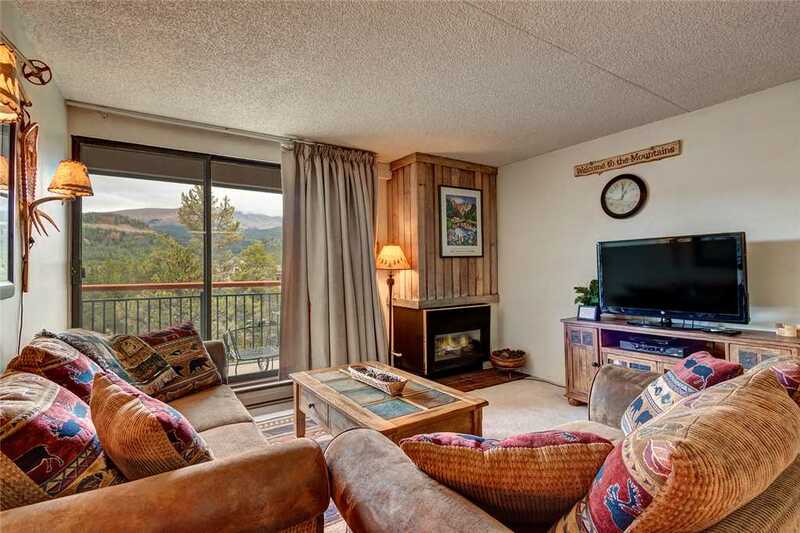 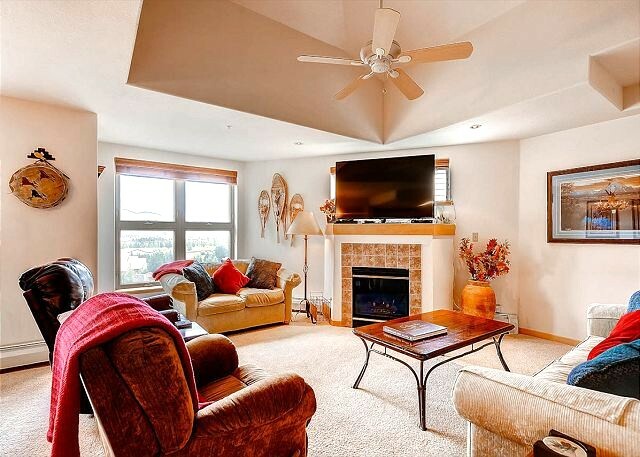 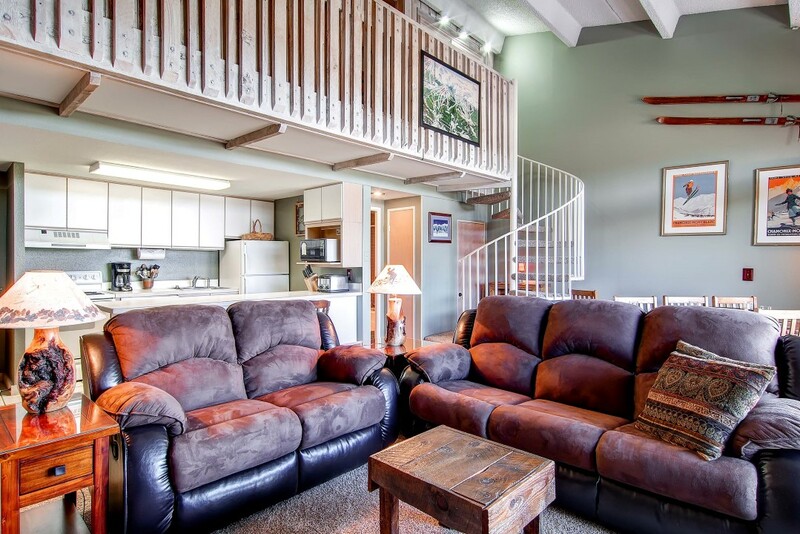 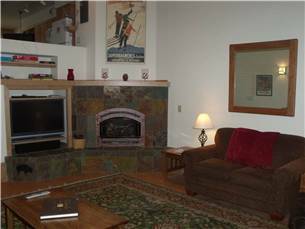 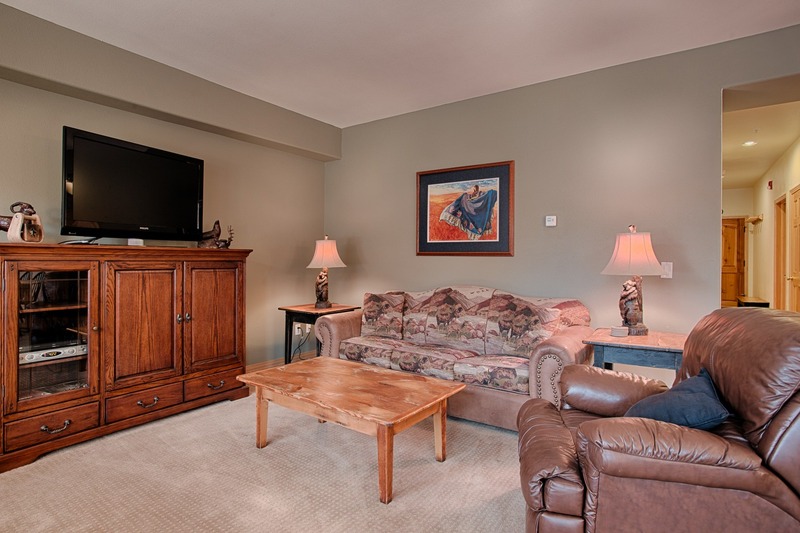 This quality multi-level town home is centrally located just three blocks from historic downtown and the base of Peak 9. 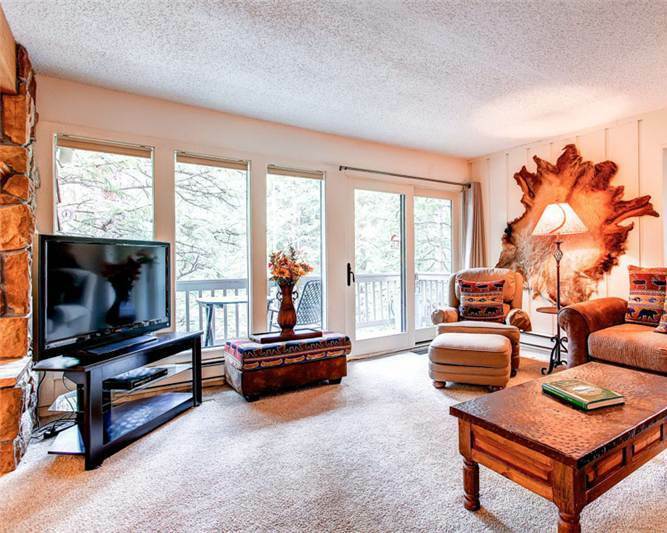 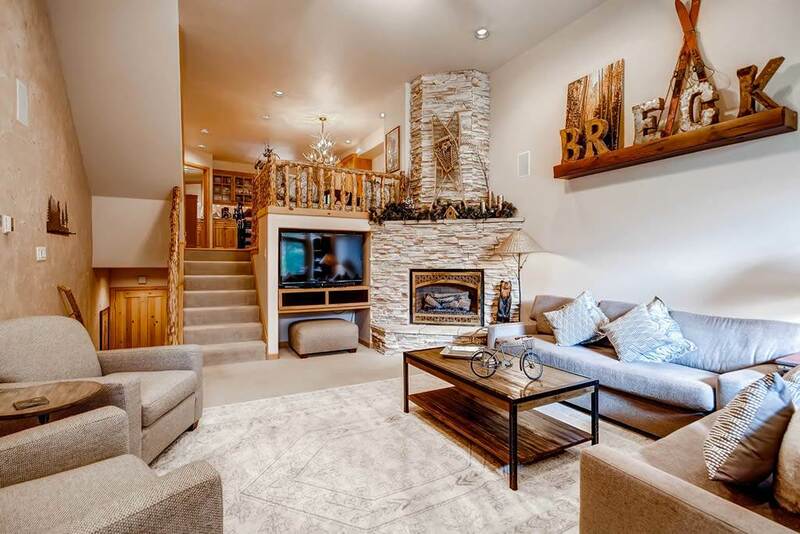 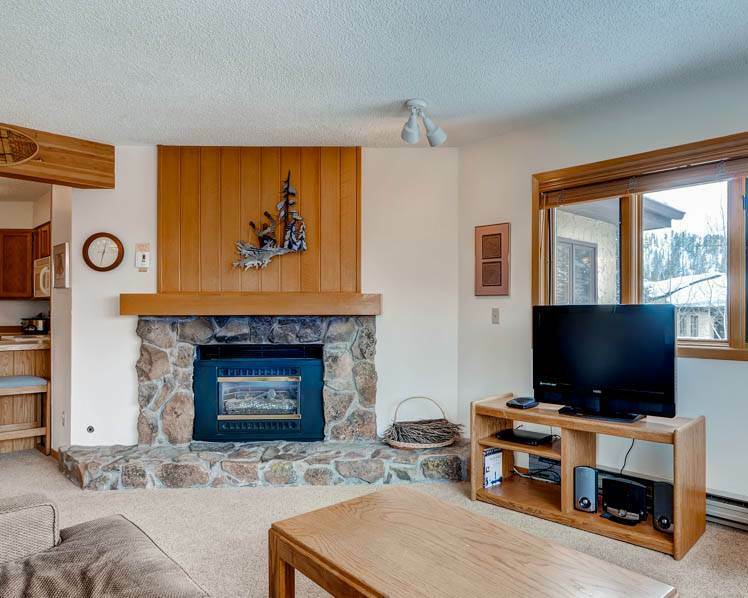 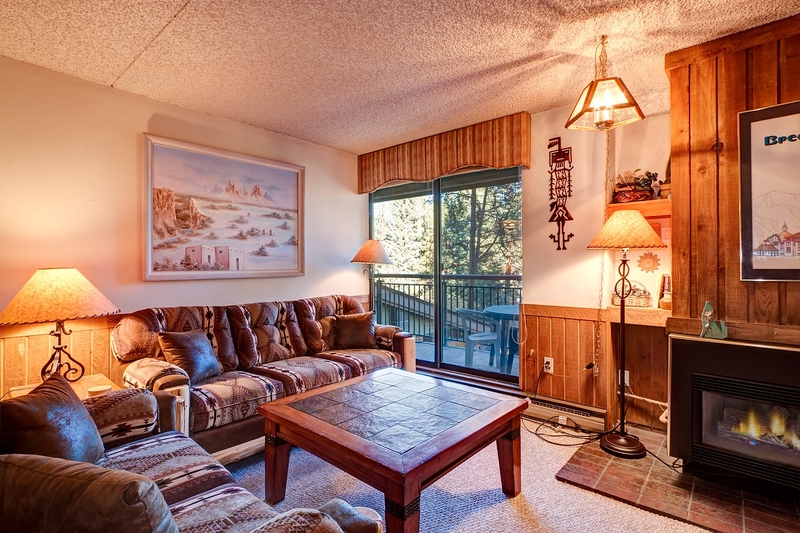 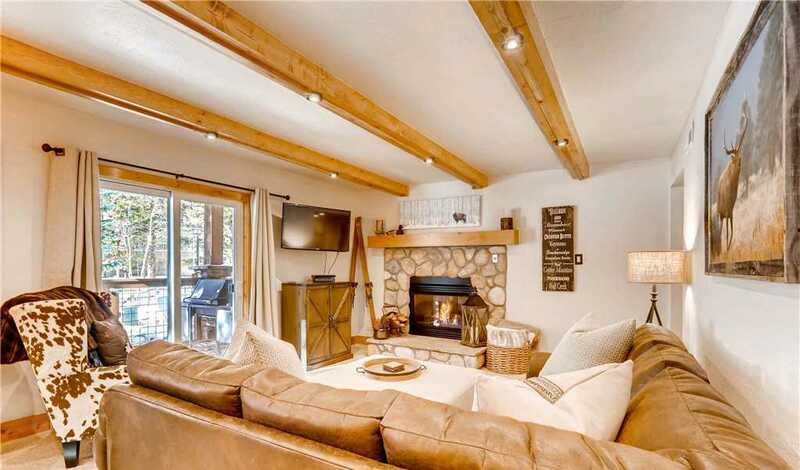 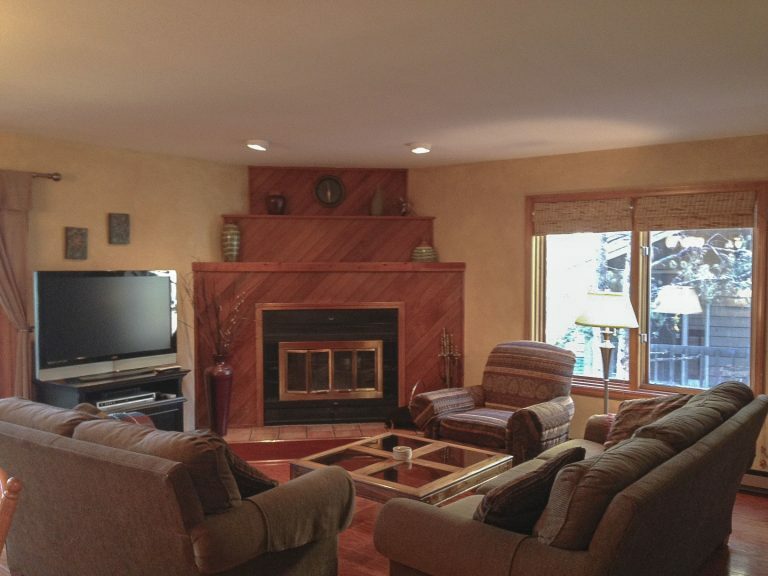 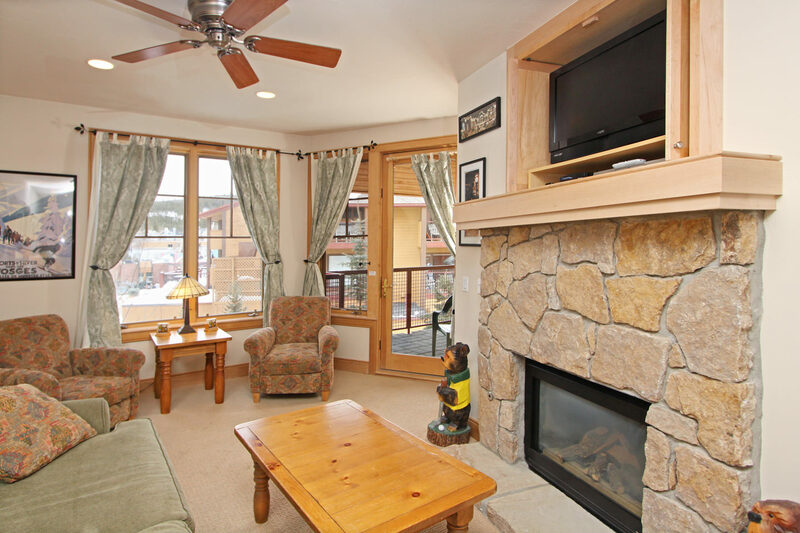 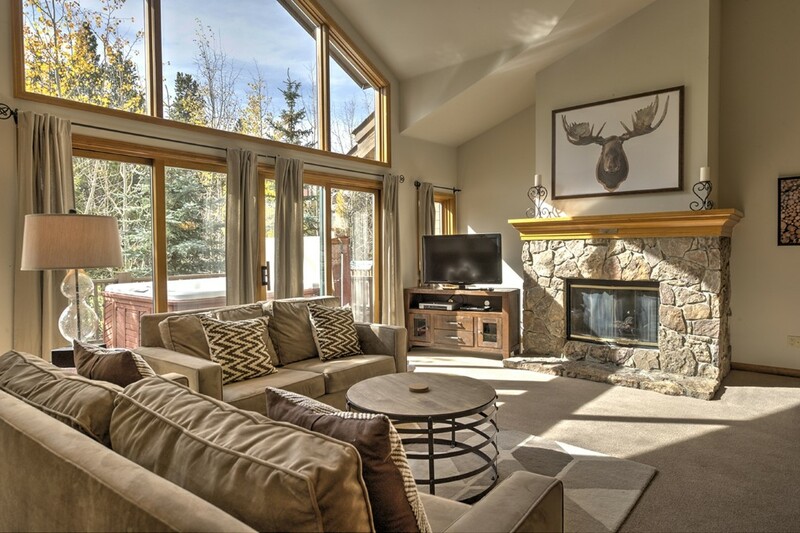 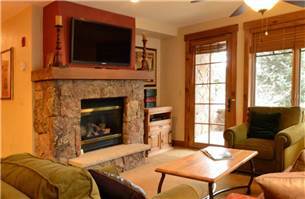 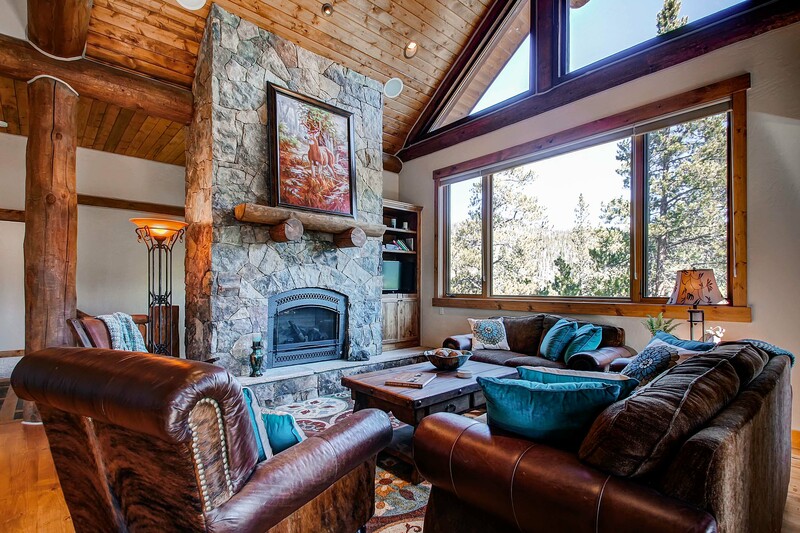 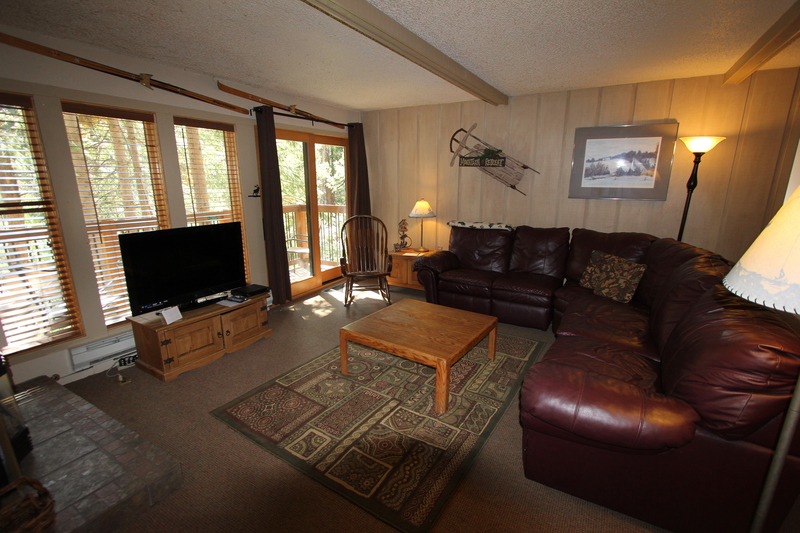 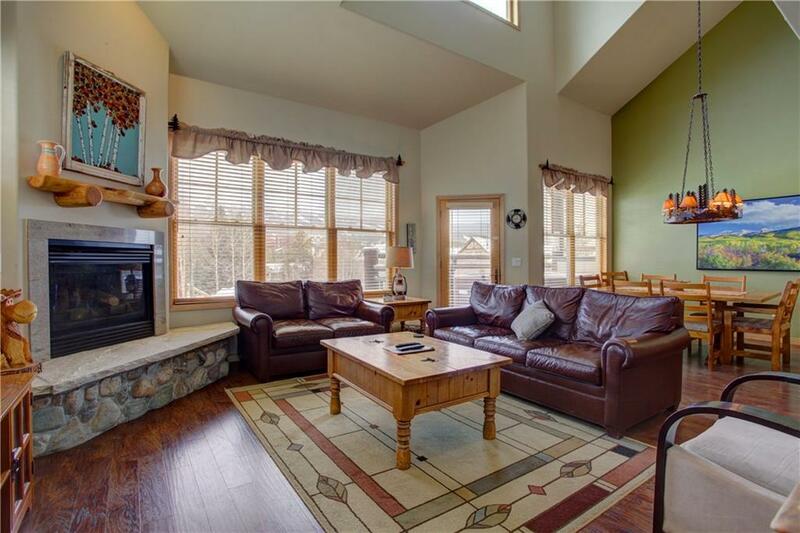 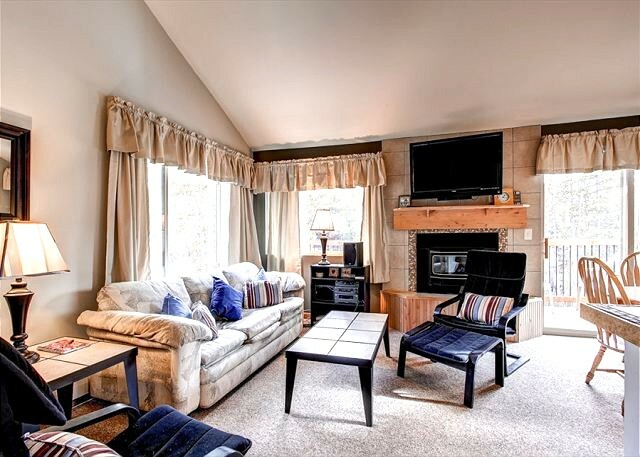 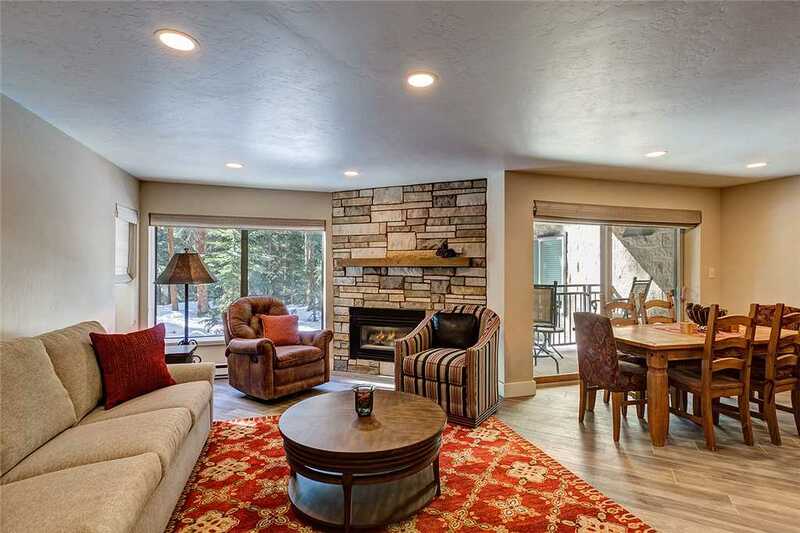 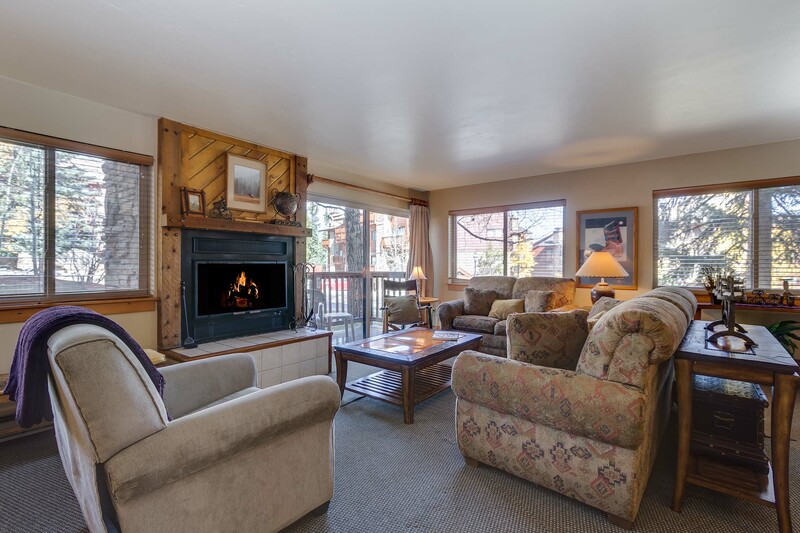 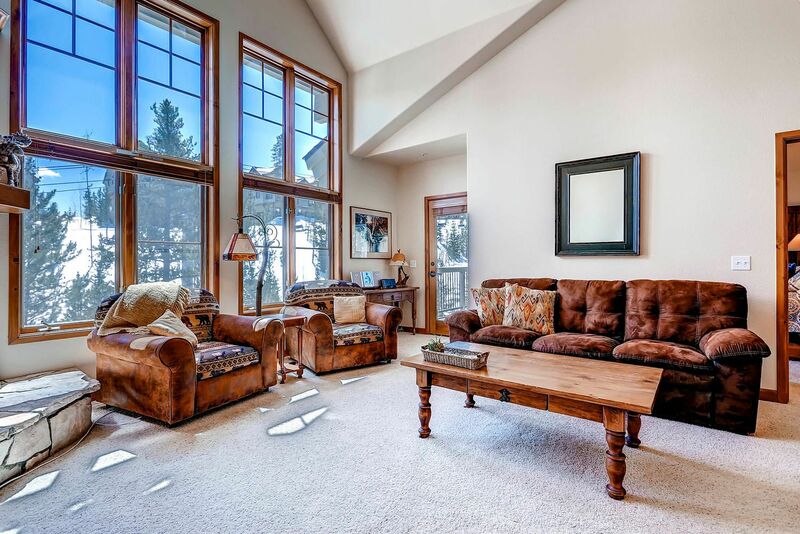 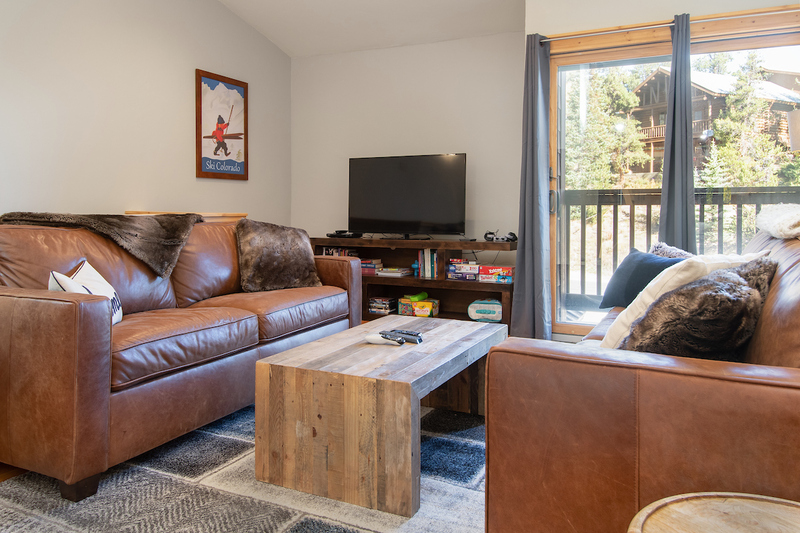 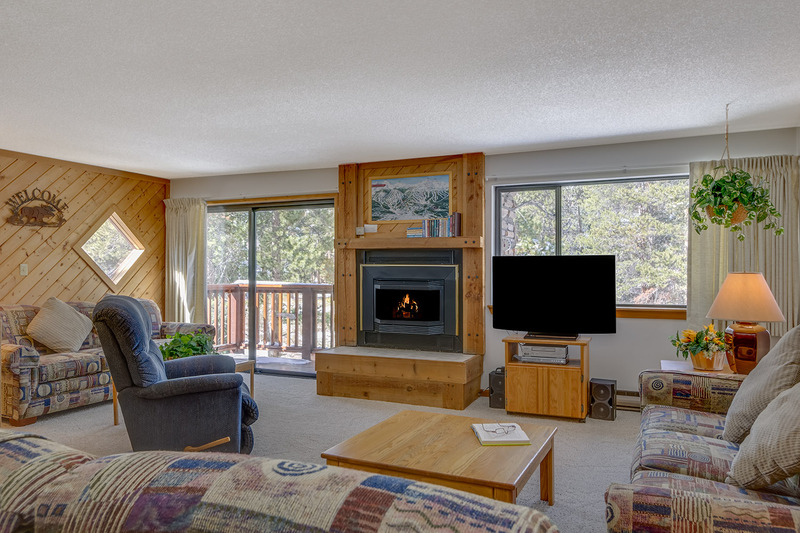 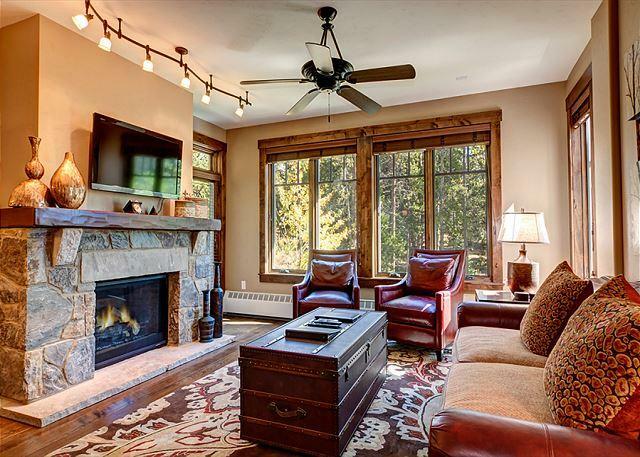 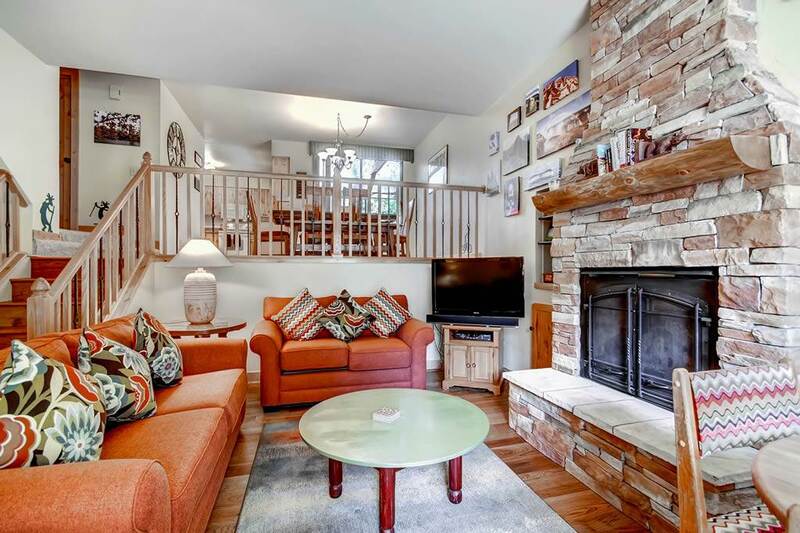 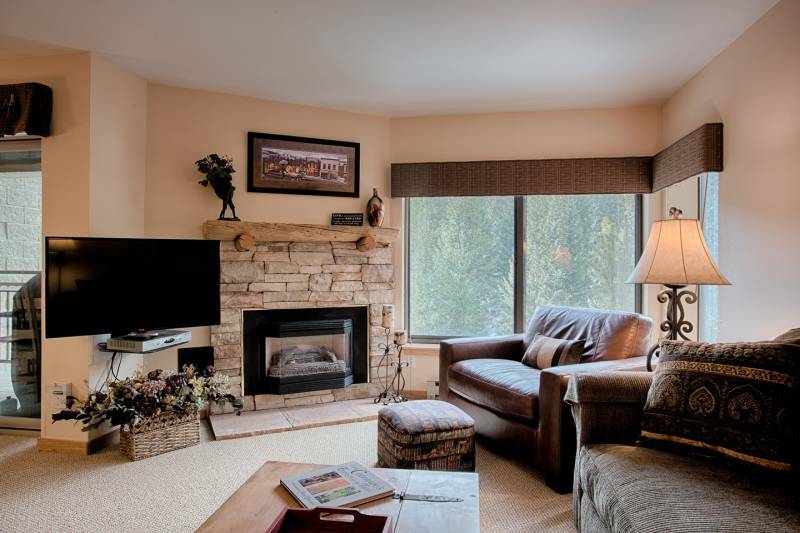 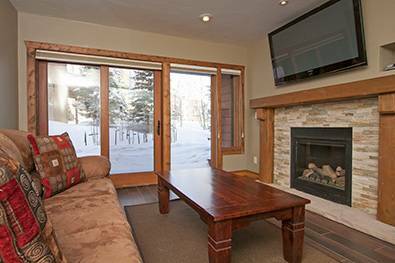 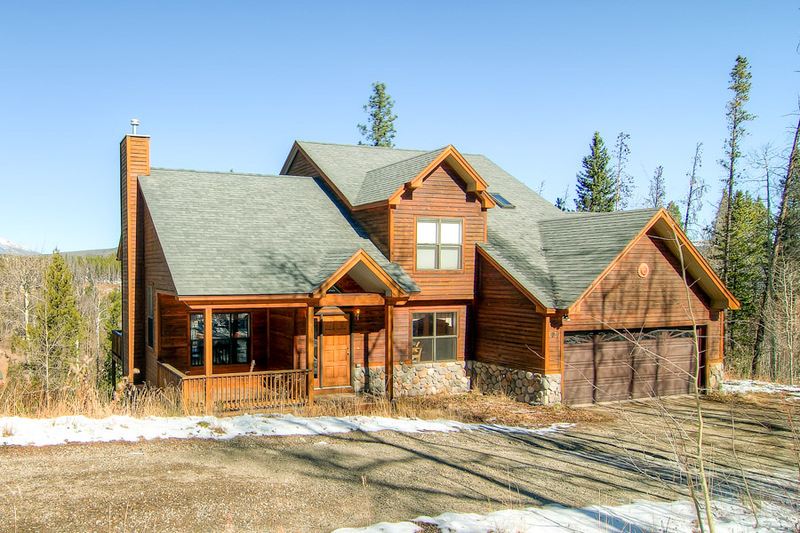 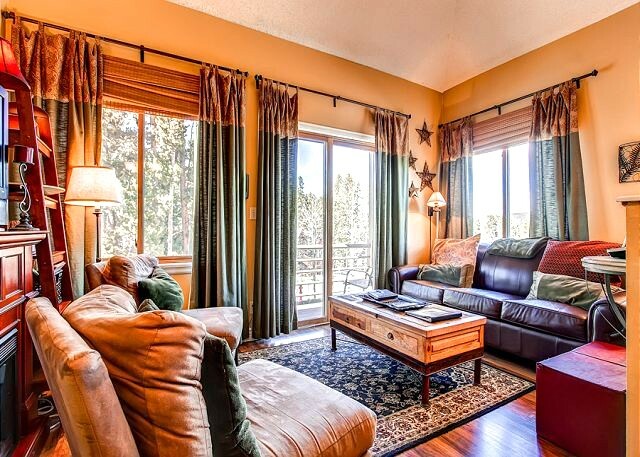 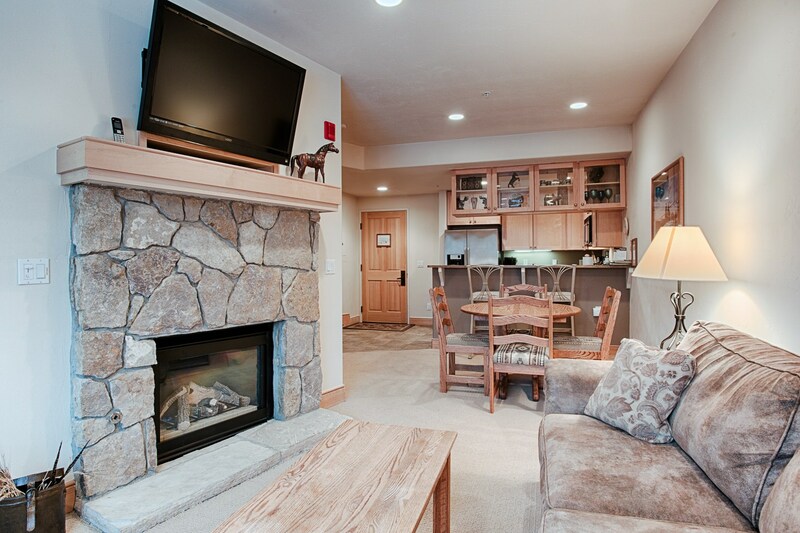 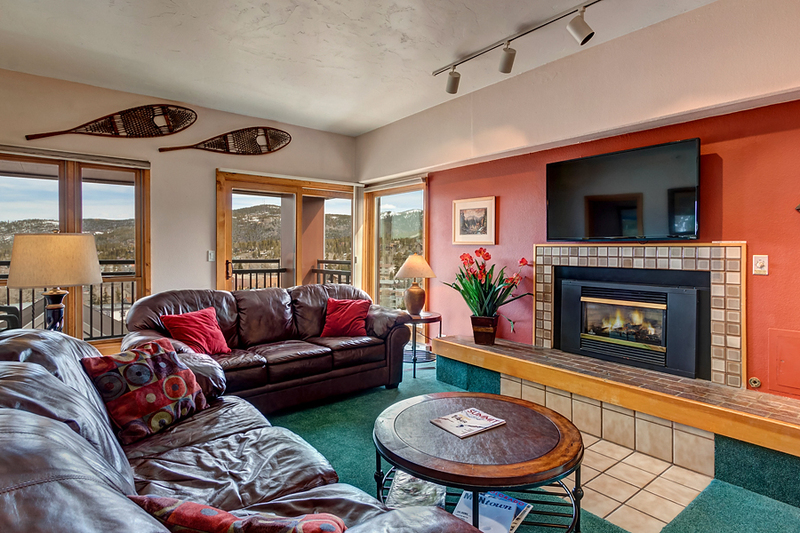 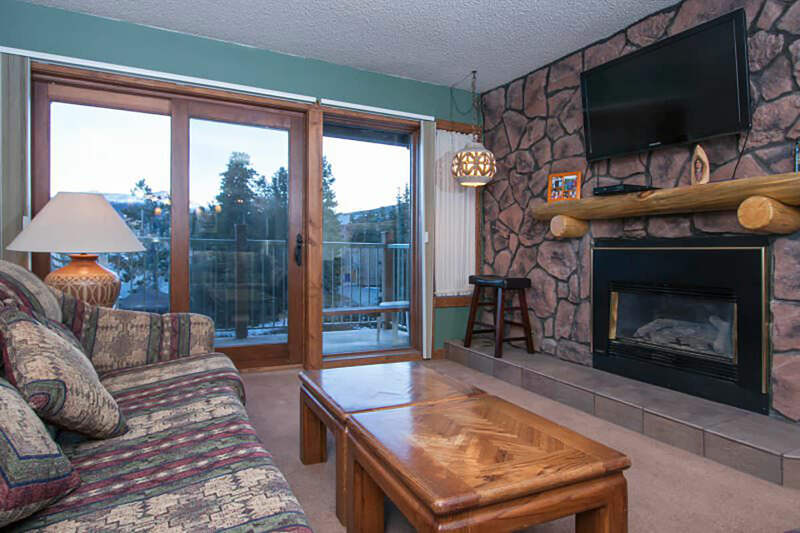 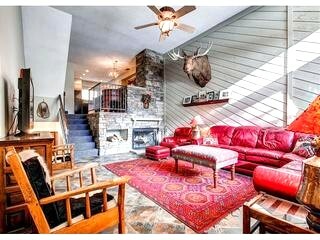 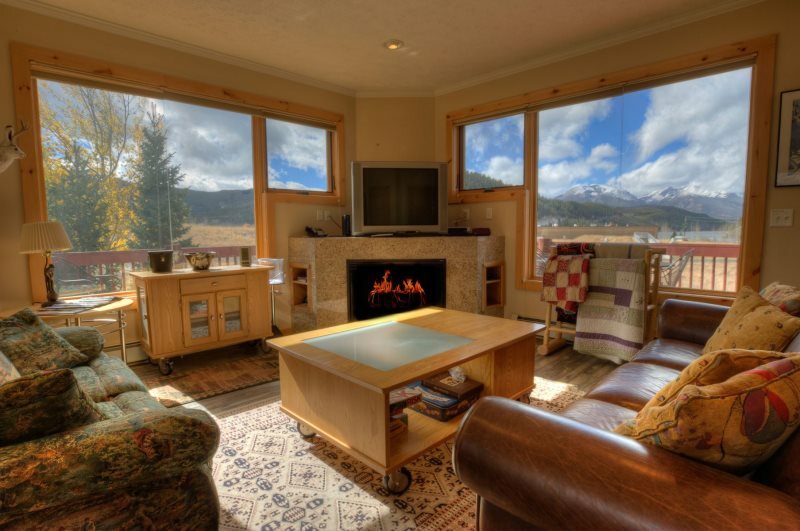 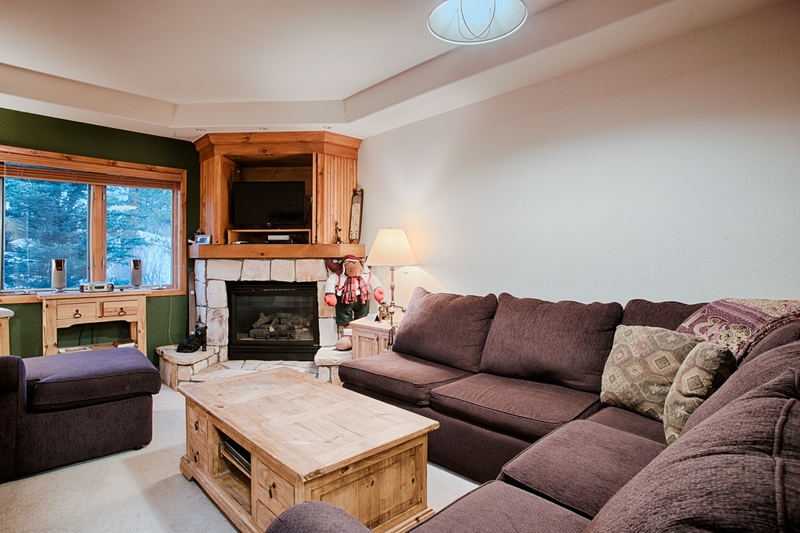 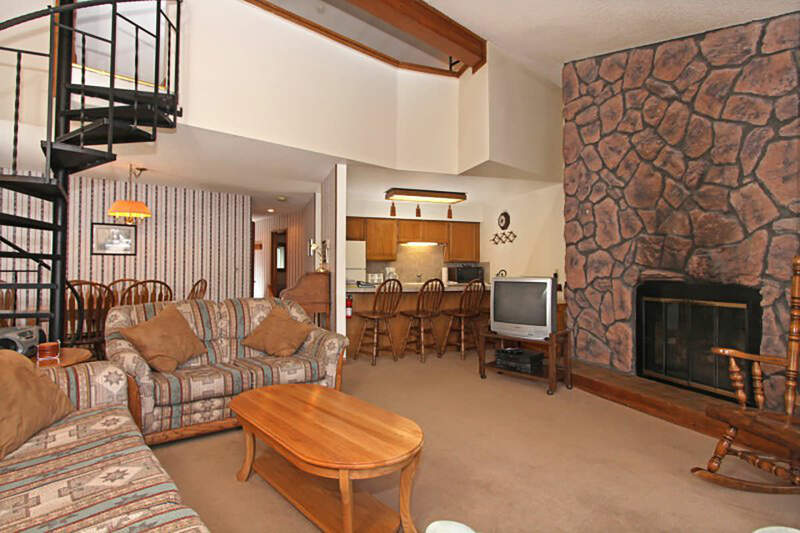 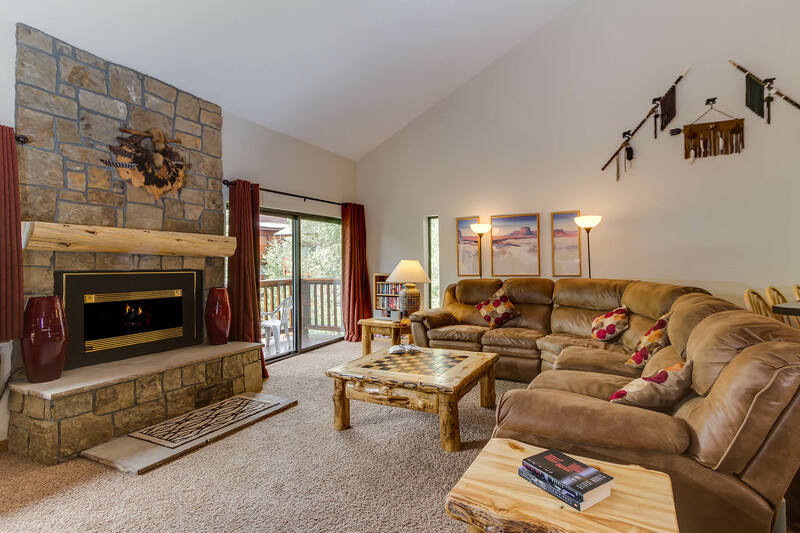 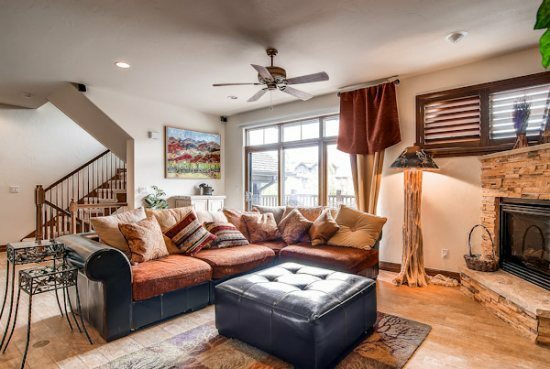 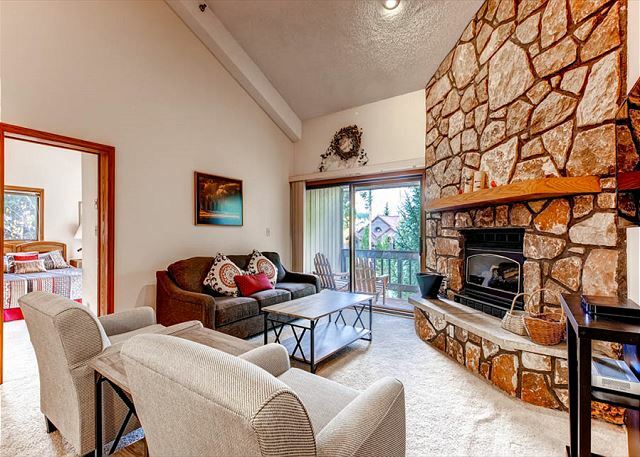 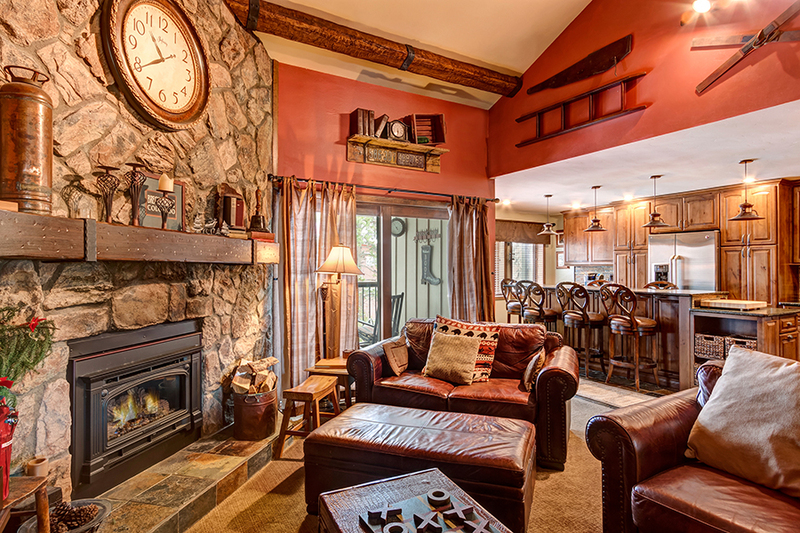 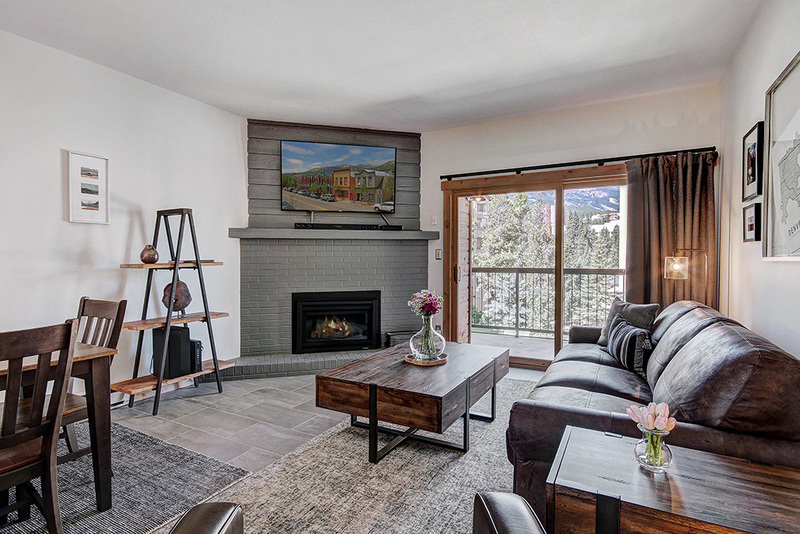 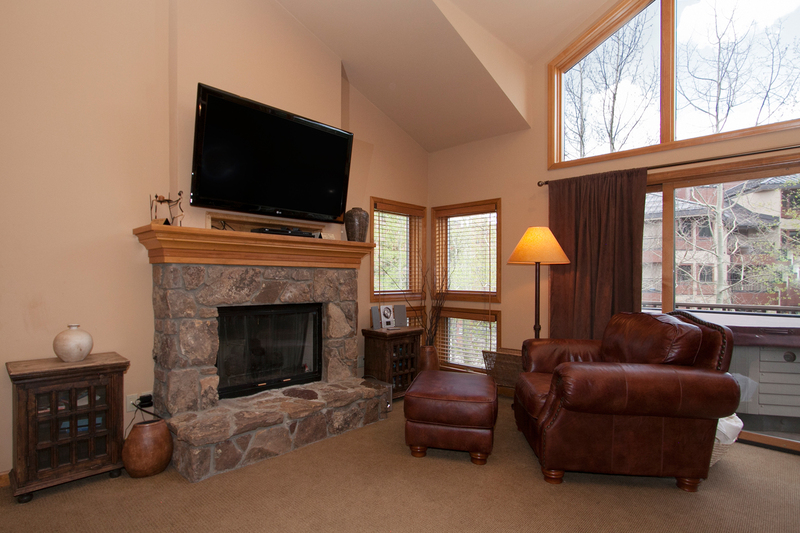 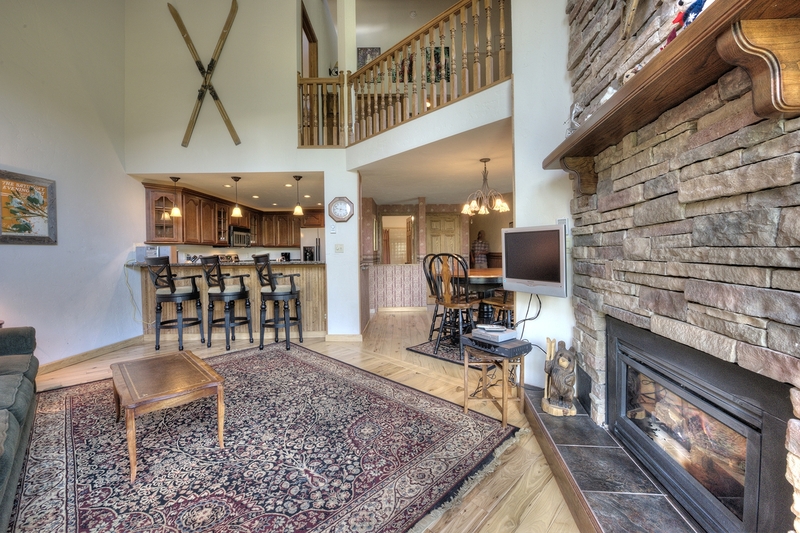 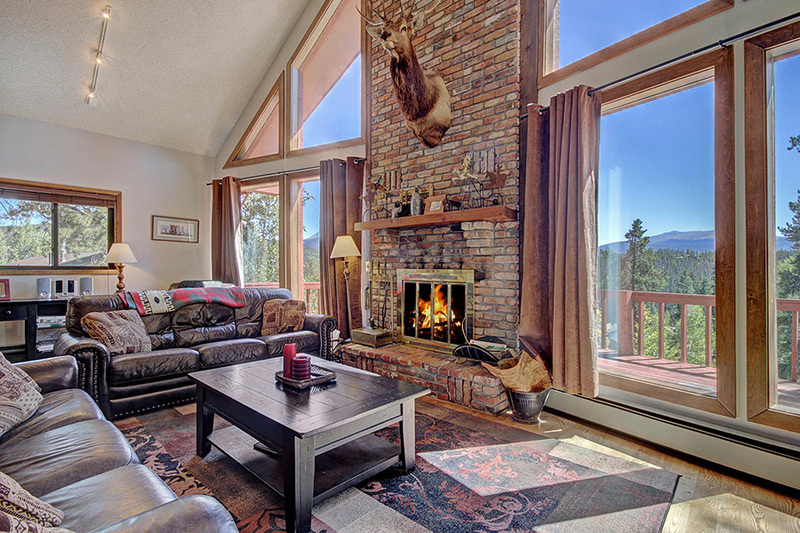 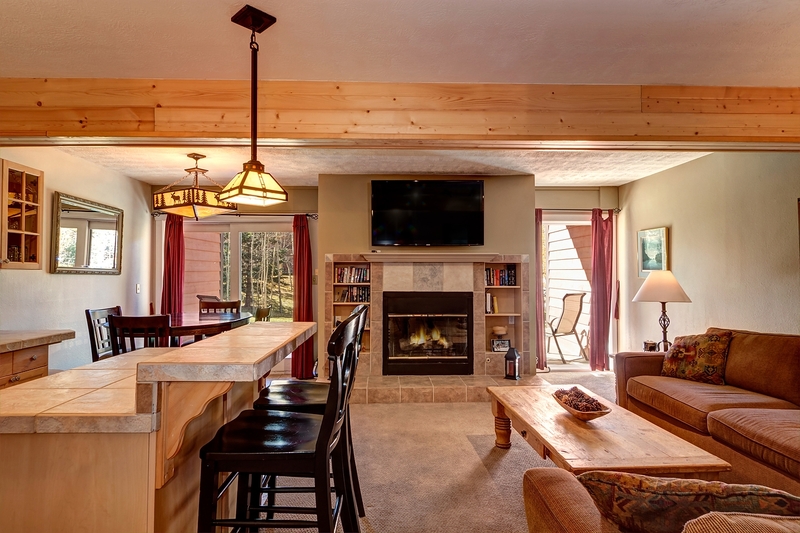 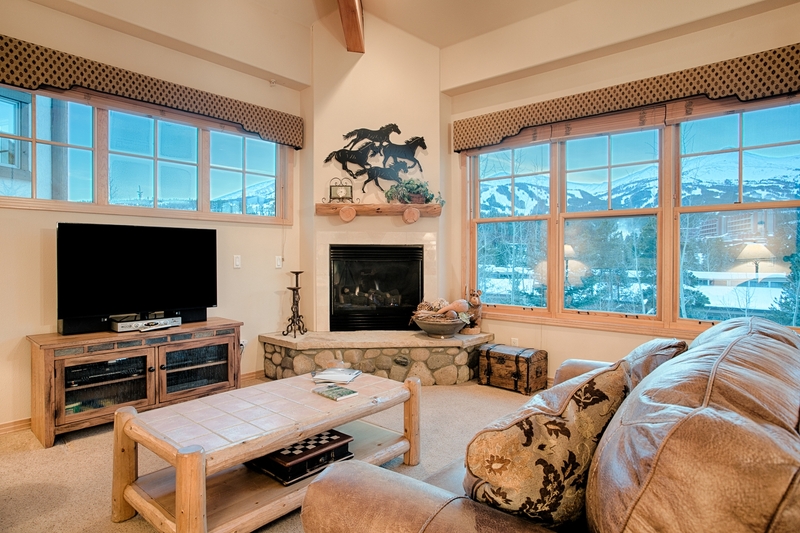 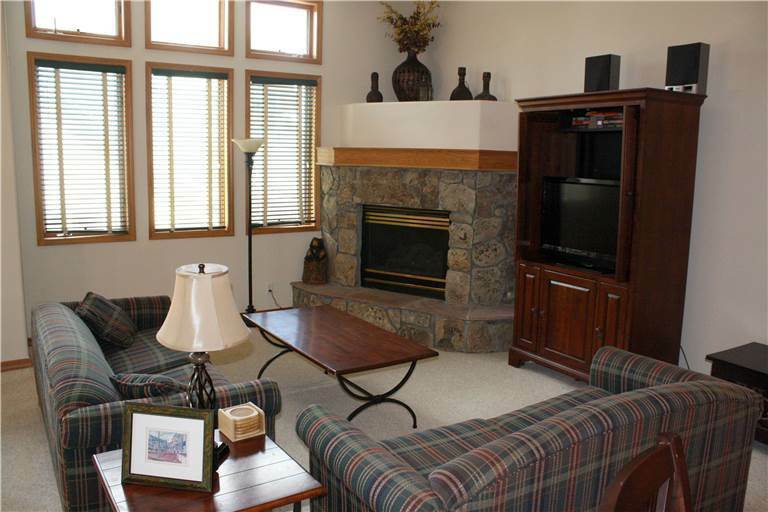 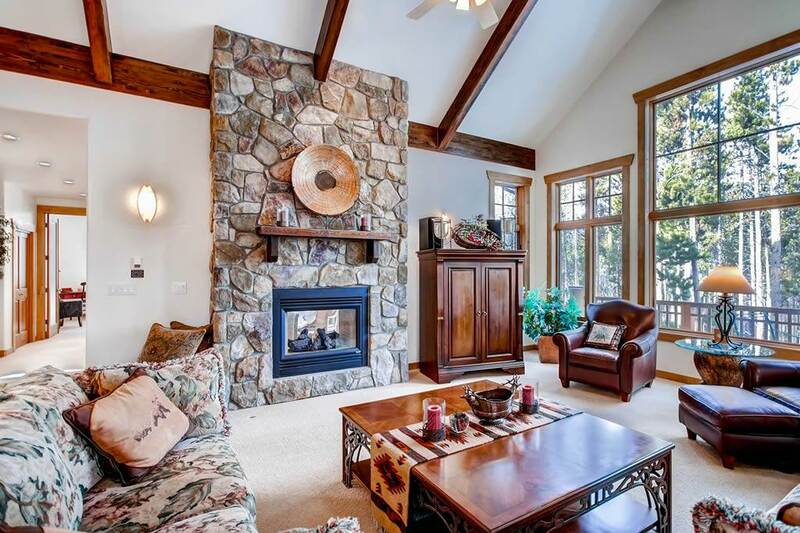 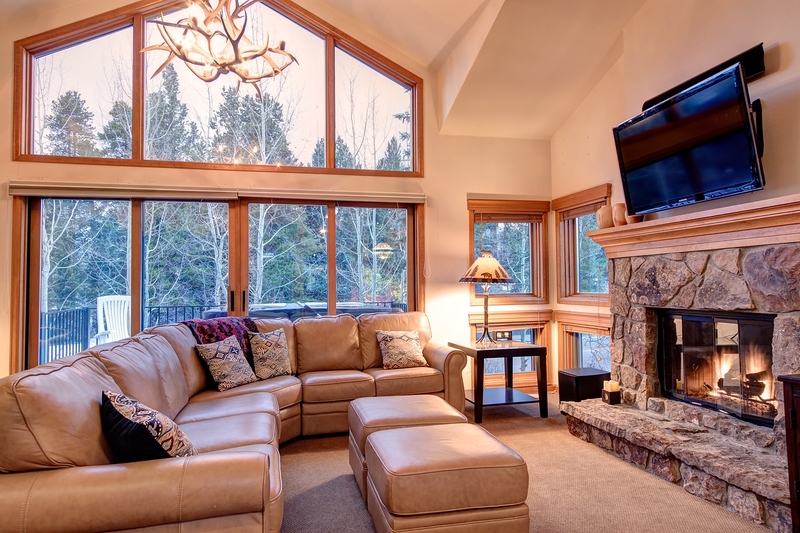 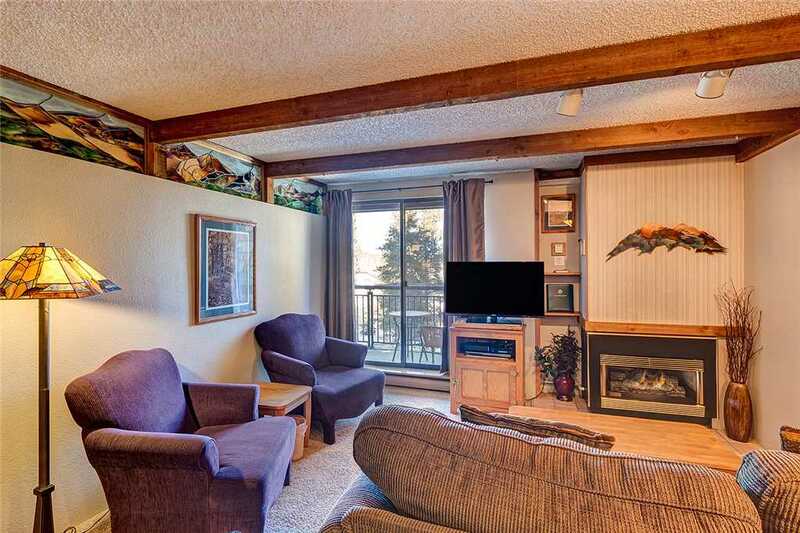 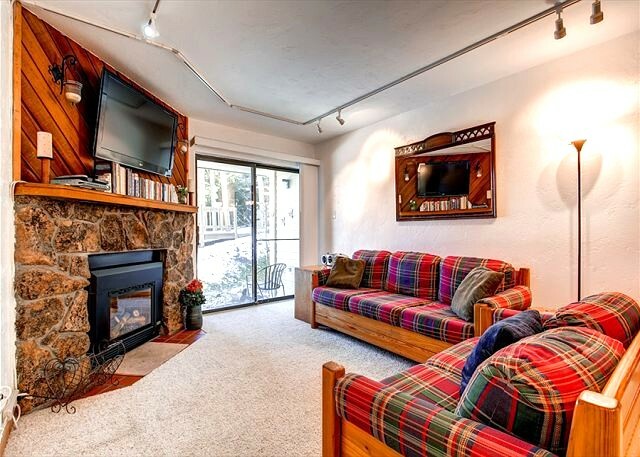 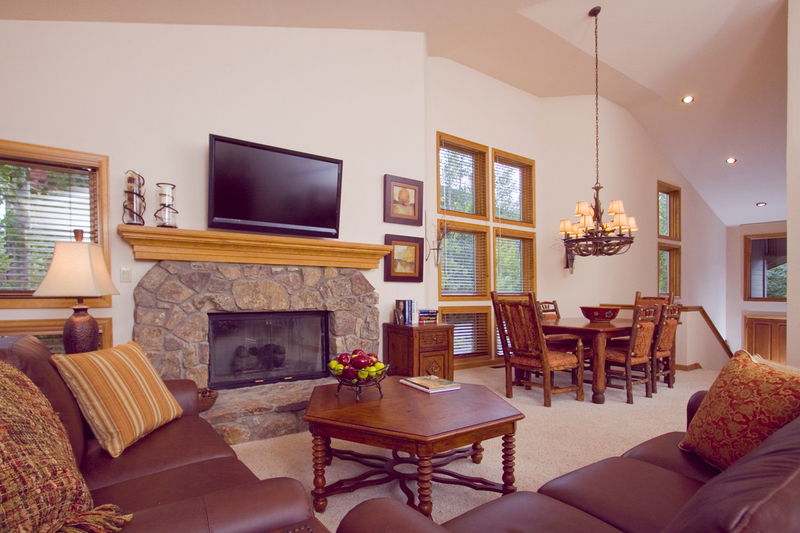 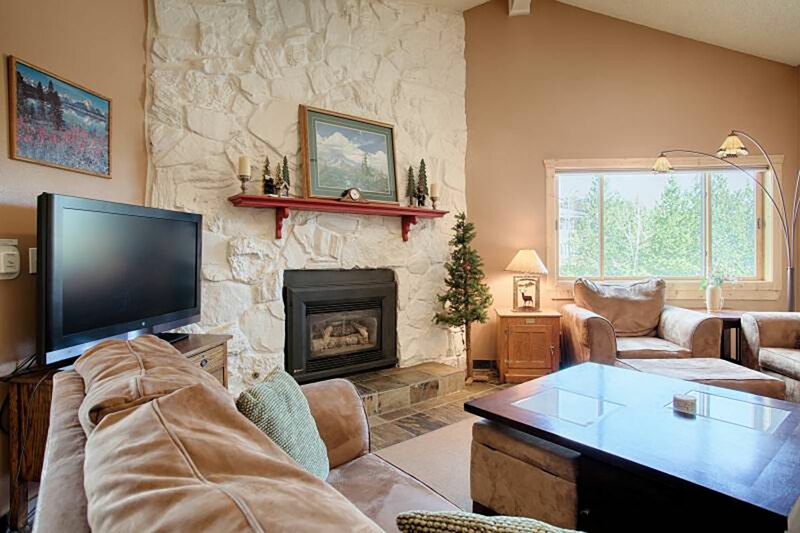 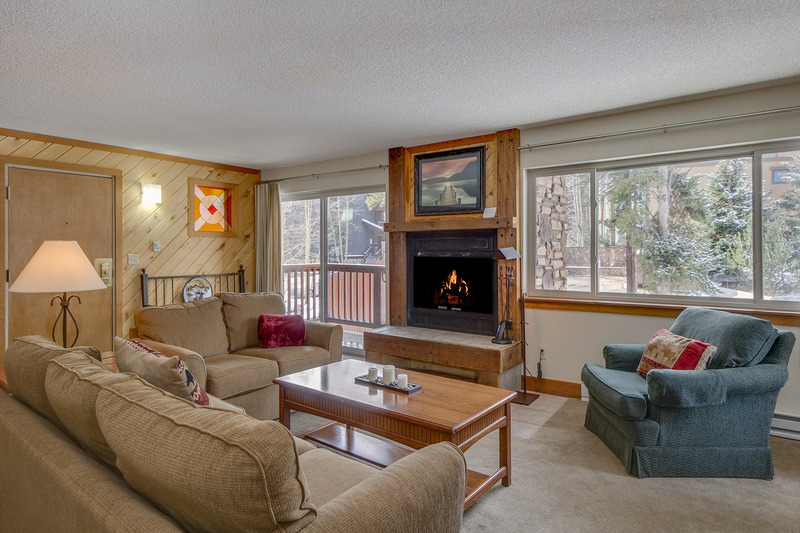 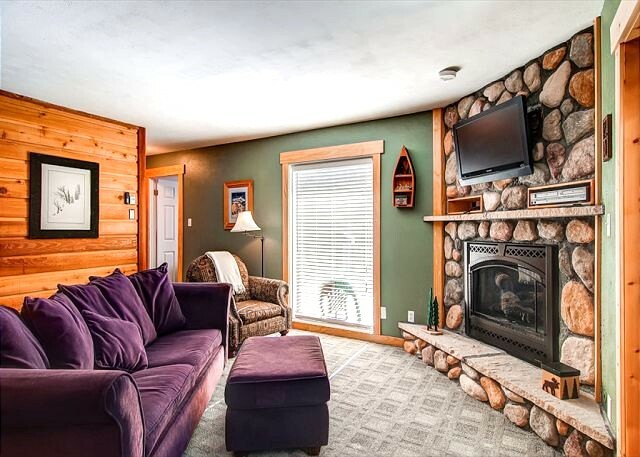 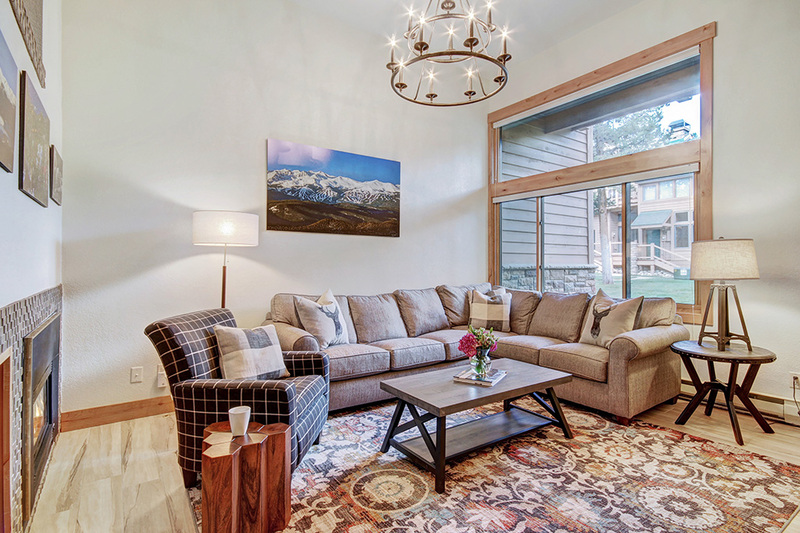 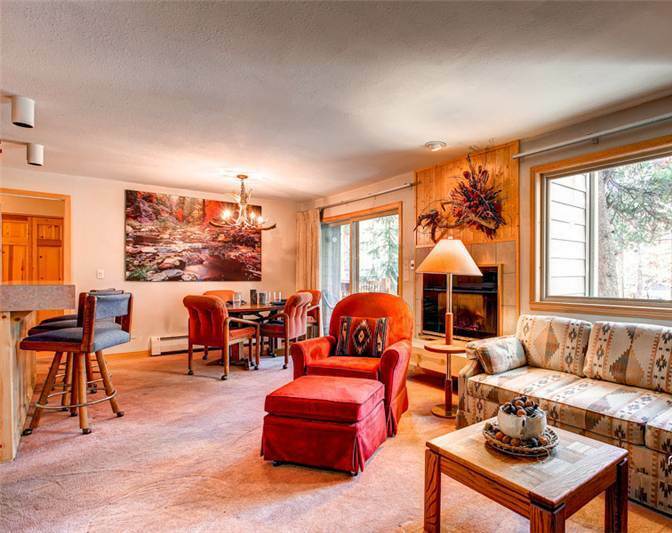 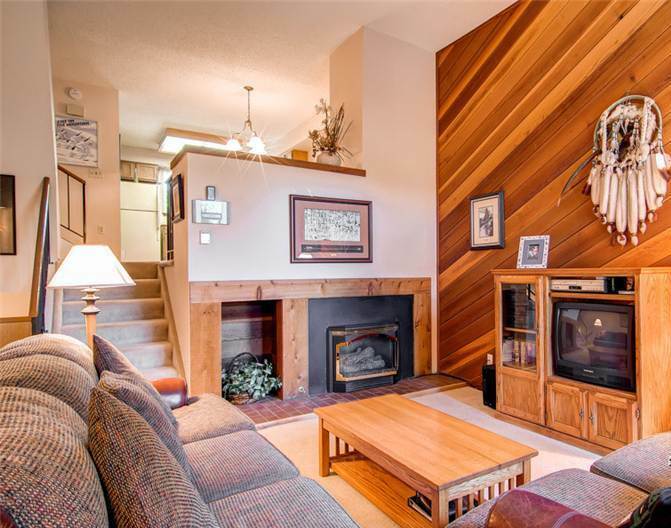 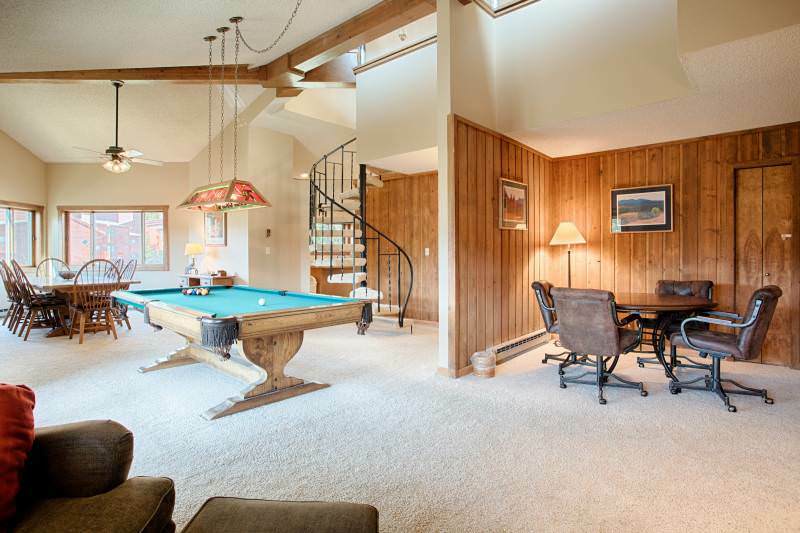 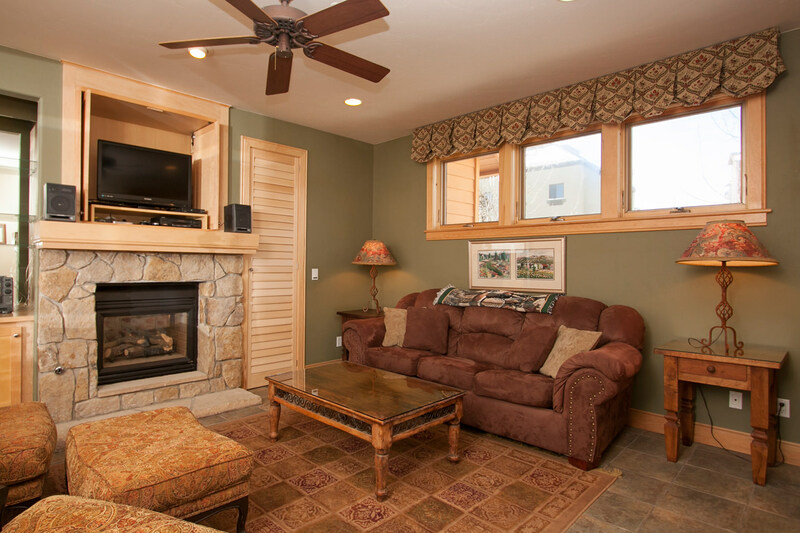 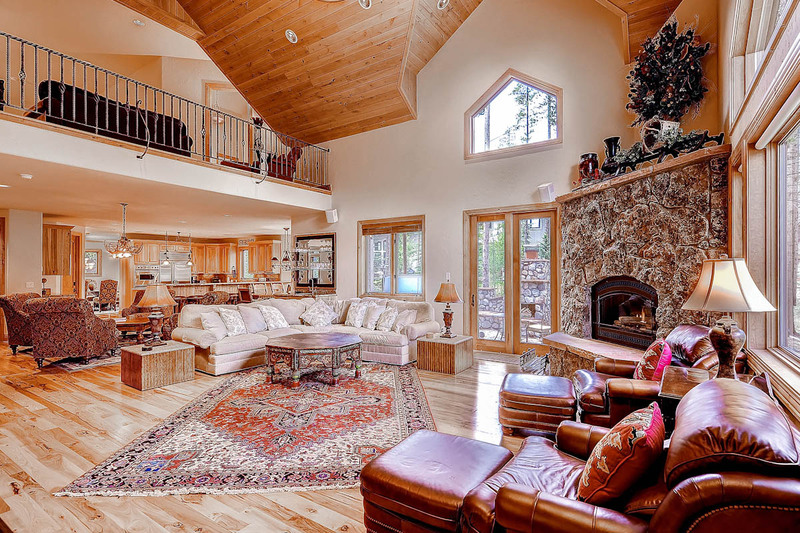 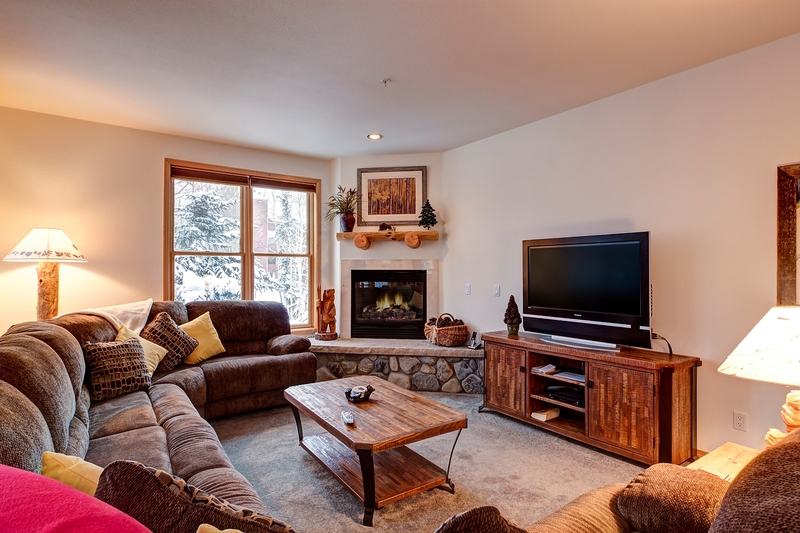 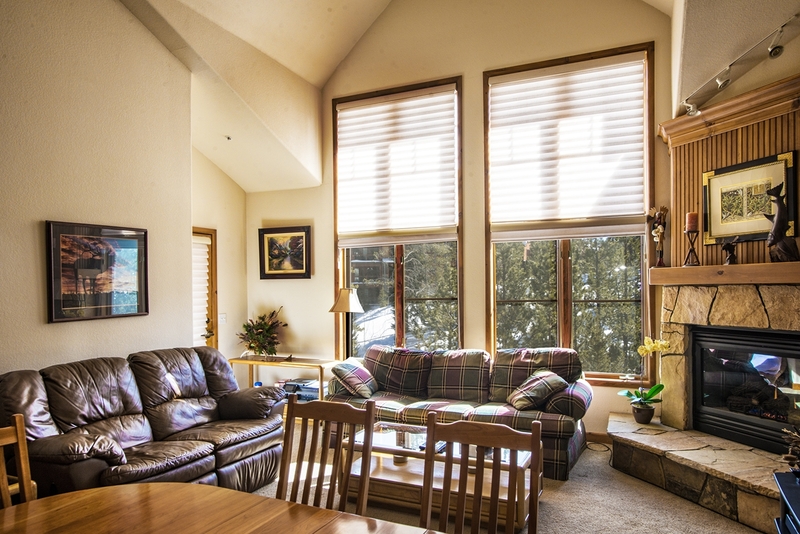 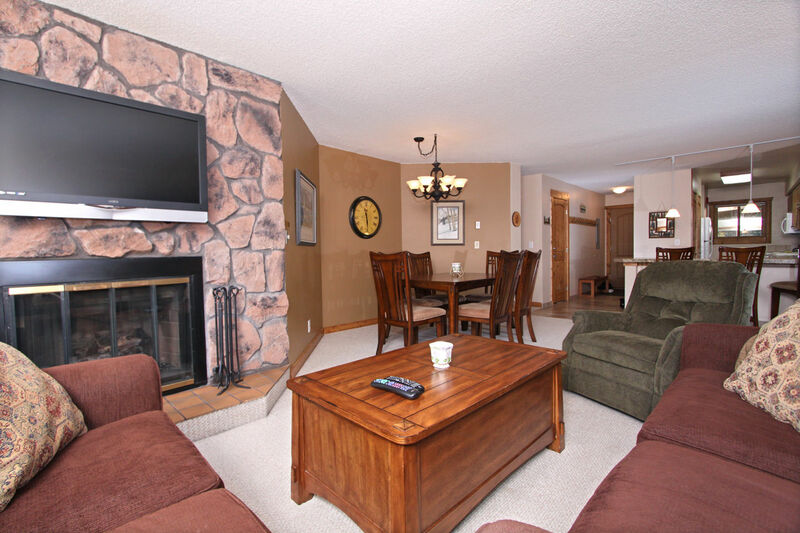 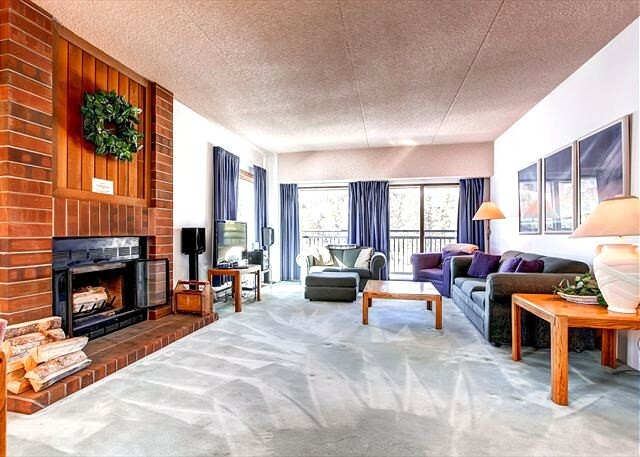 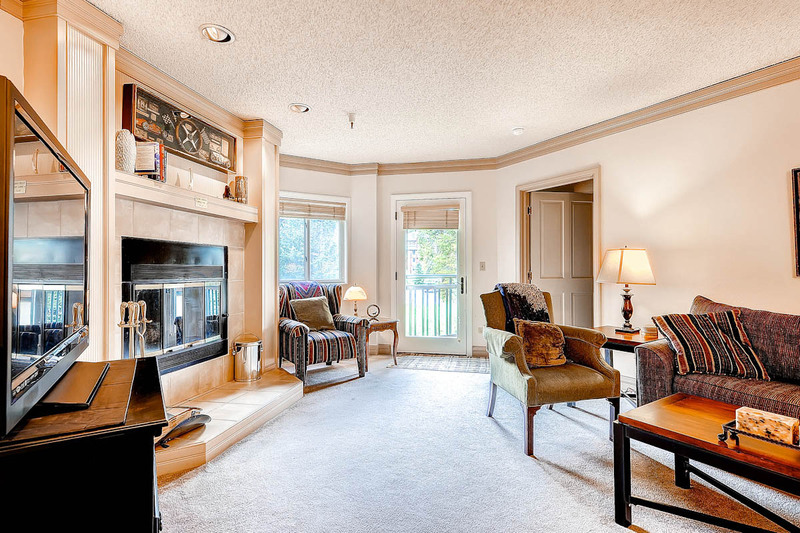 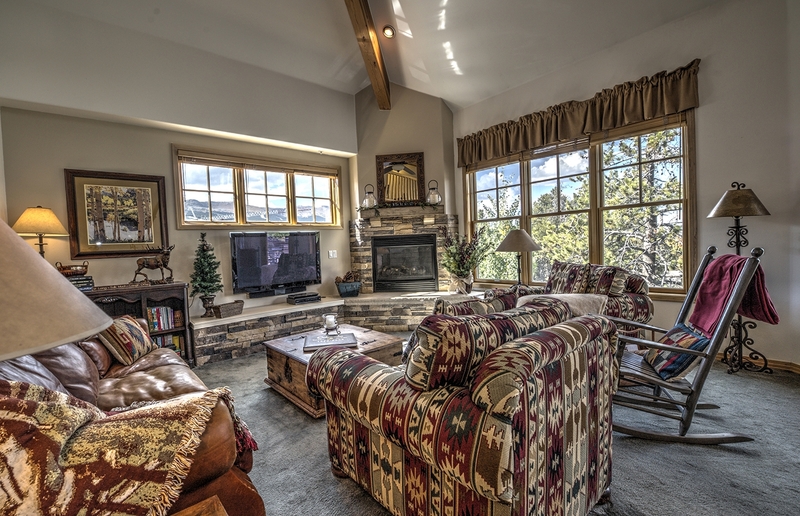 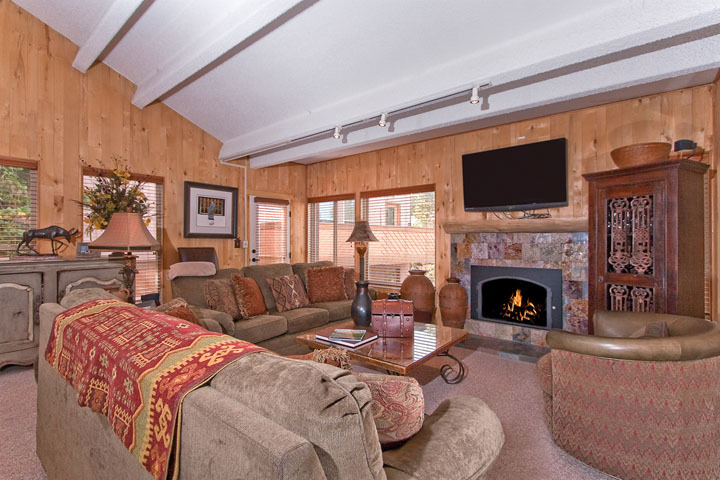 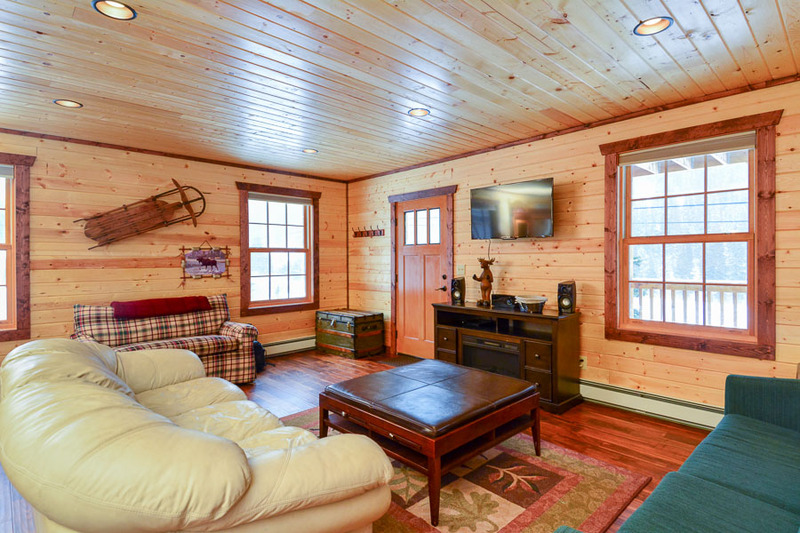 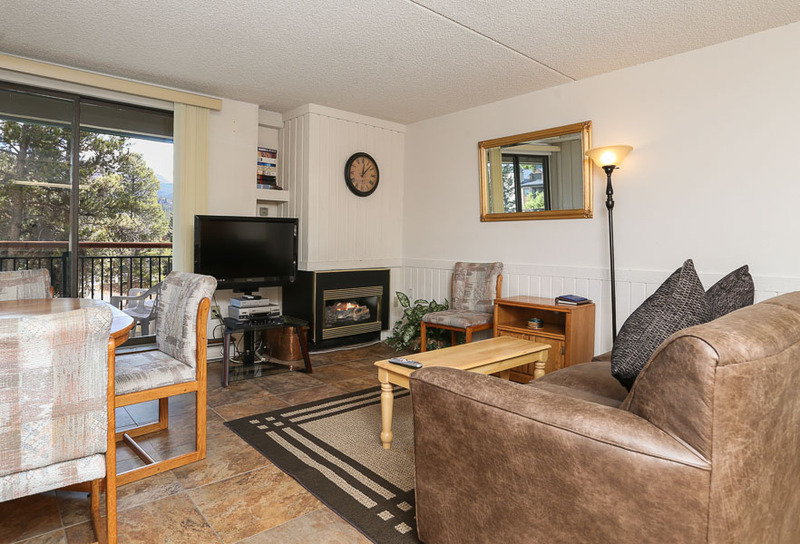 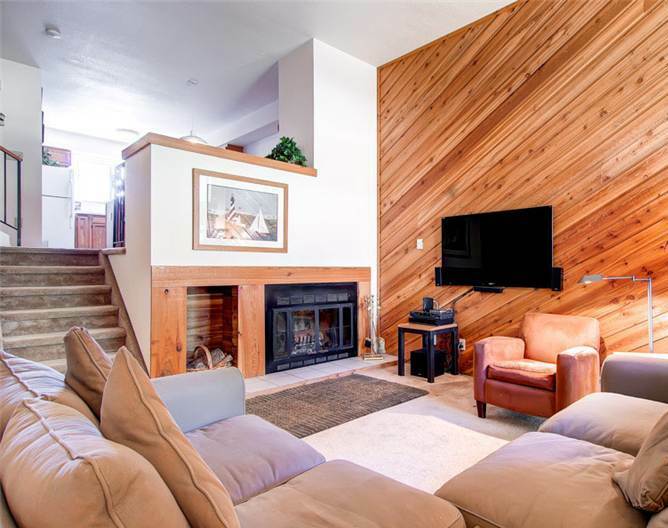 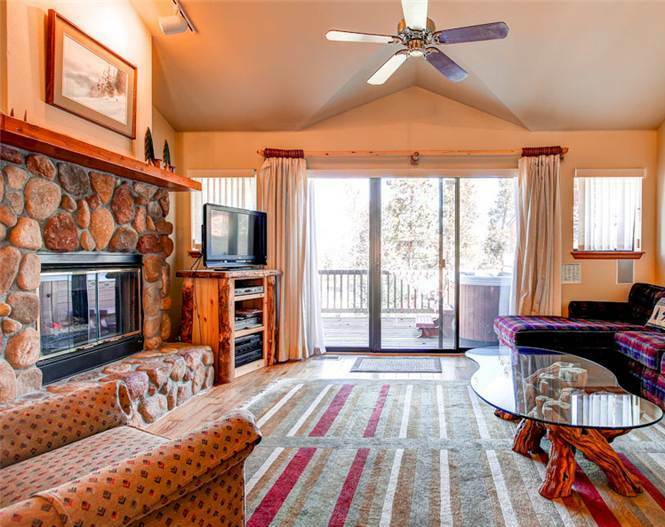 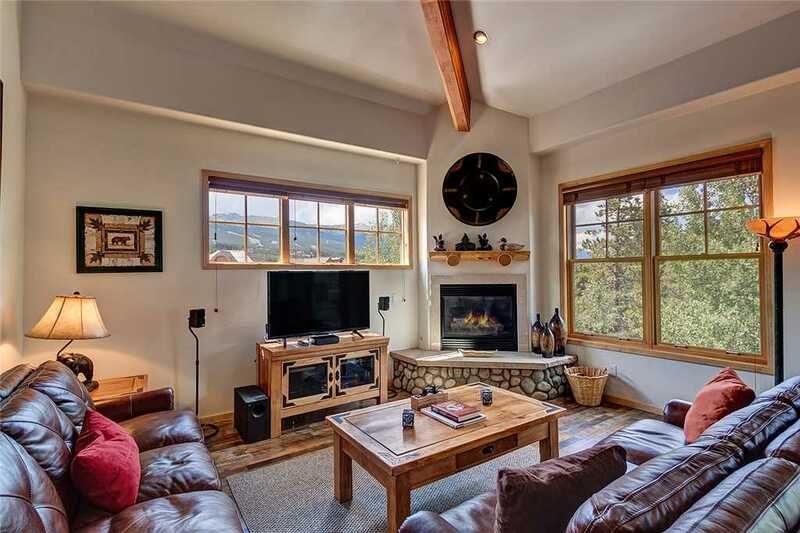 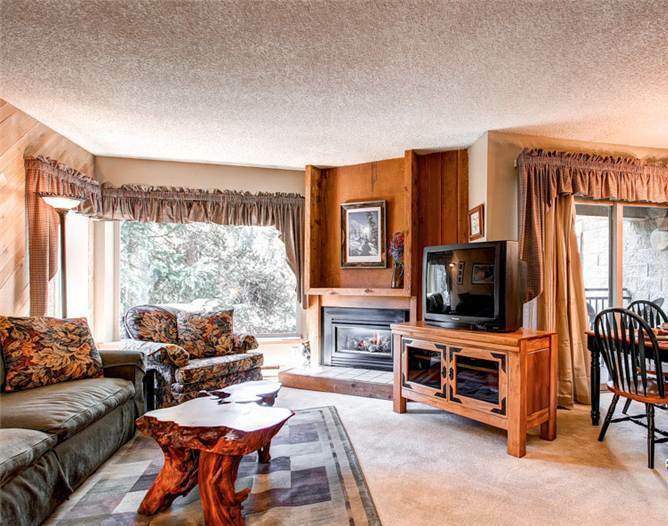 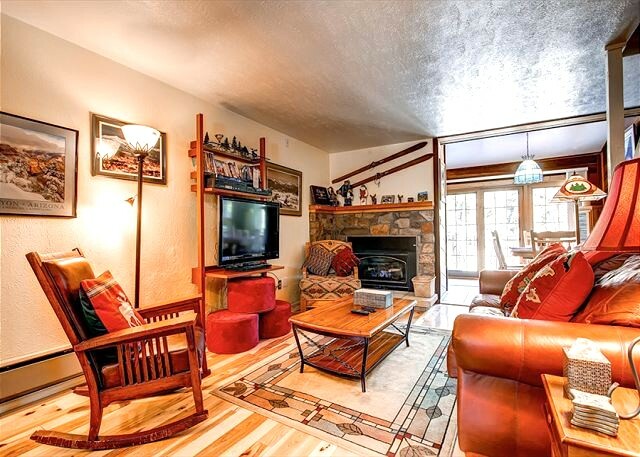 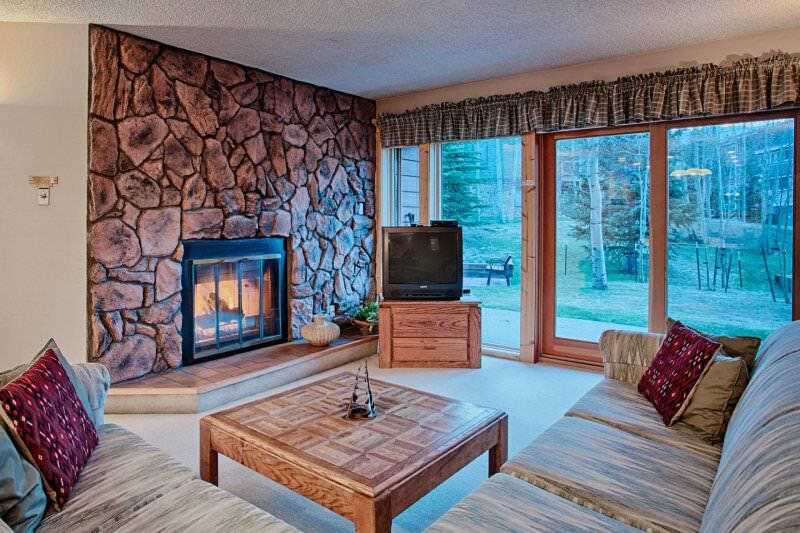 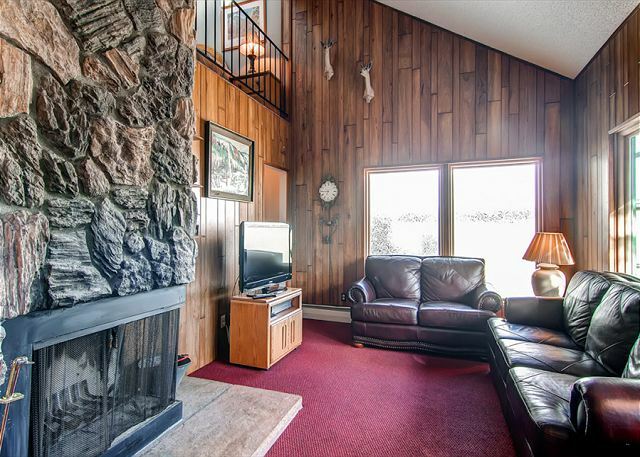 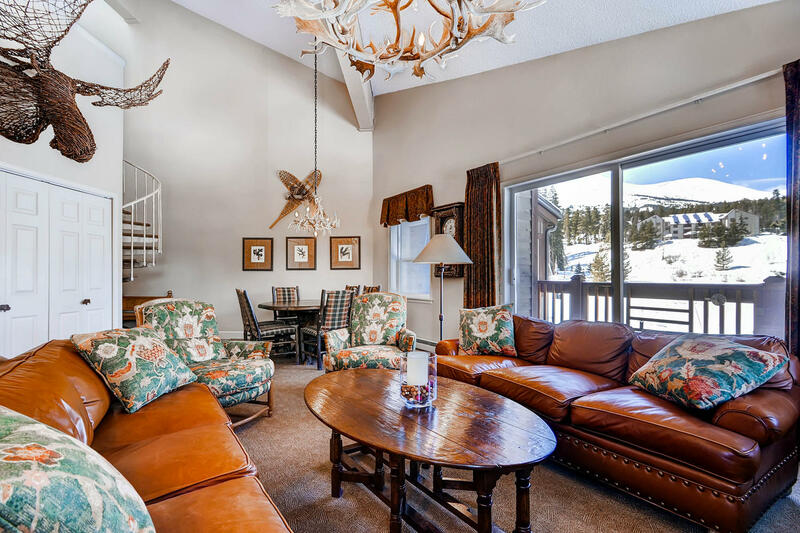 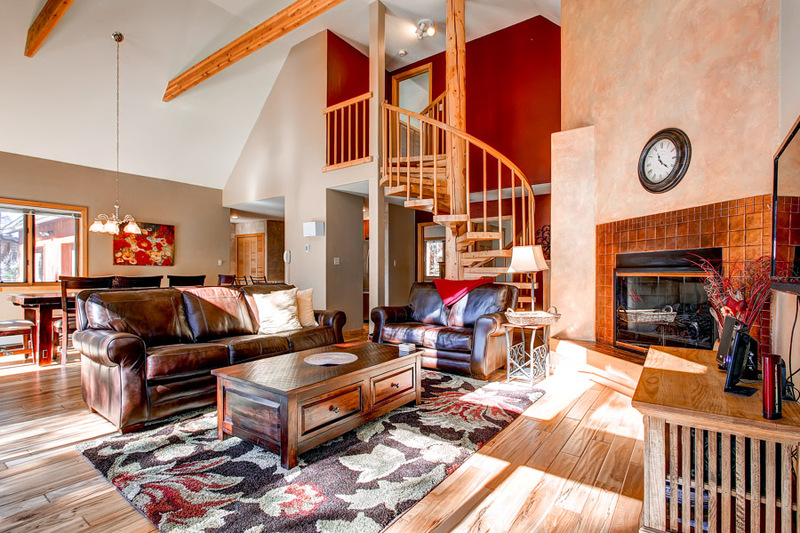 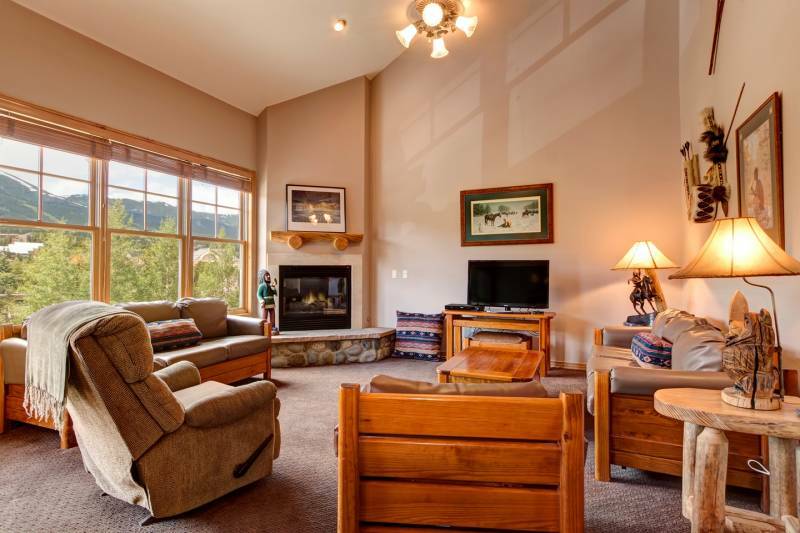 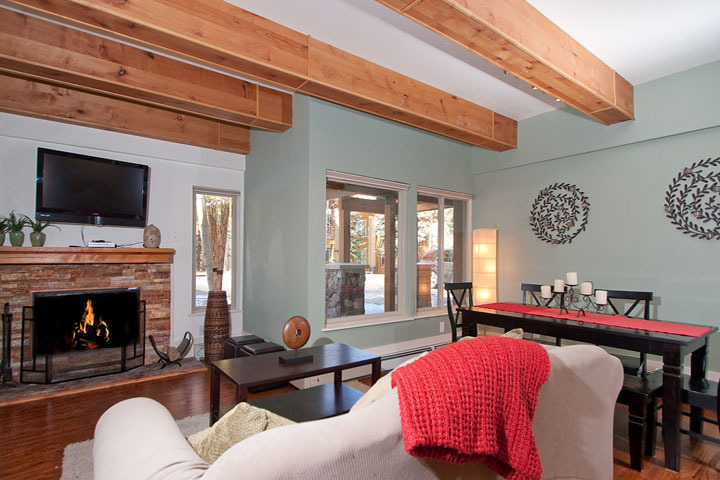 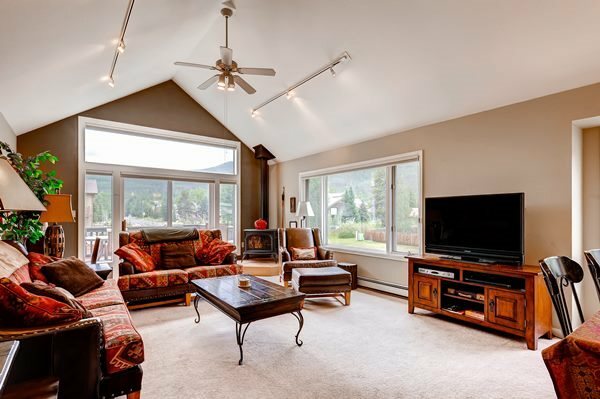 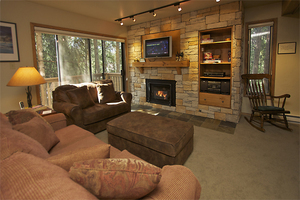 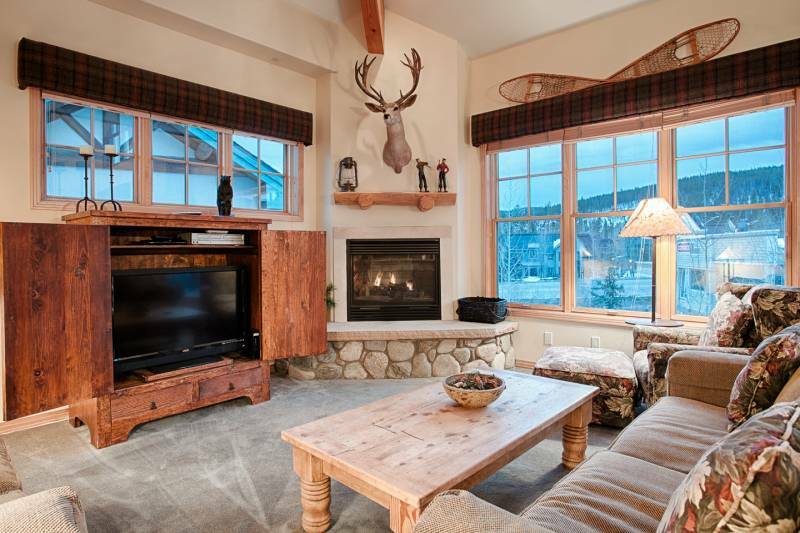 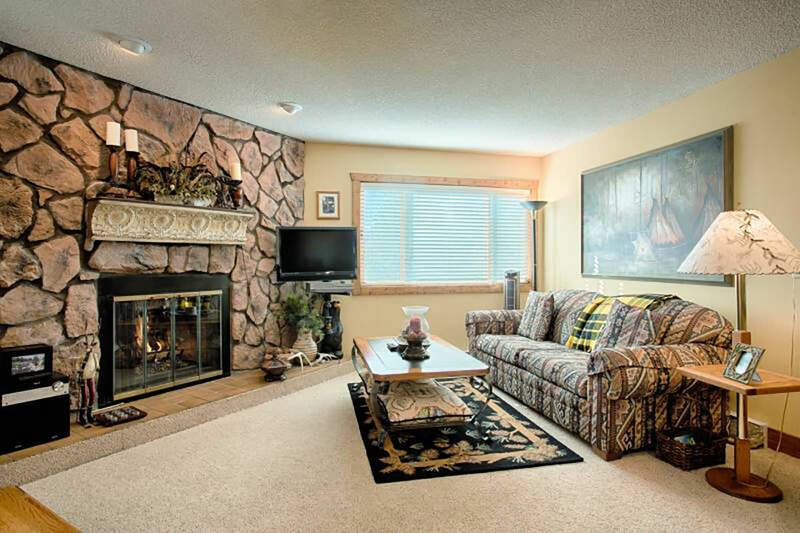 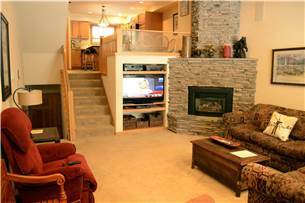 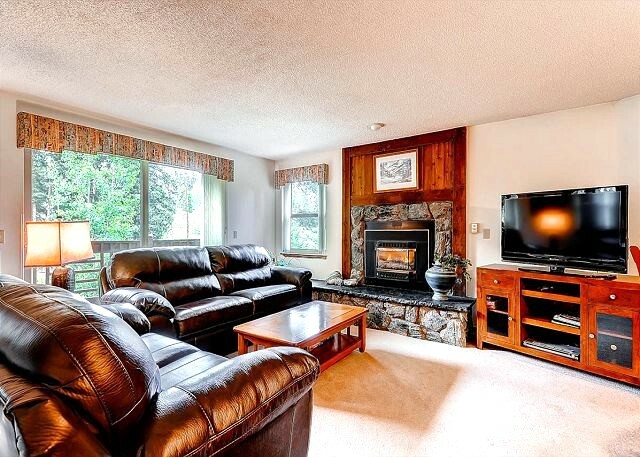 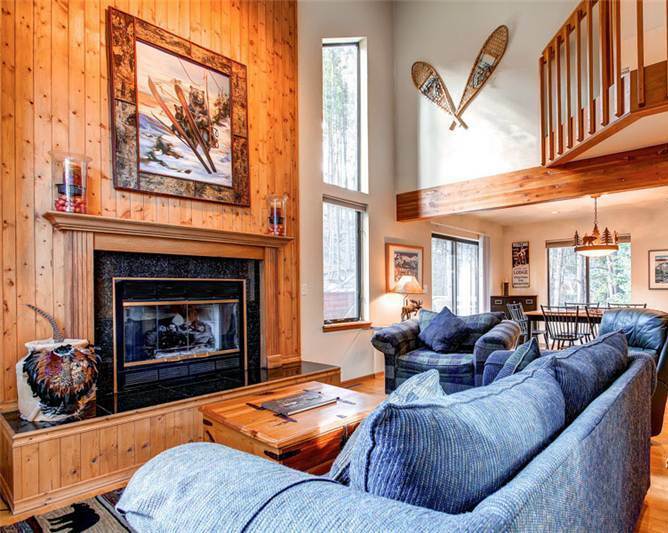 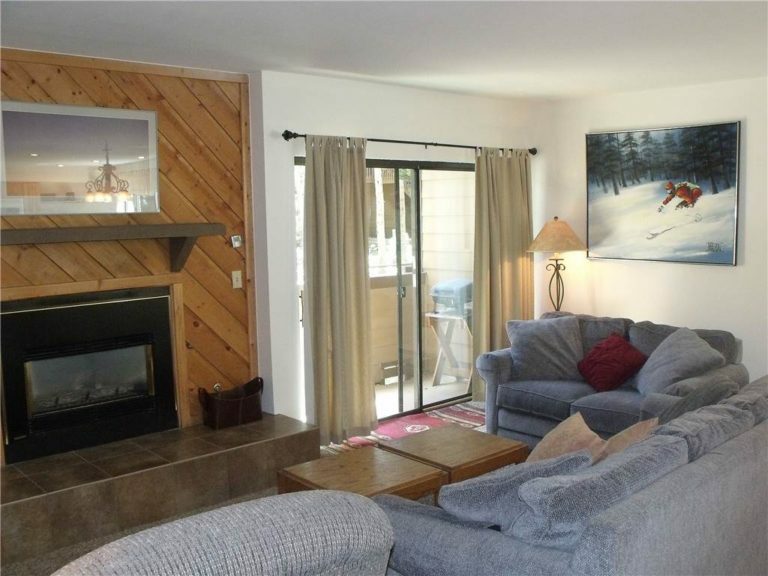 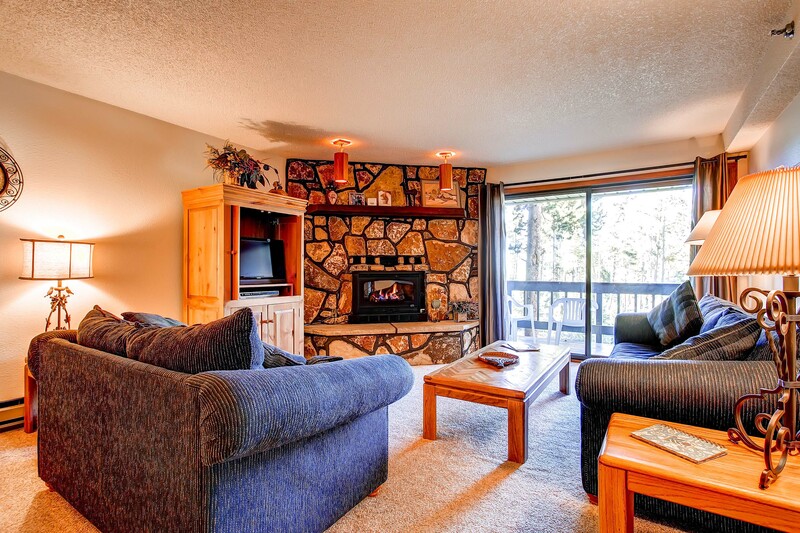 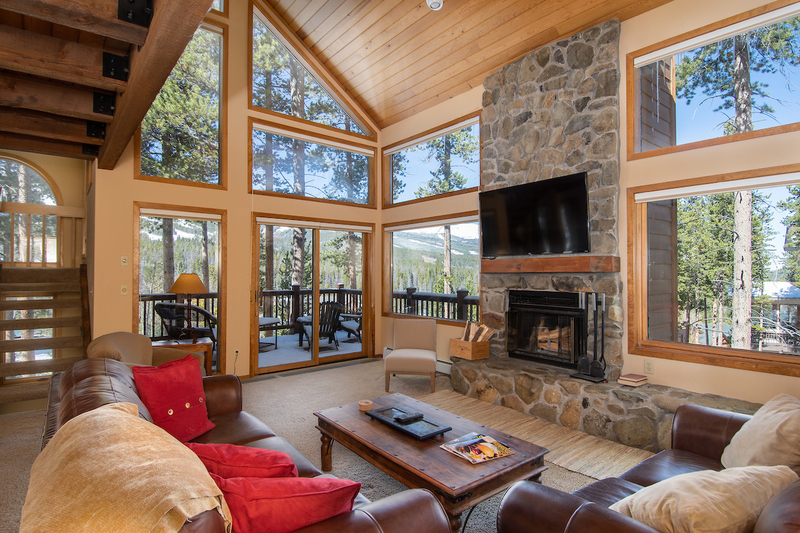 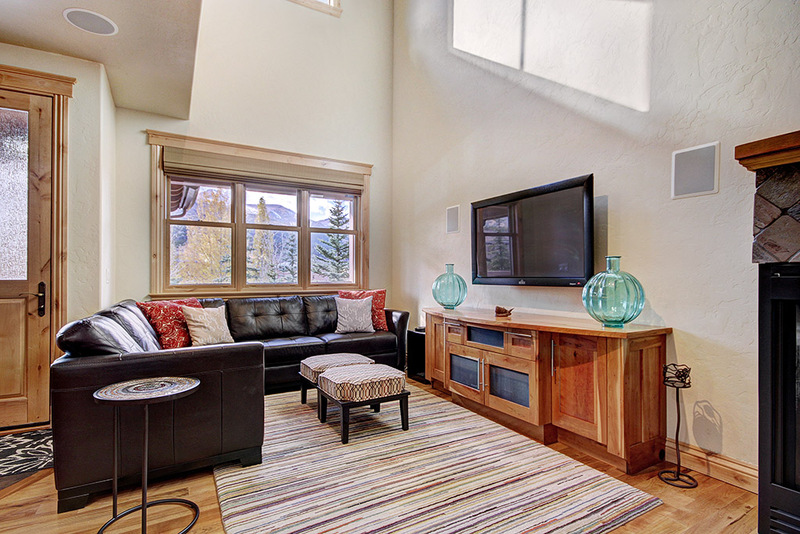 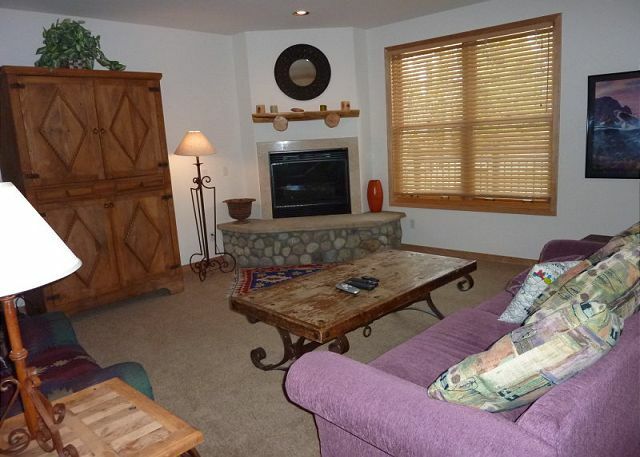 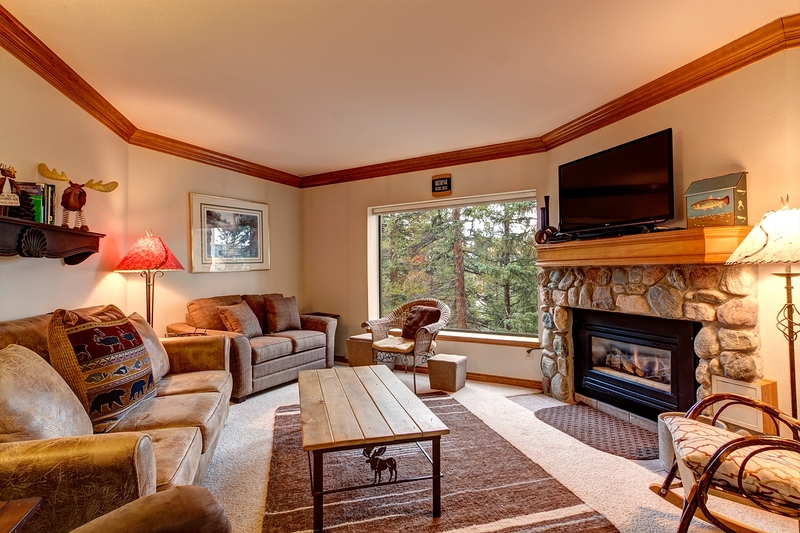 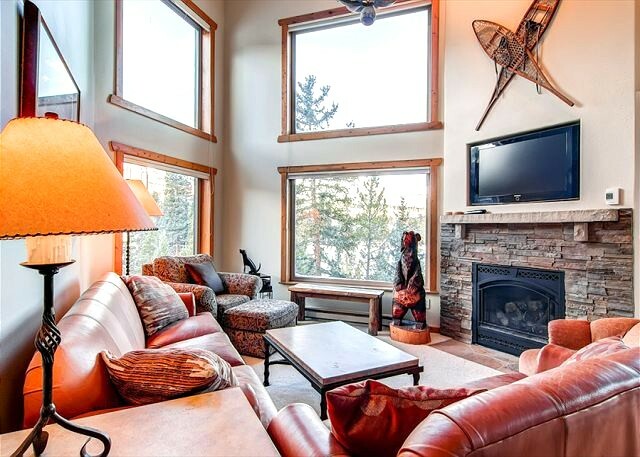 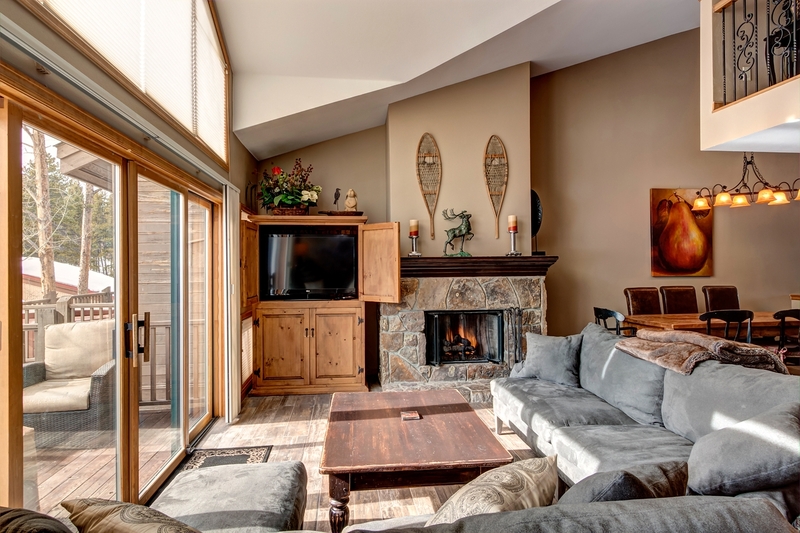 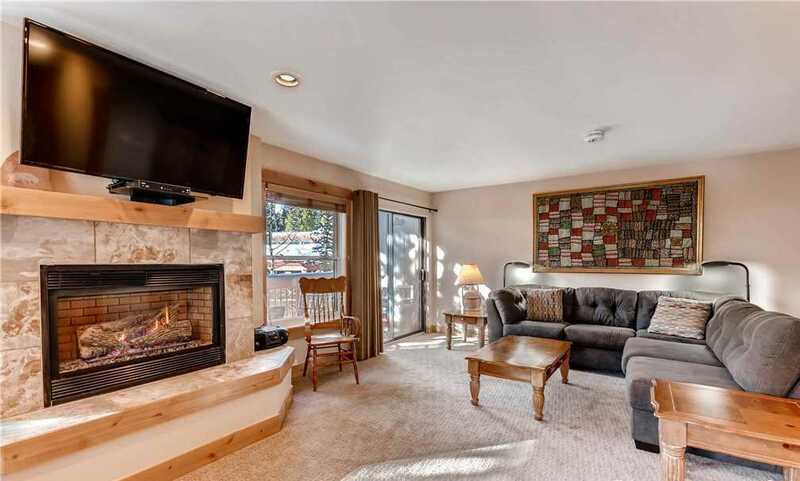 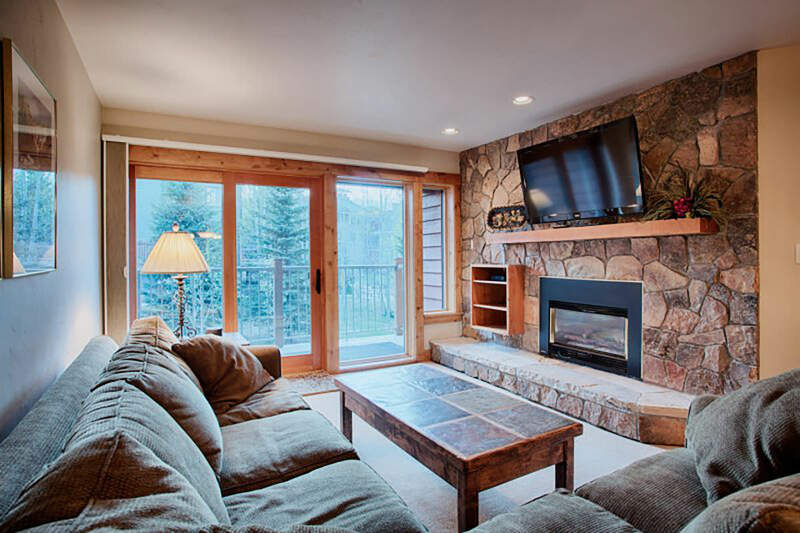 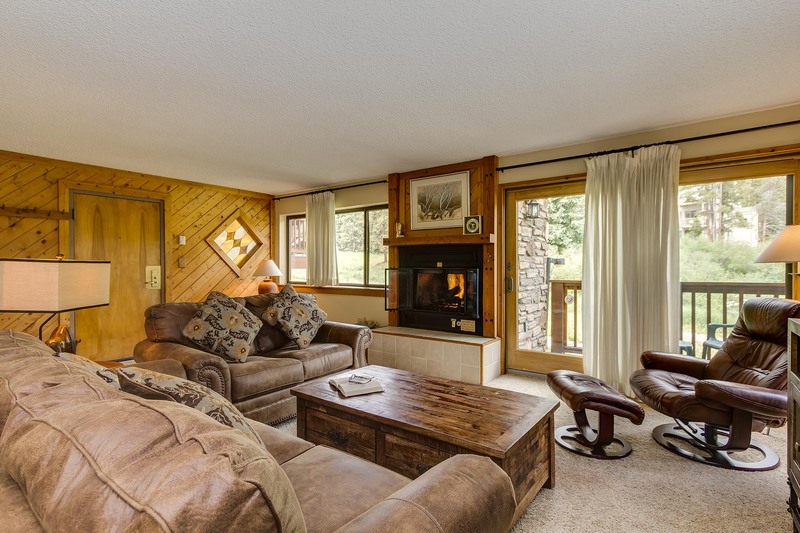 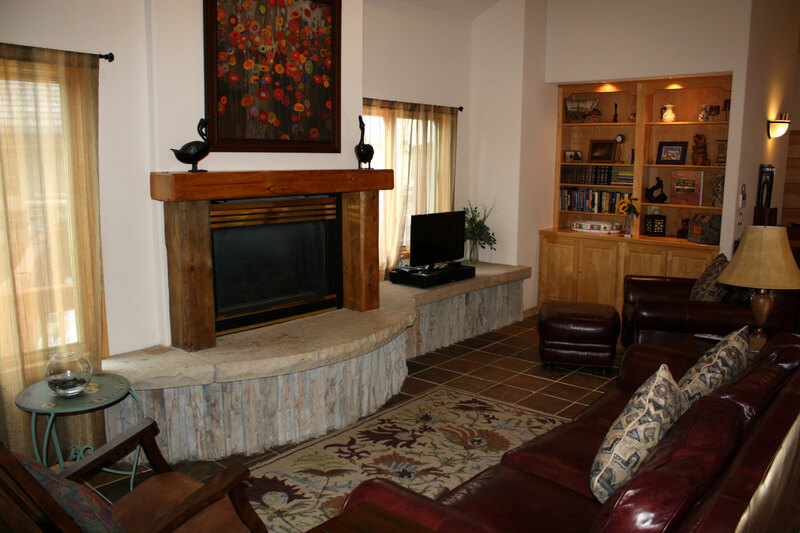 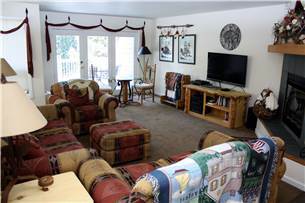 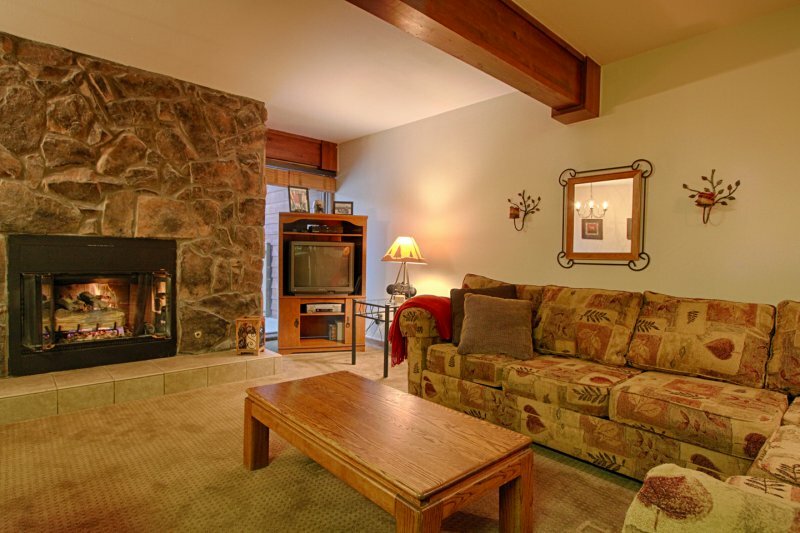 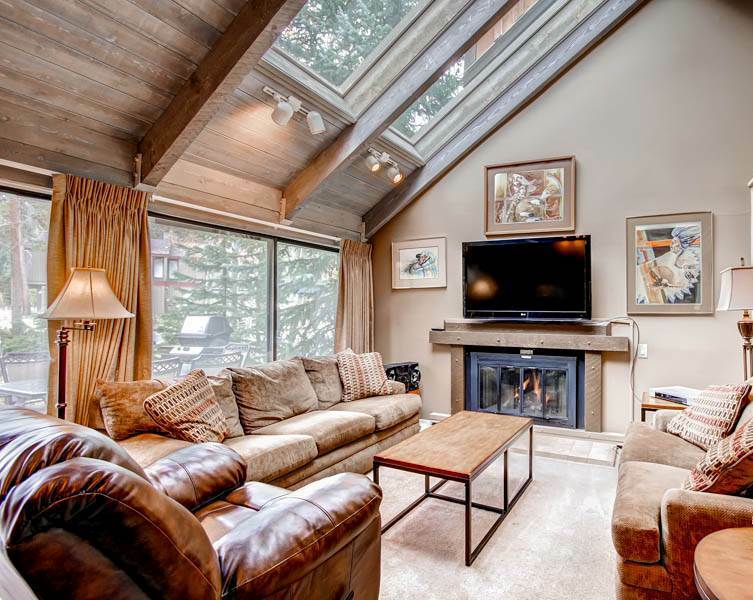 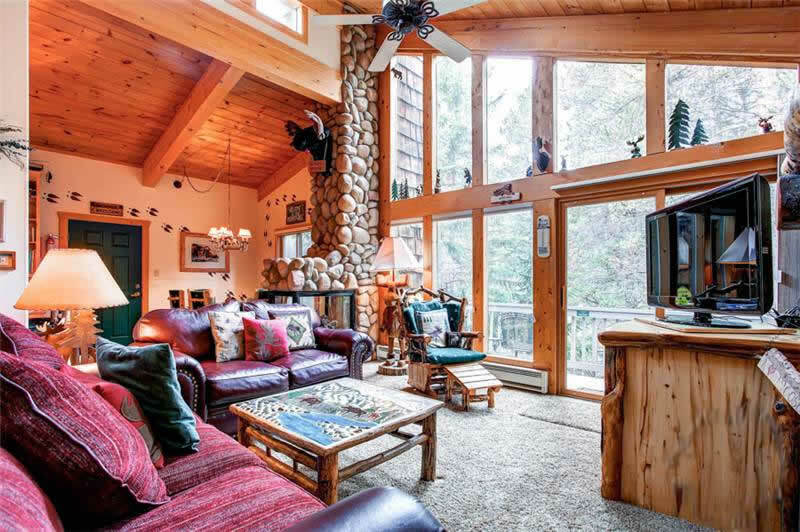 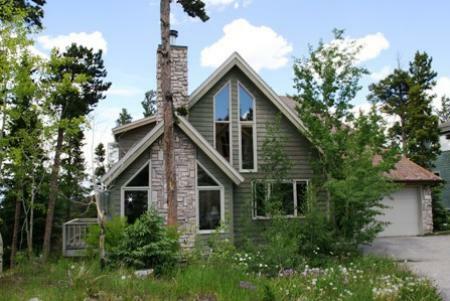 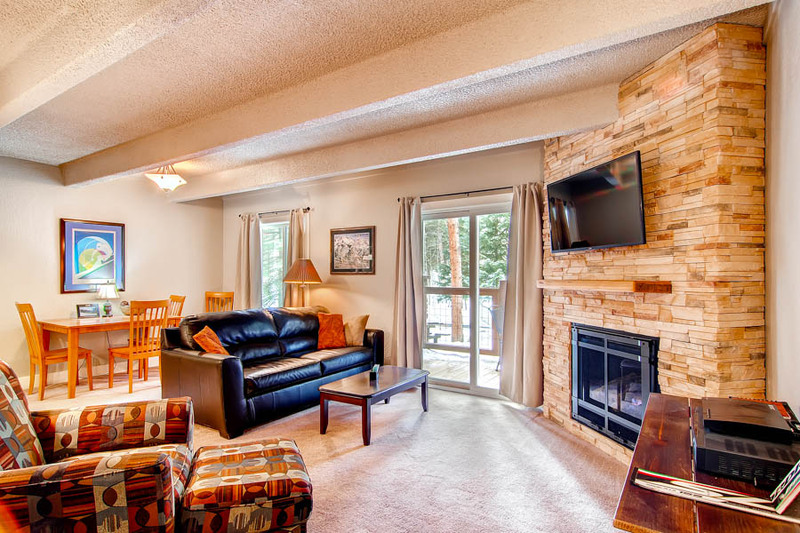 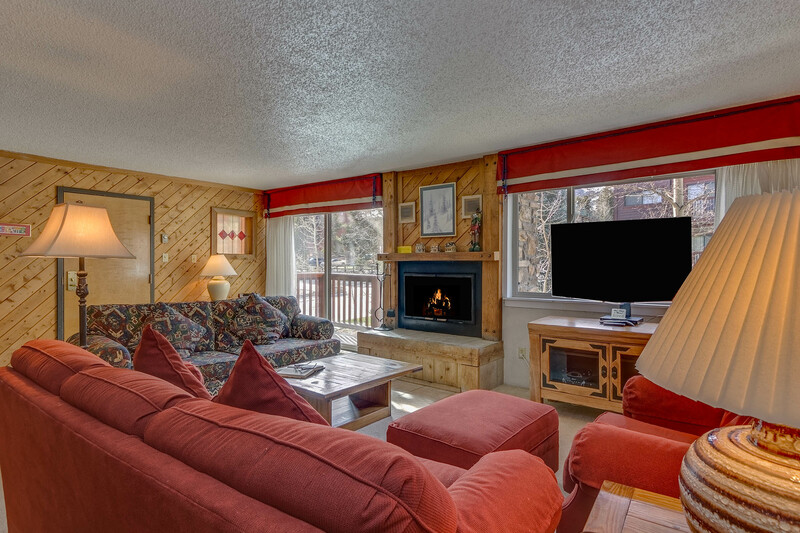 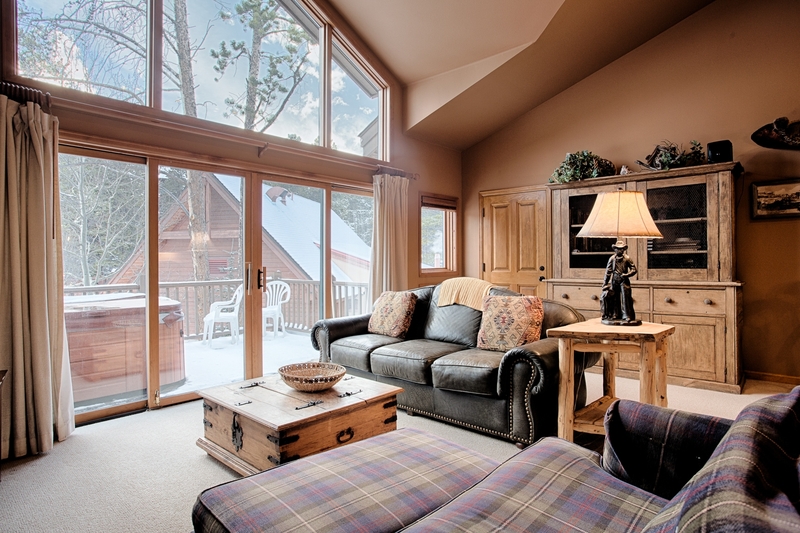 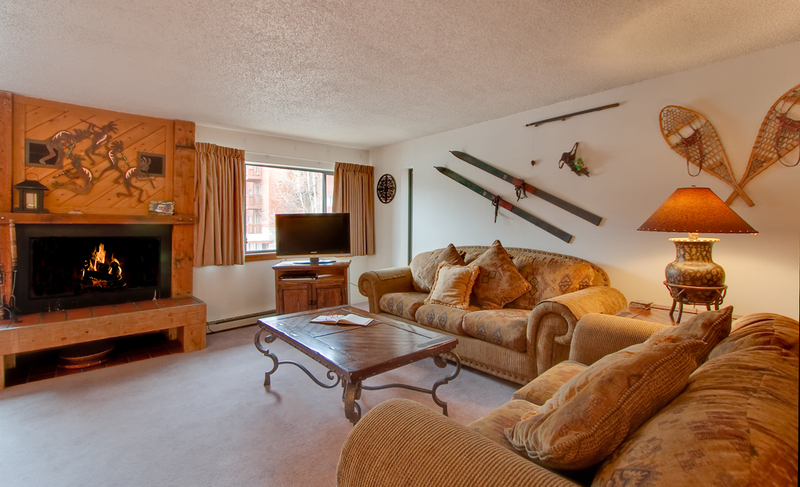 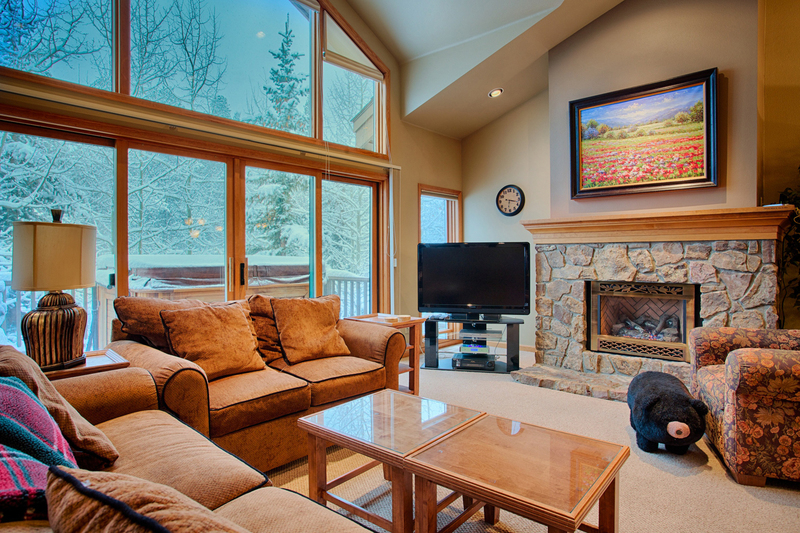 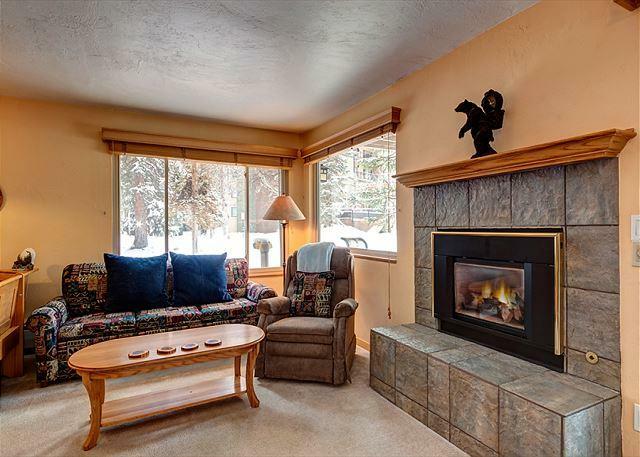 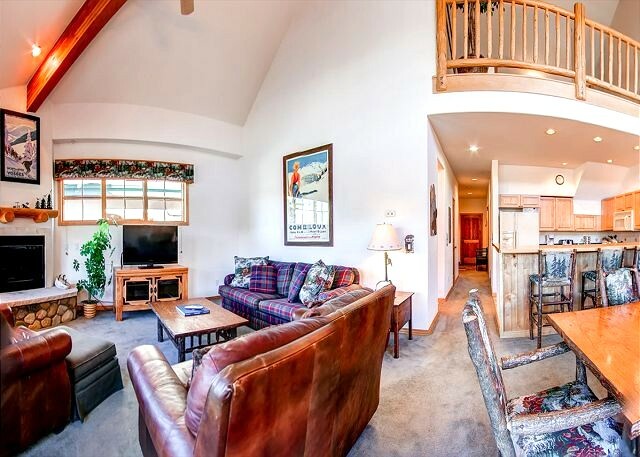 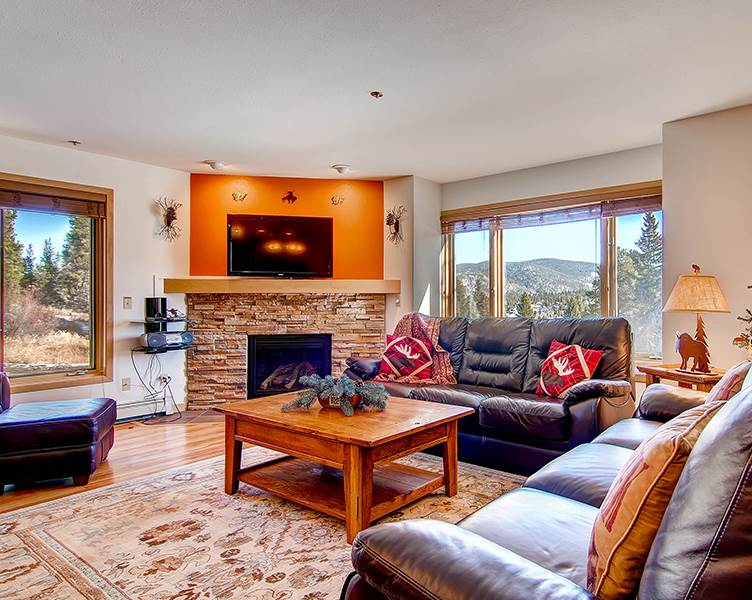 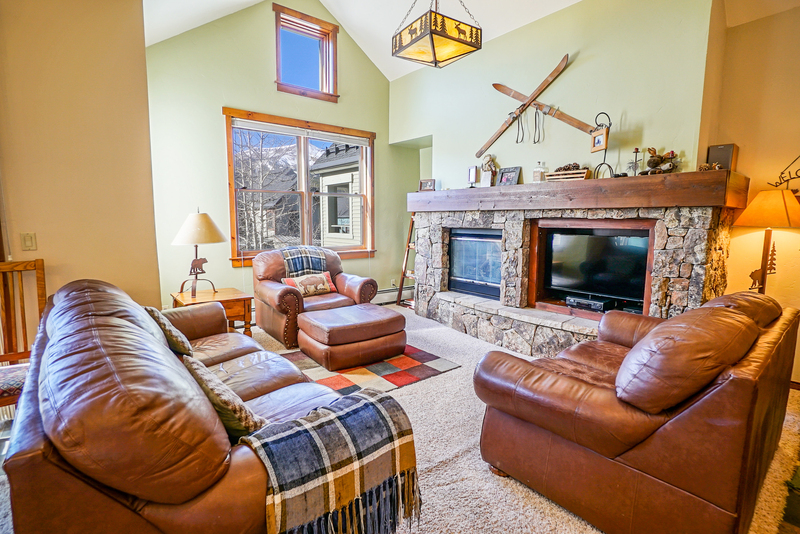 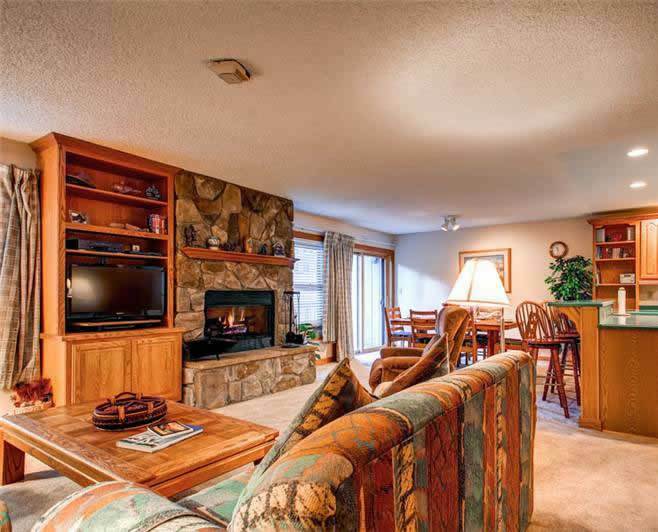 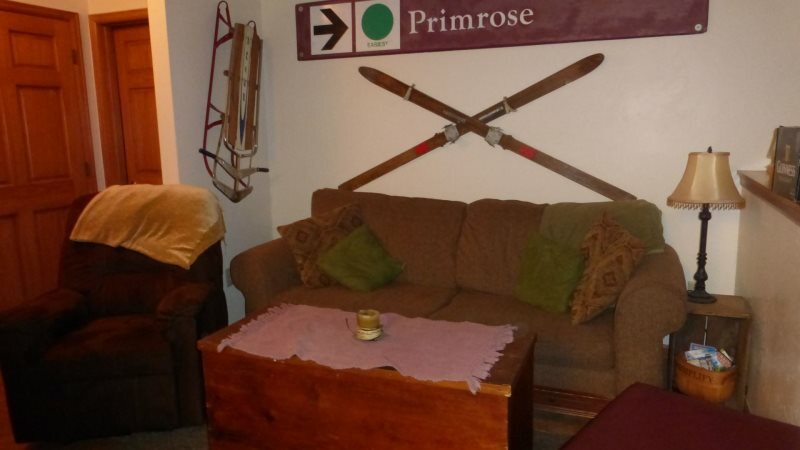 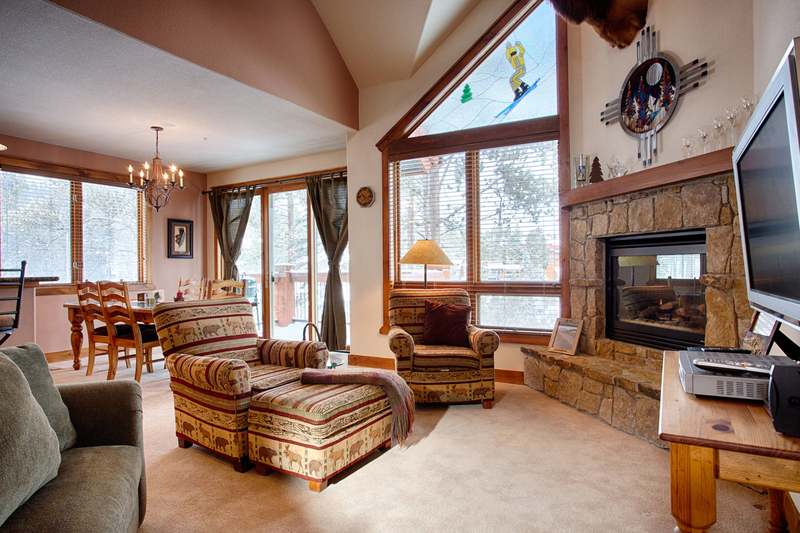 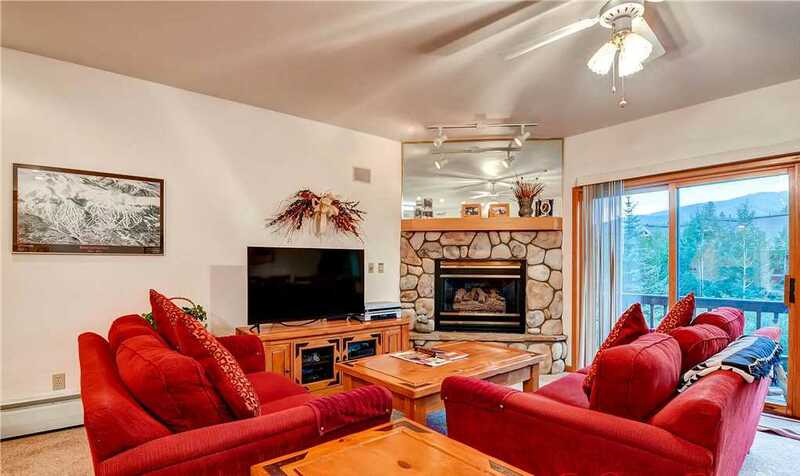 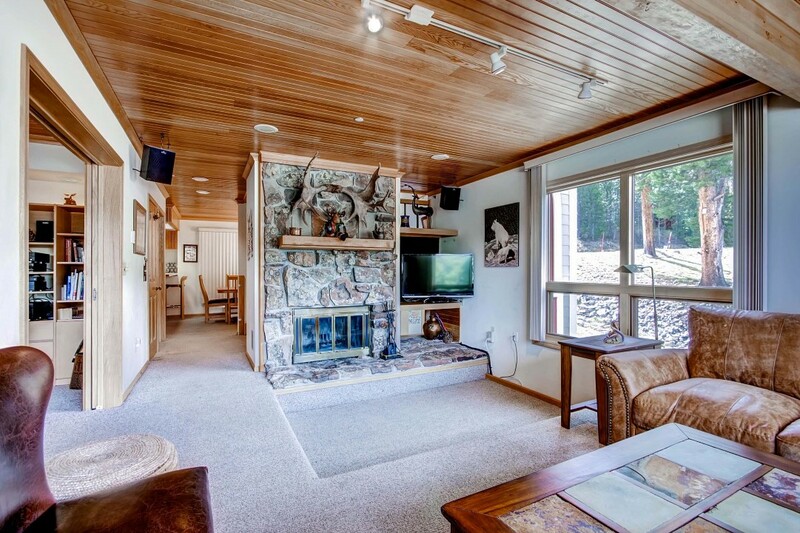 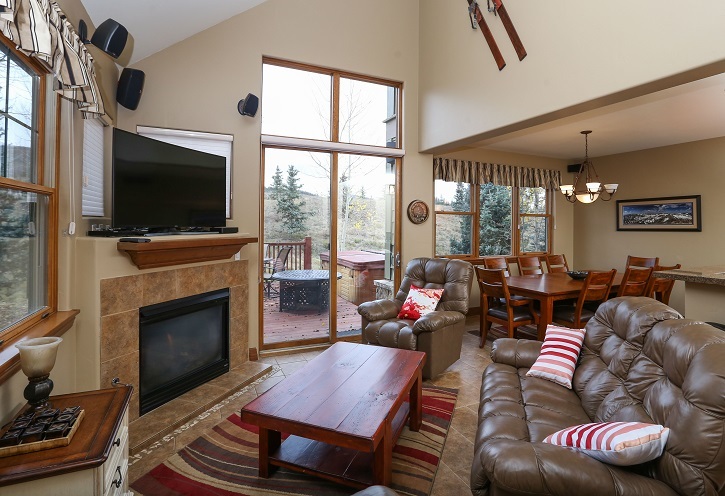 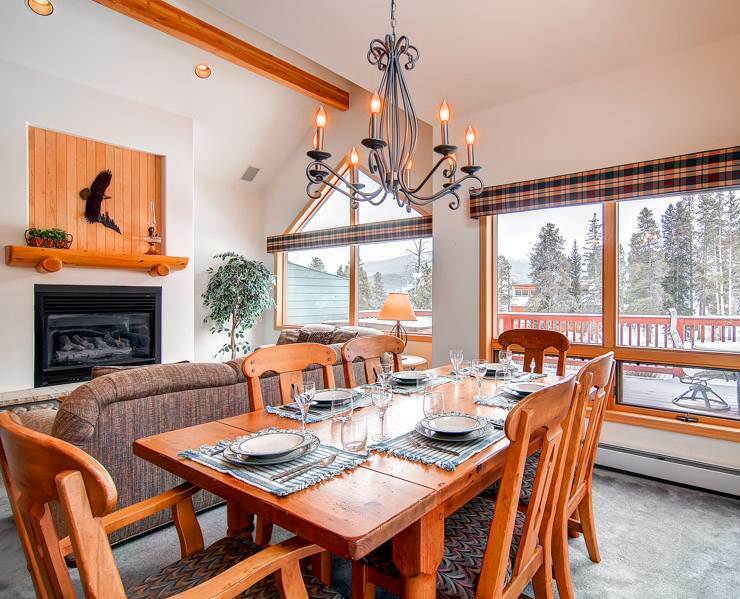 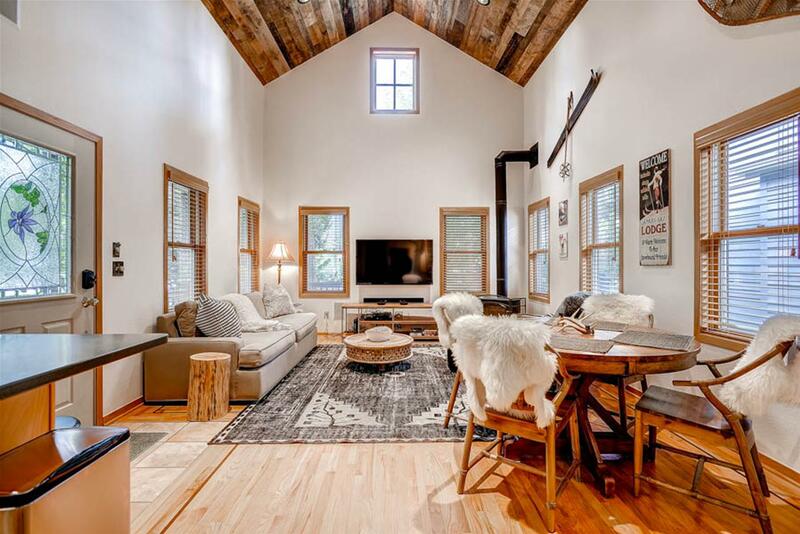 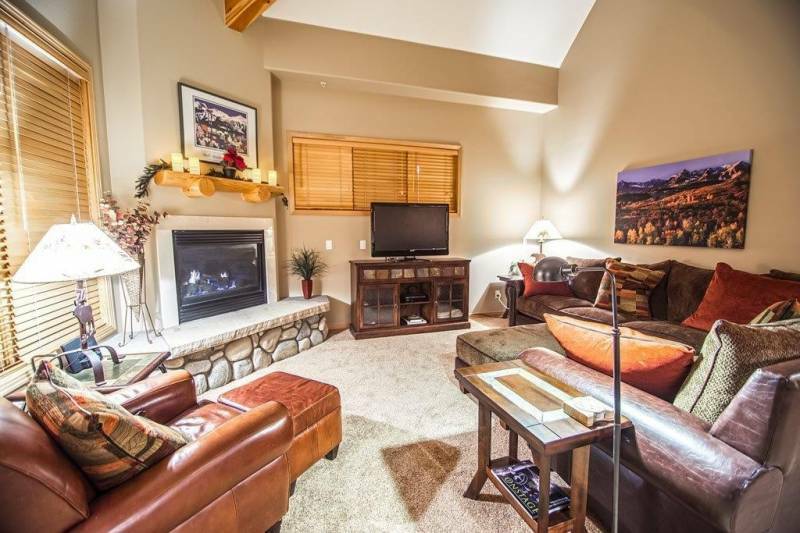 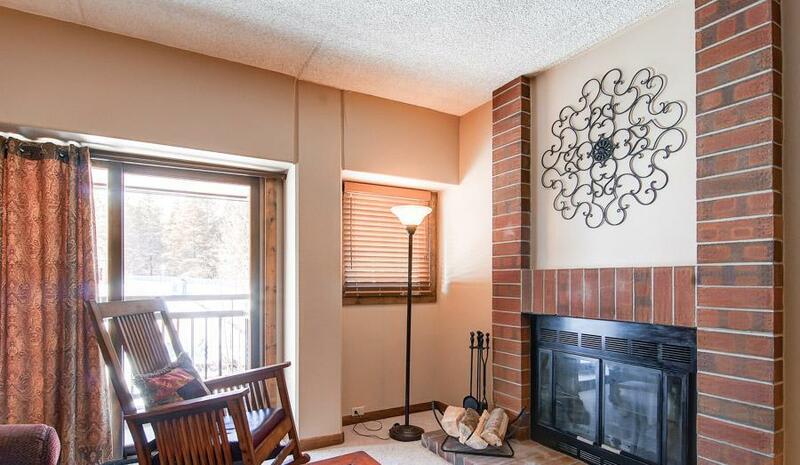 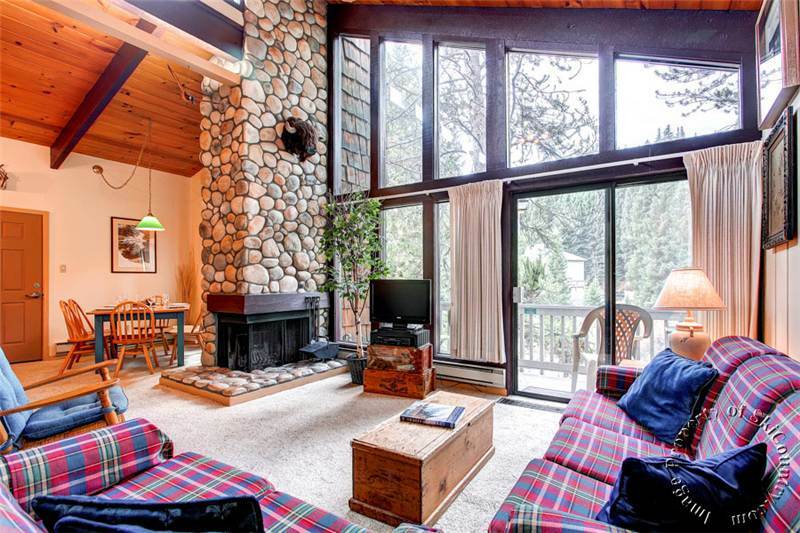 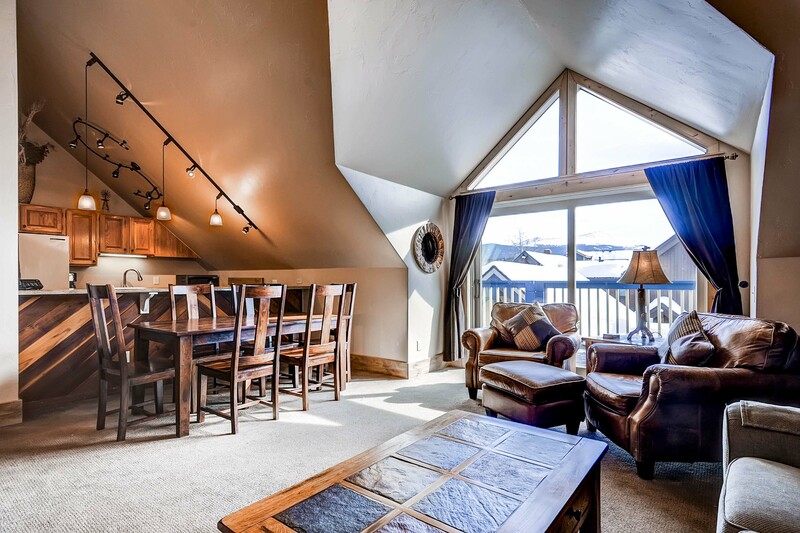 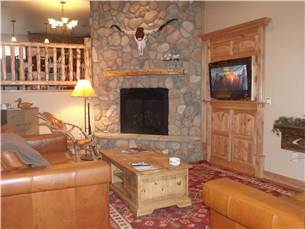 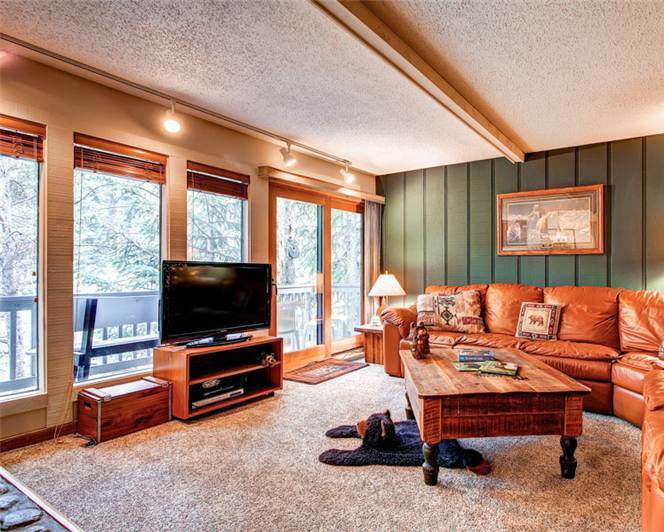 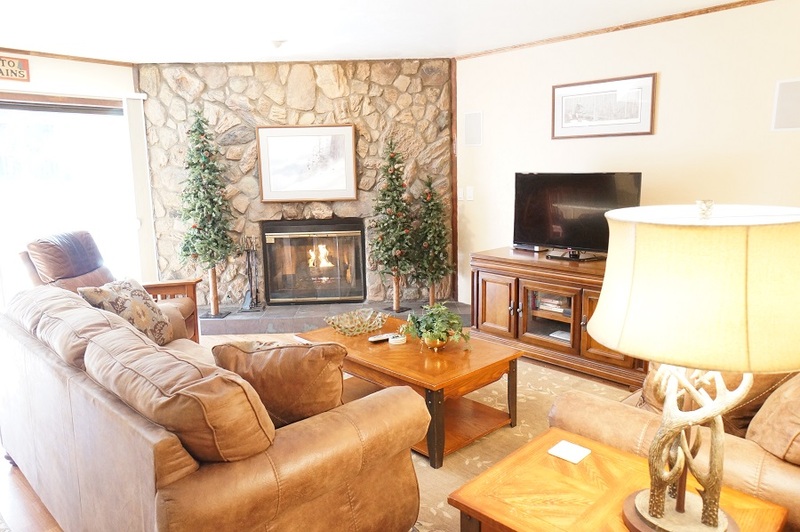 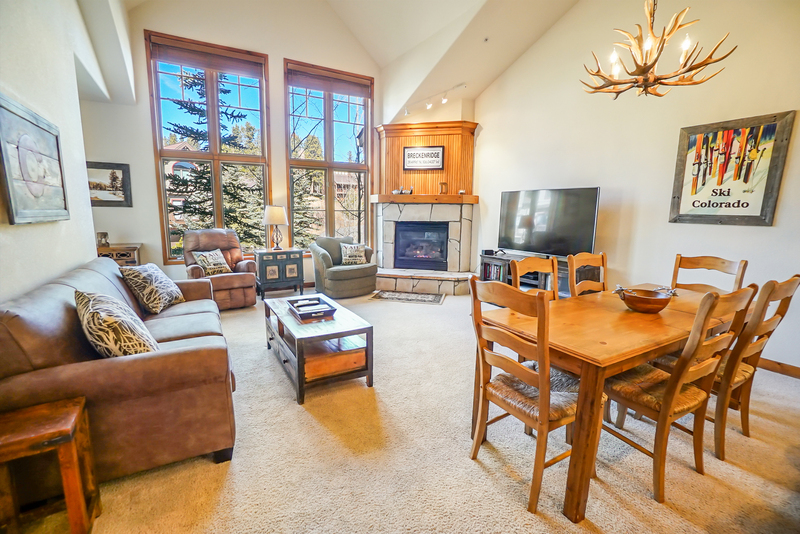 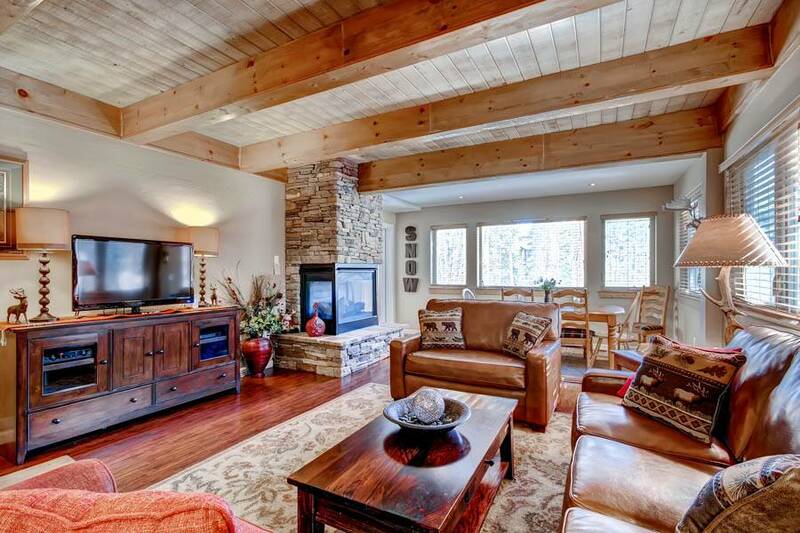 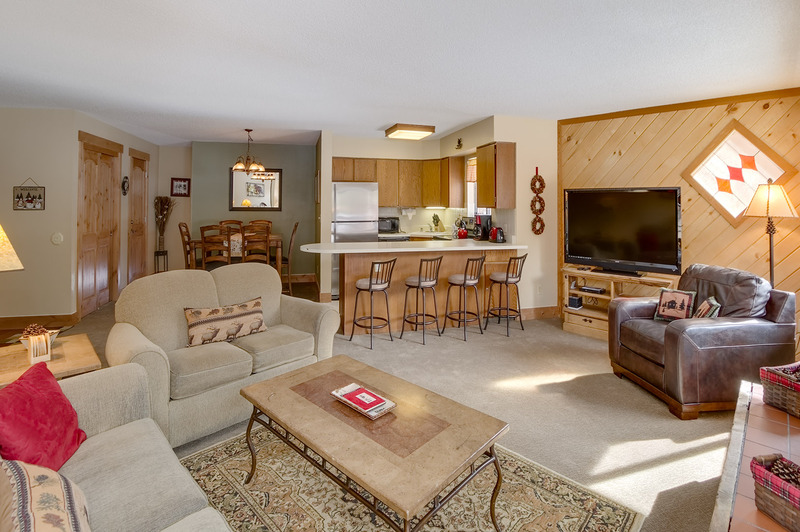 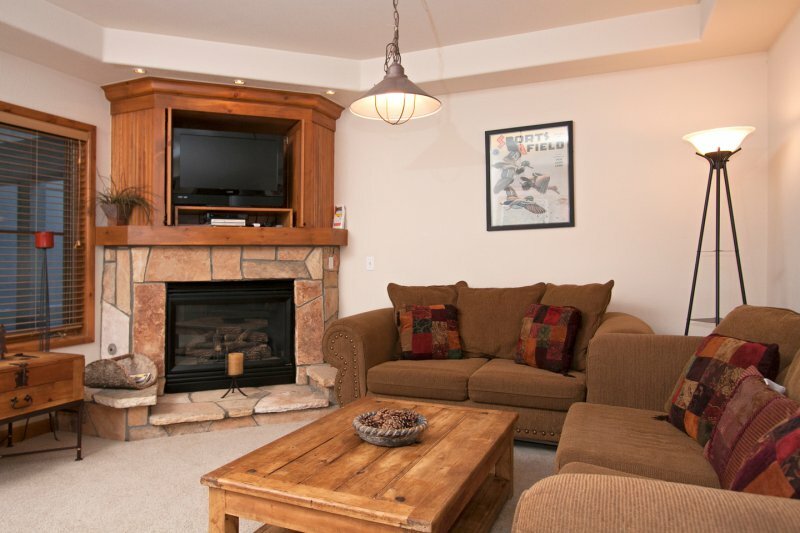 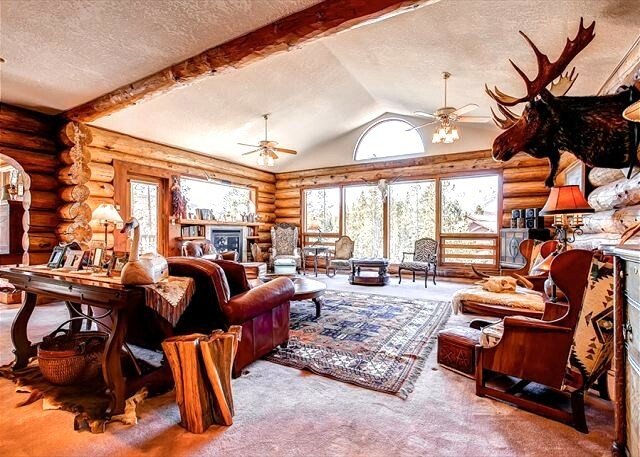 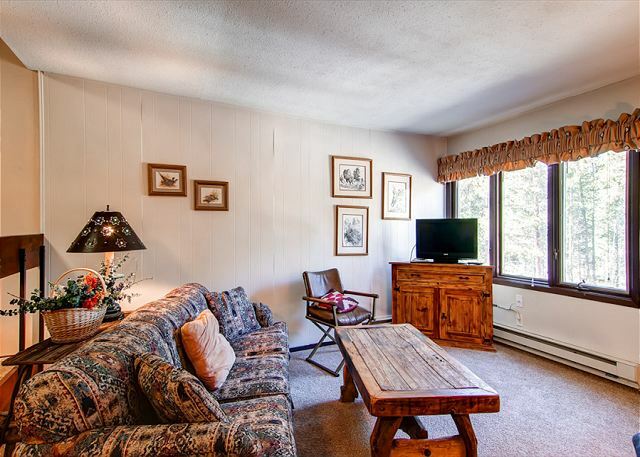 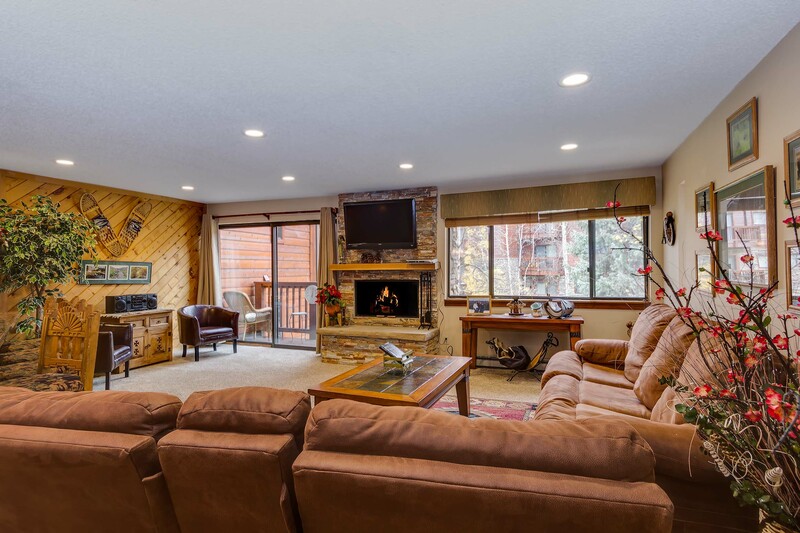 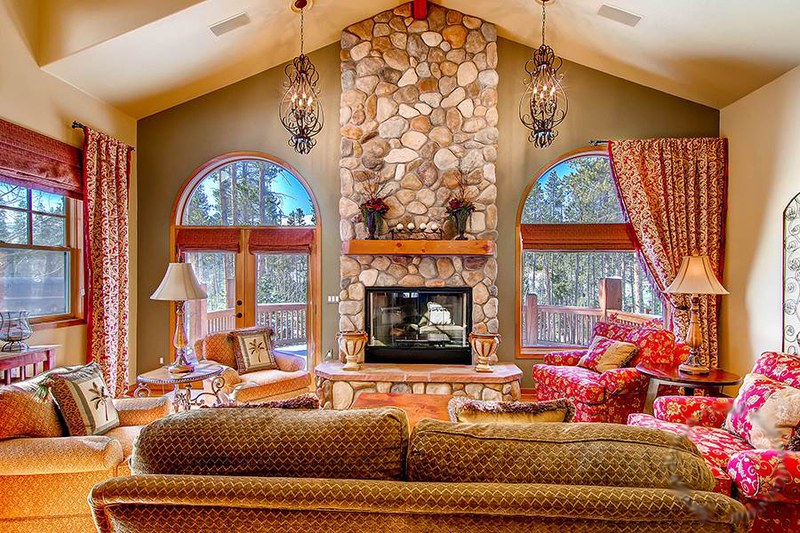 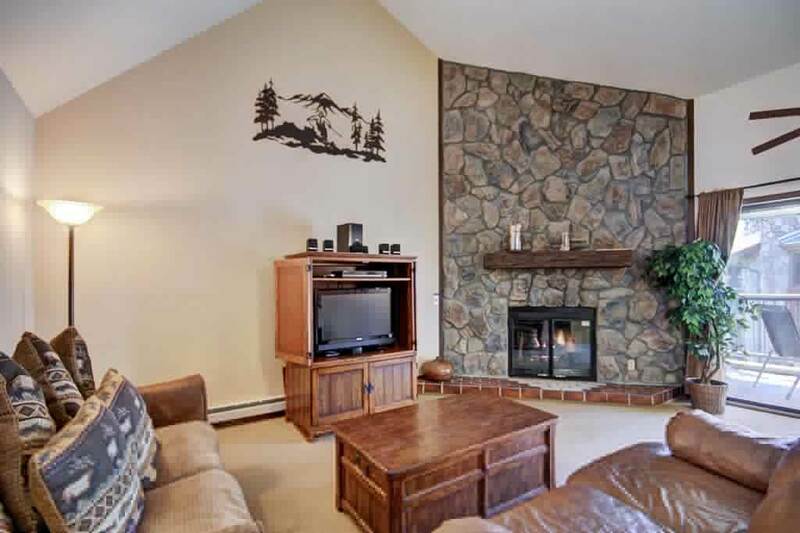 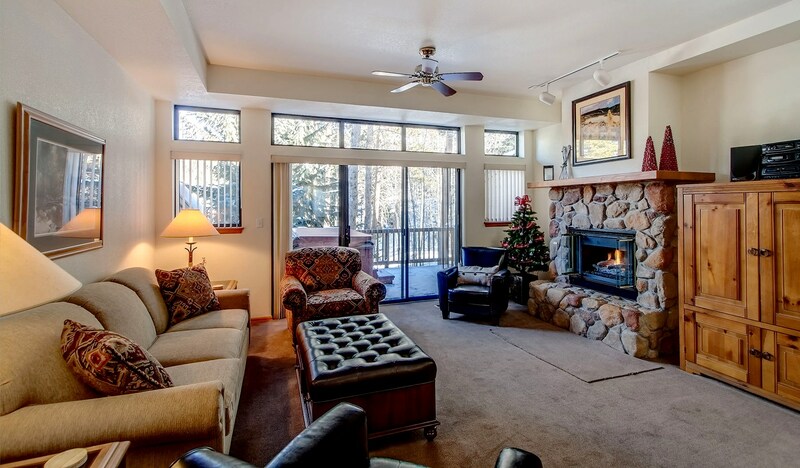 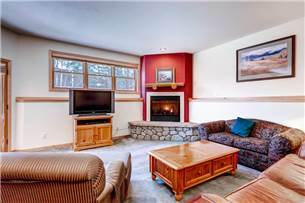 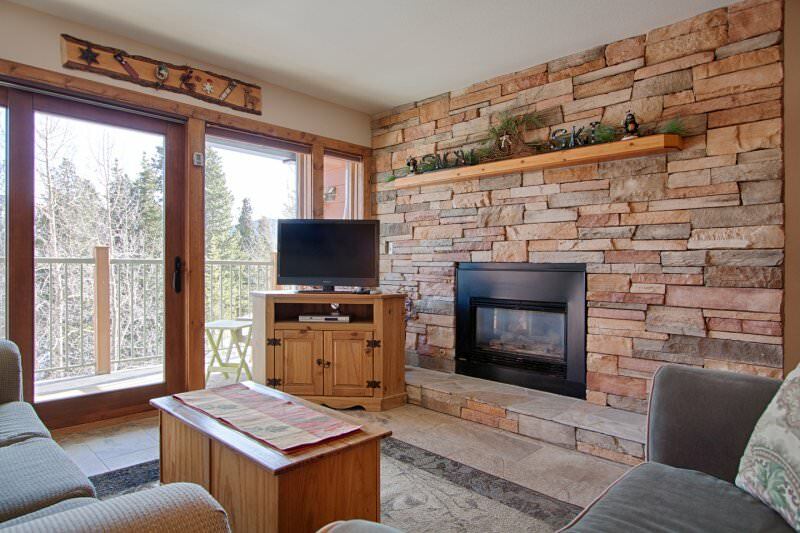 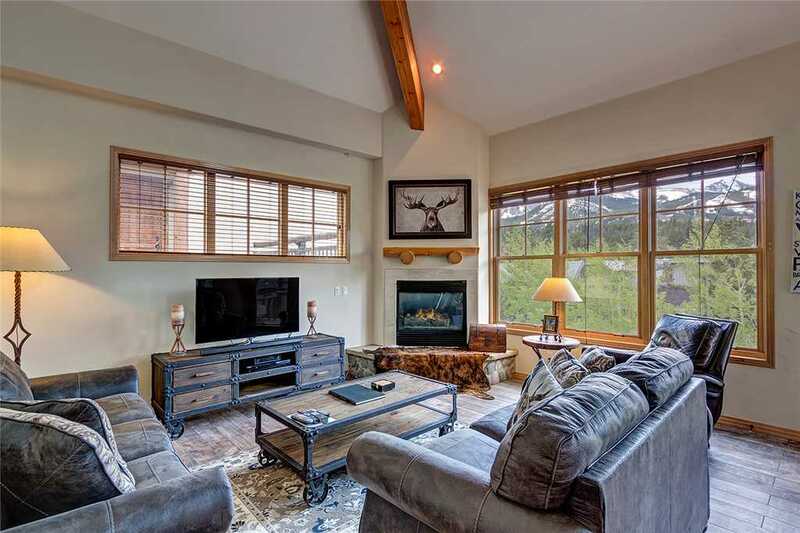 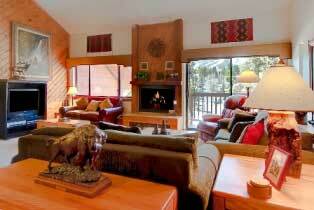 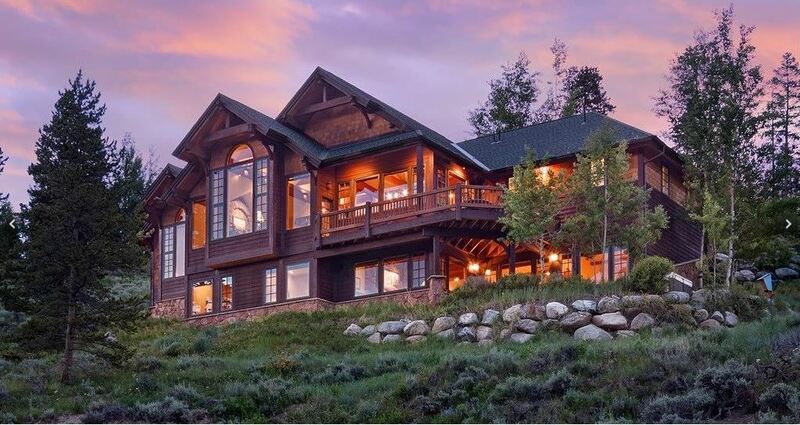 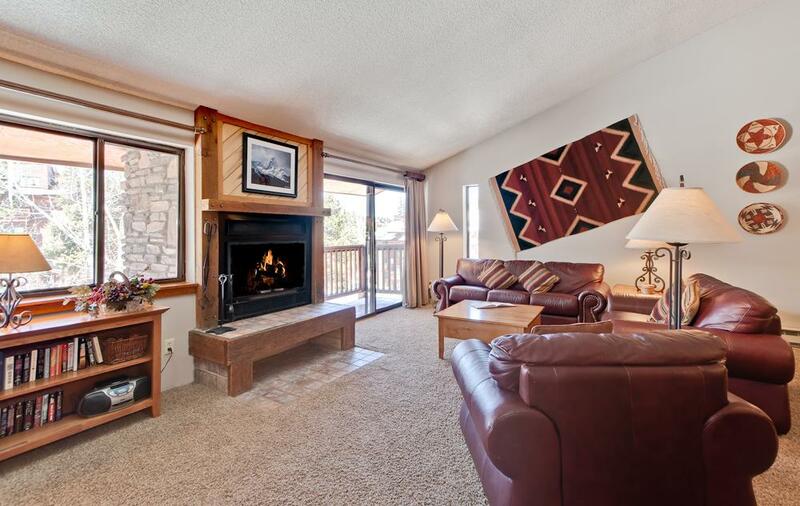 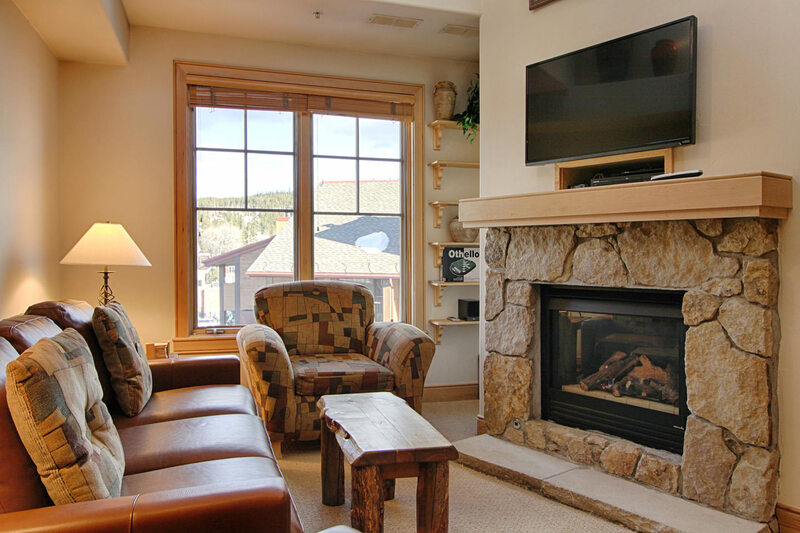 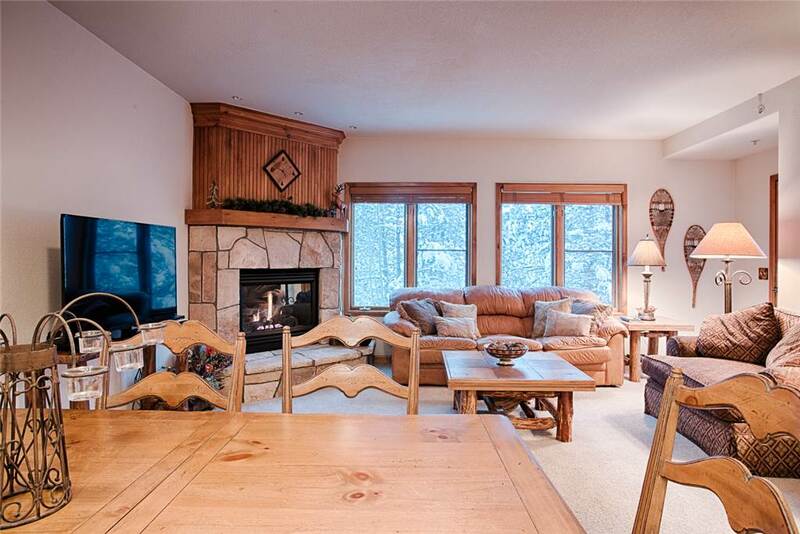 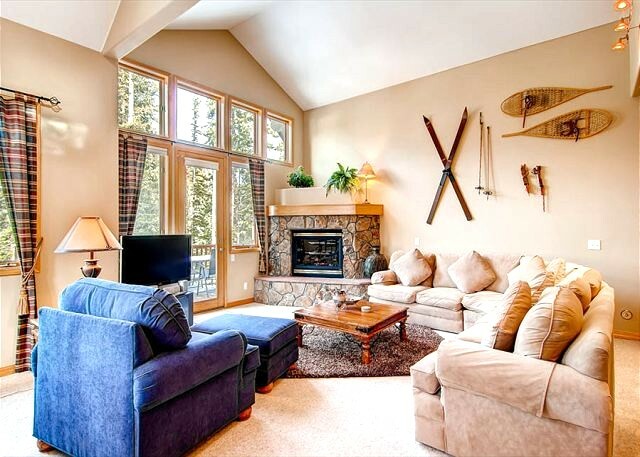 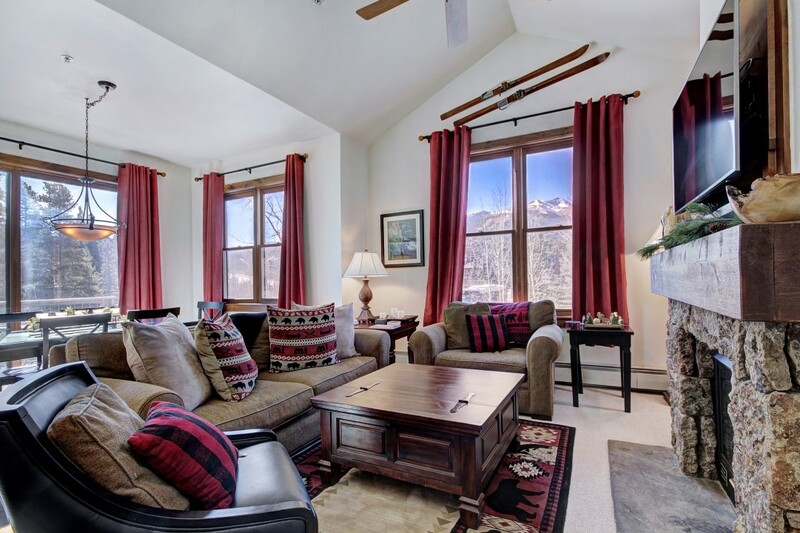 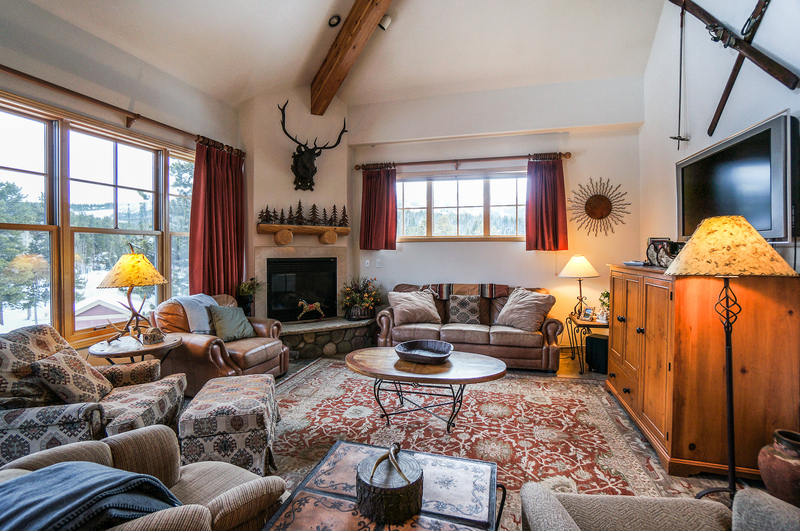 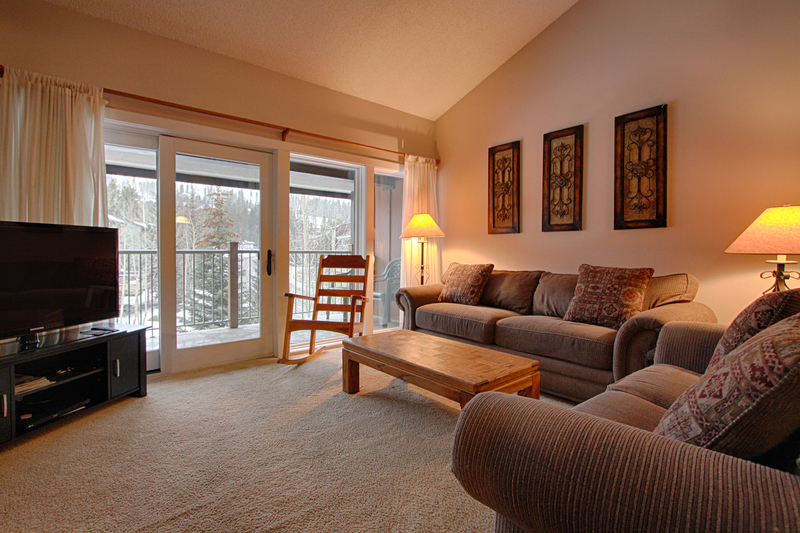 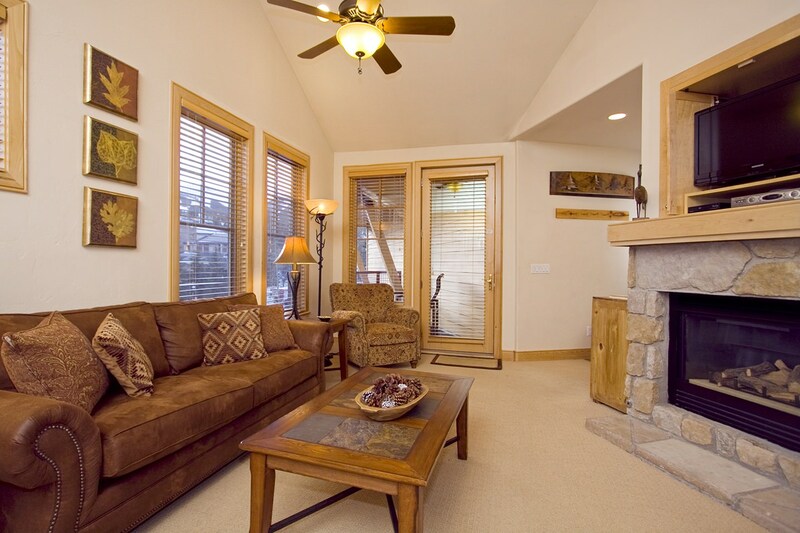 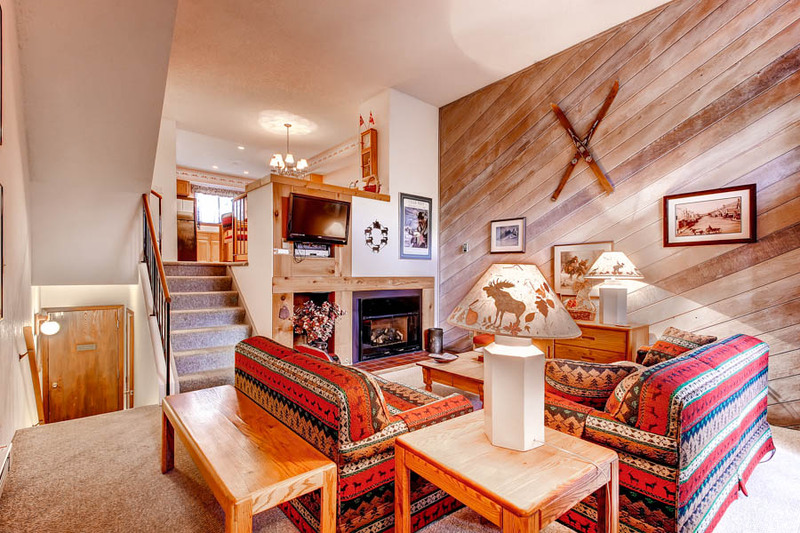 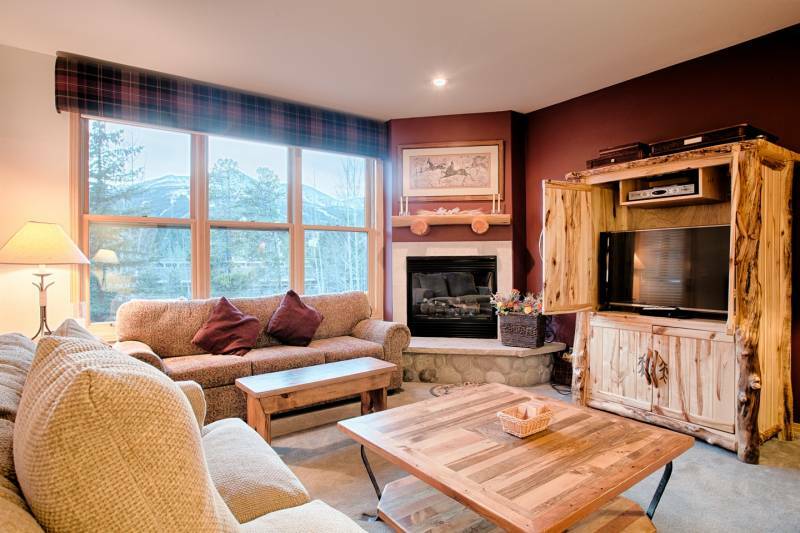 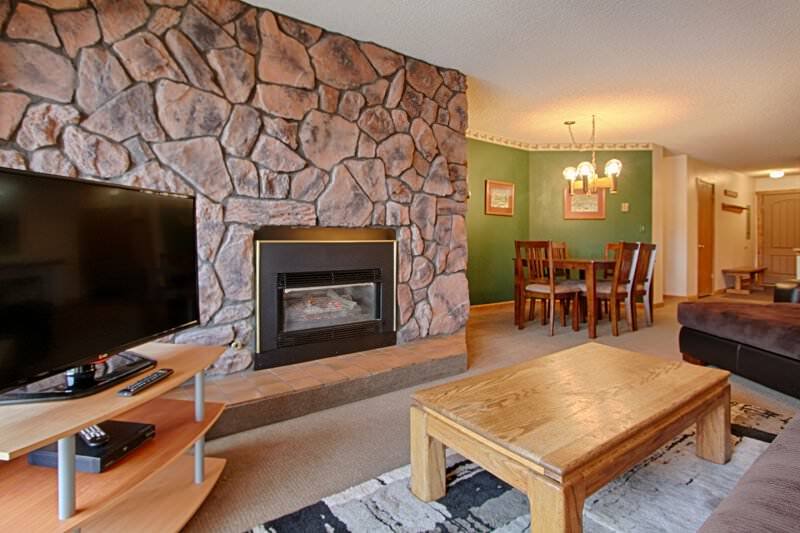 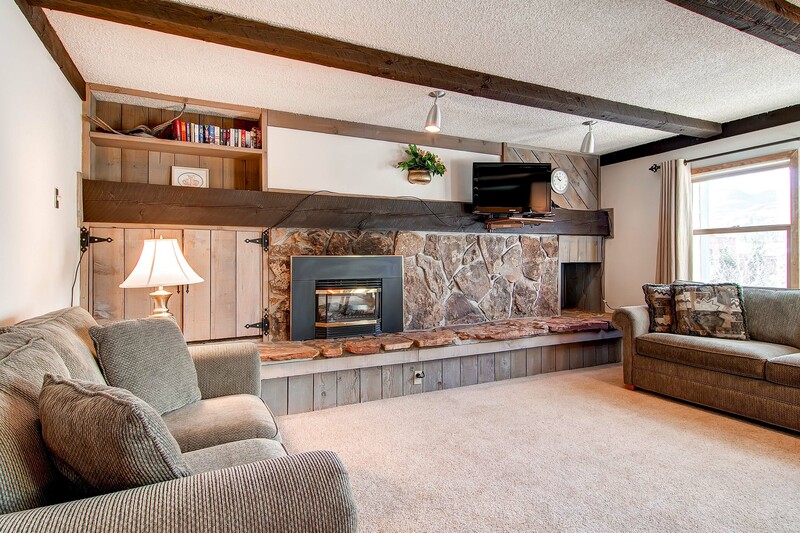 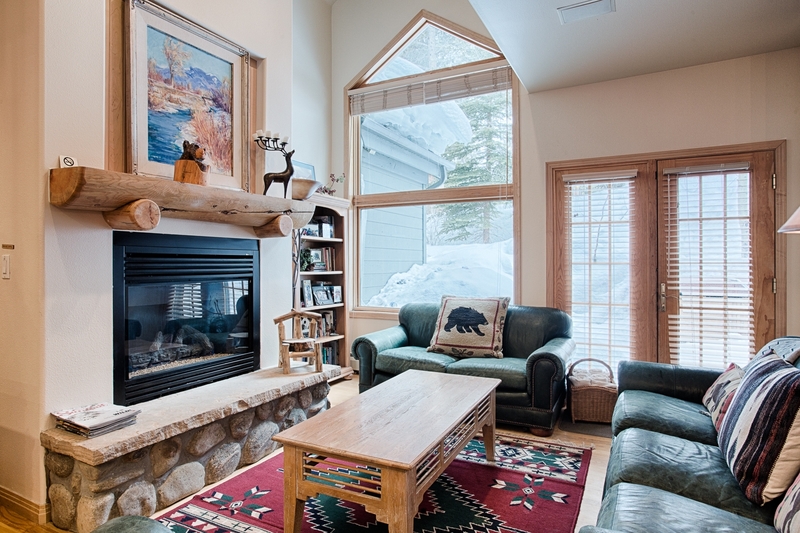 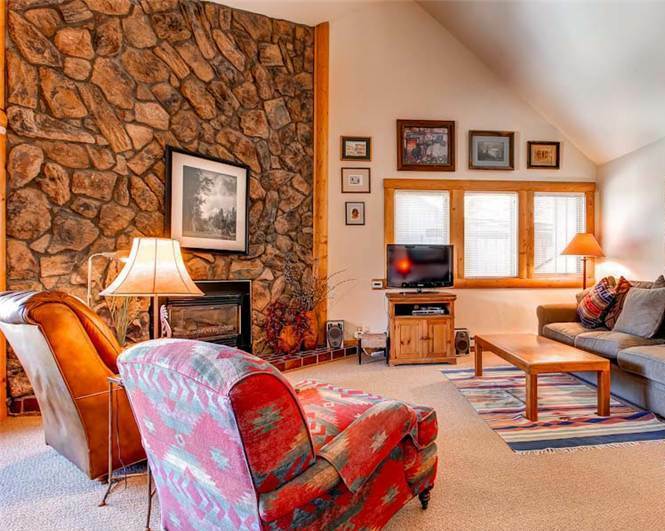 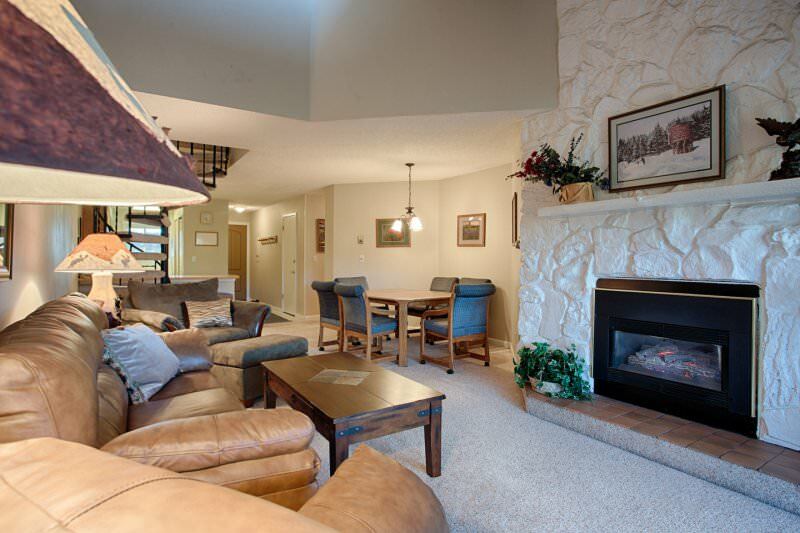 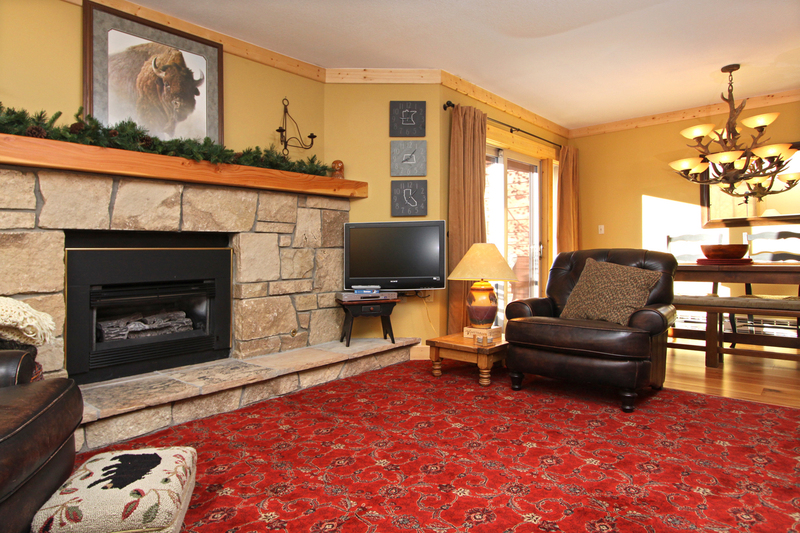 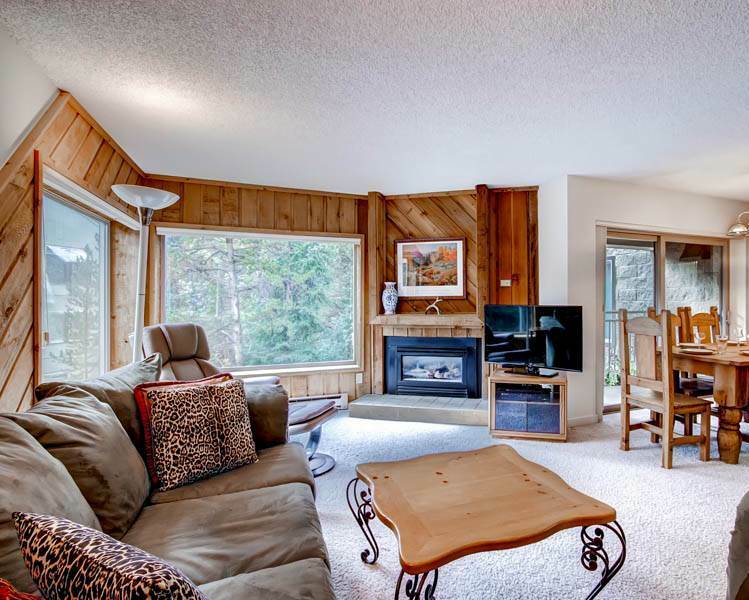 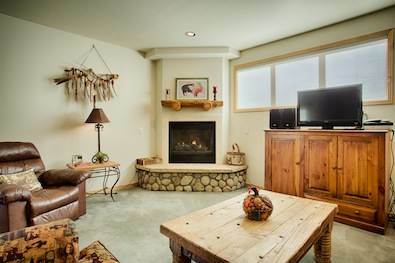 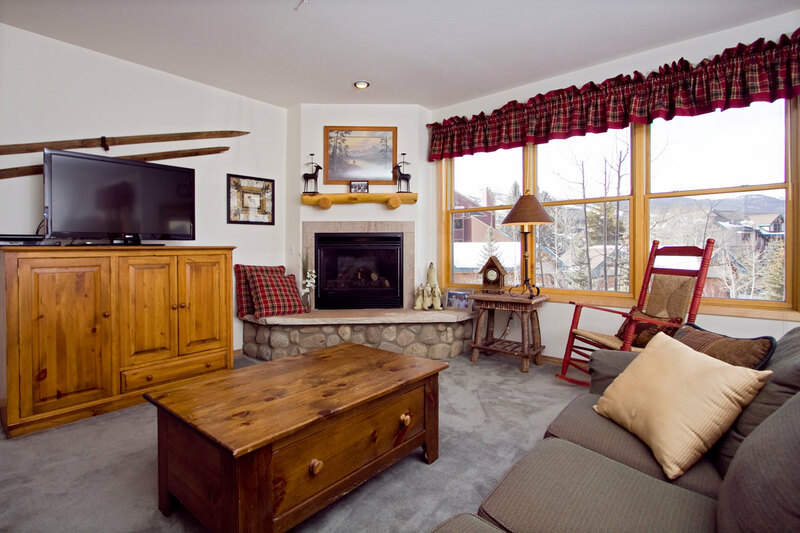 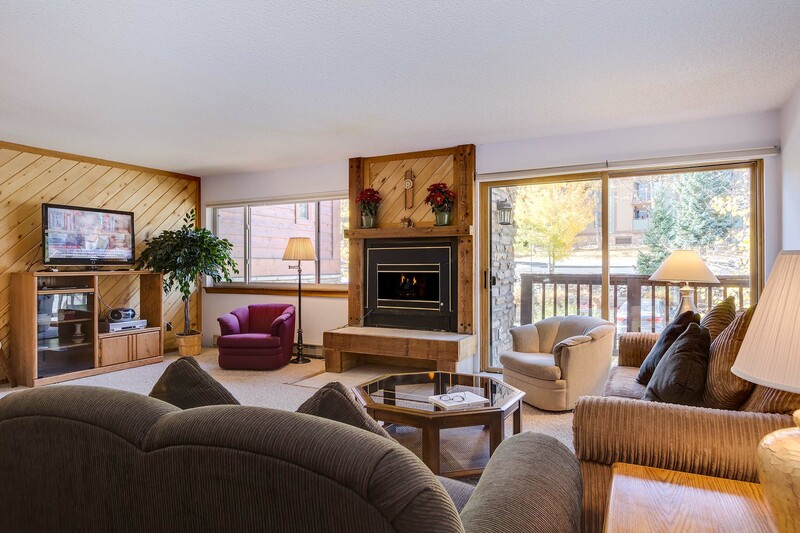 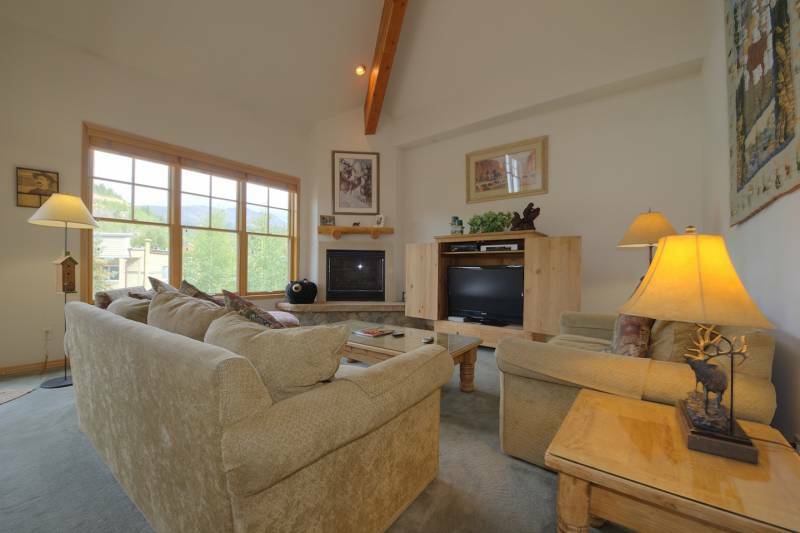 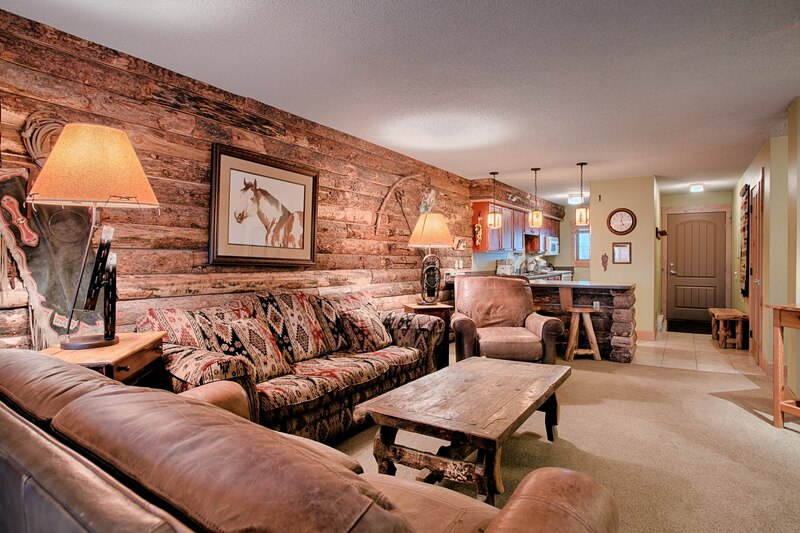 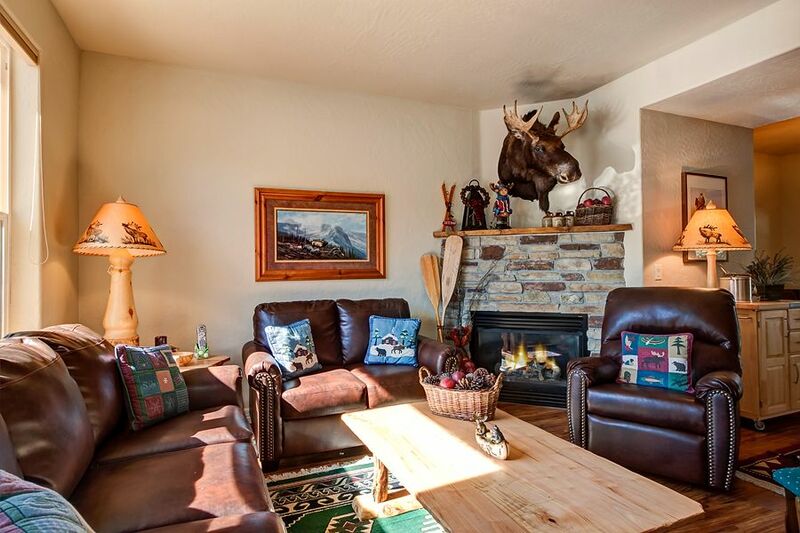 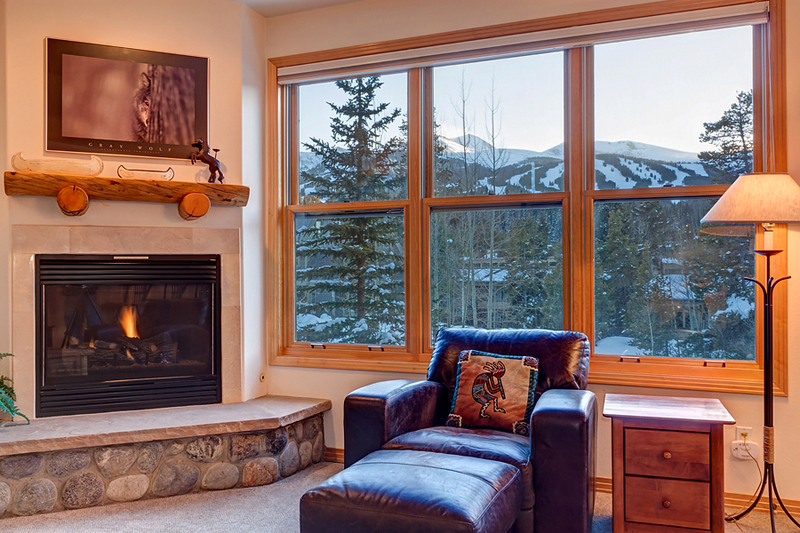 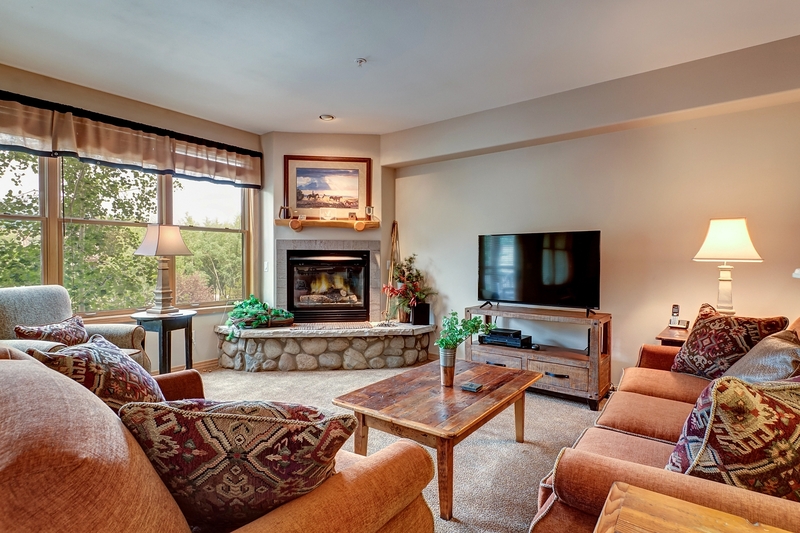 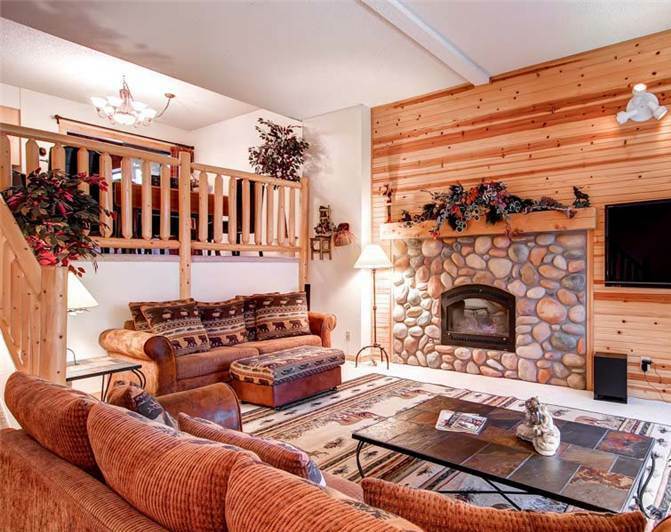 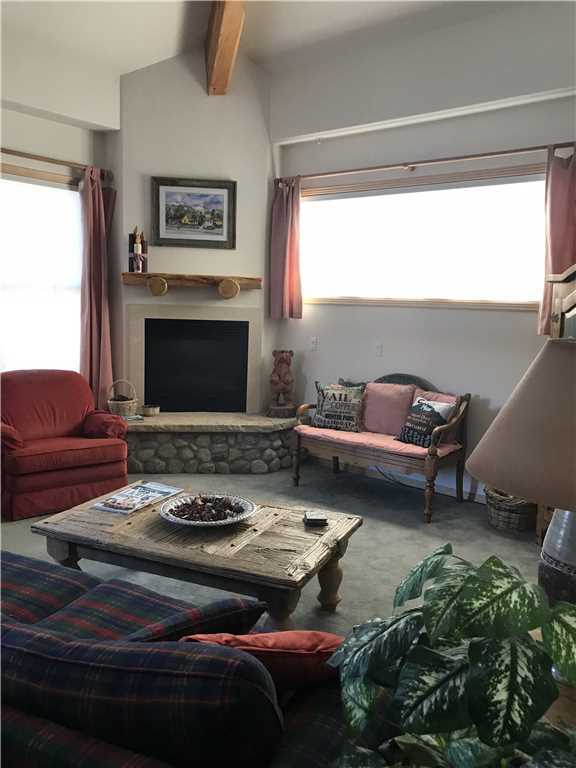 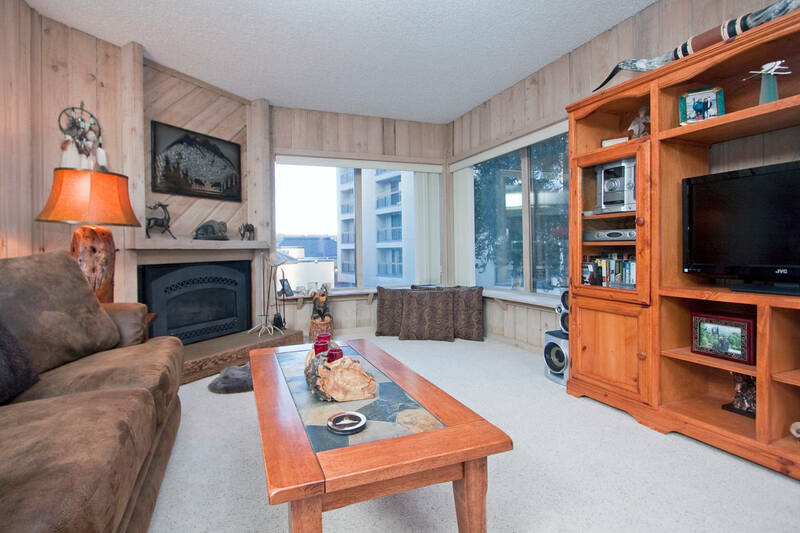 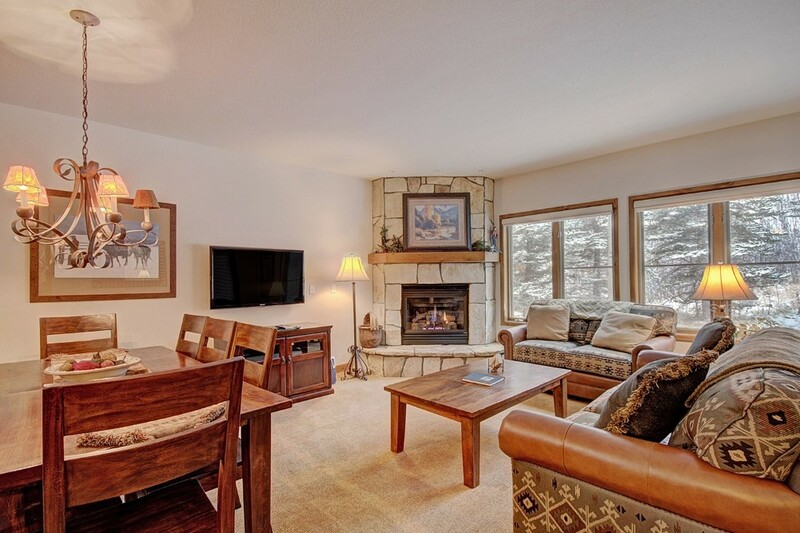 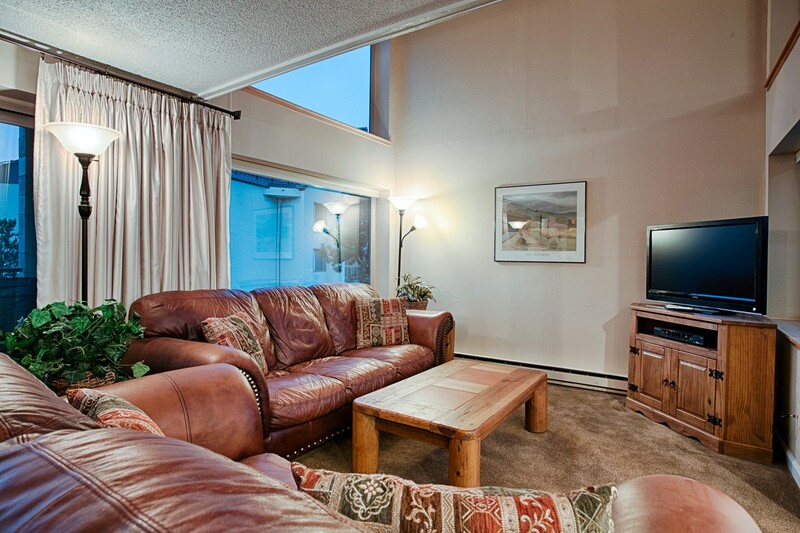 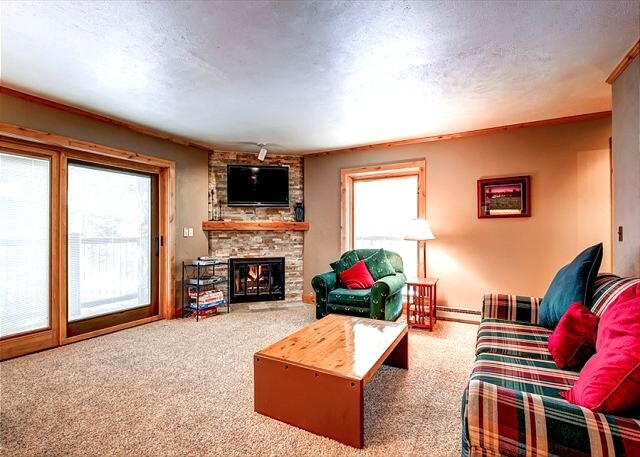 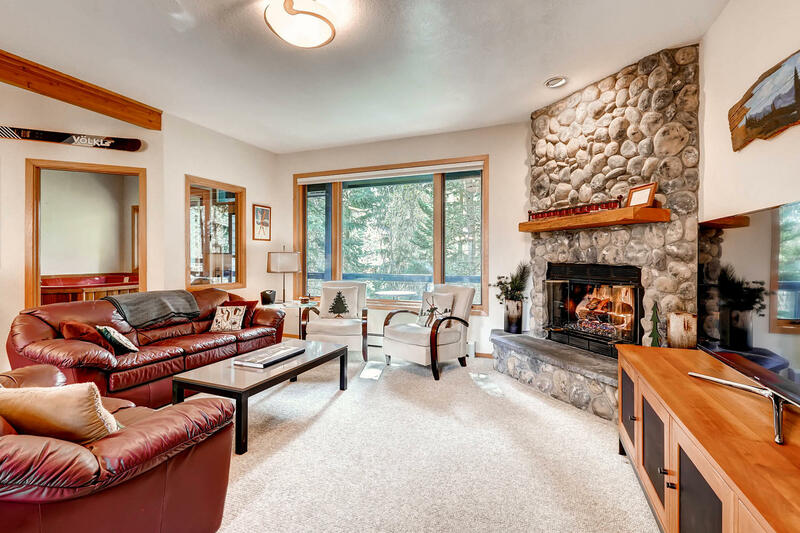 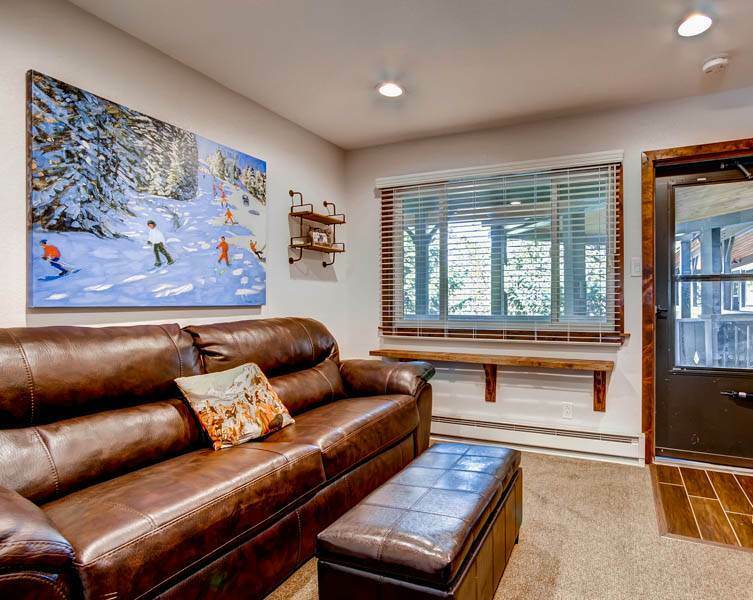 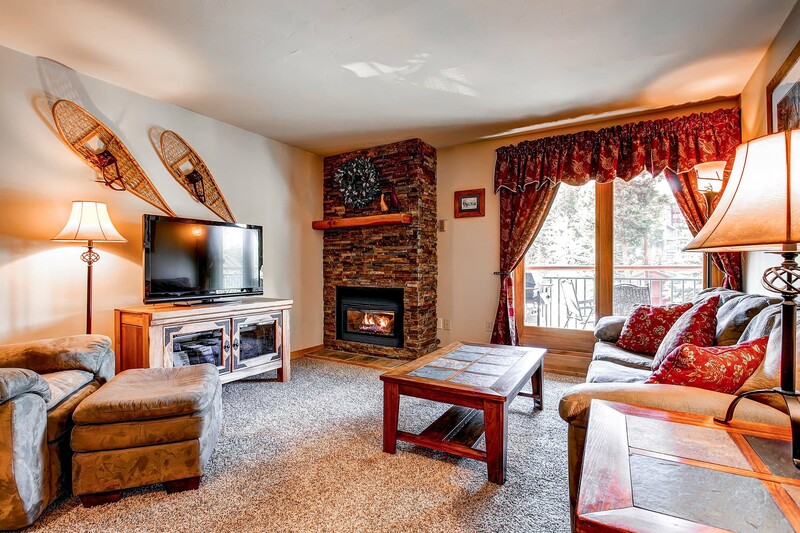 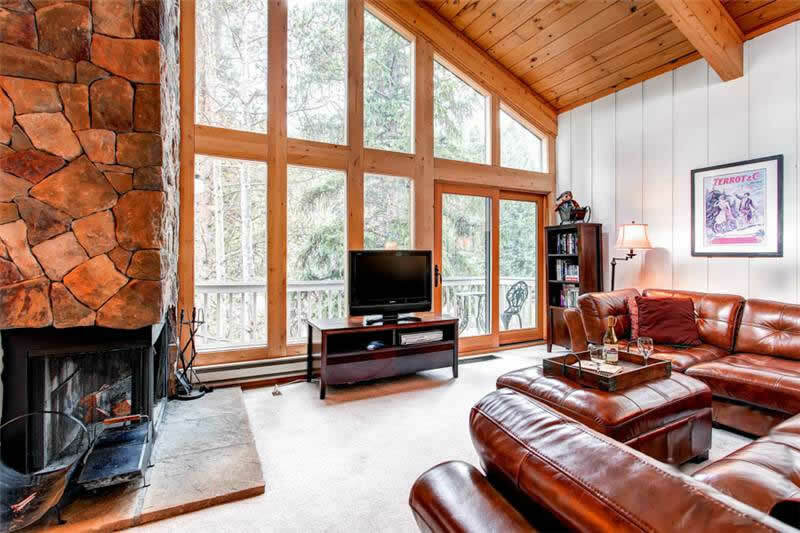 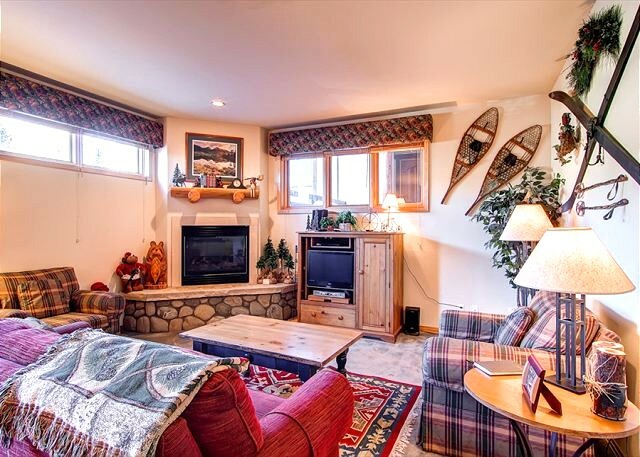 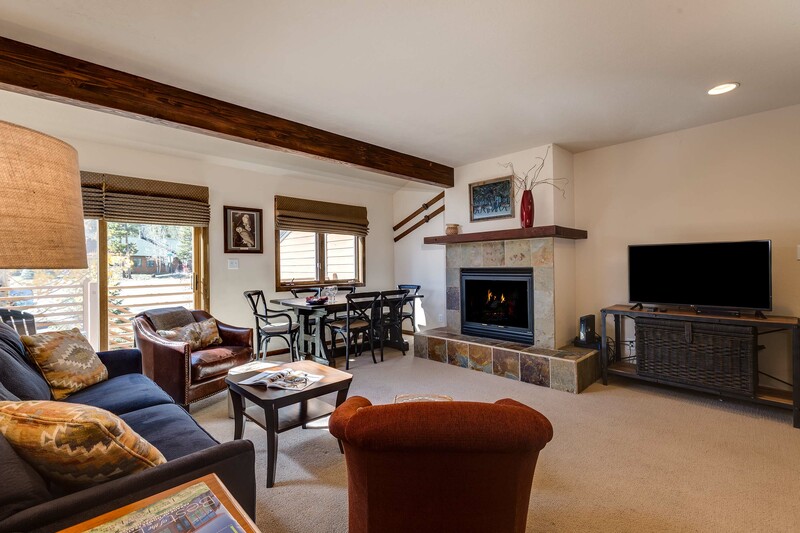 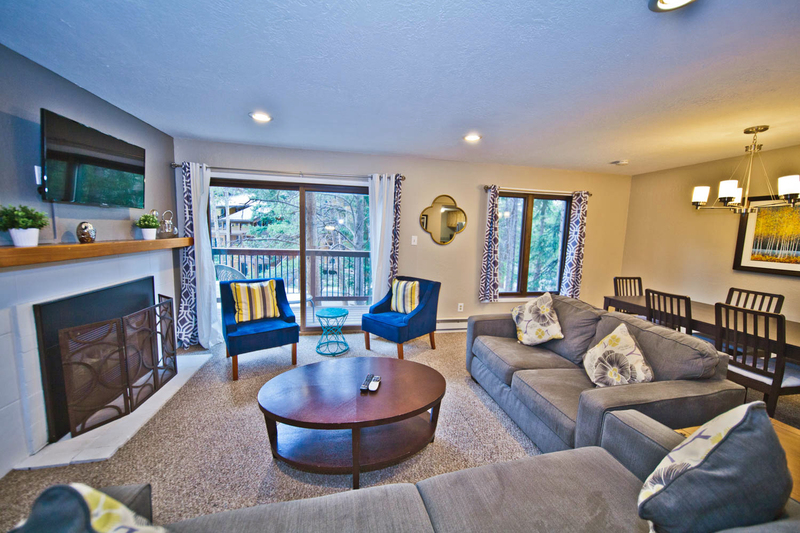 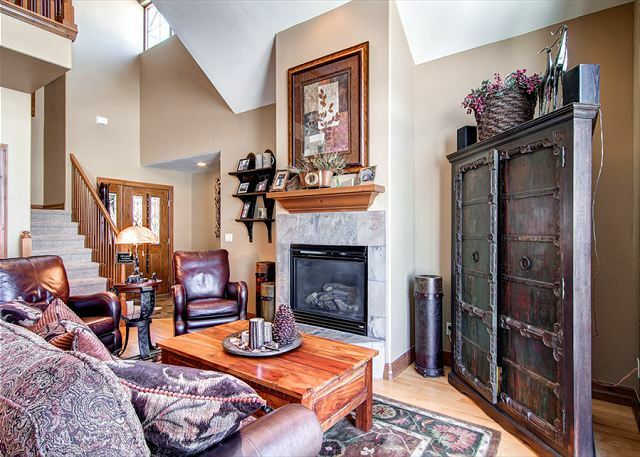 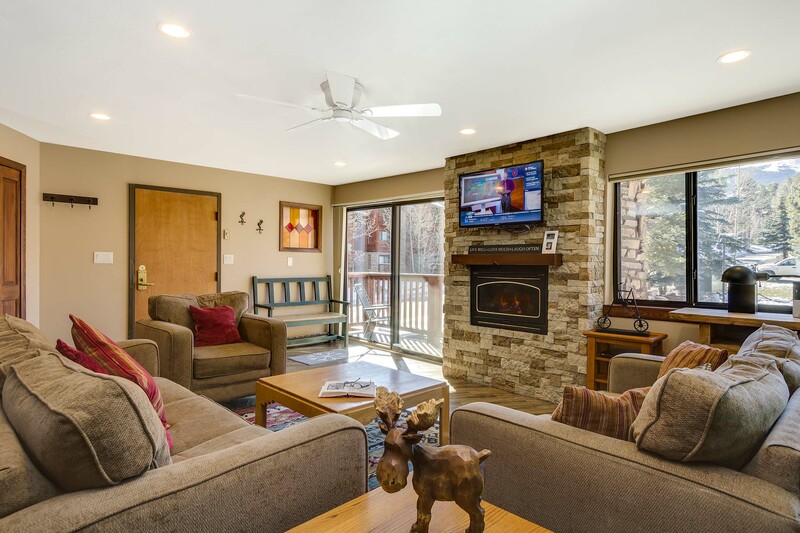 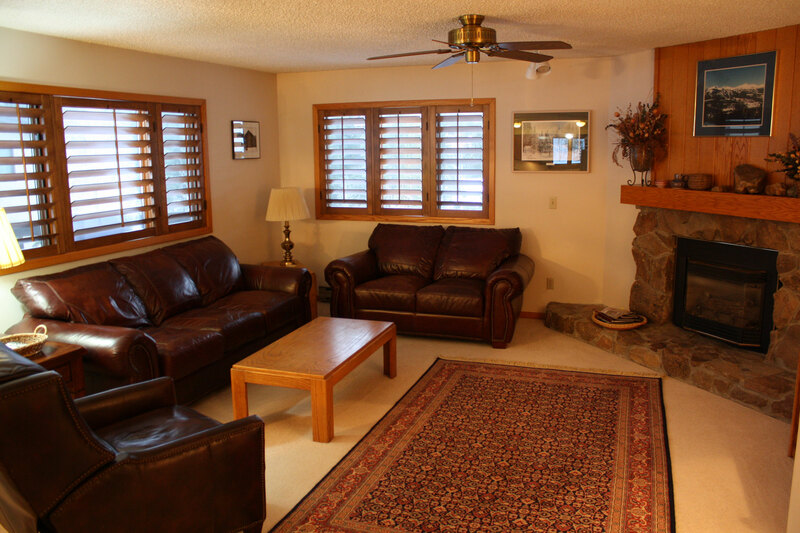 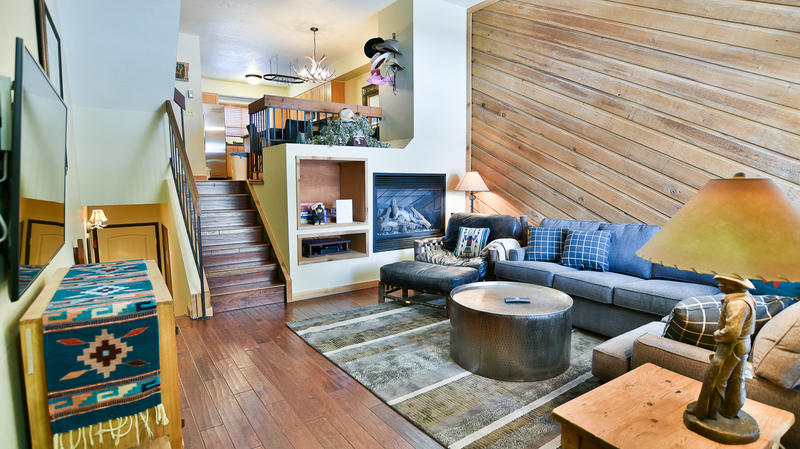 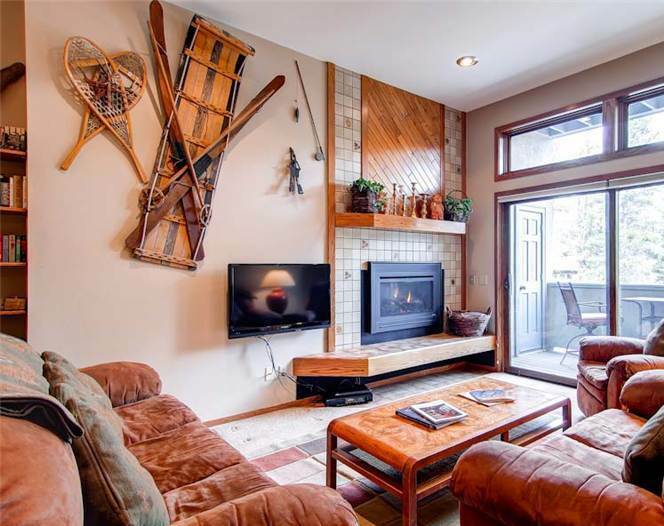 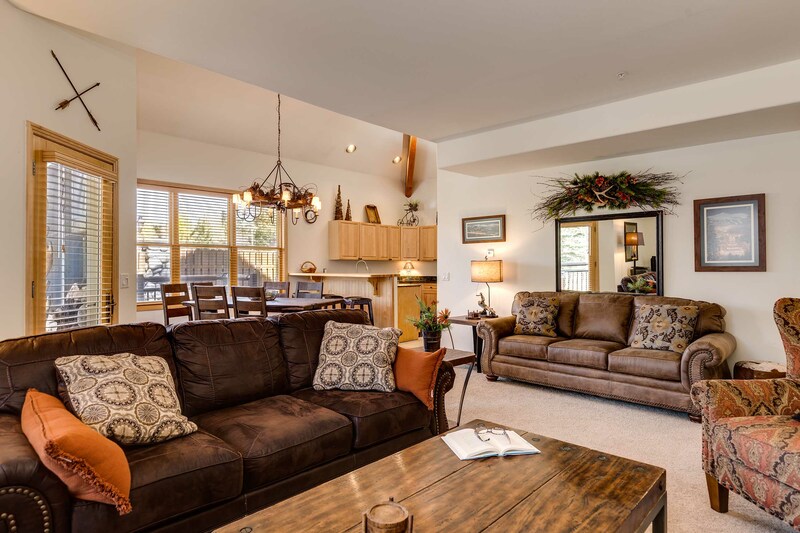 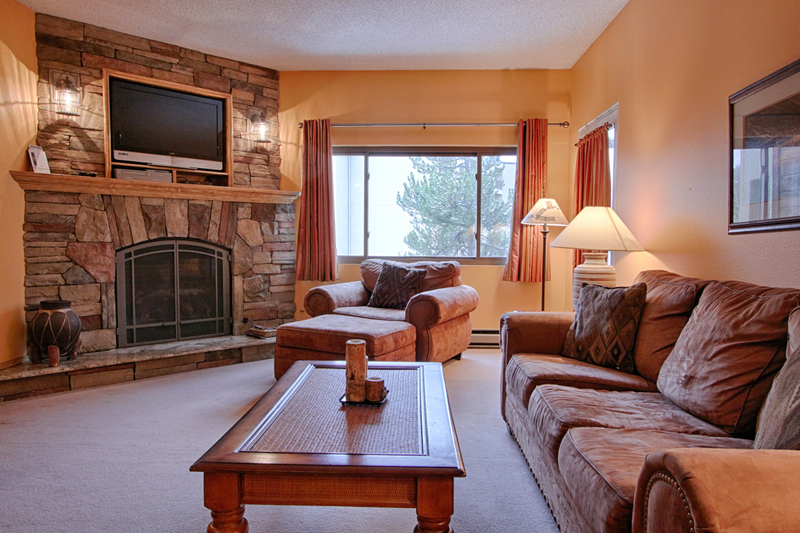 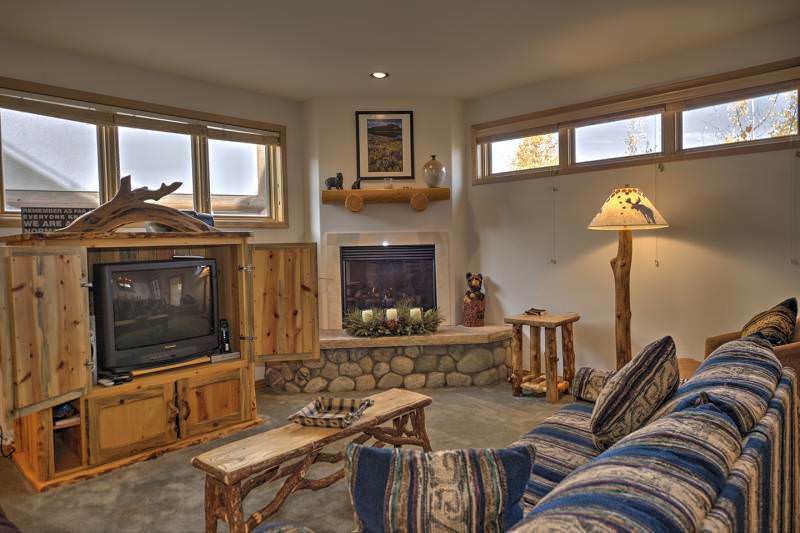 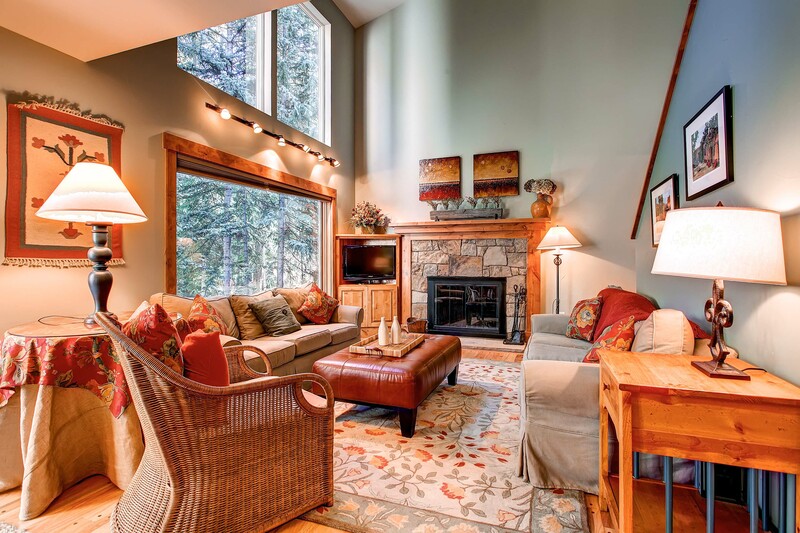 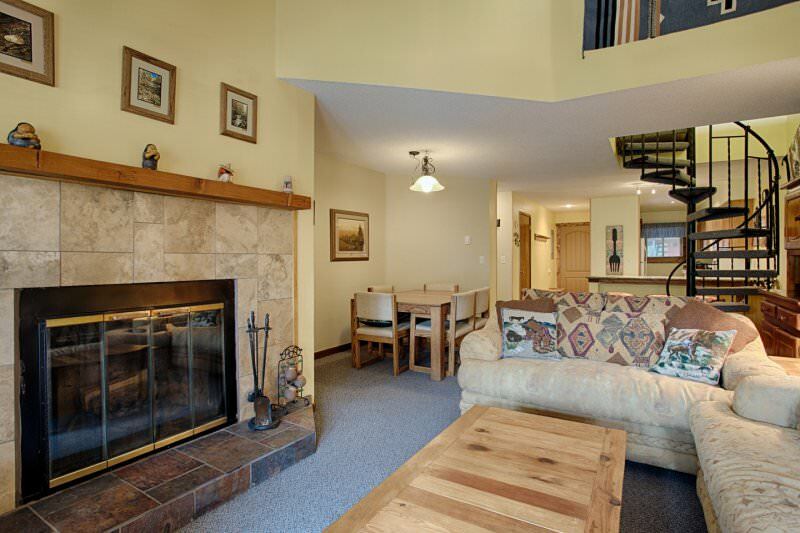 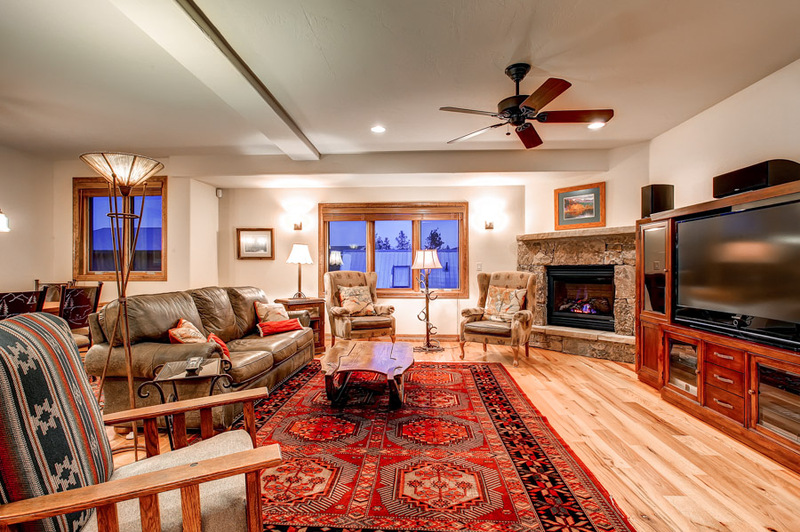 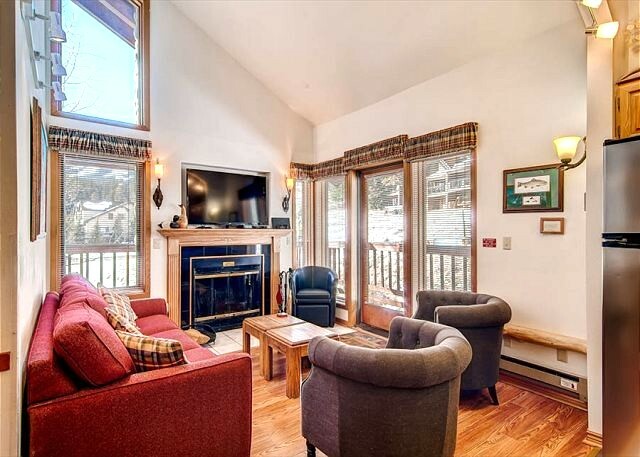 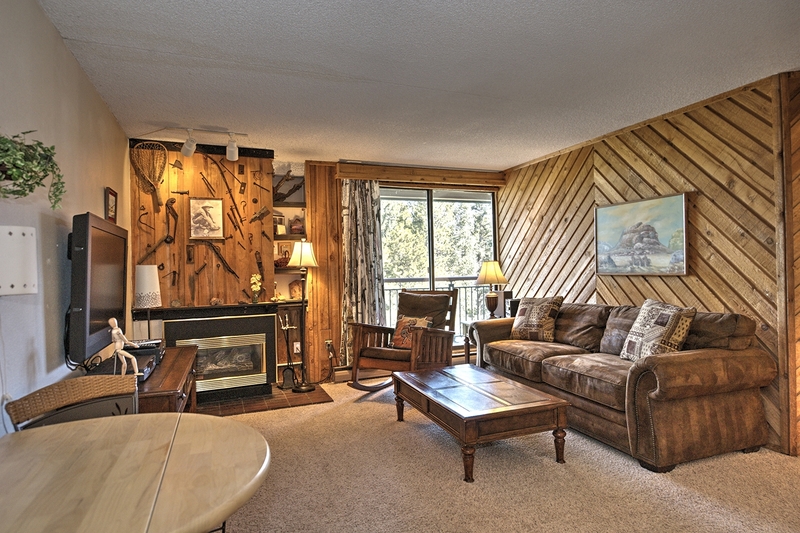 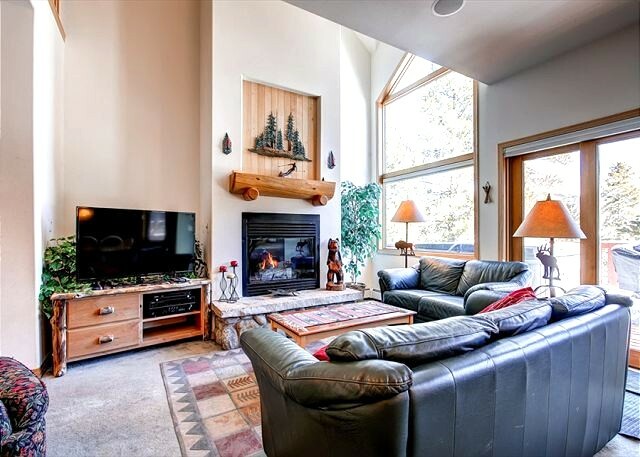 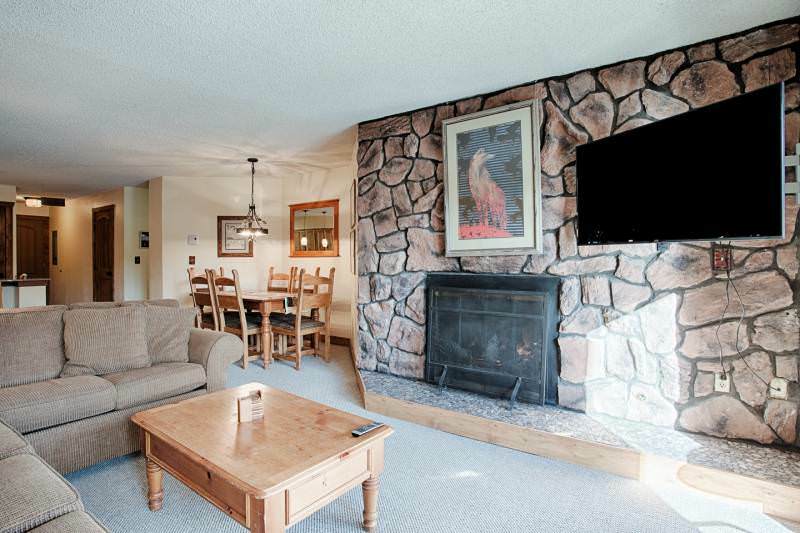 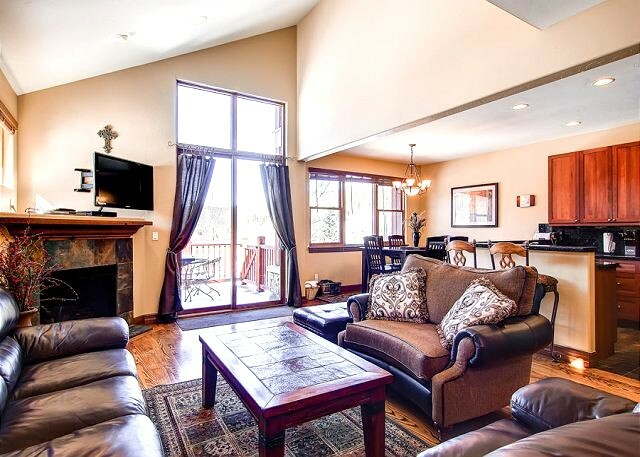 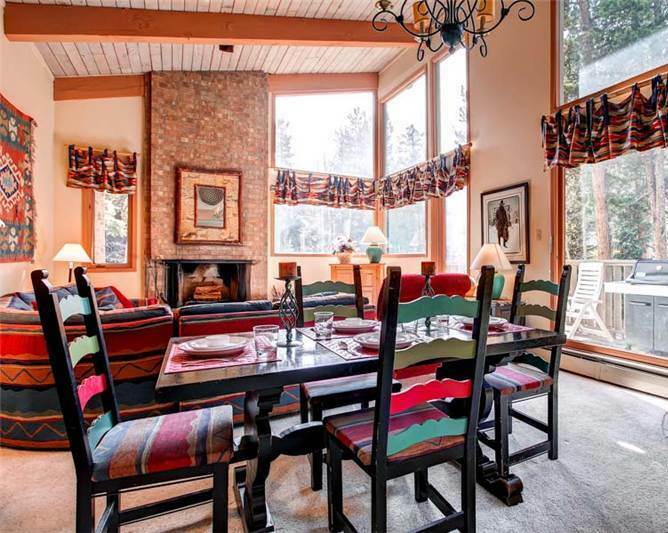 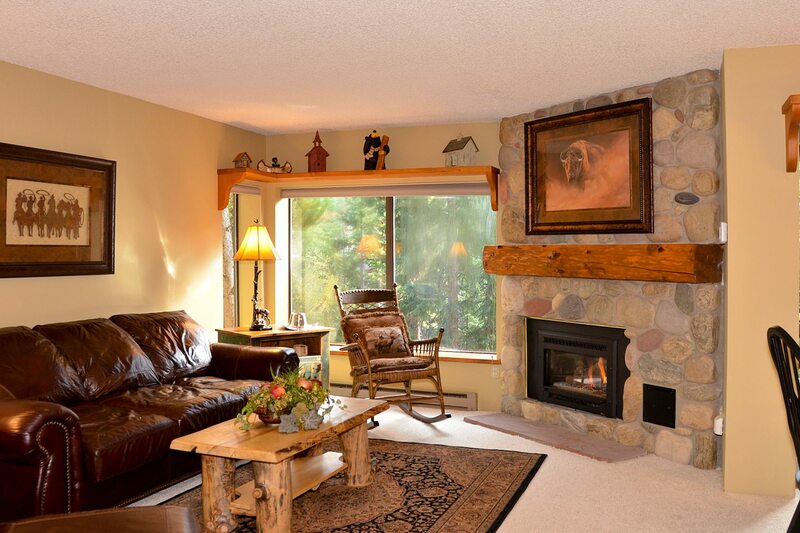 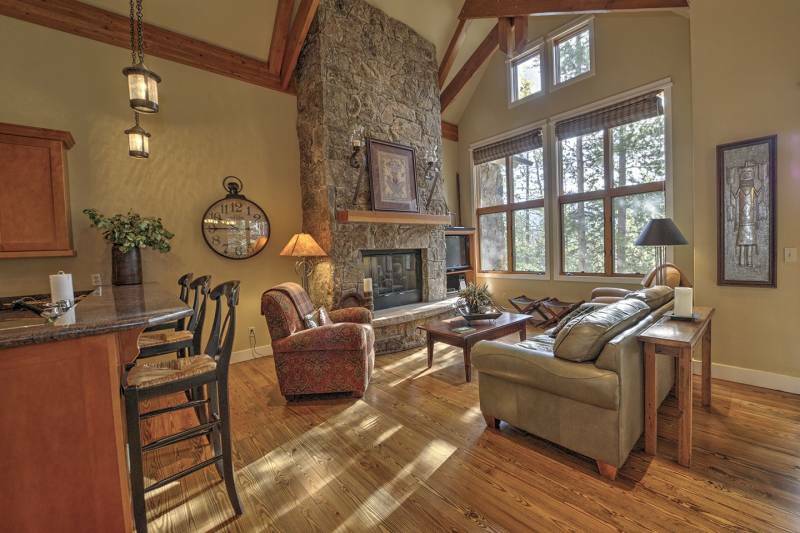 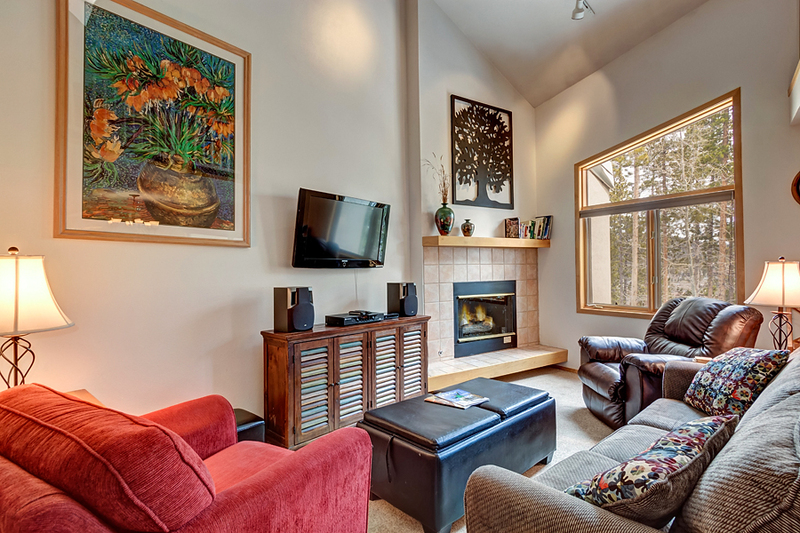 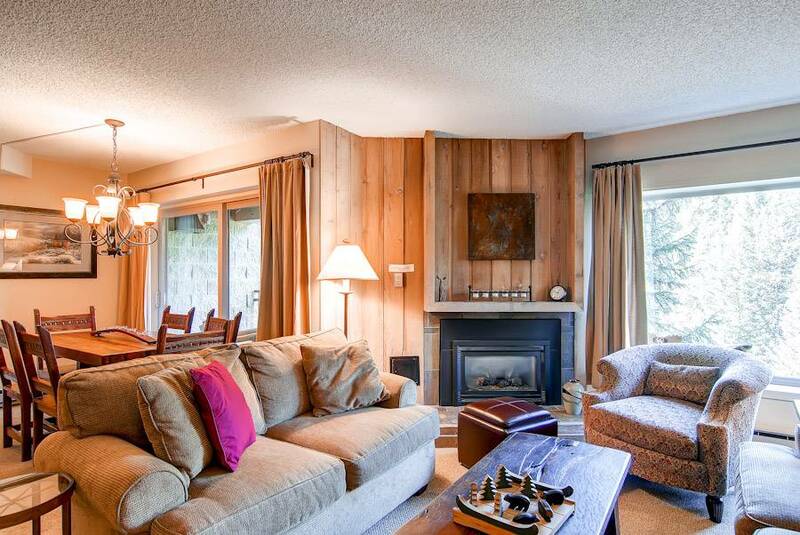 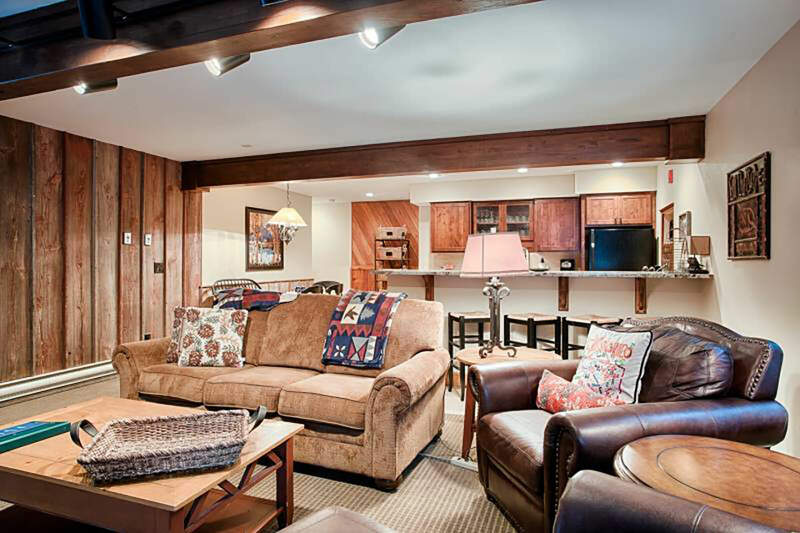 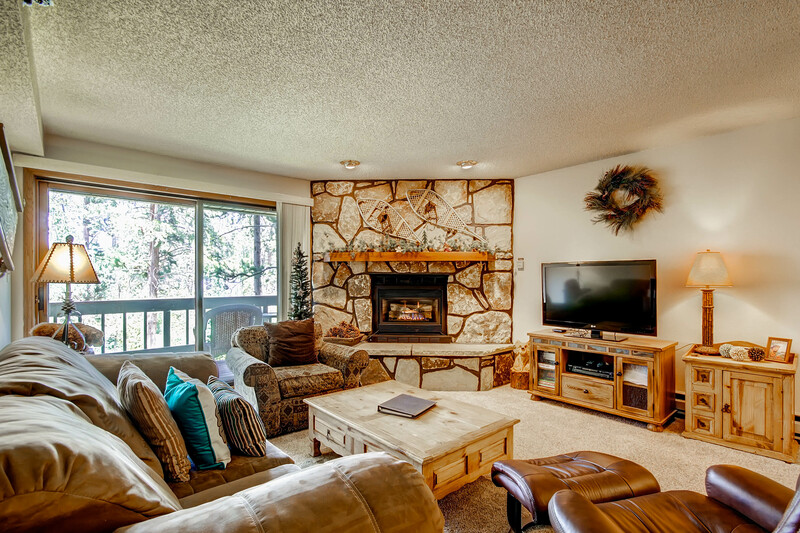 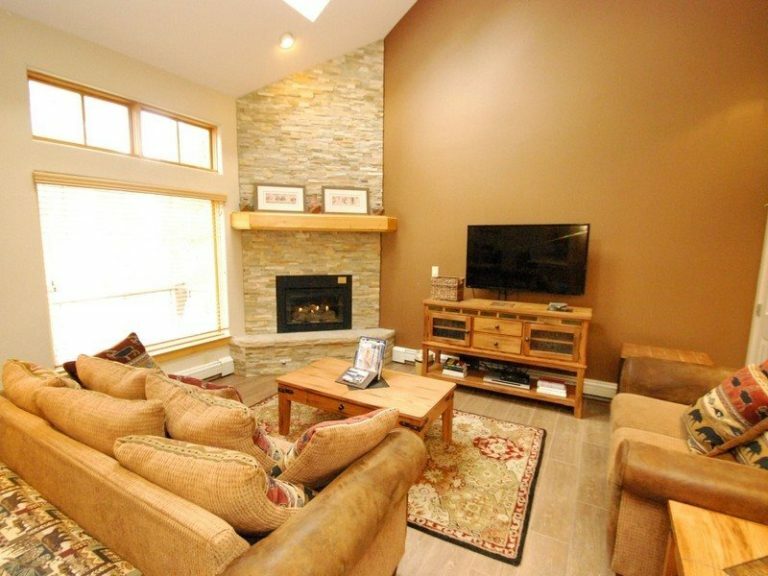 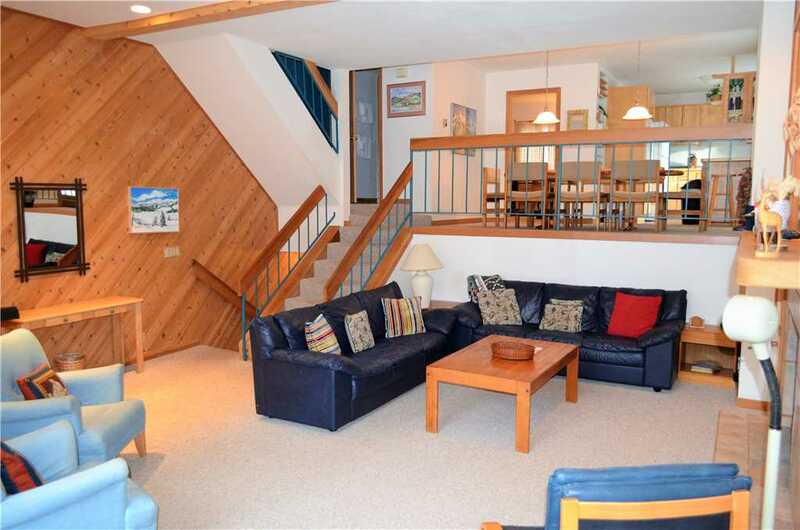 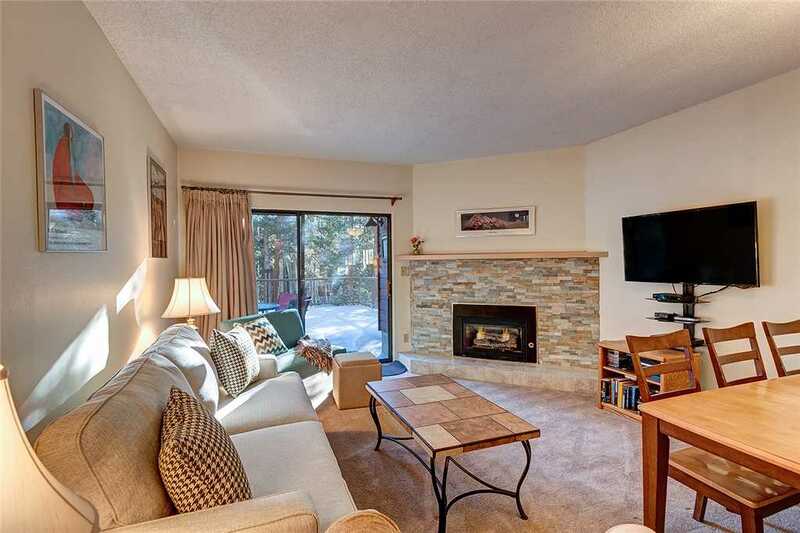 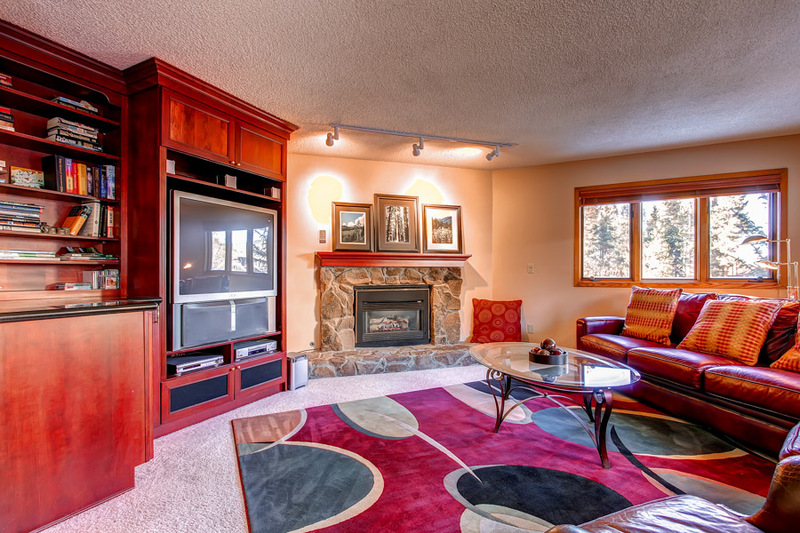 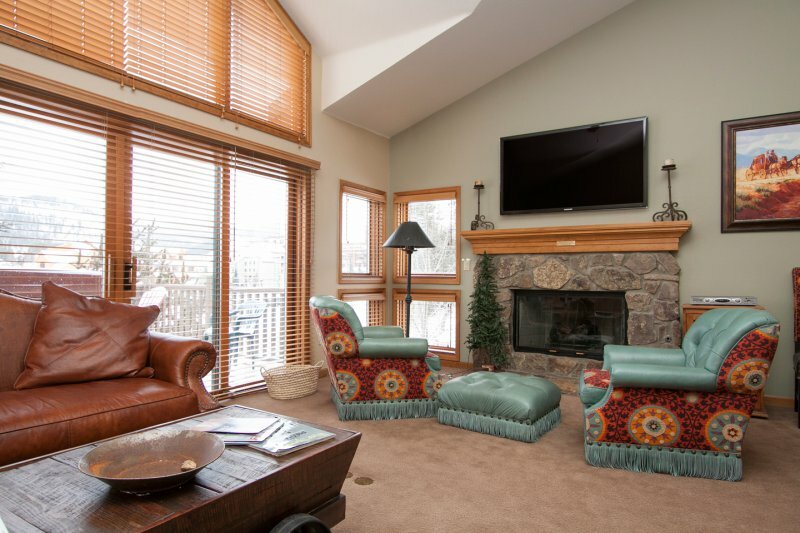 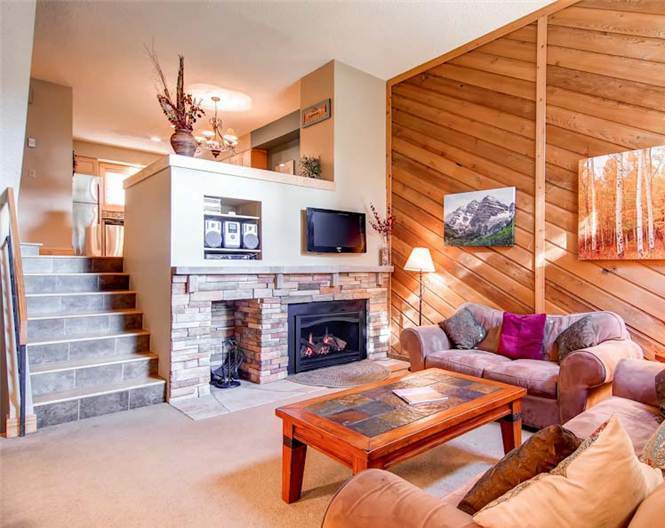 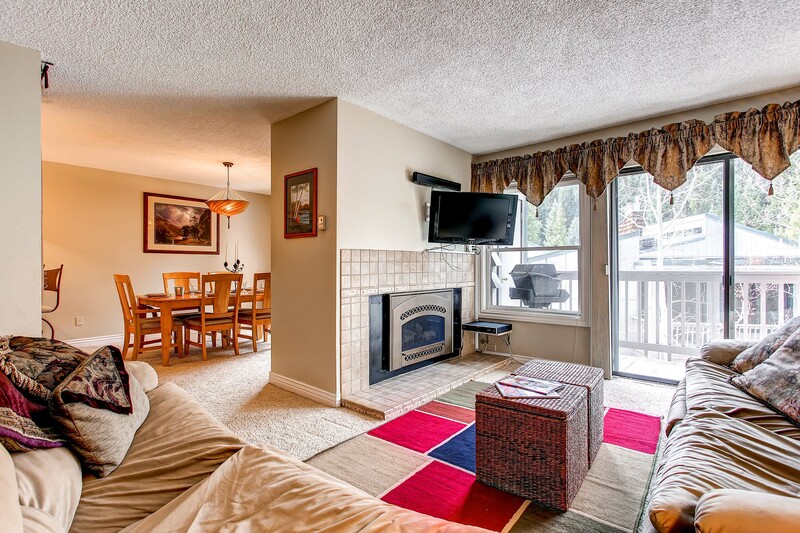 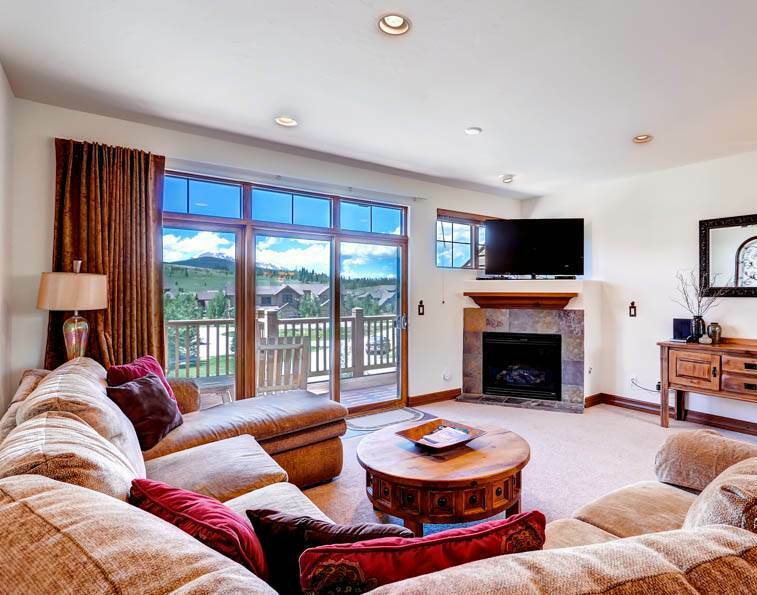 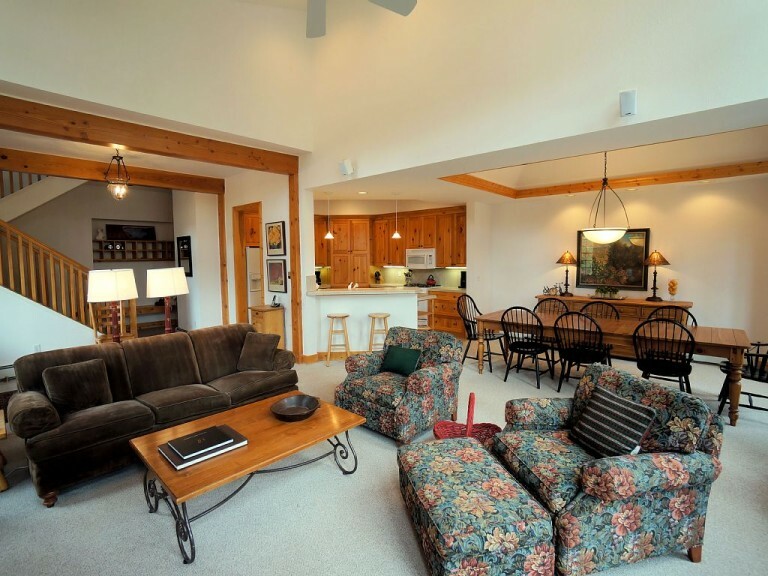 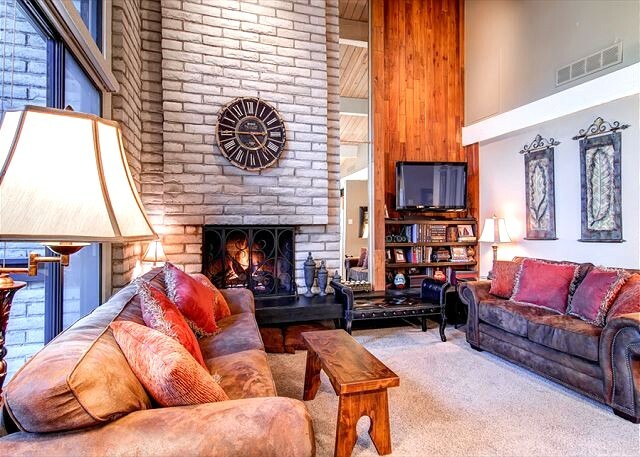 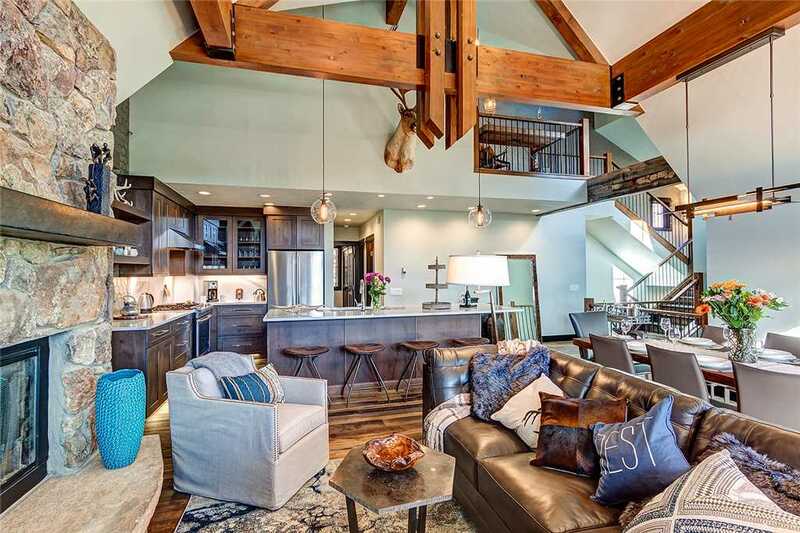 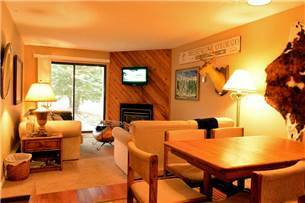 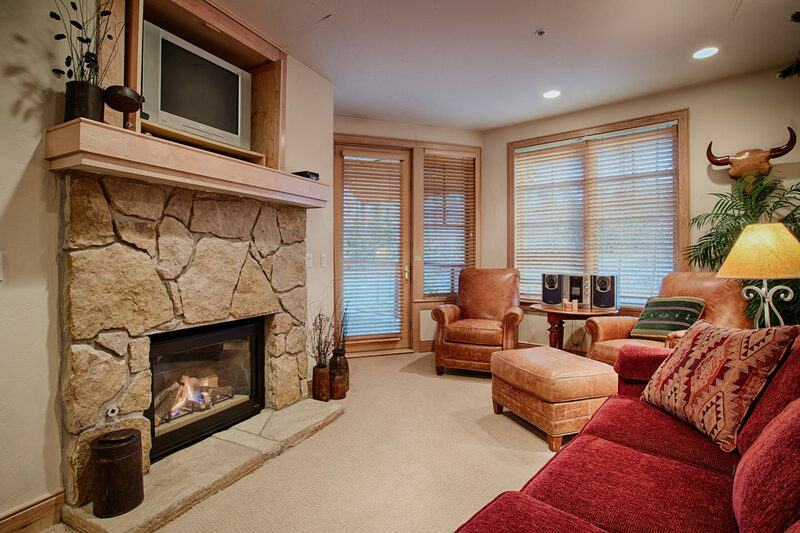 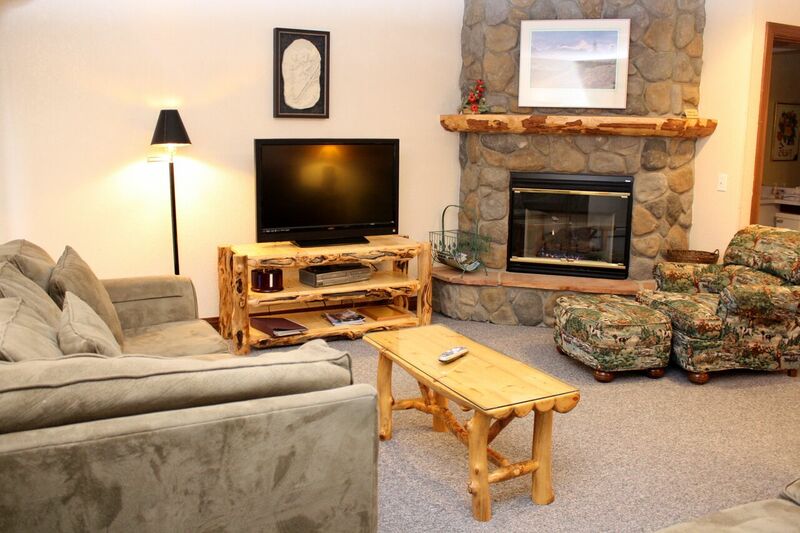 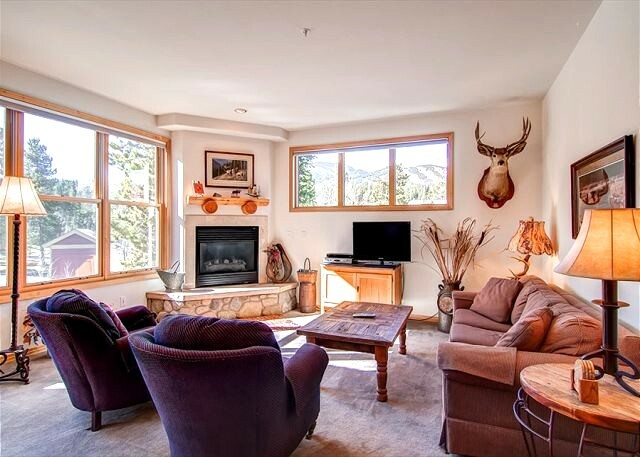 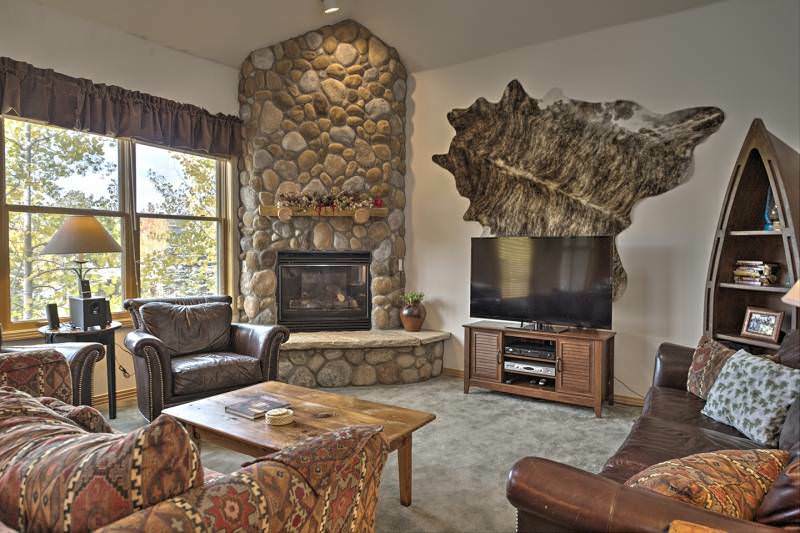 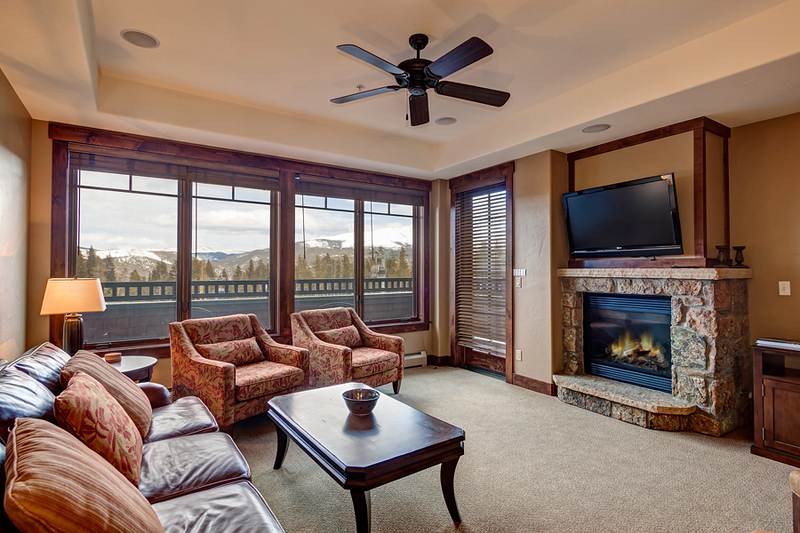 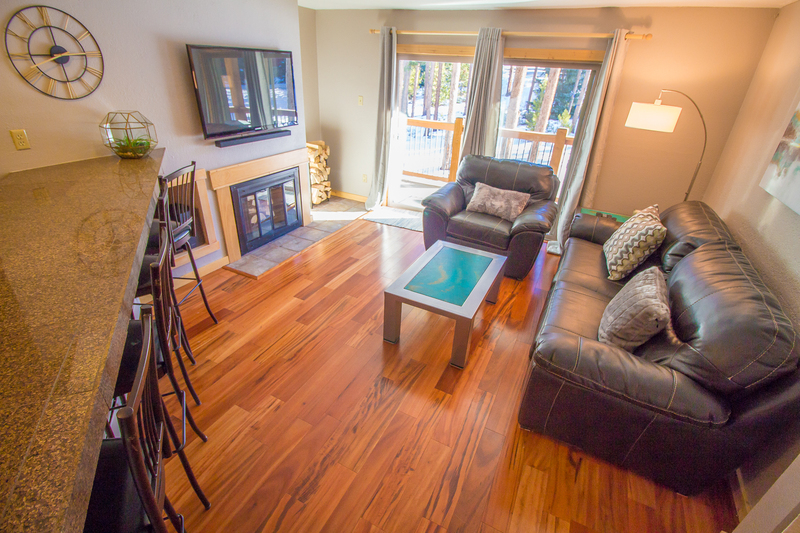 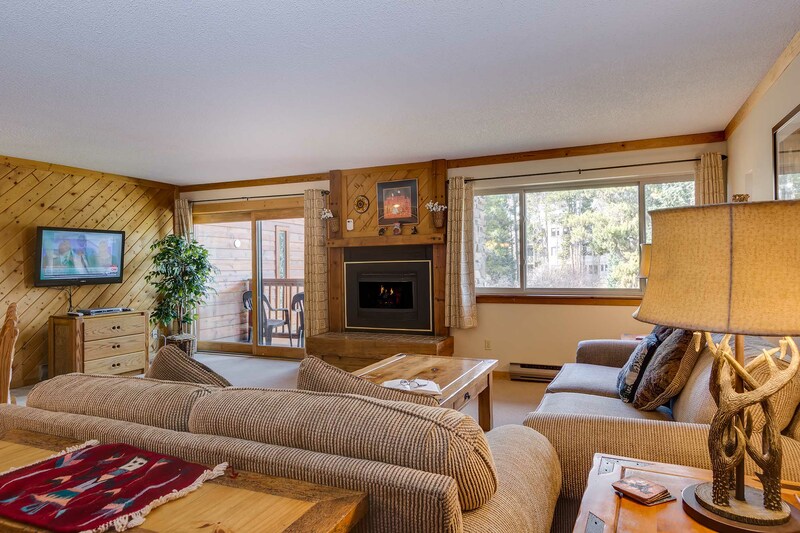 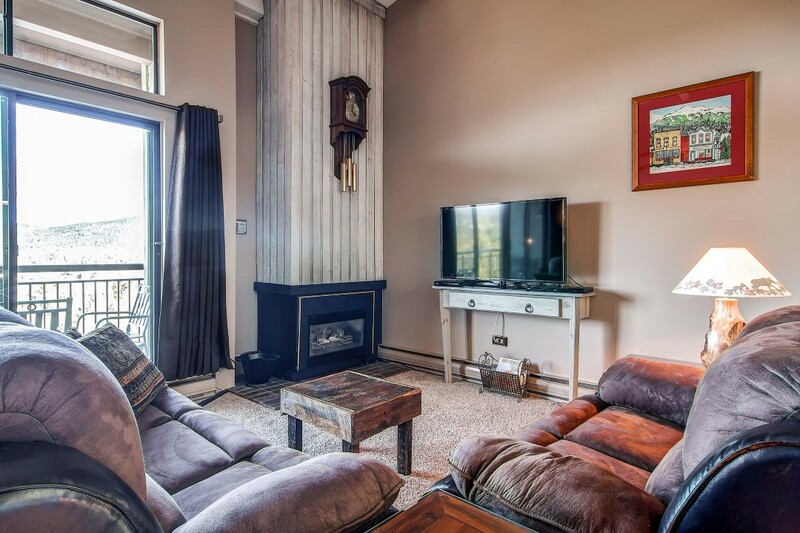 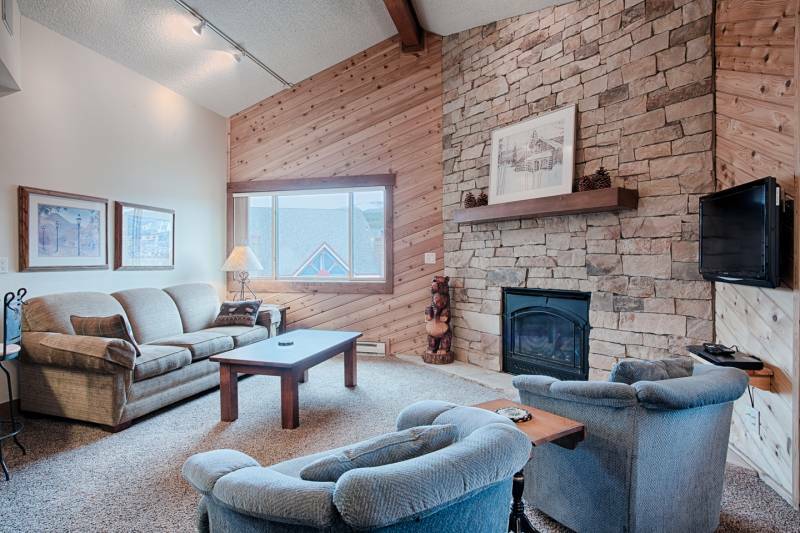 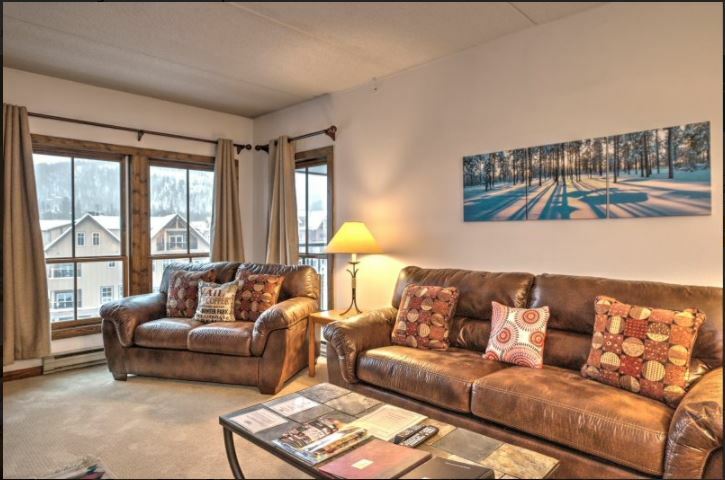 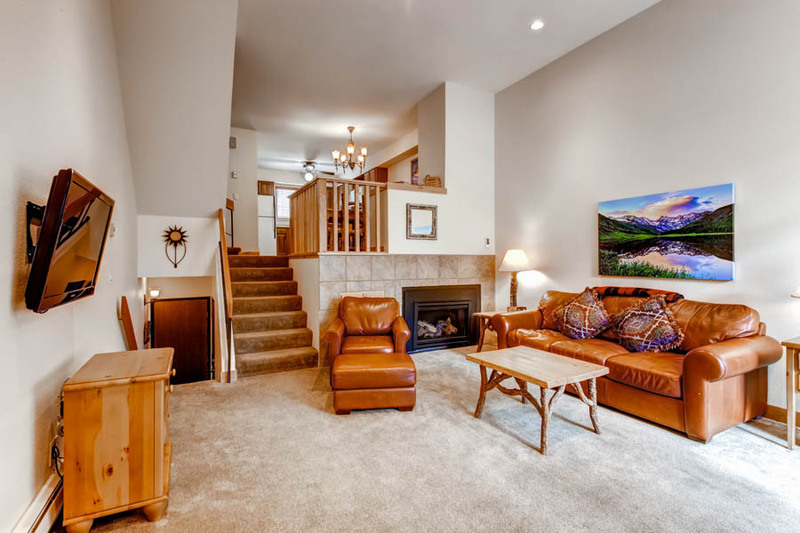 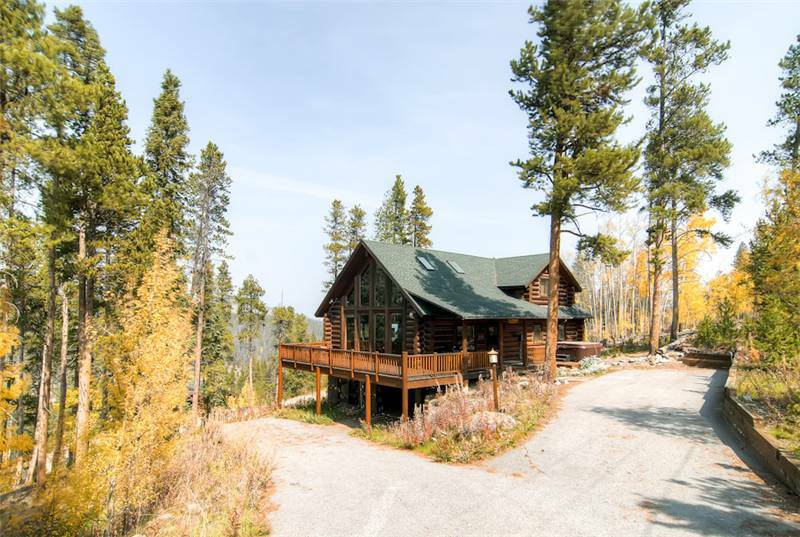 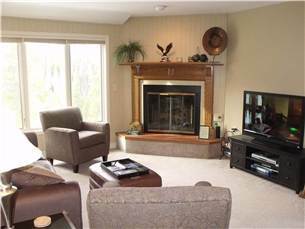 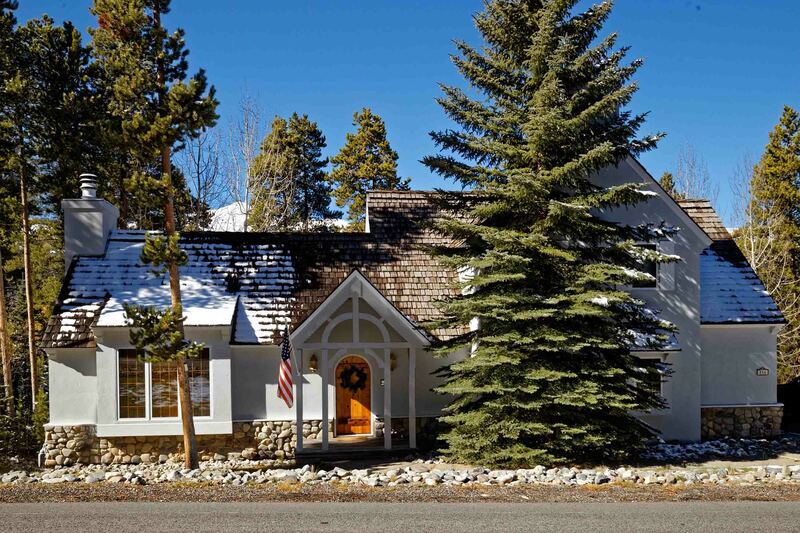 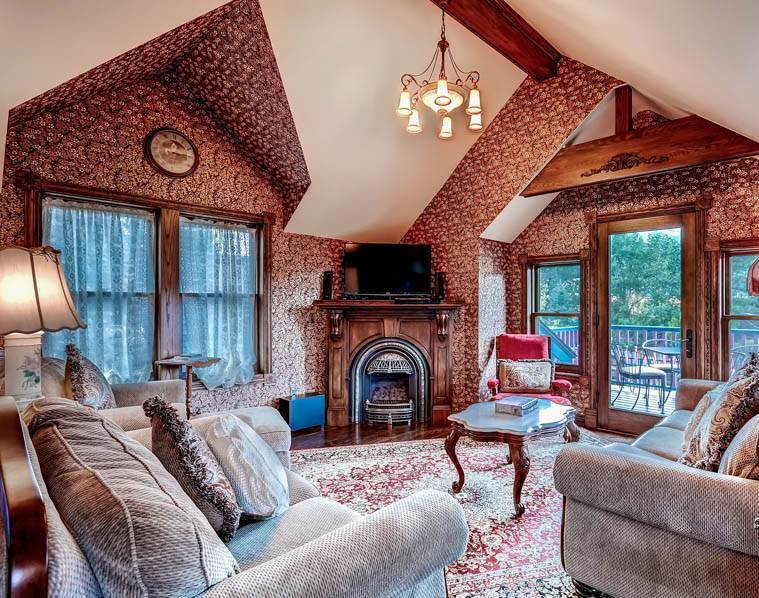 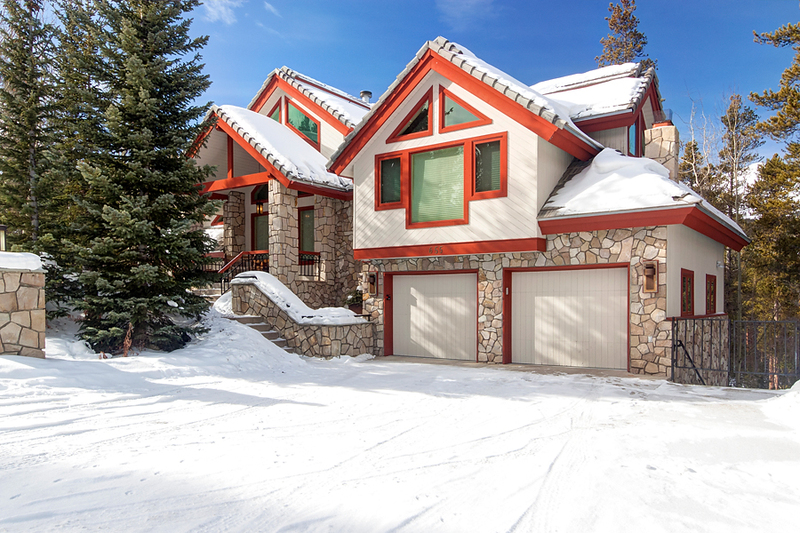 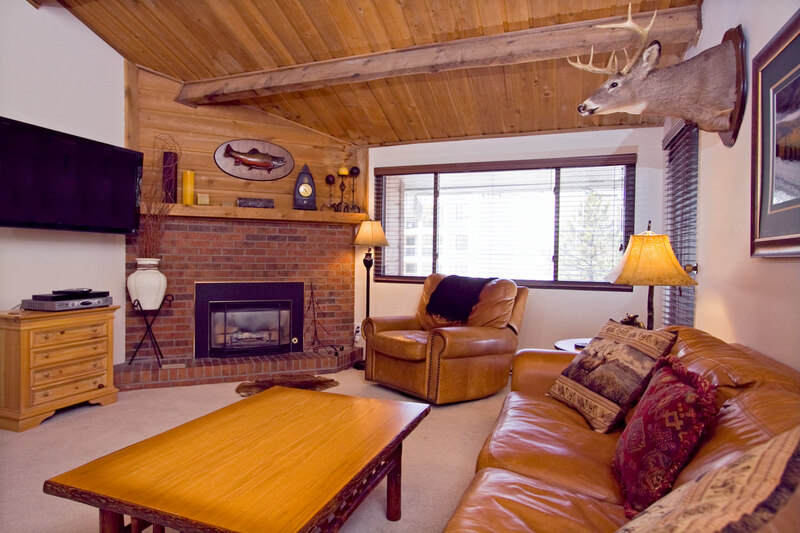 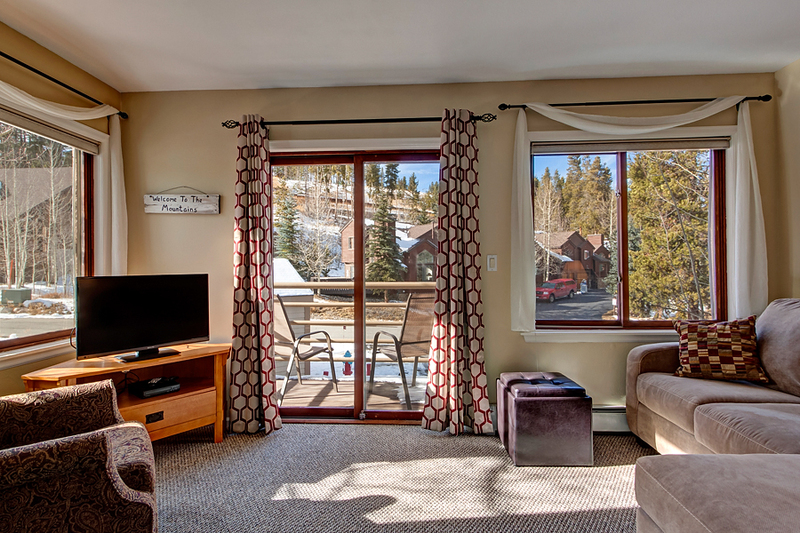 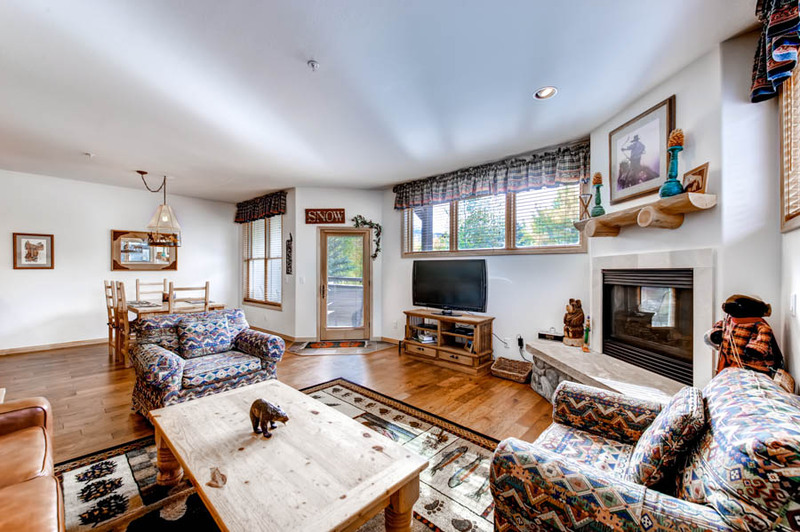 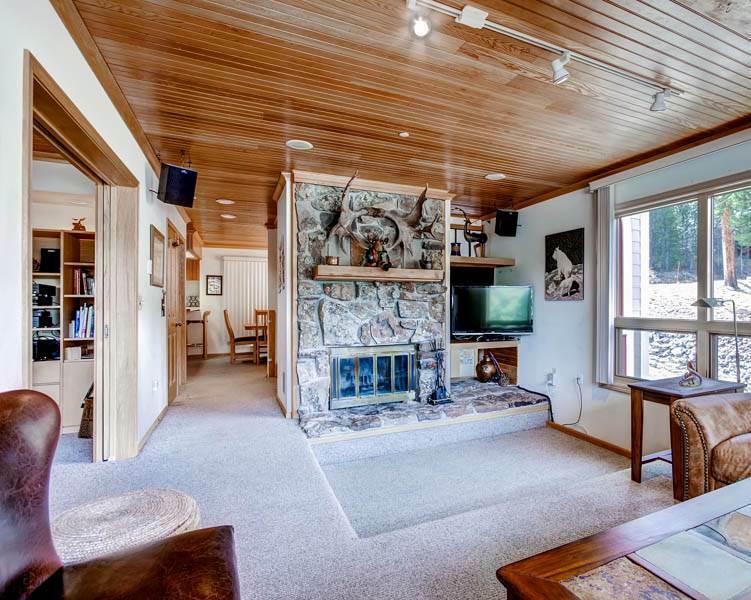 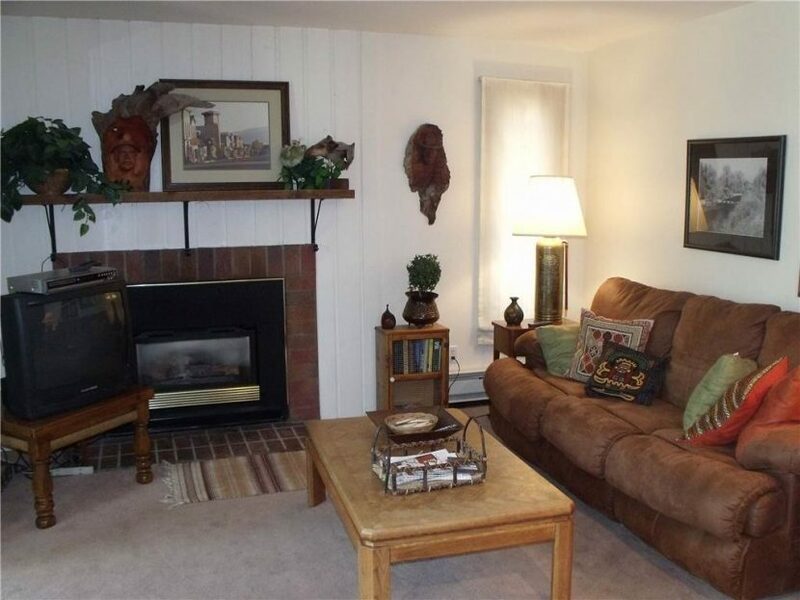 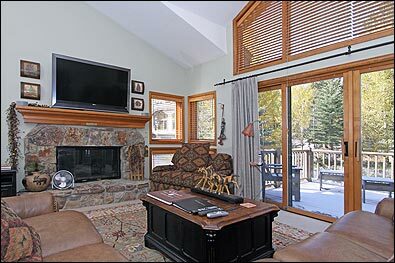 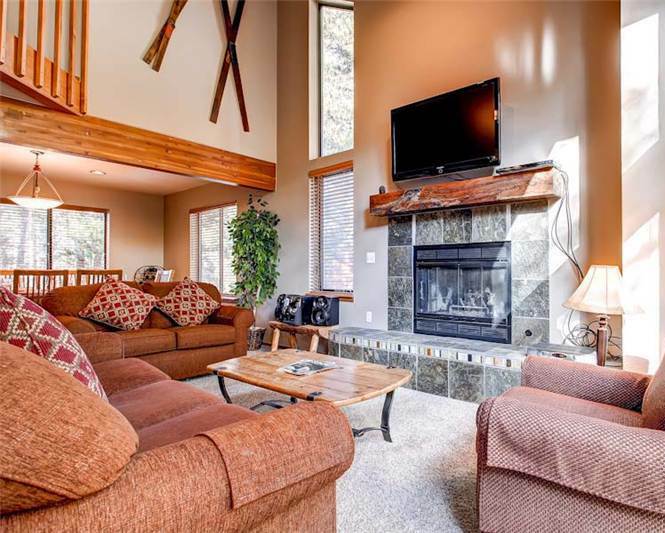 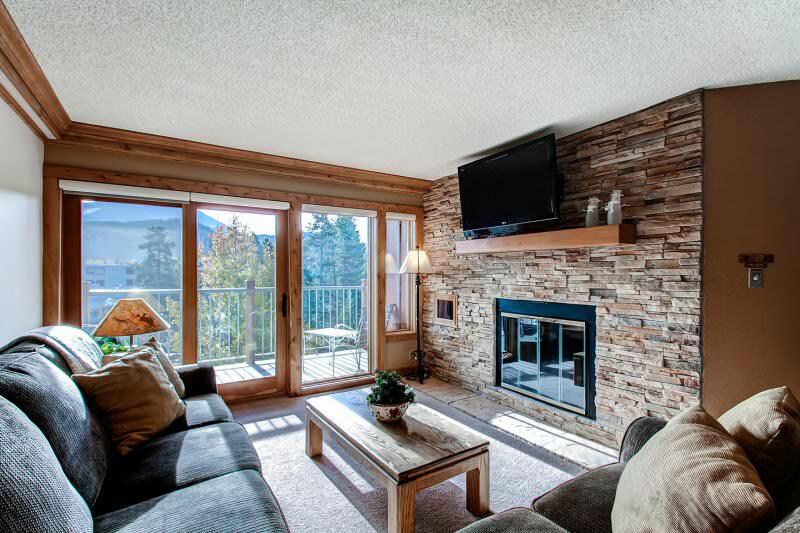 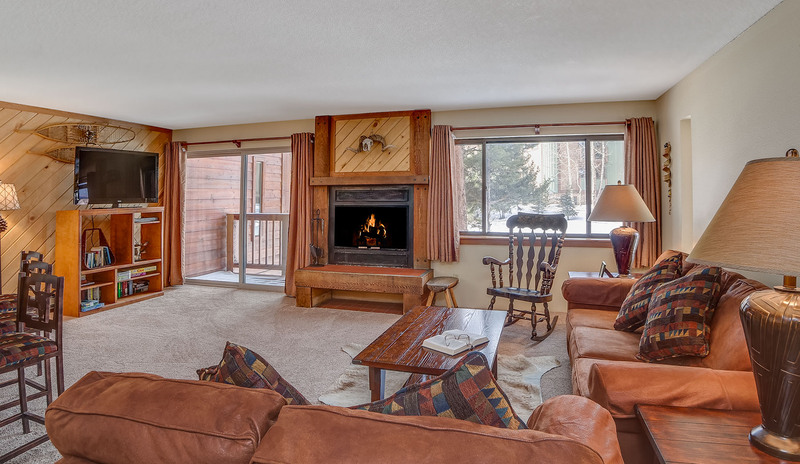 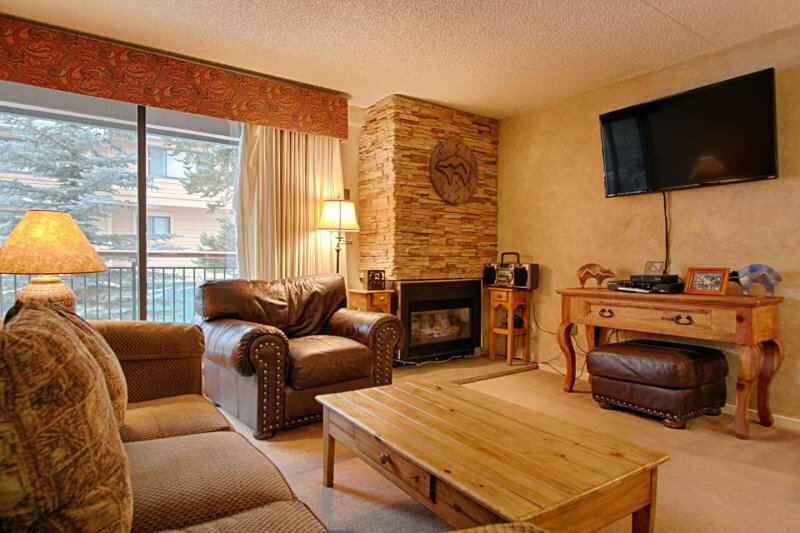 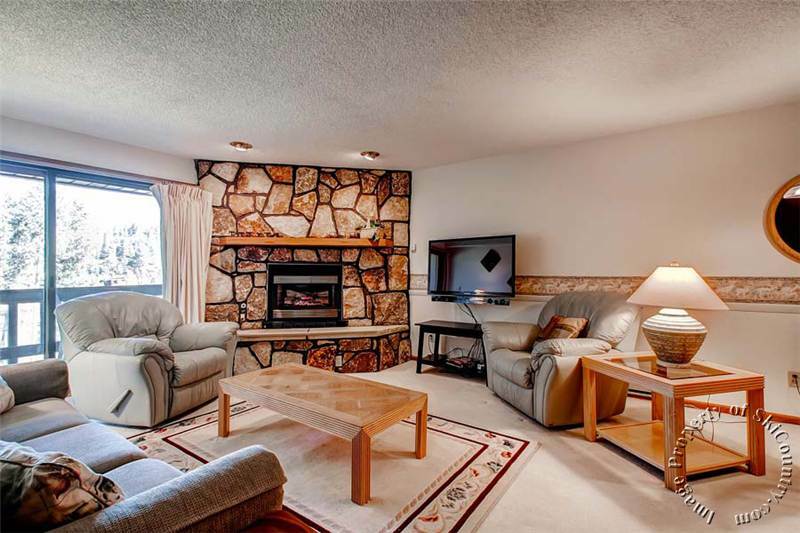 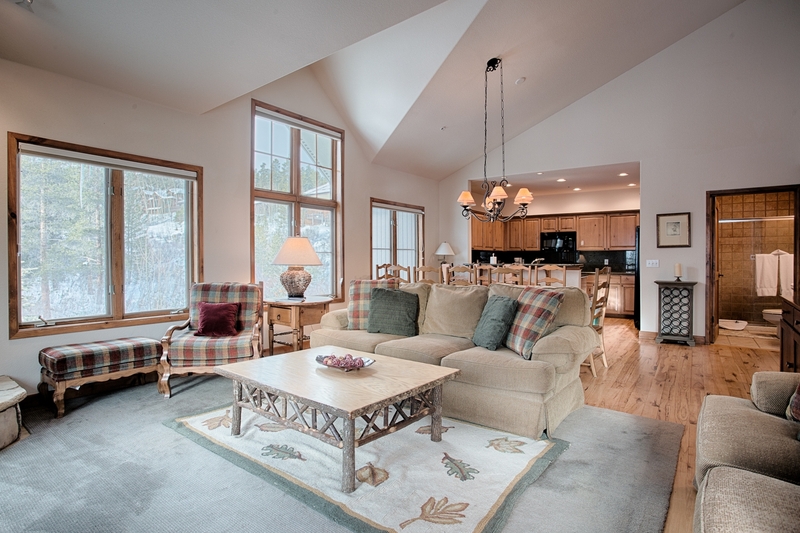 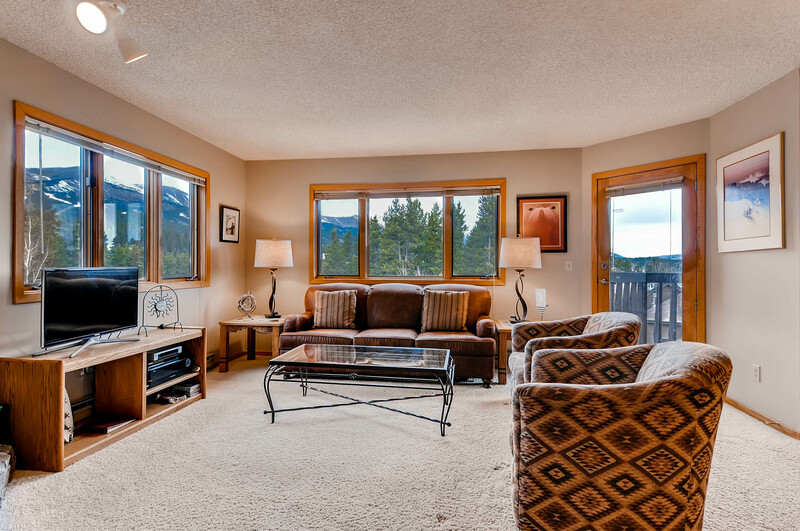 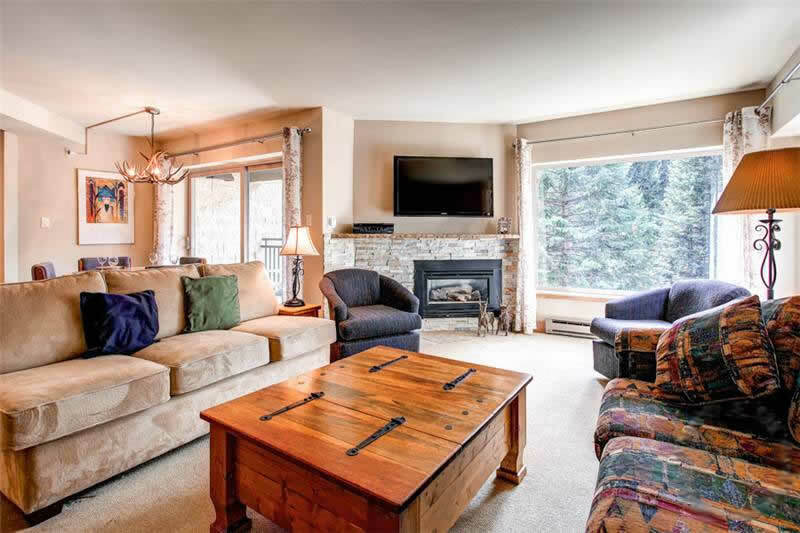 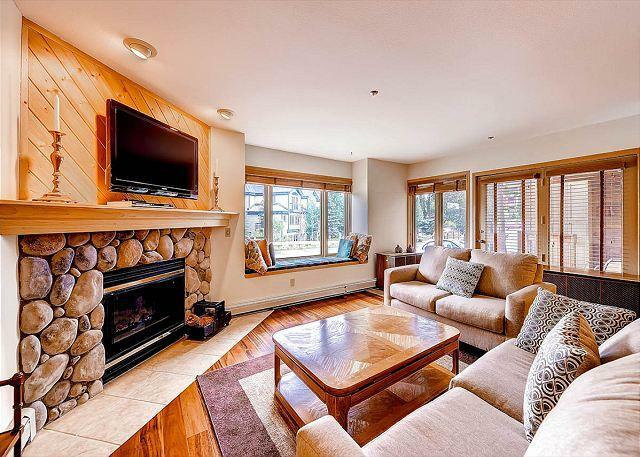 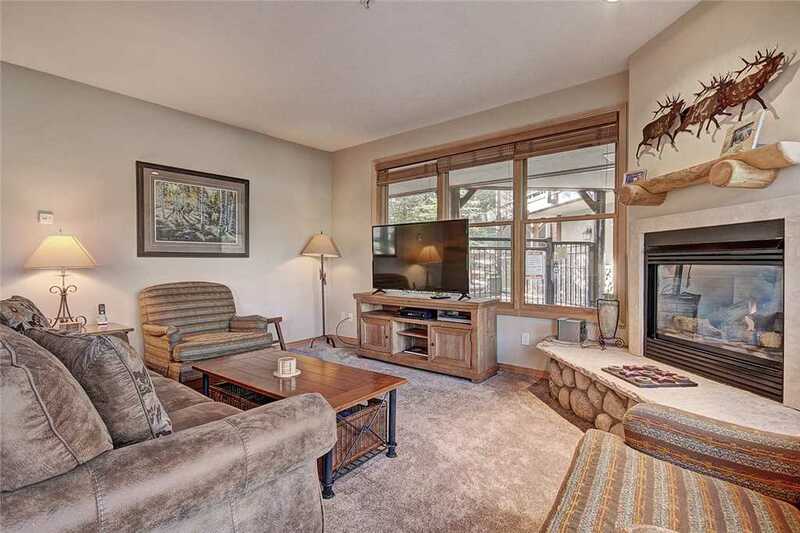 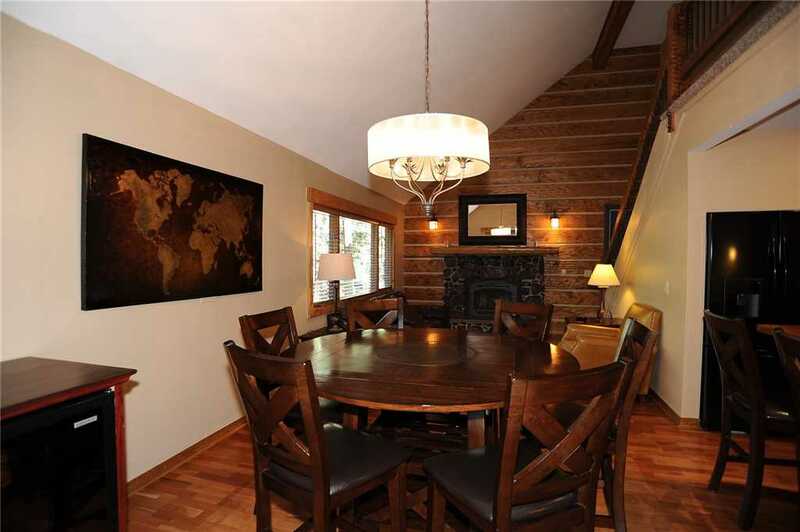 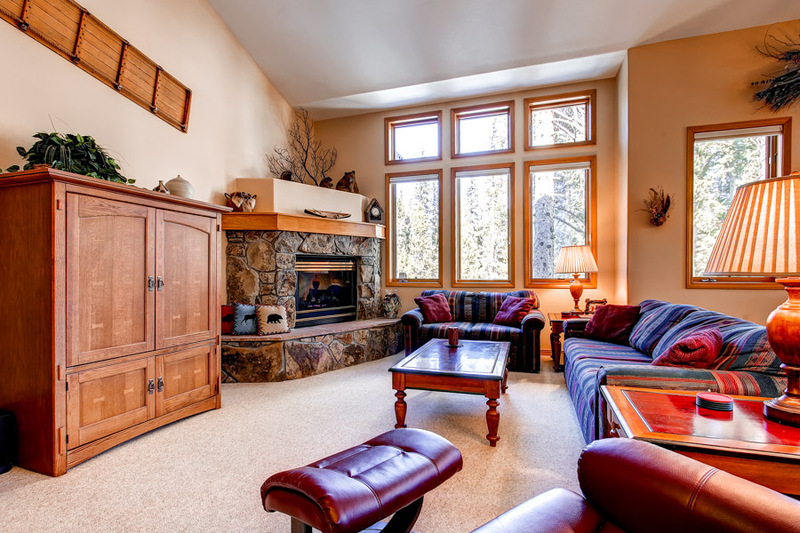 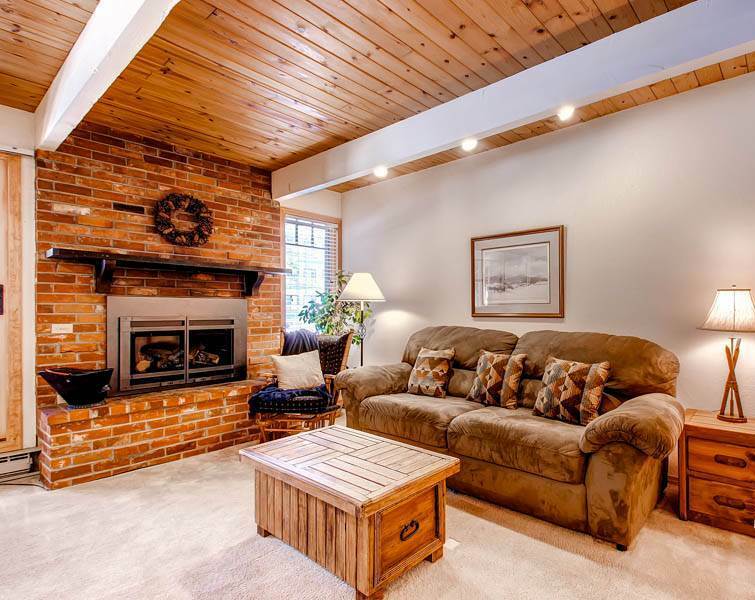 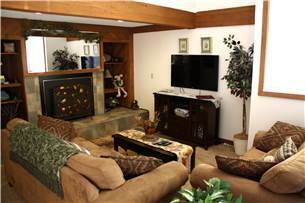 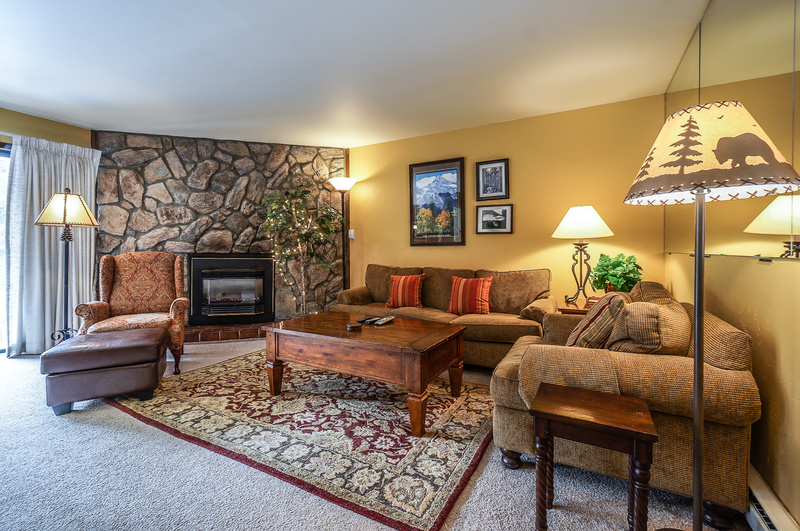 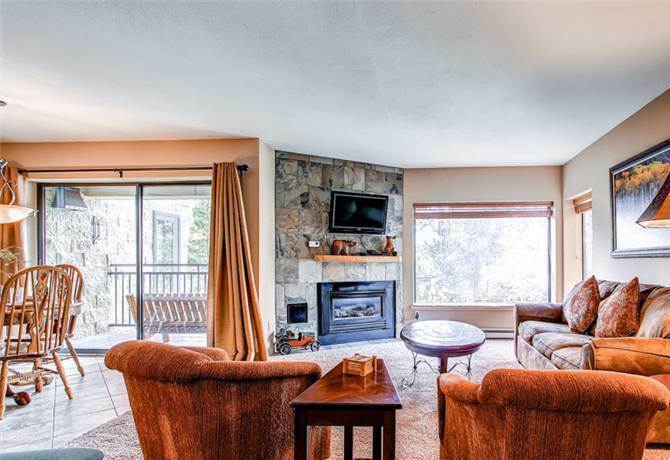 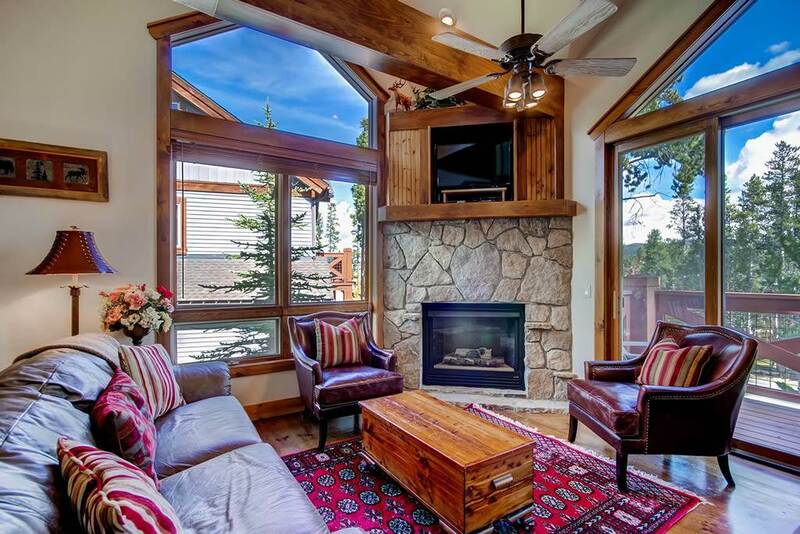 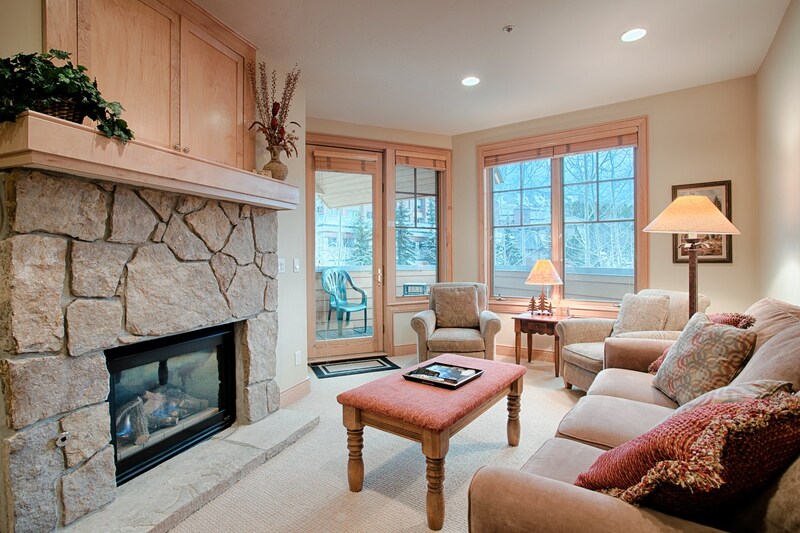 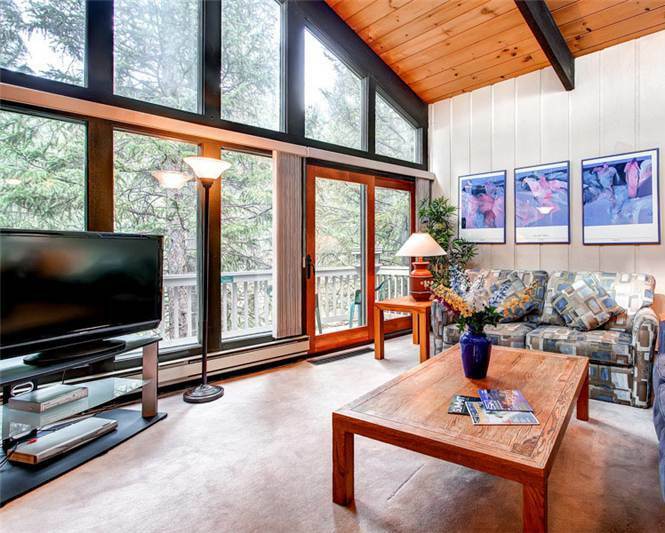 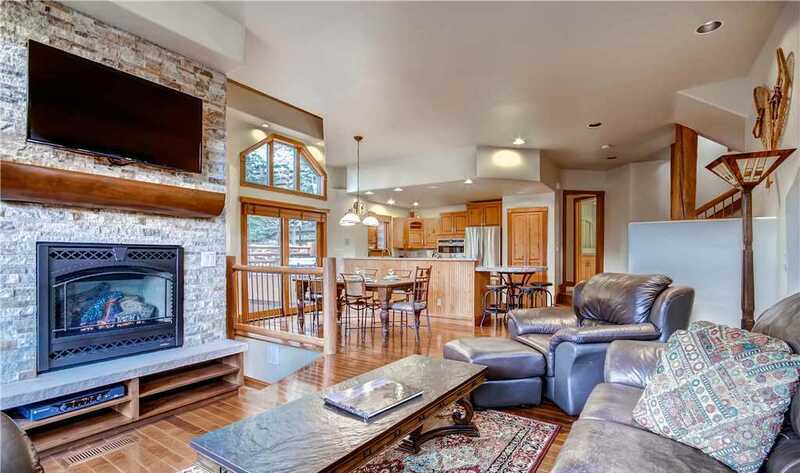 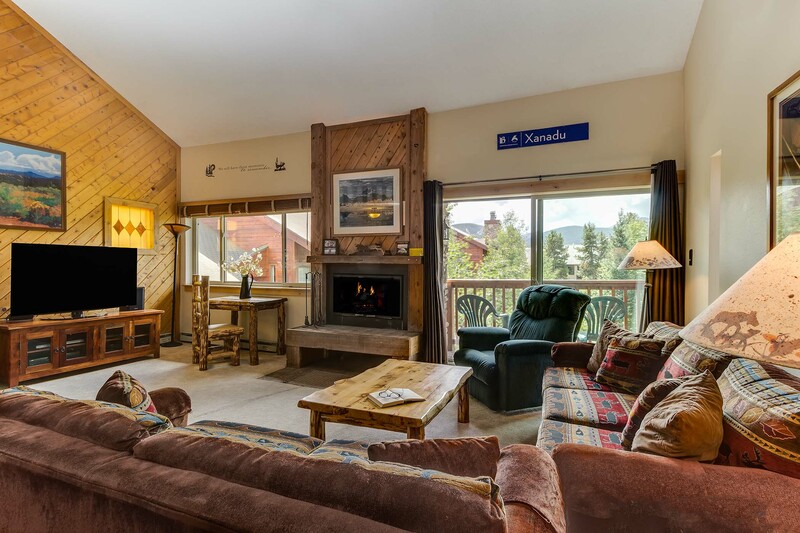 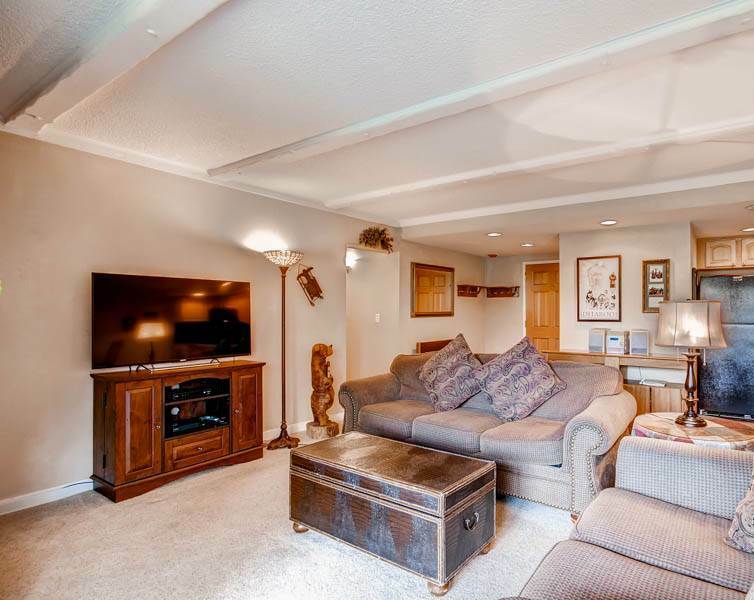 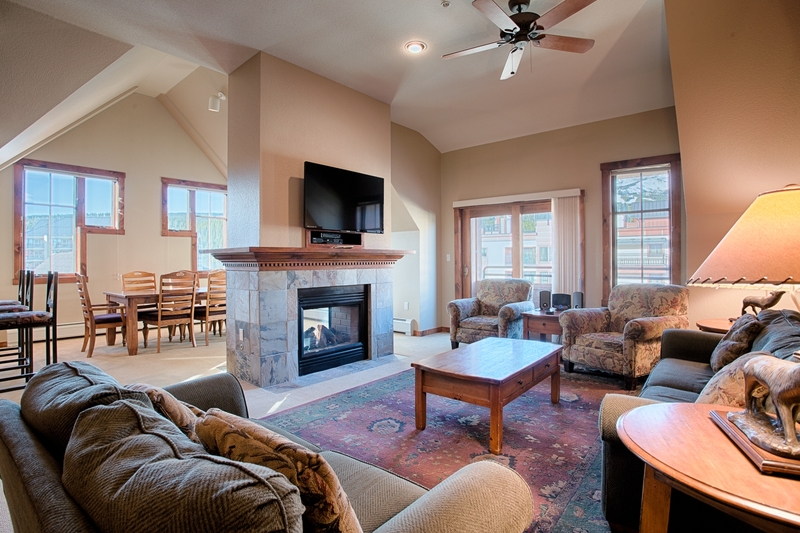 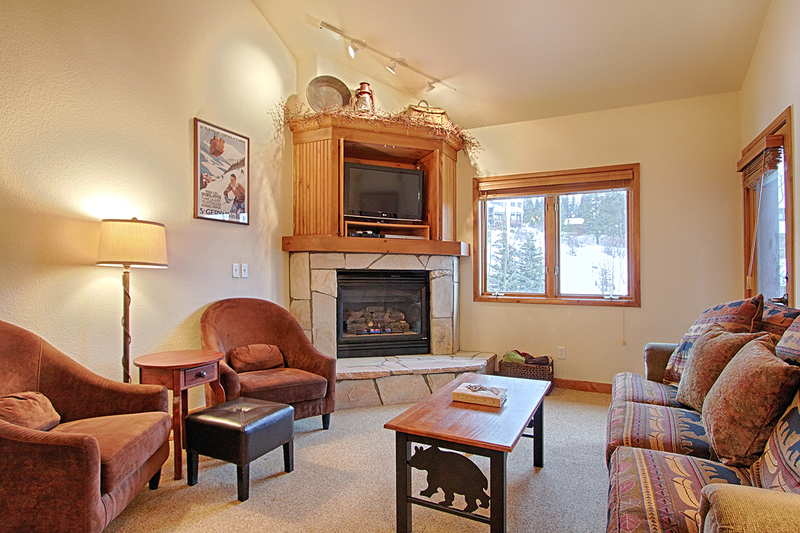 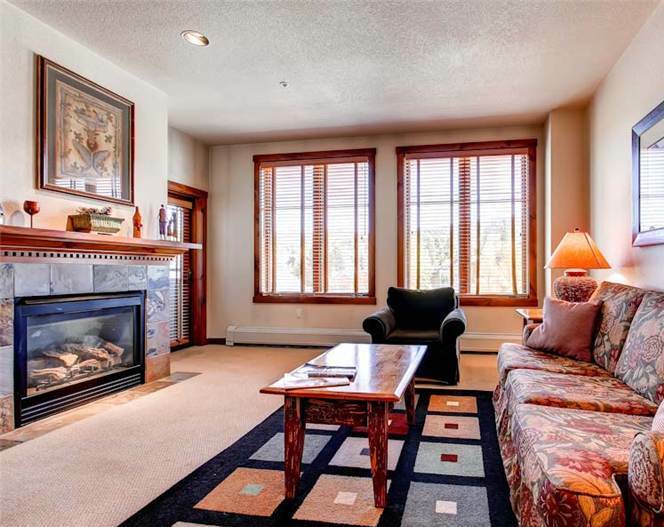 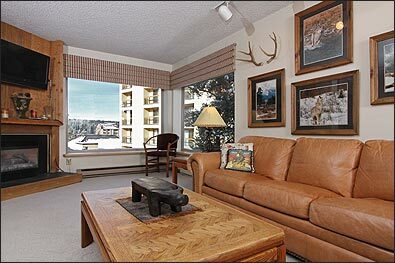 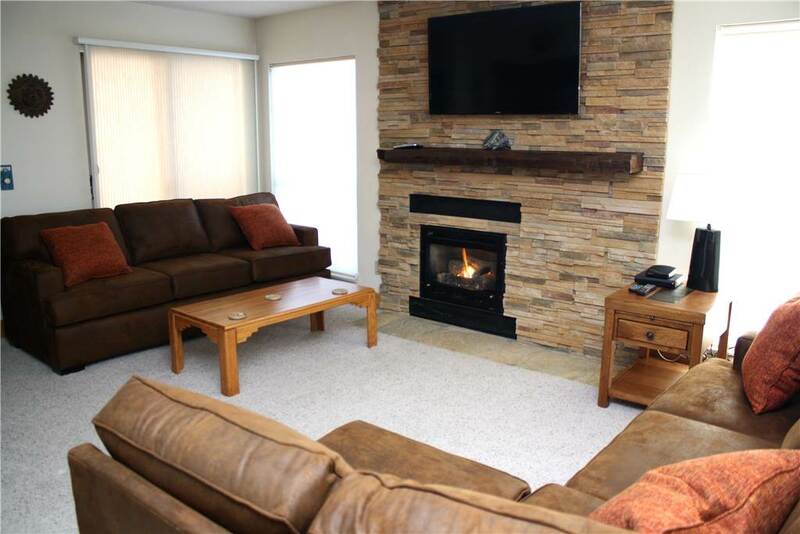 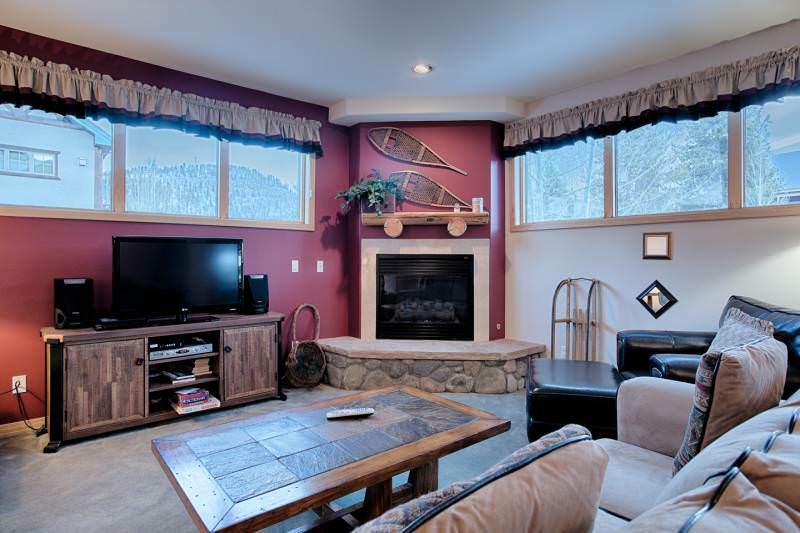 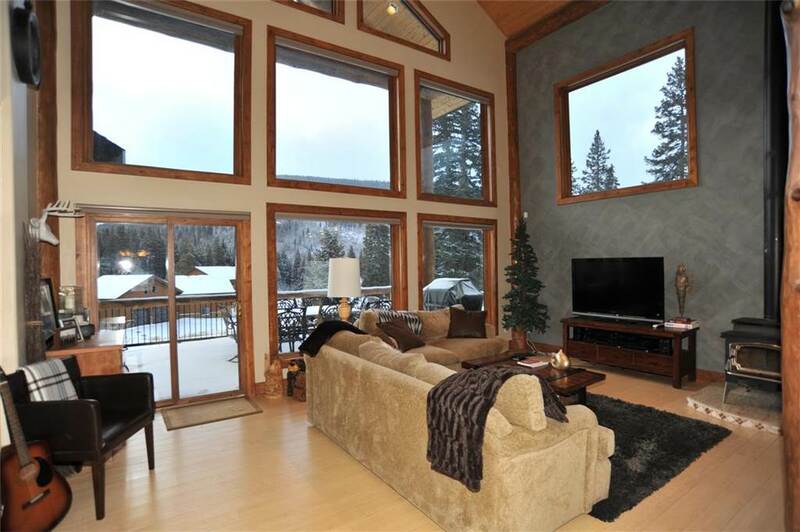 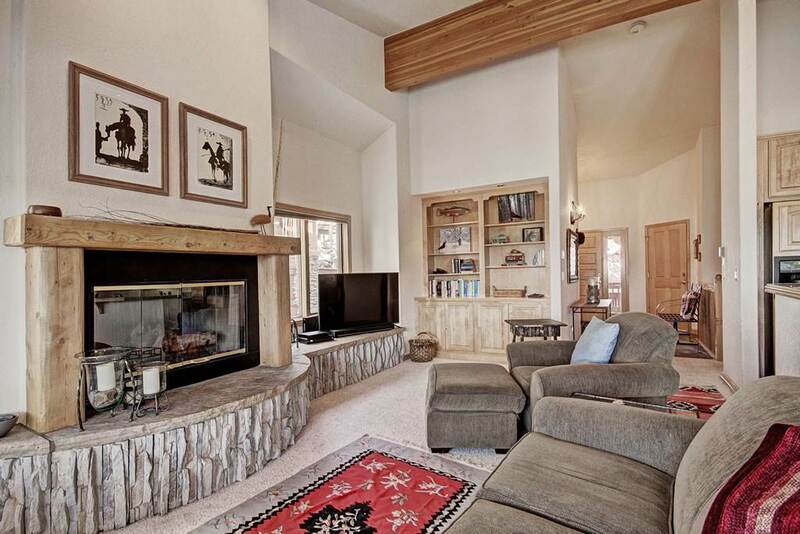 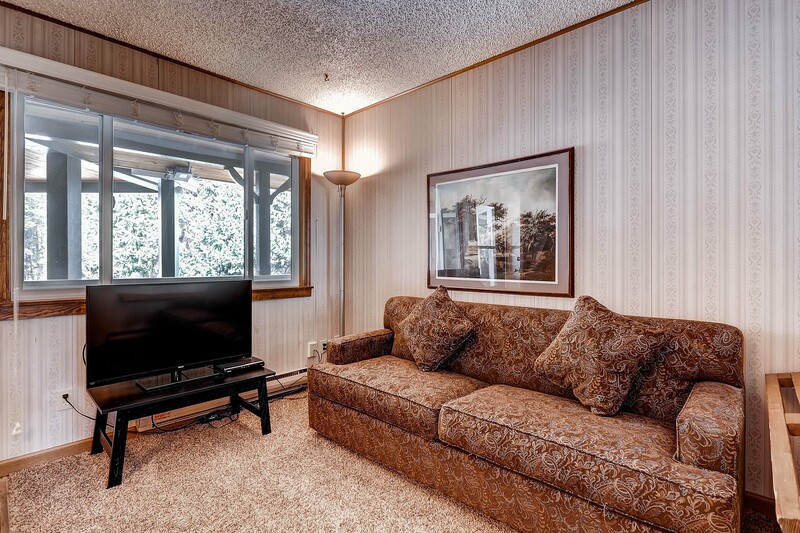 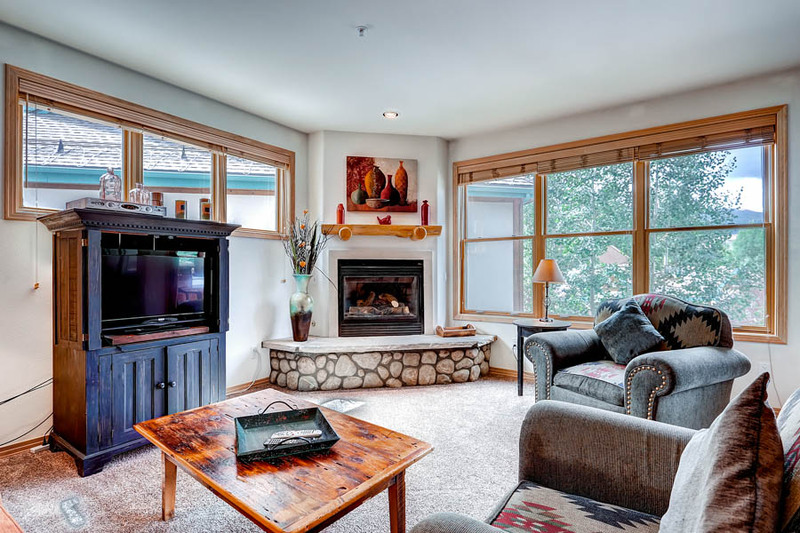 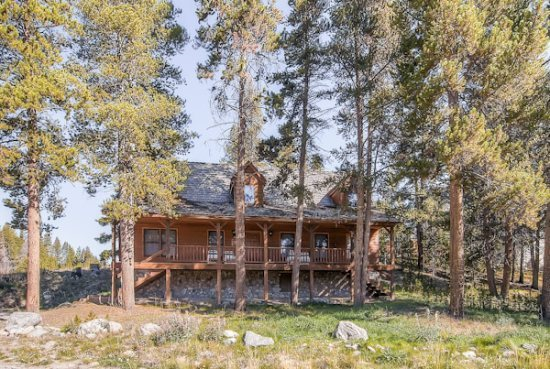 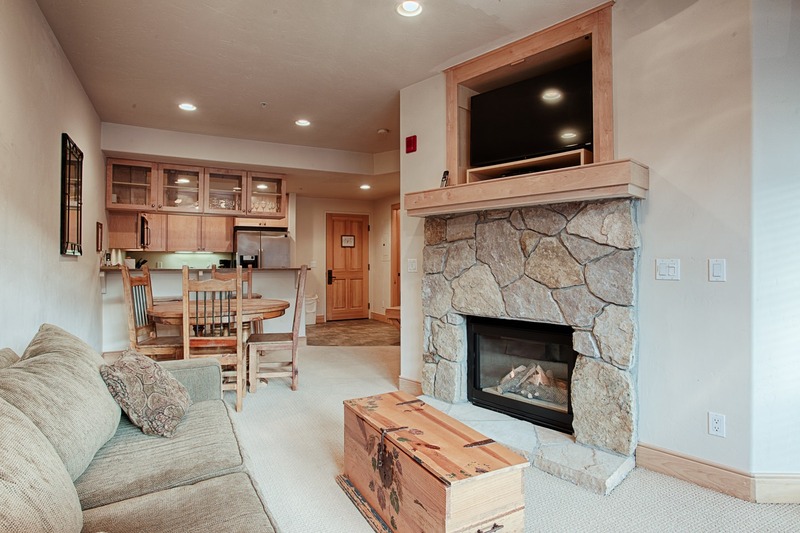 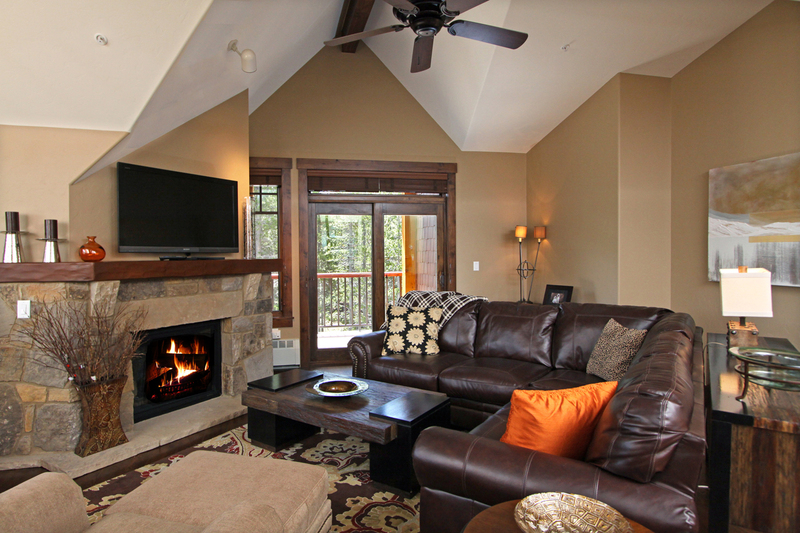 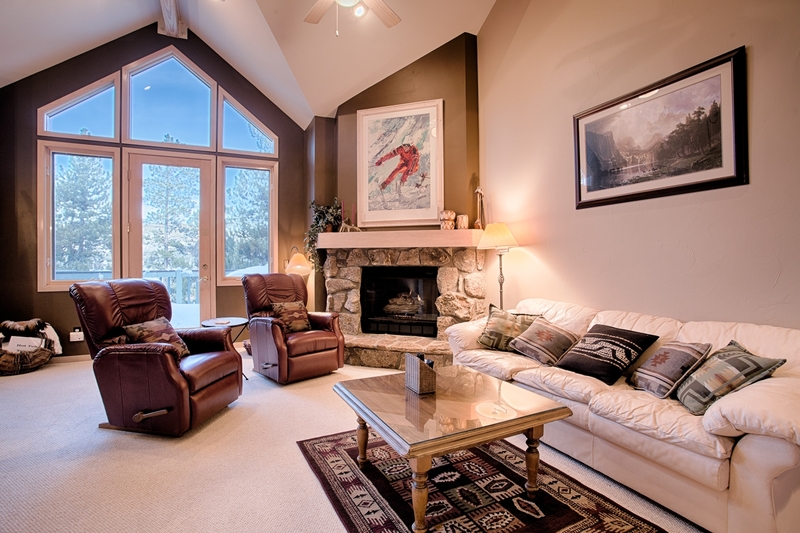 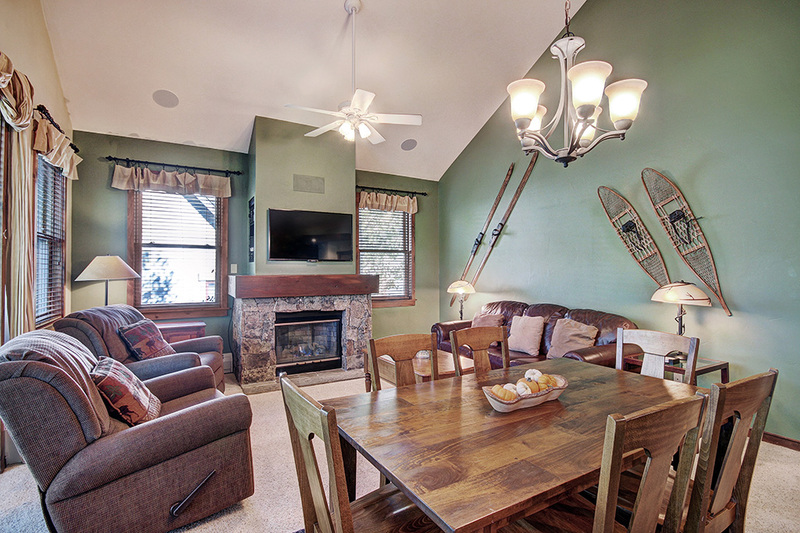 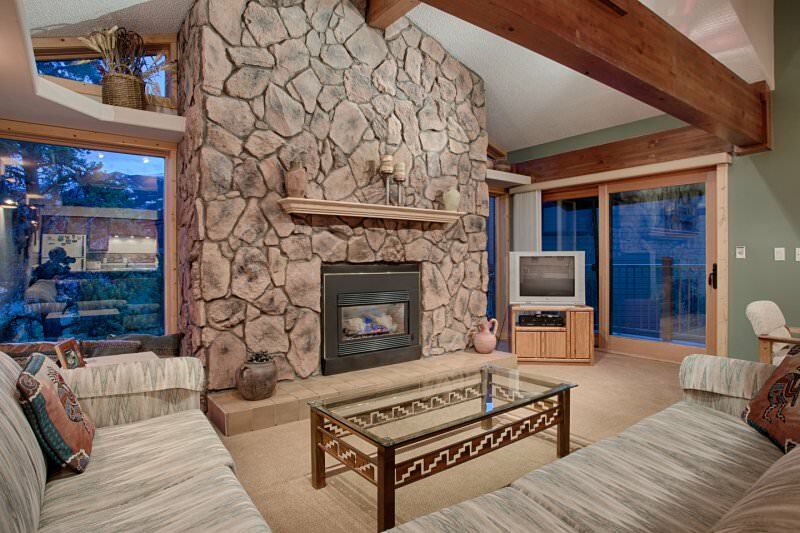 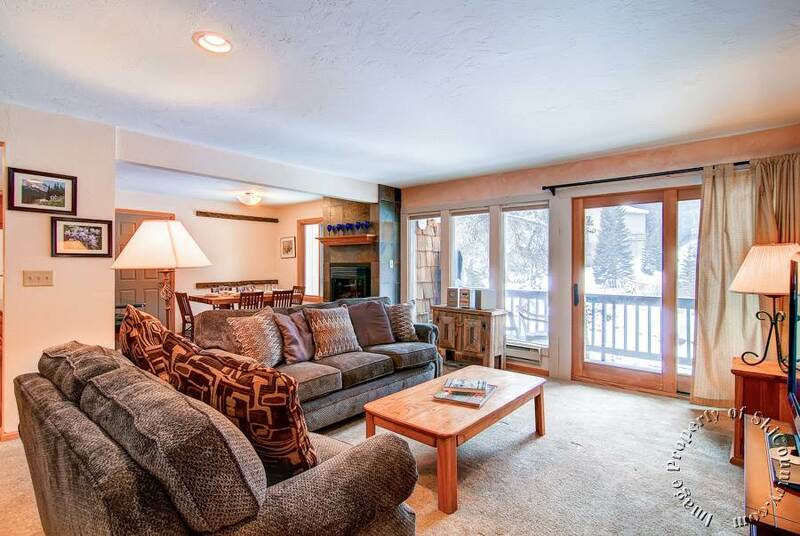 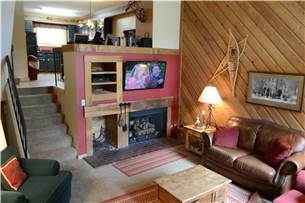 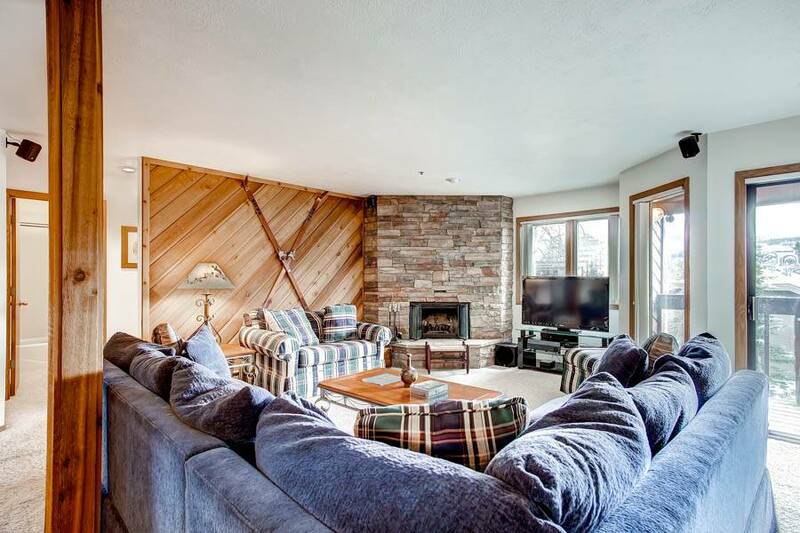 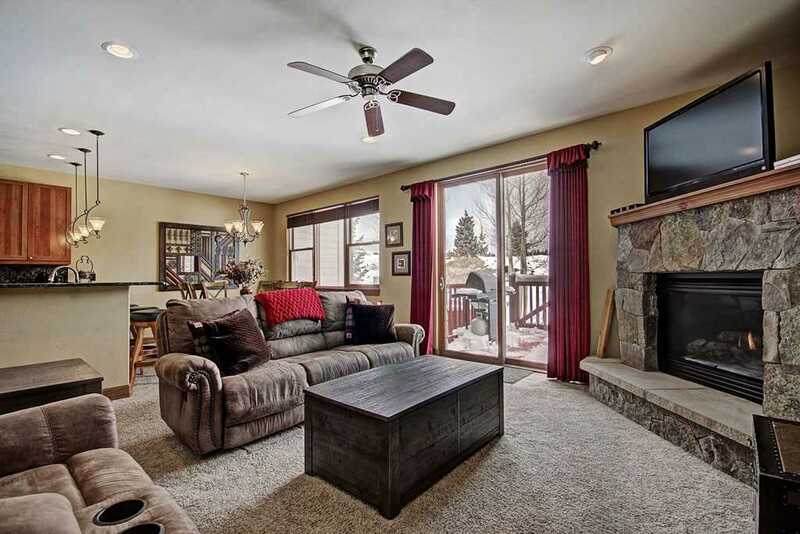 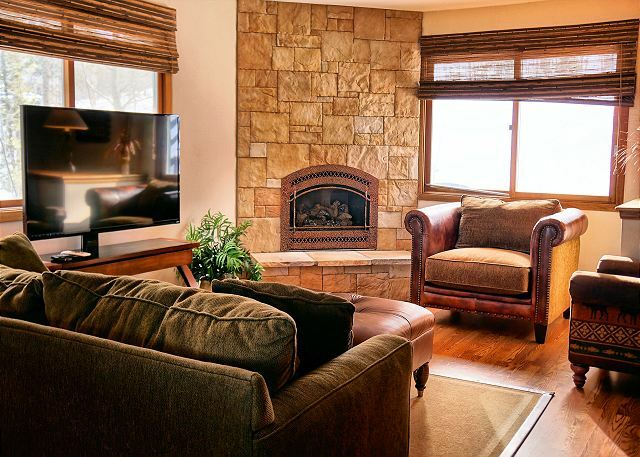 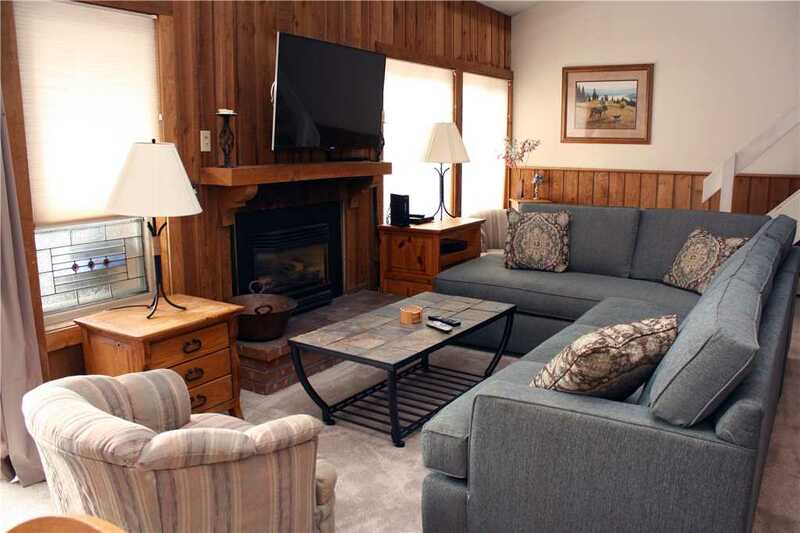 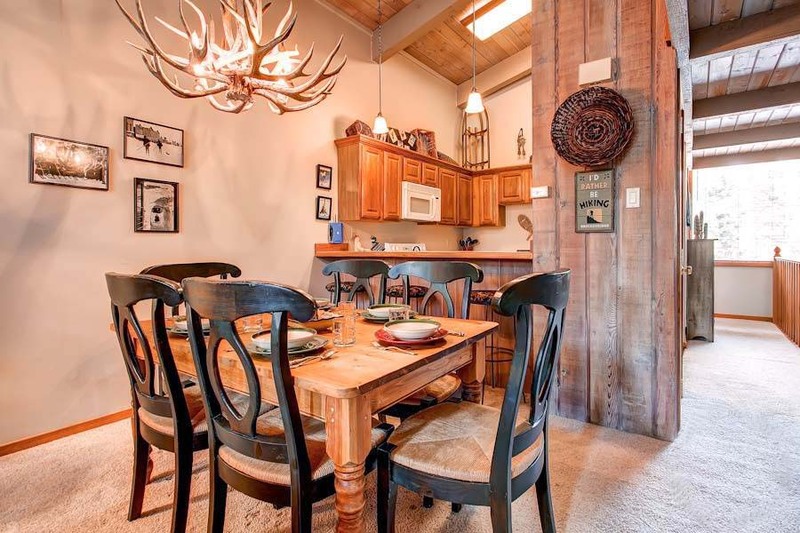 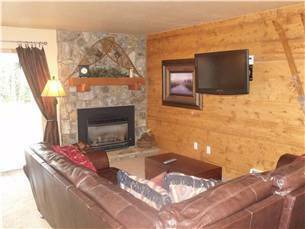 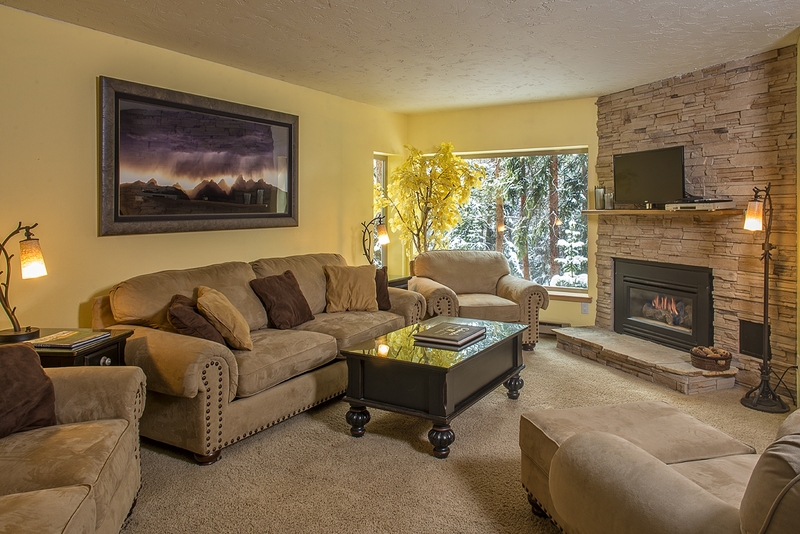 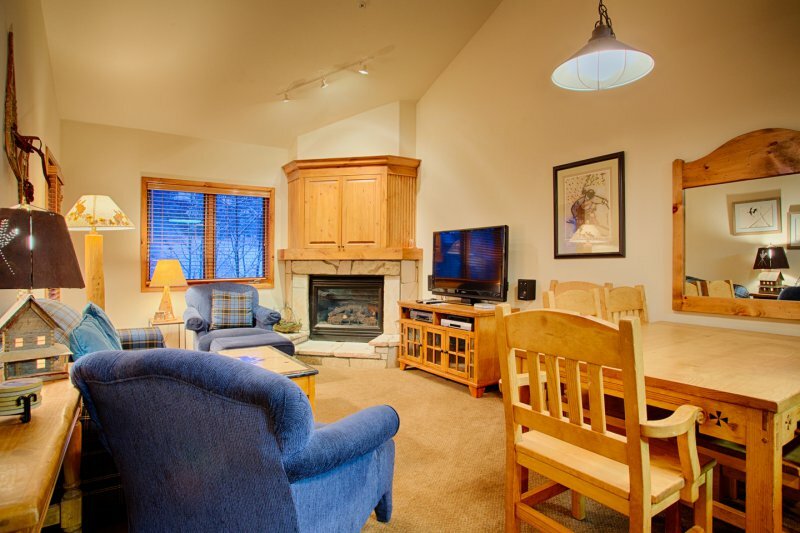 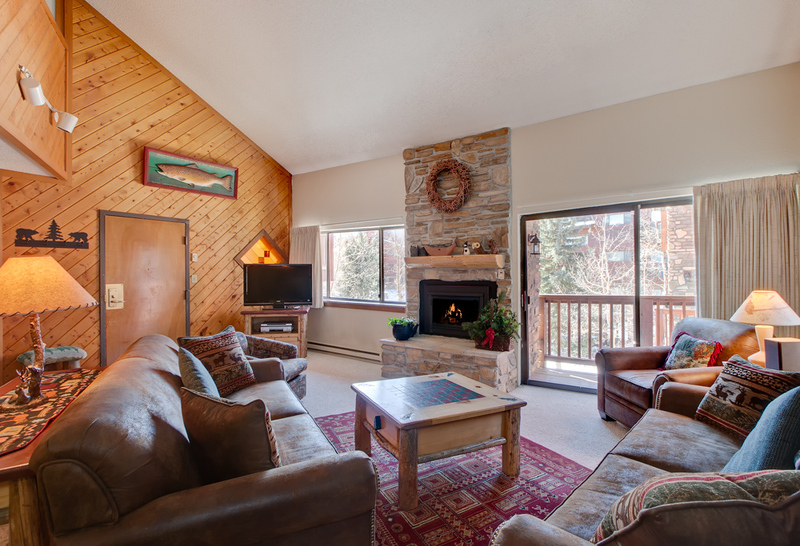 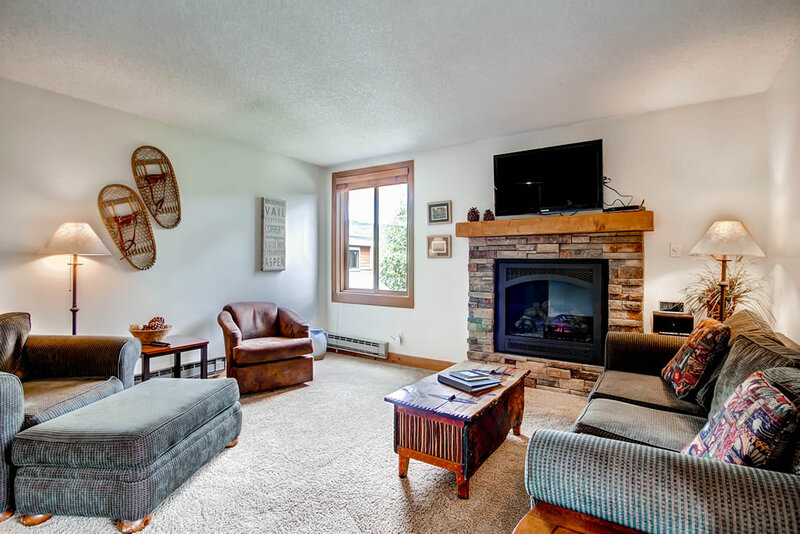 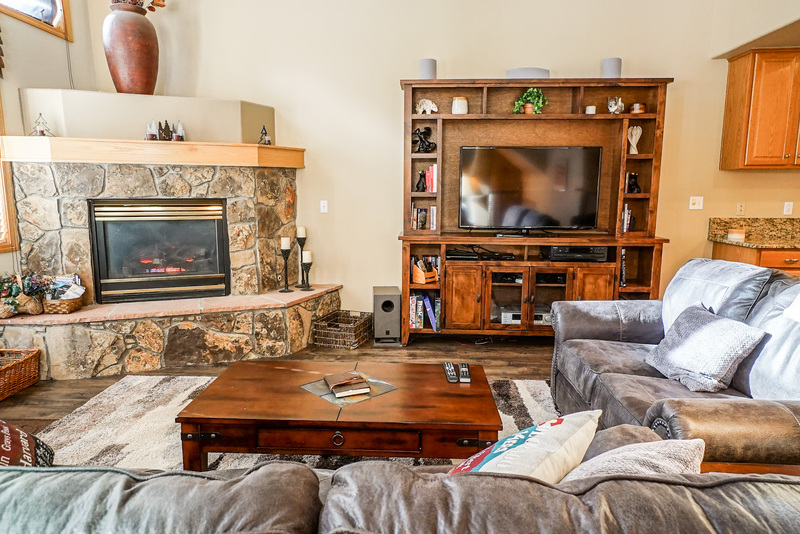 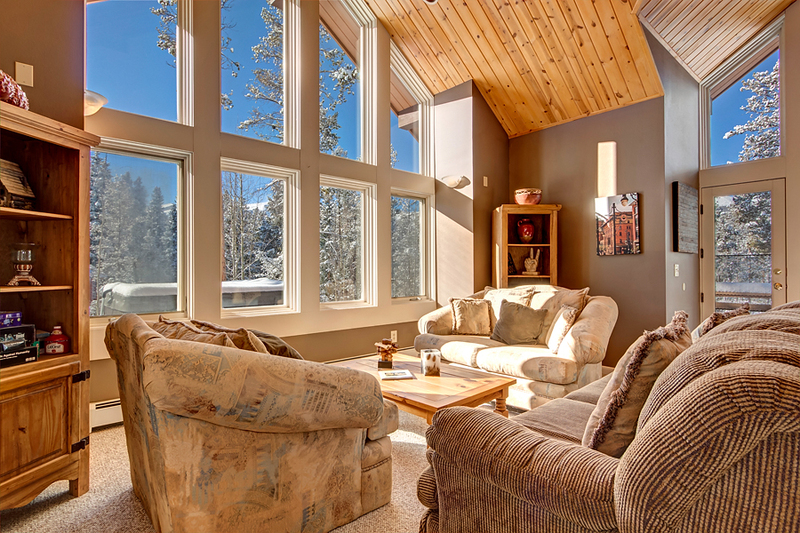 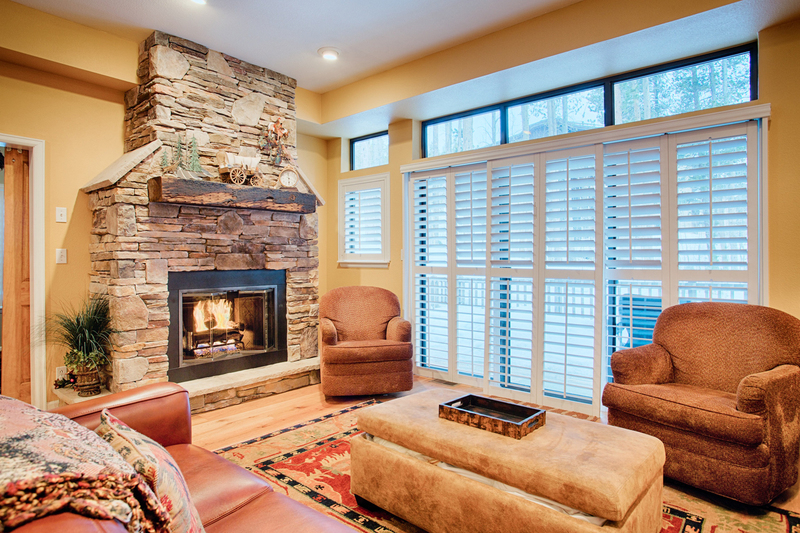 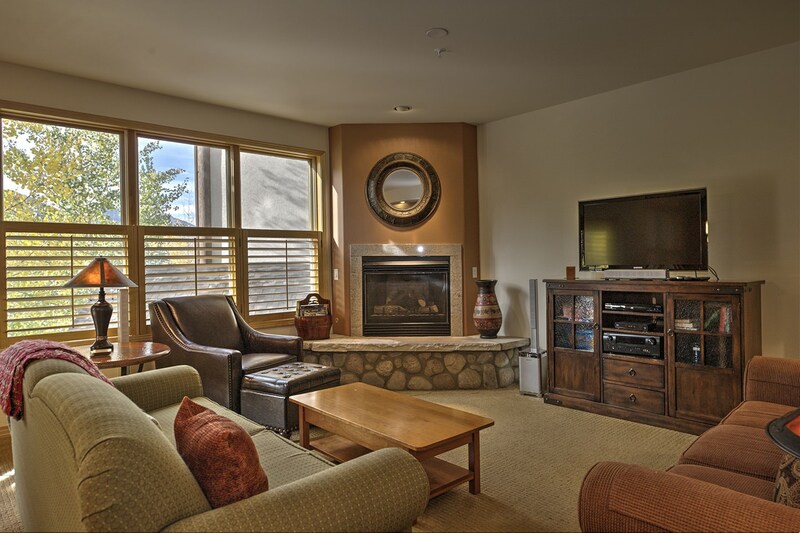 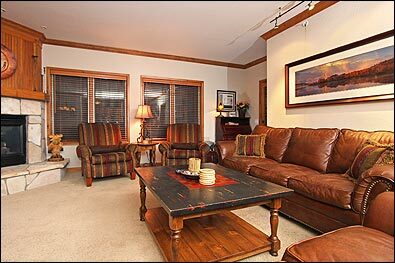 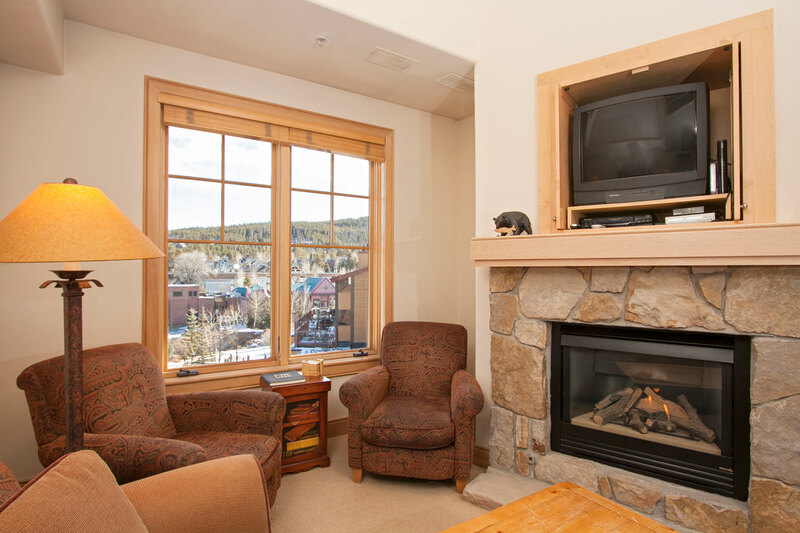 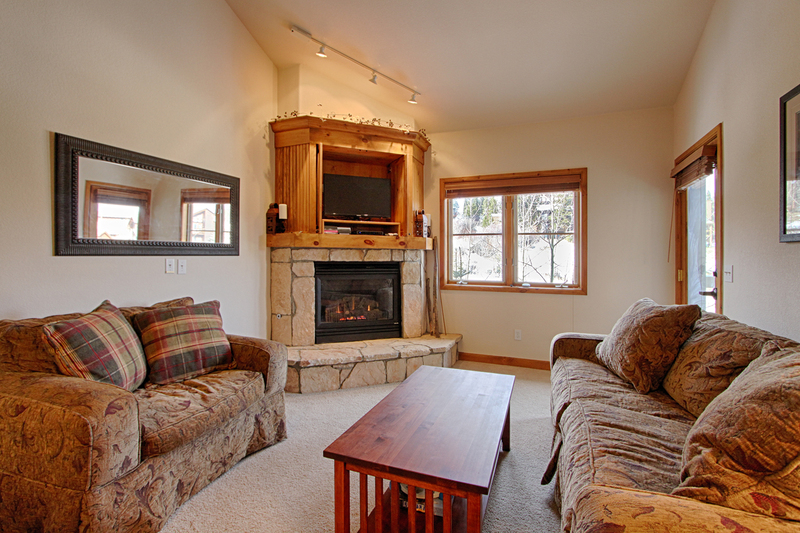 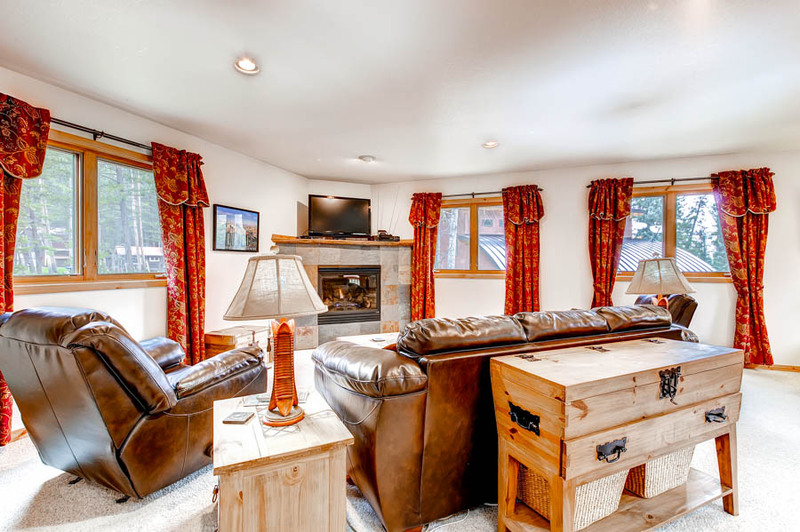 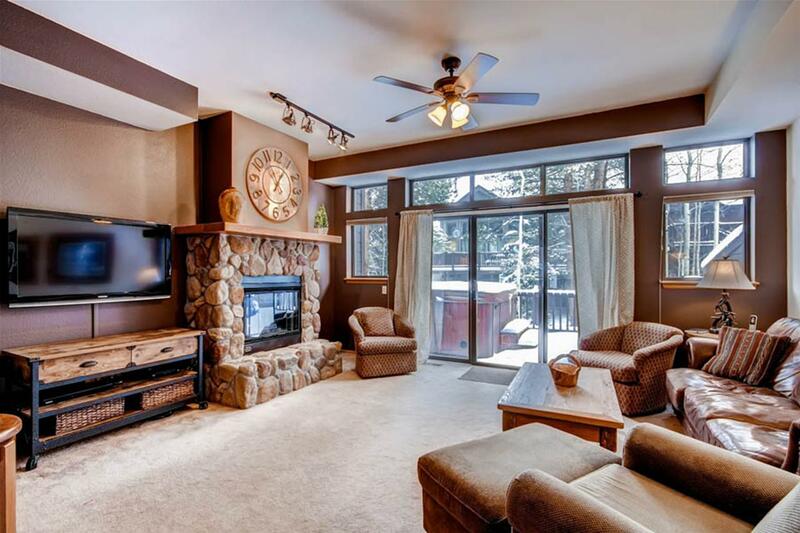 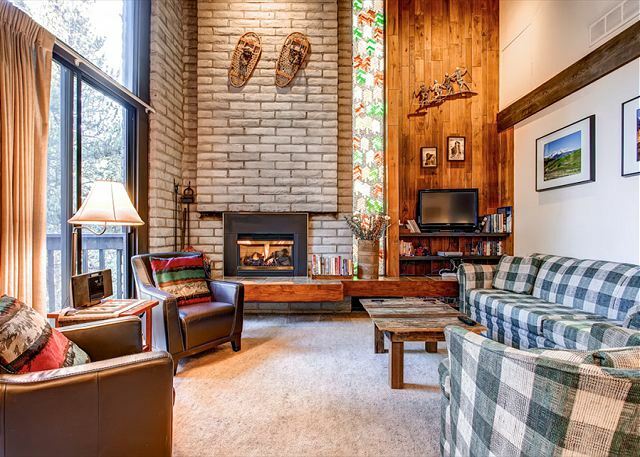 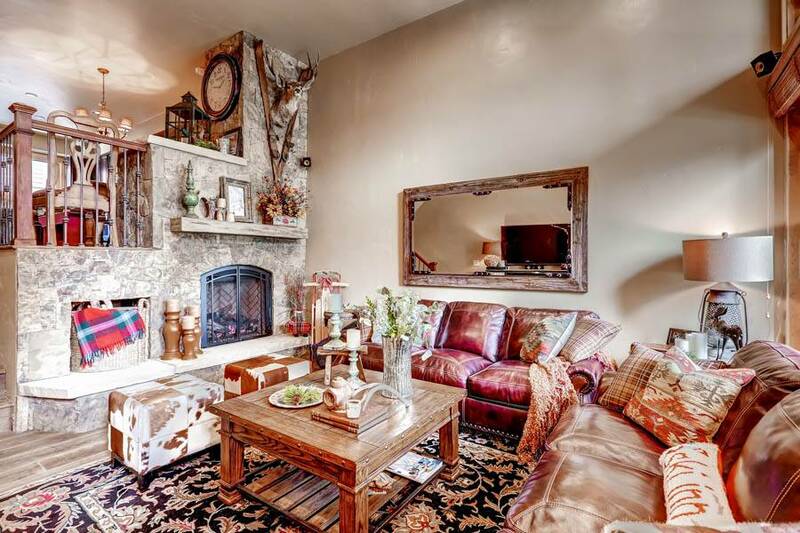 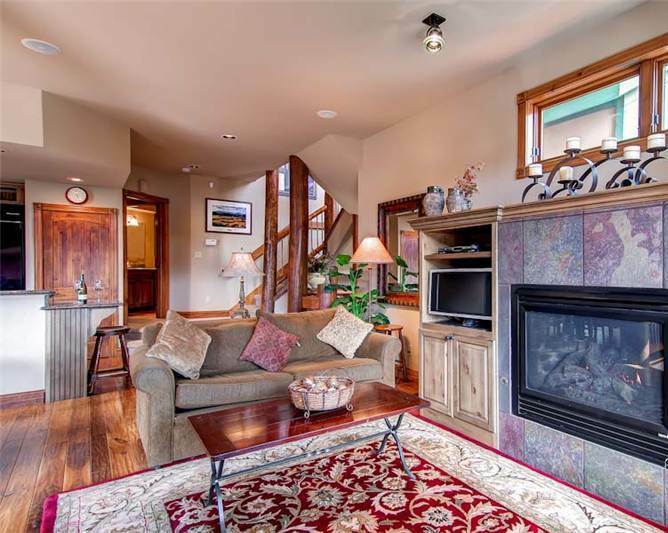 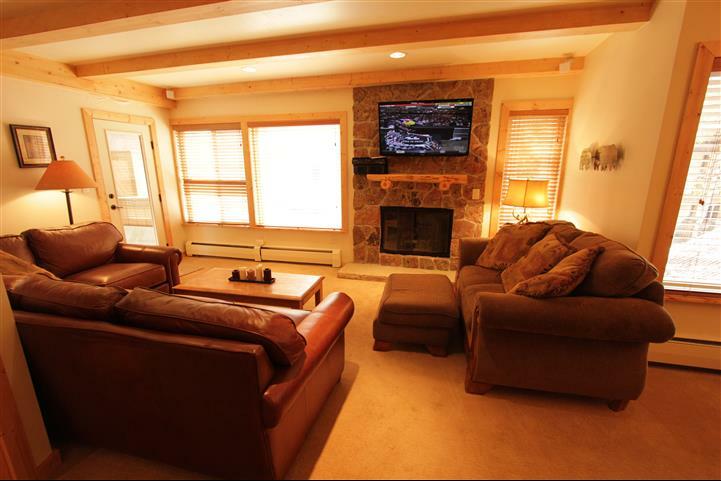 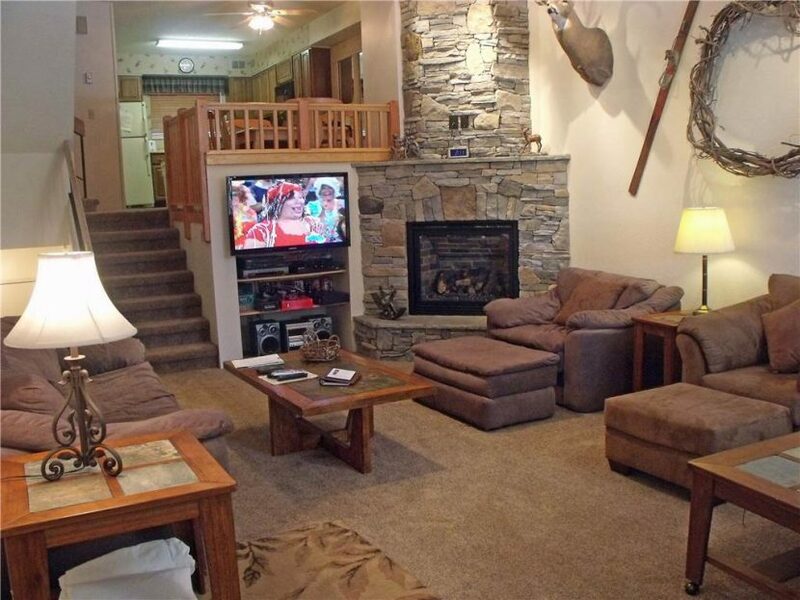 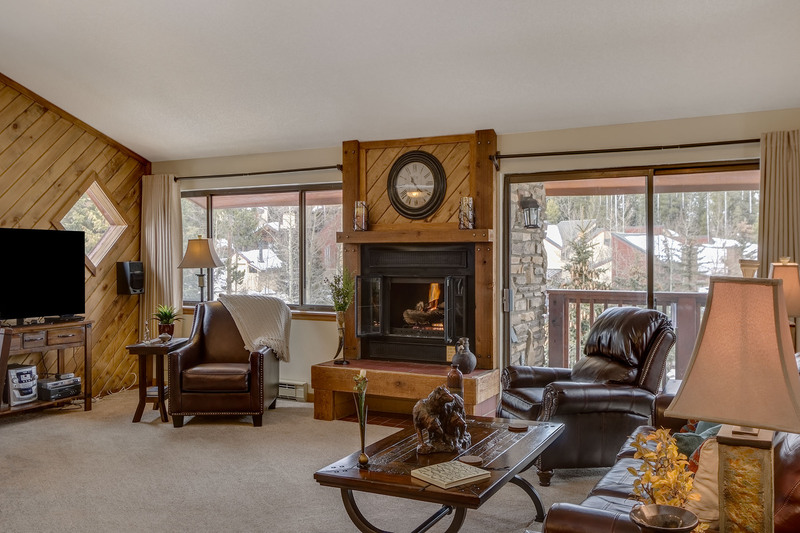 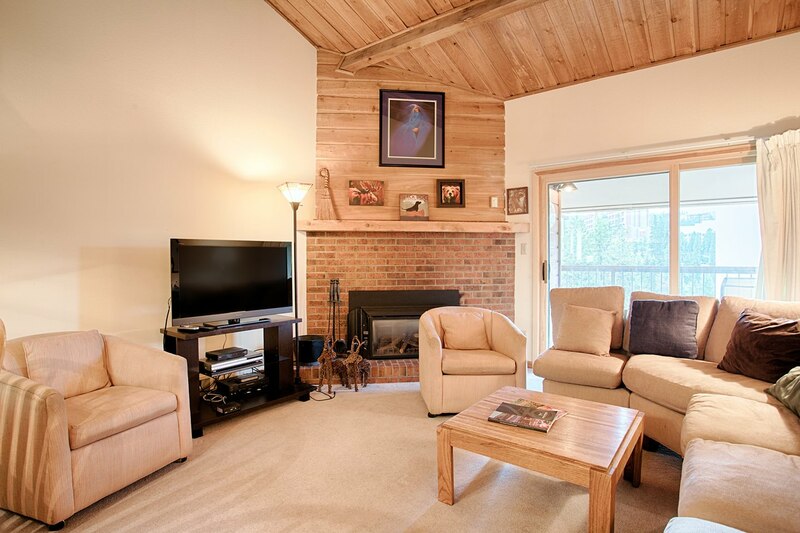 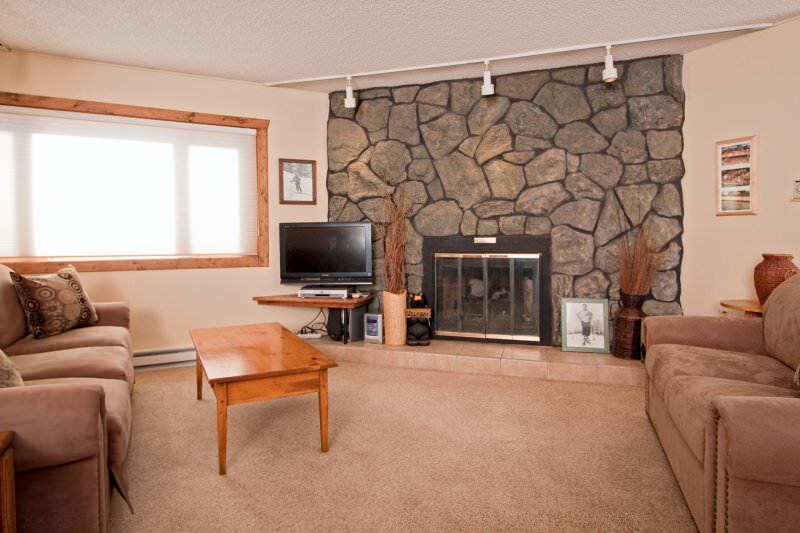 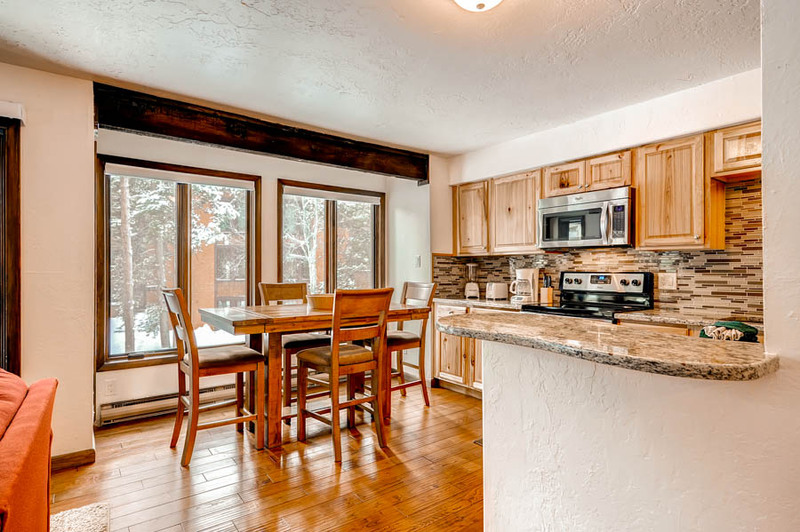 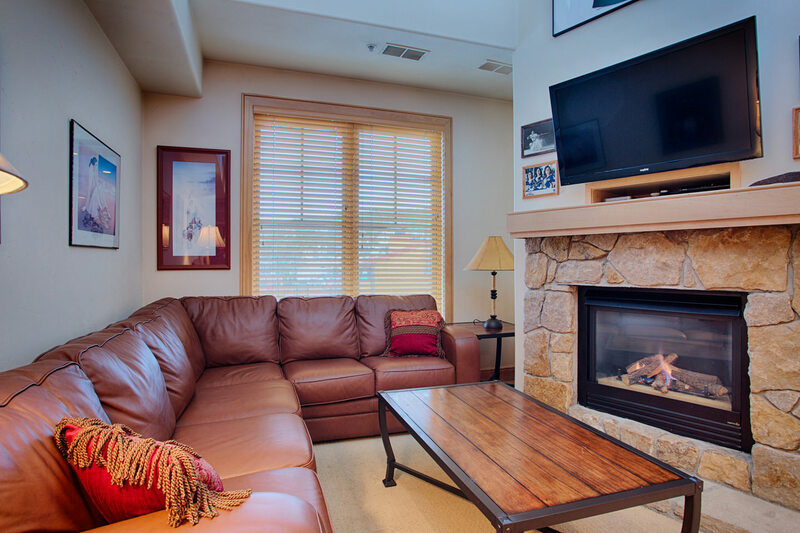 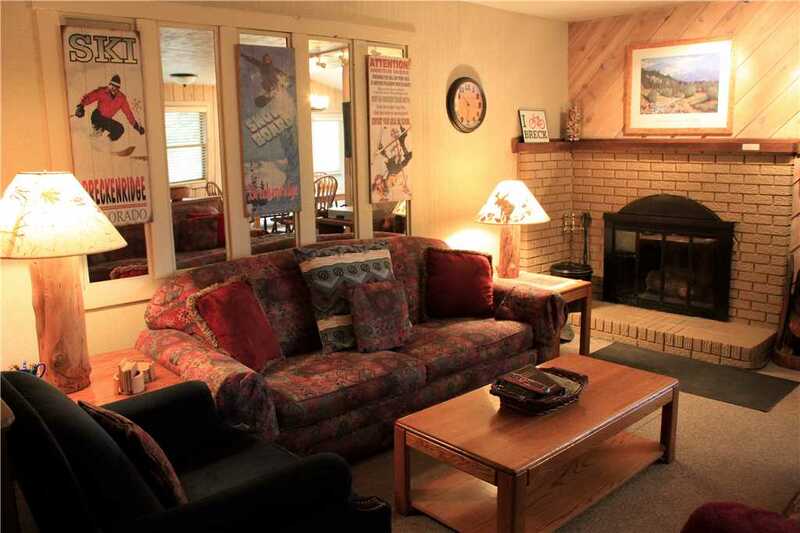 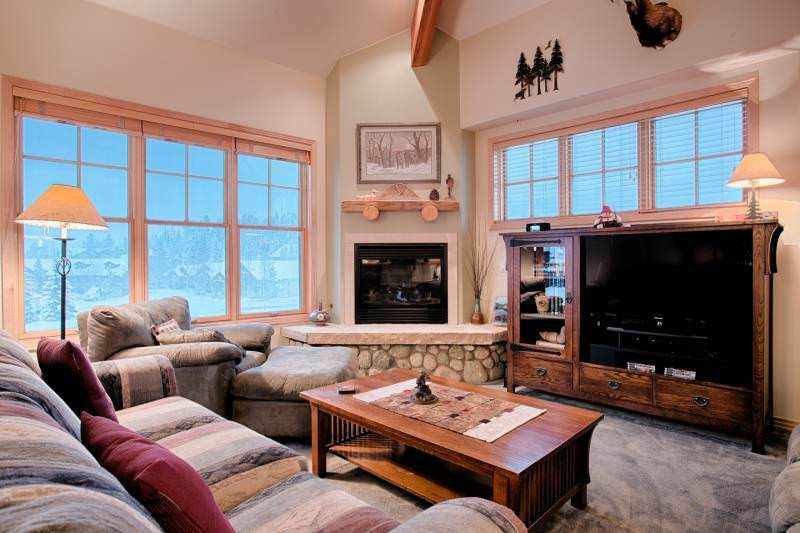 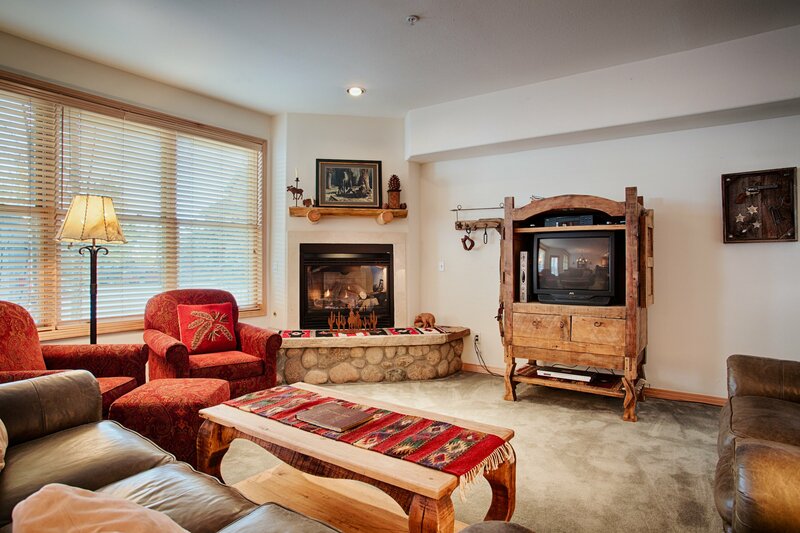 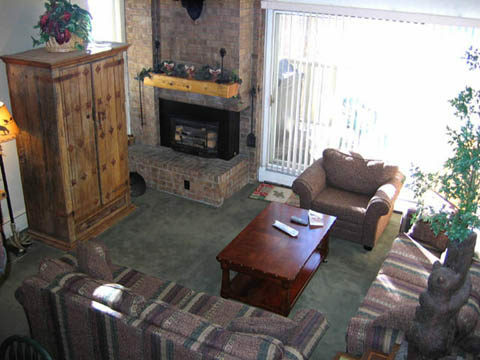 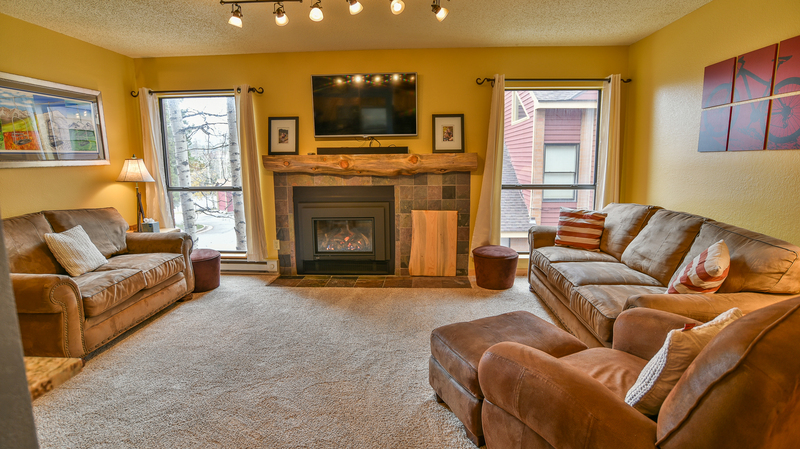 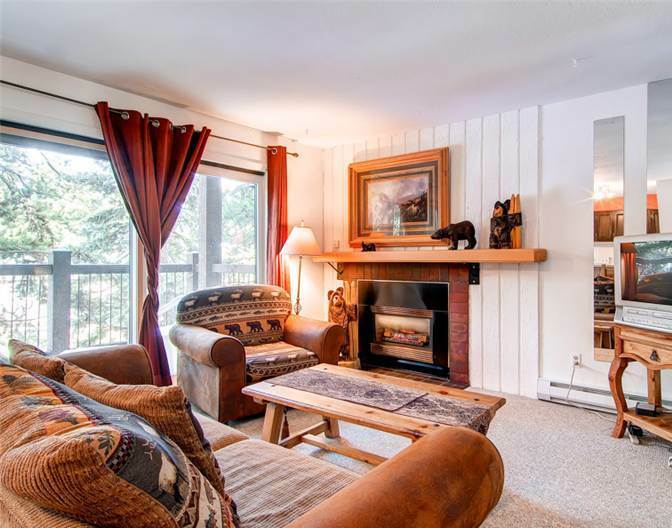 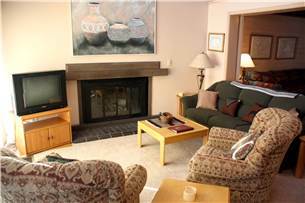 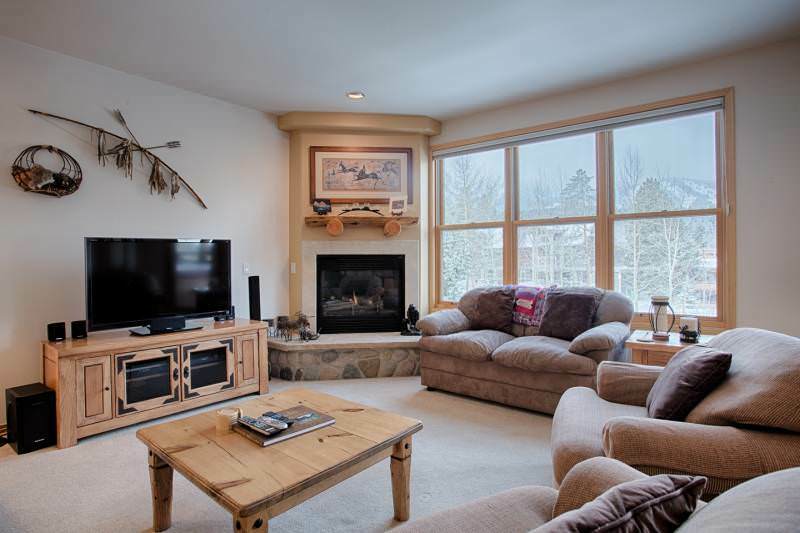 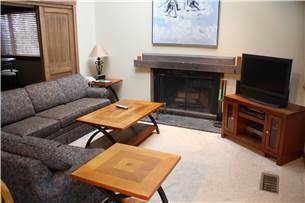 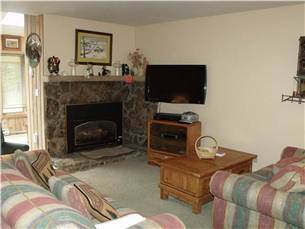 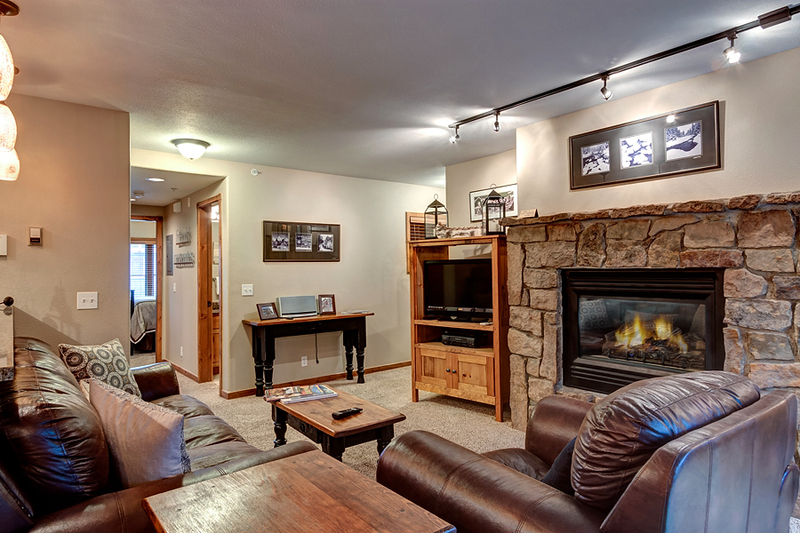 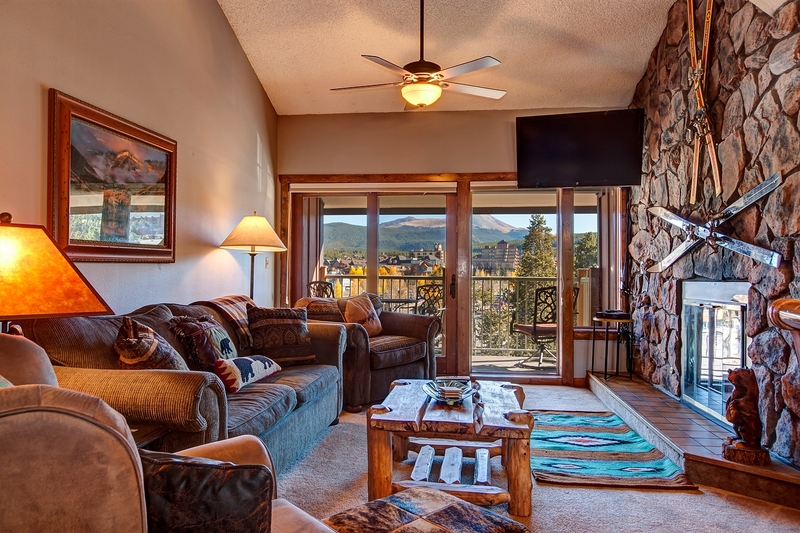 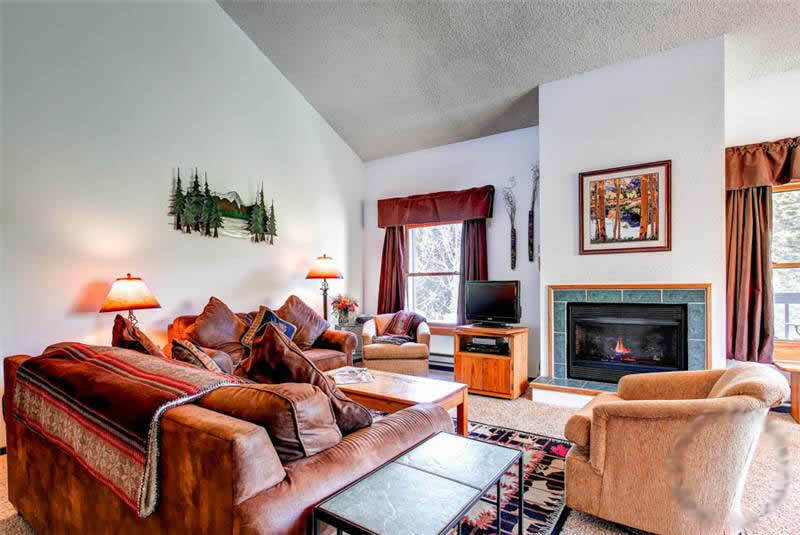 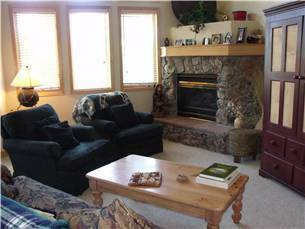 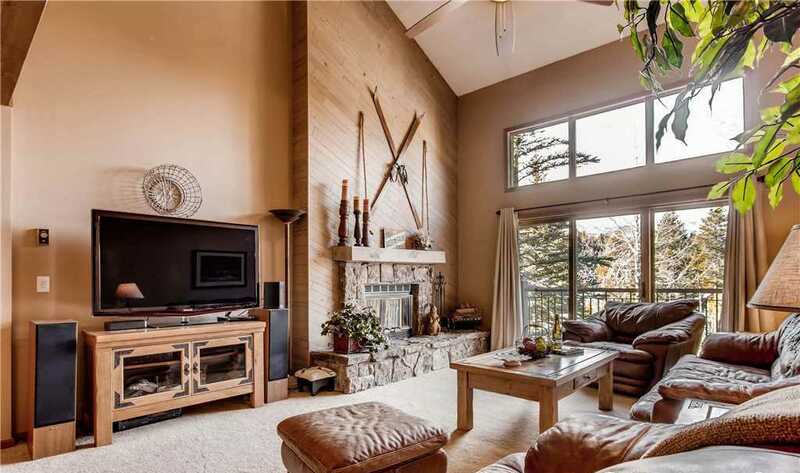 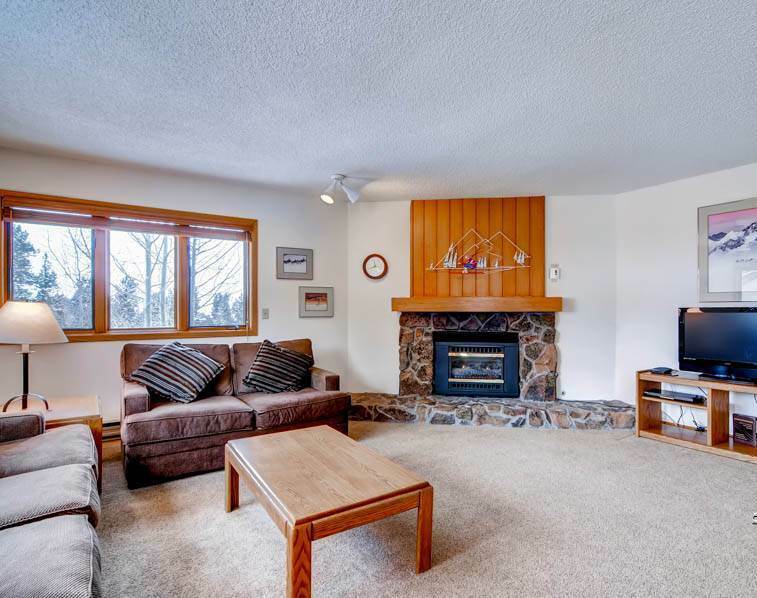 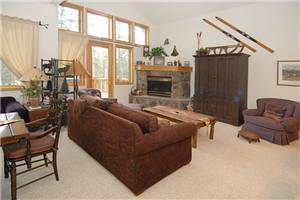 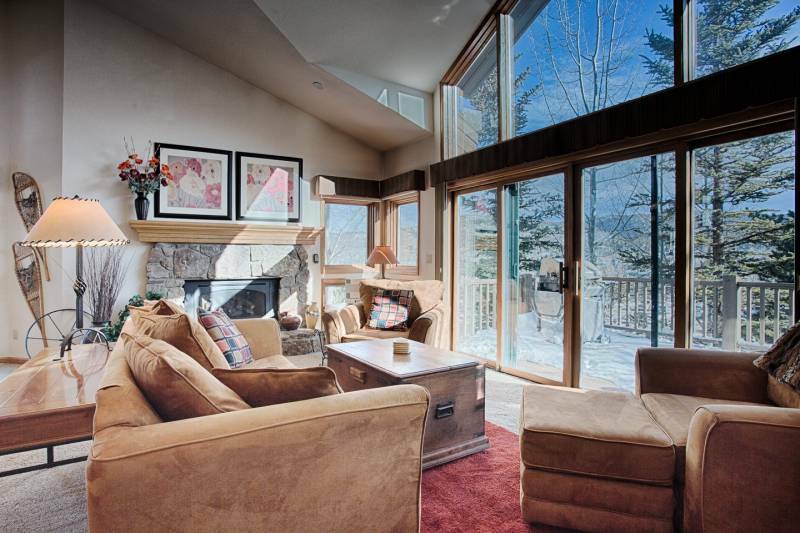 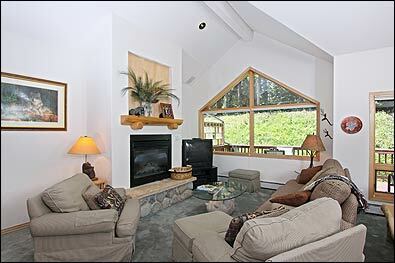 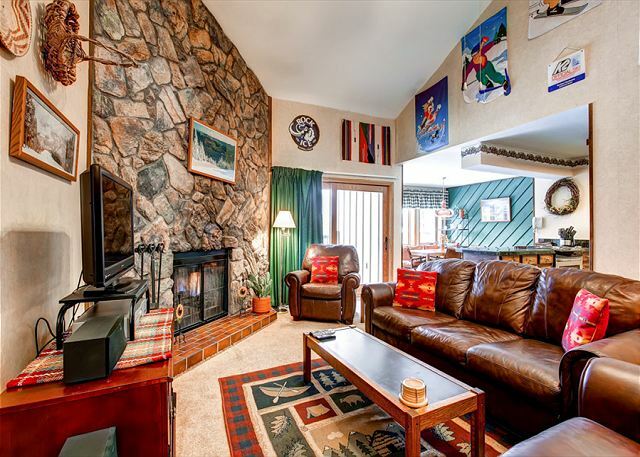 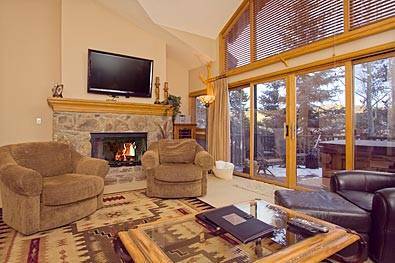 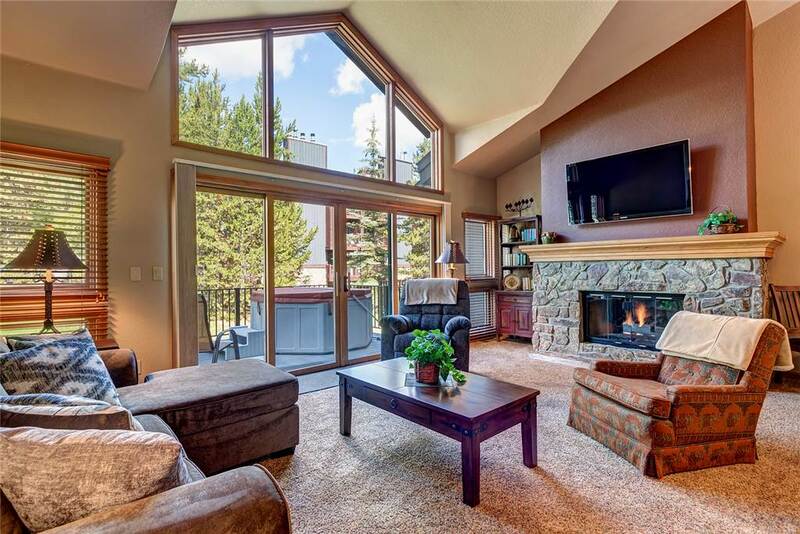 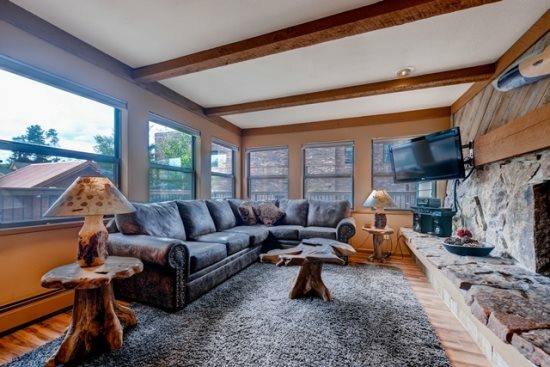 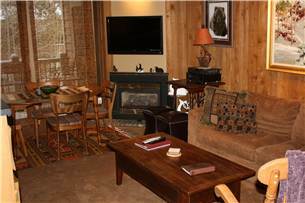 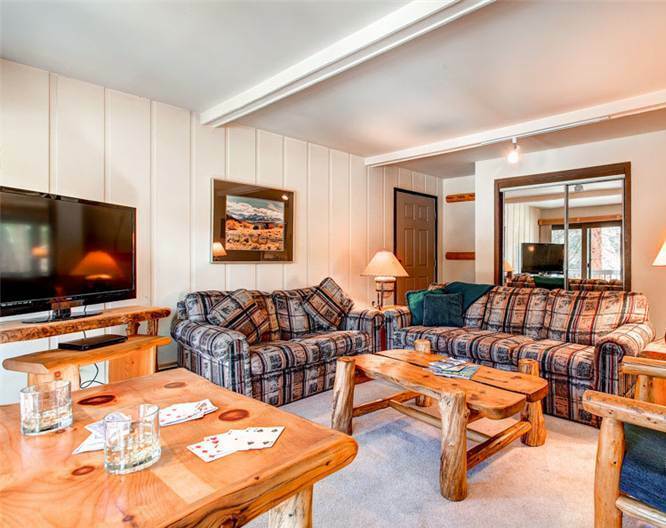 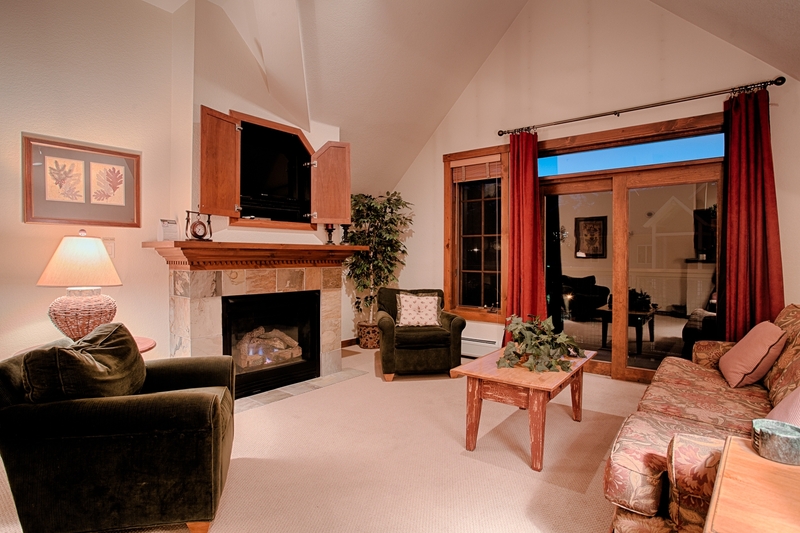 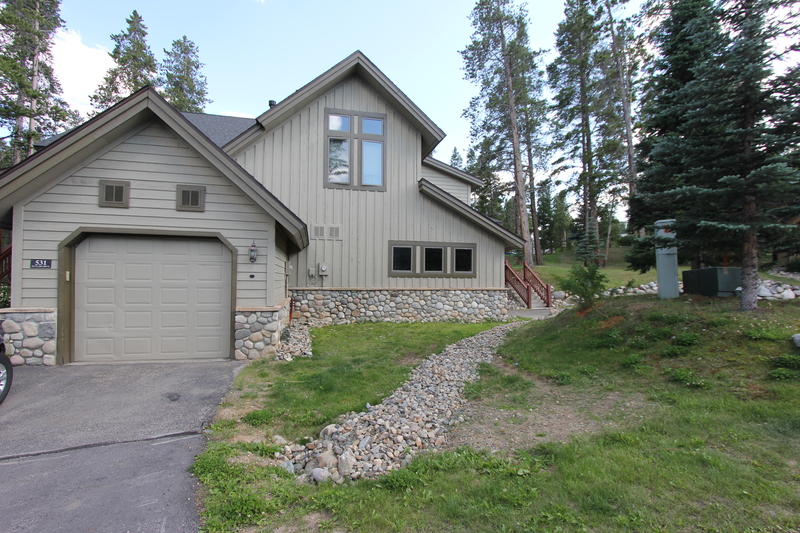 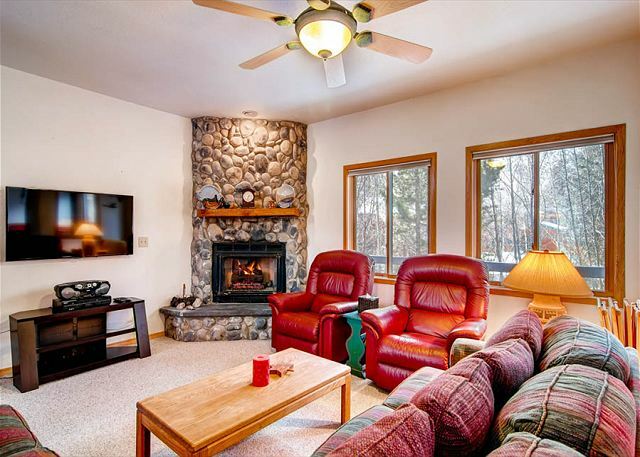 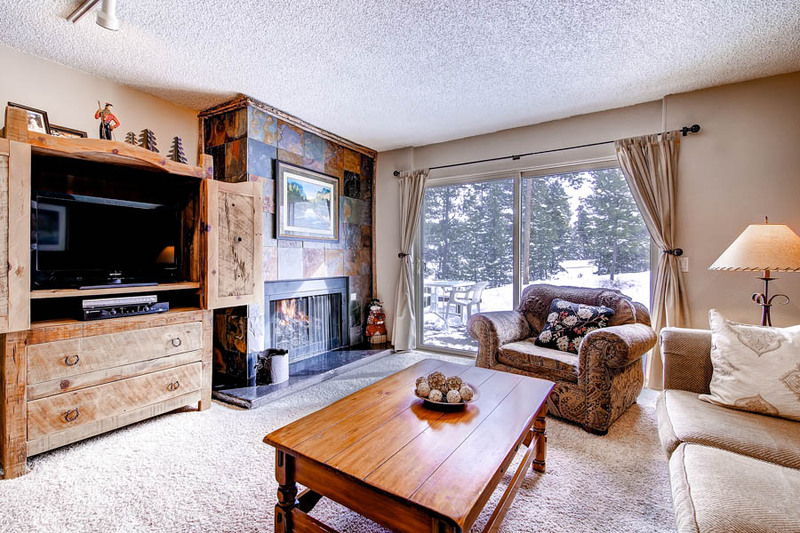 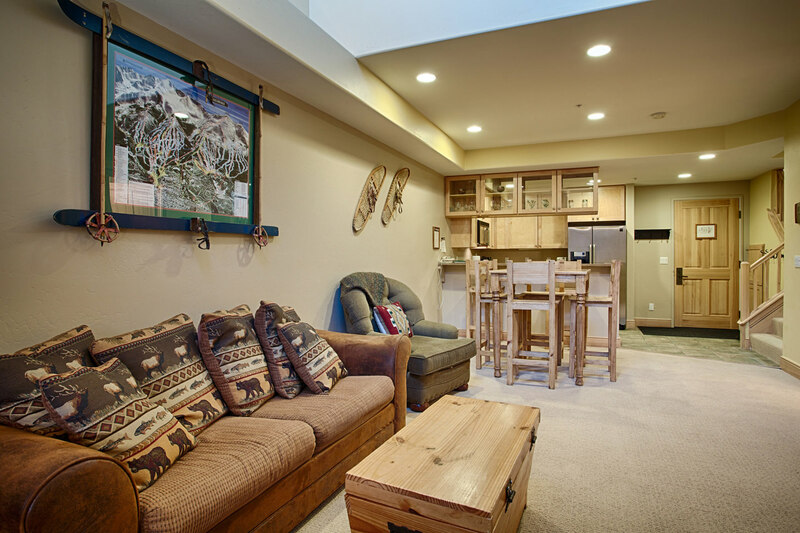 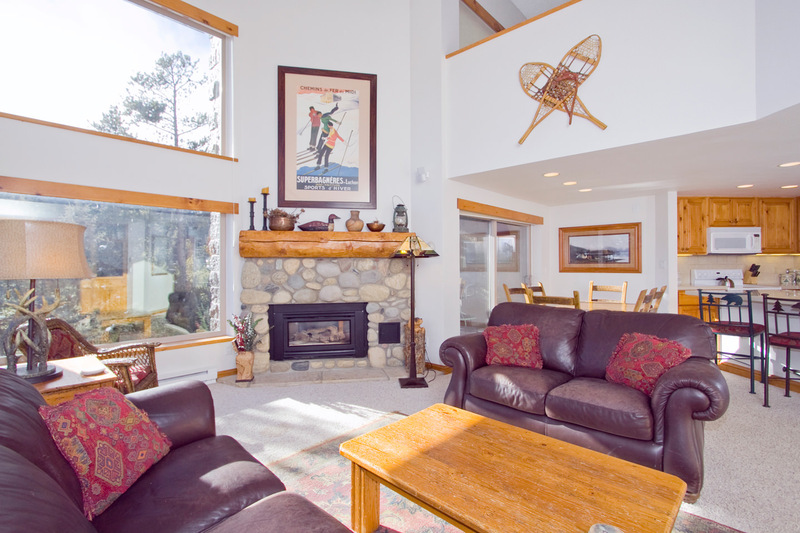 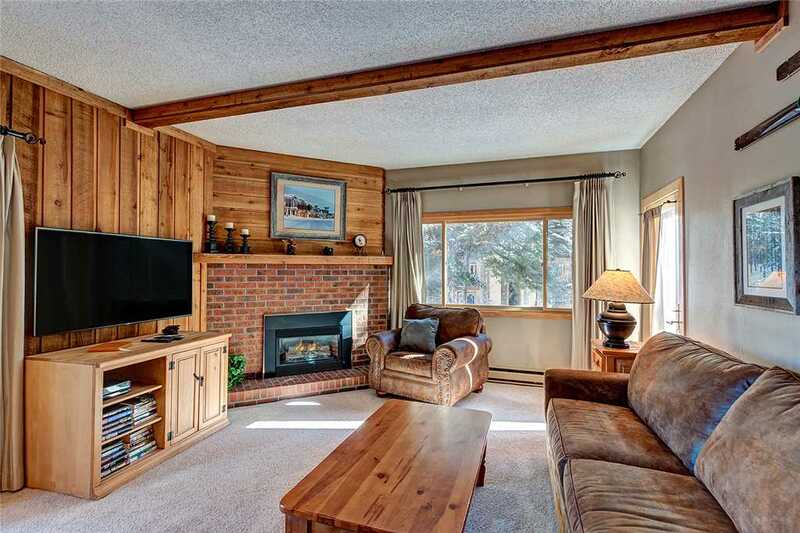 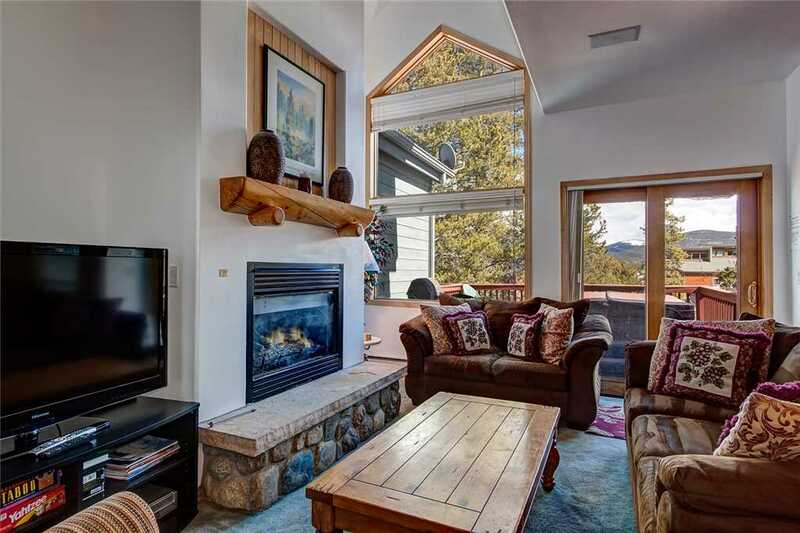 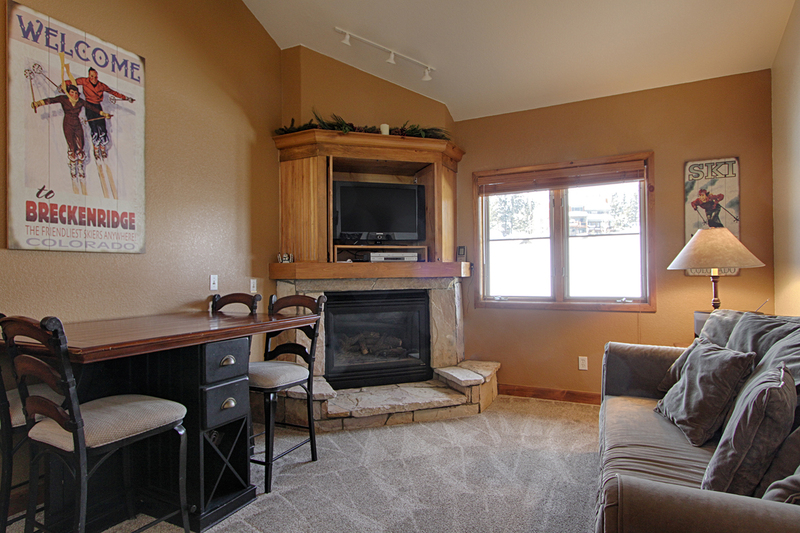 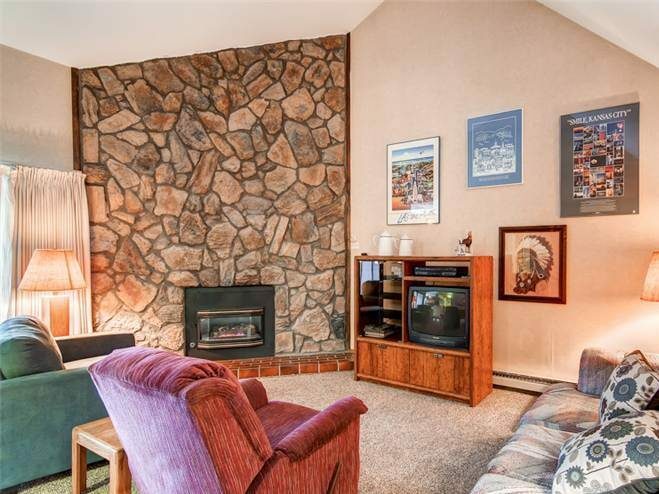 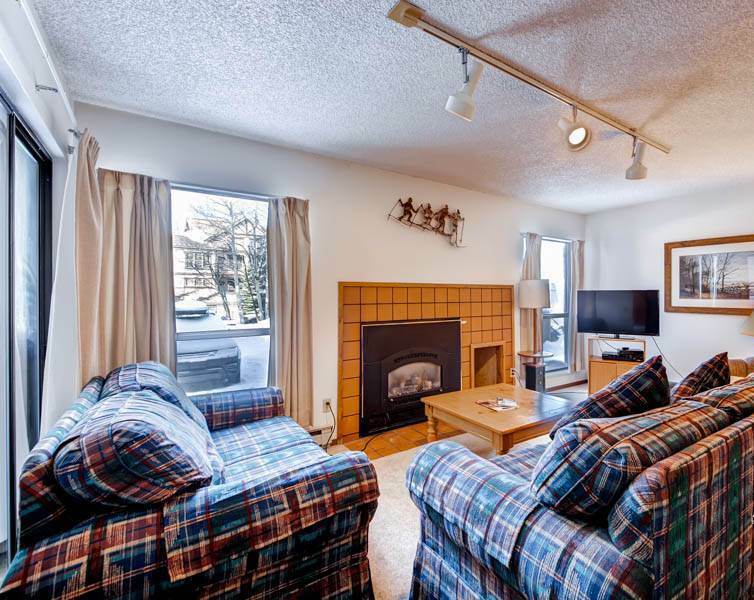 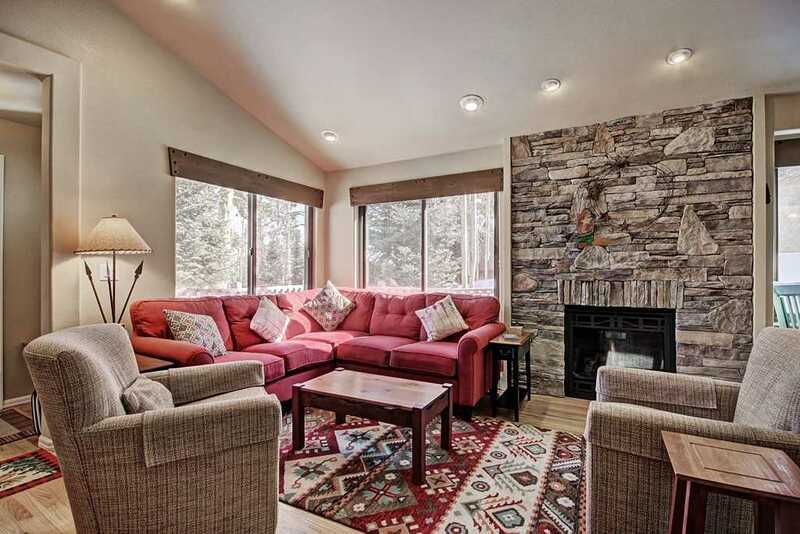 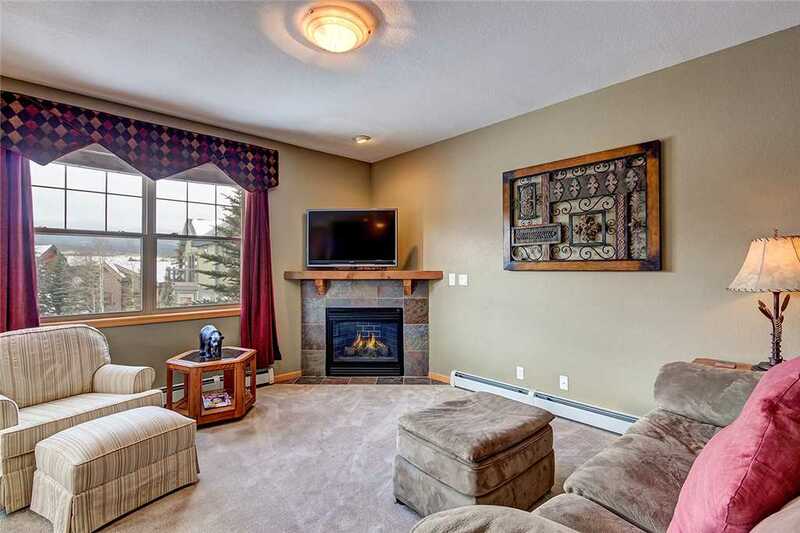 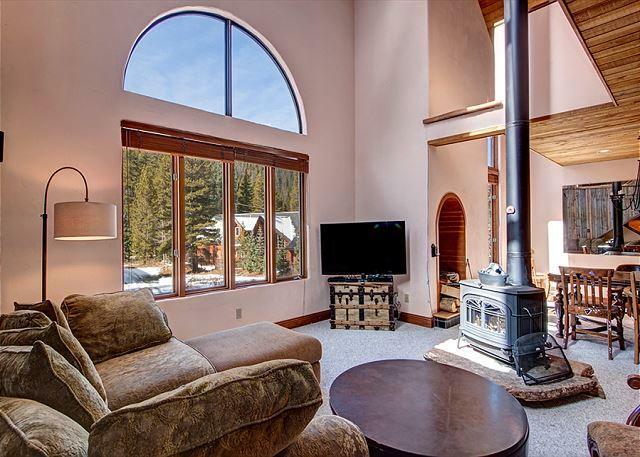 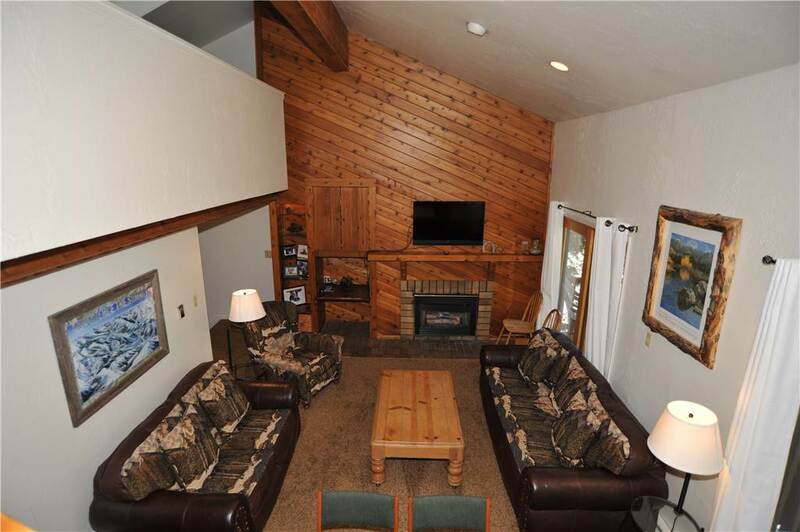 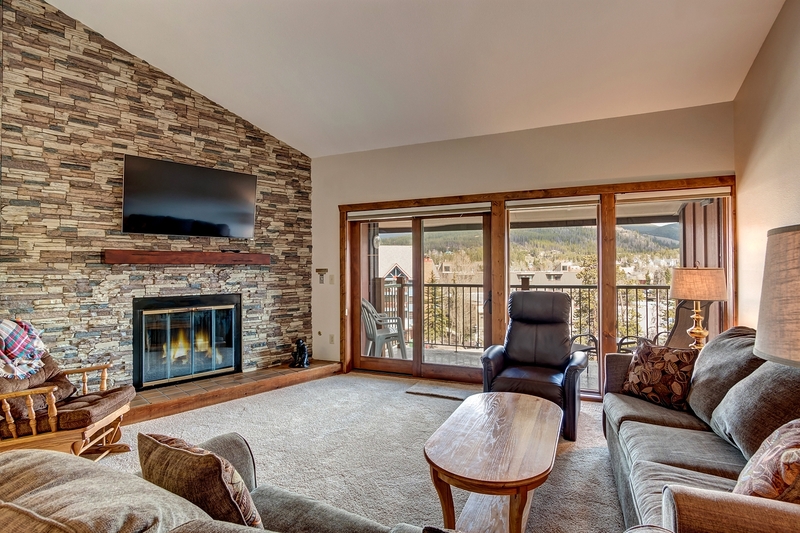 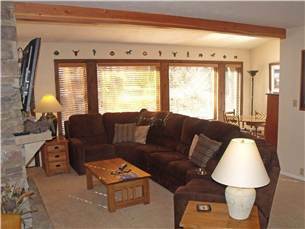 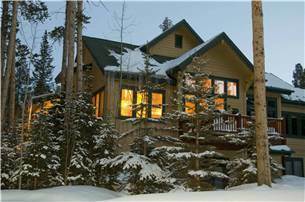 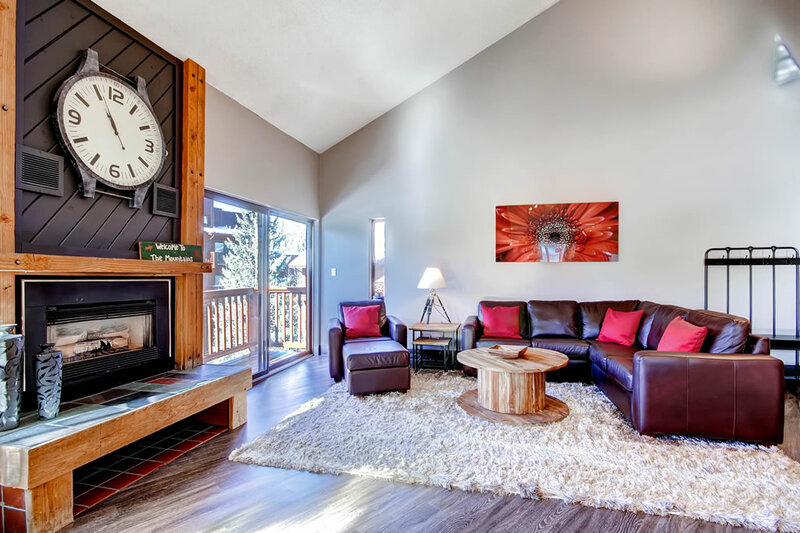 The unique, ski decor inspired, has an open design and features a great living room focused around the decorative rock, gas fireplace. 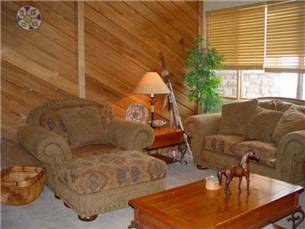 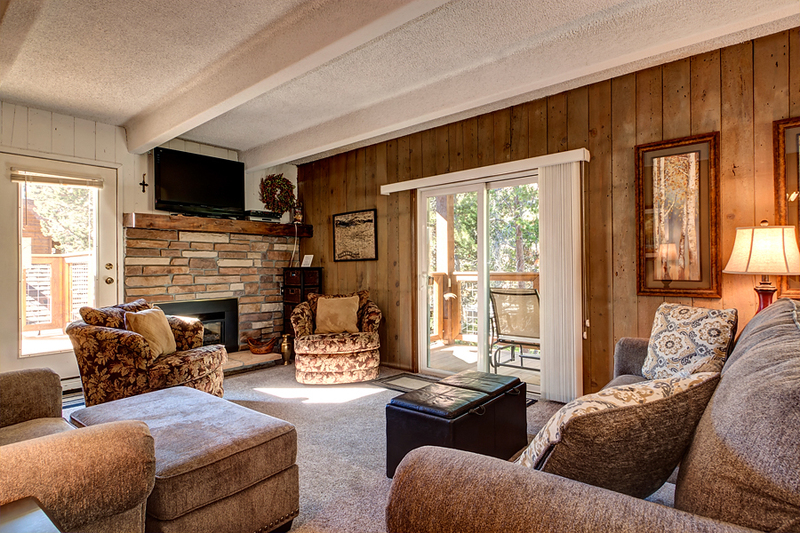 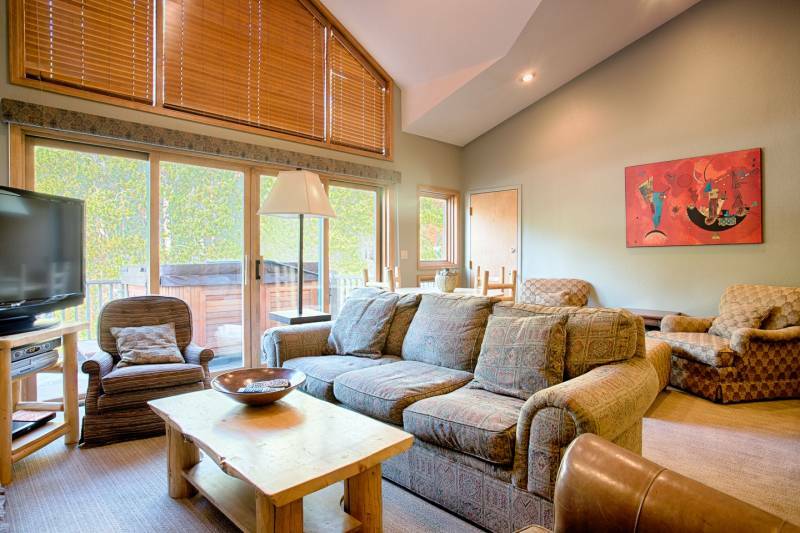 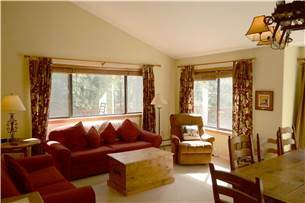 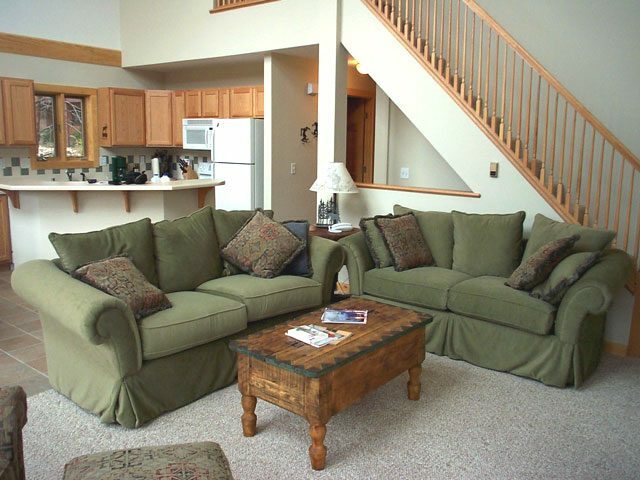 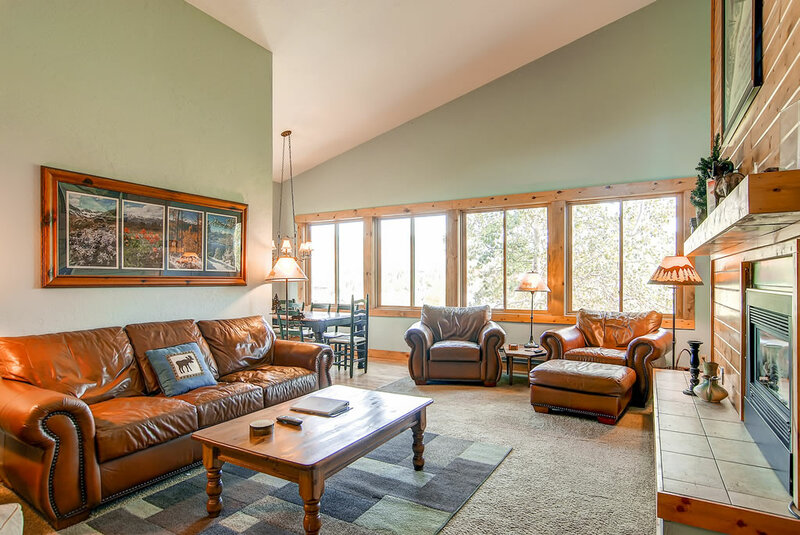 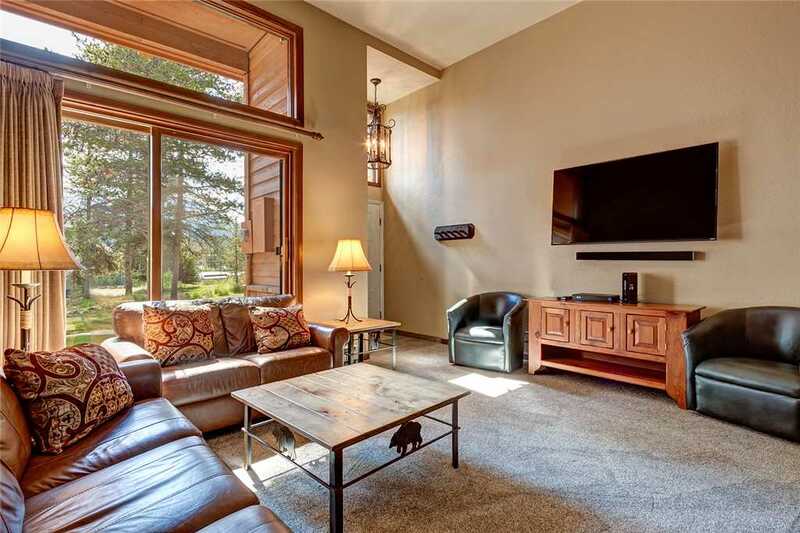 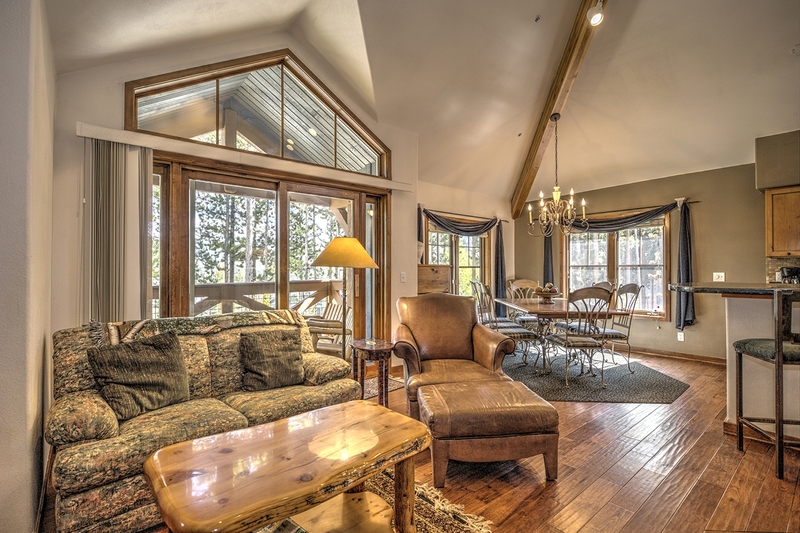 Enjoy ample seating on the large plush couch or two cozy side chairs with the warmth of sunlight pouring through the large sliding glass doors as you read your vacation book in peace. 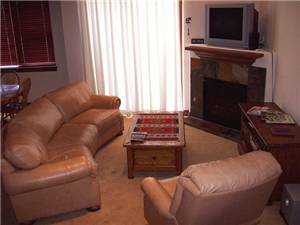 Maybe your group would be more satisfied watching a fun DVD on the flat screen TV. 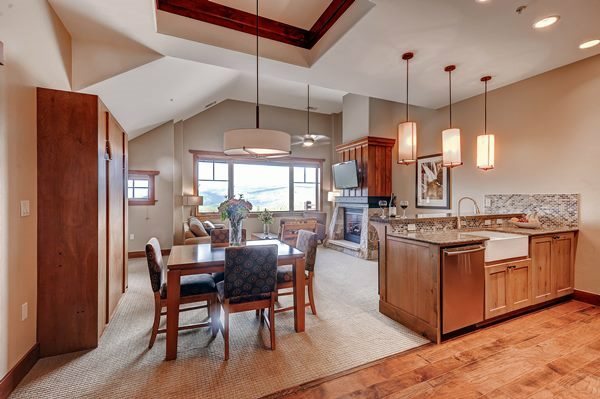 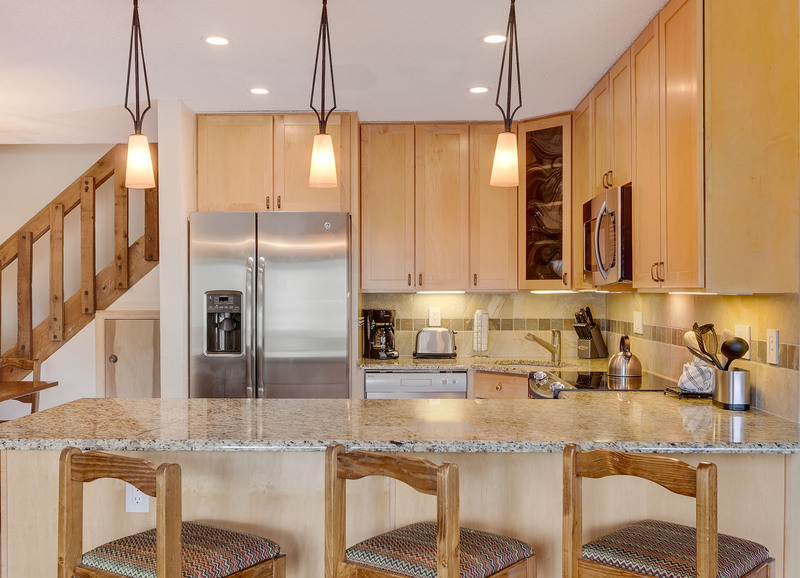 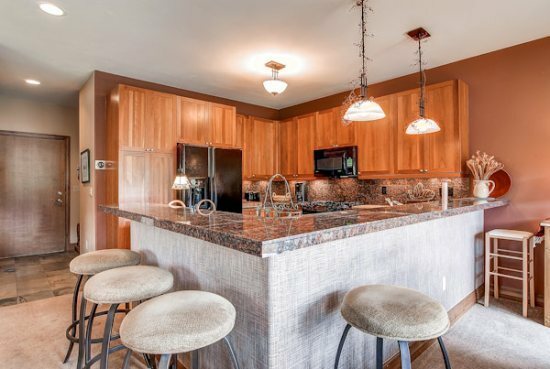 Just off the living room is the full service, suitably stocked kitchen with wood cabinets and an encompassing design that makes cooking a breeze. 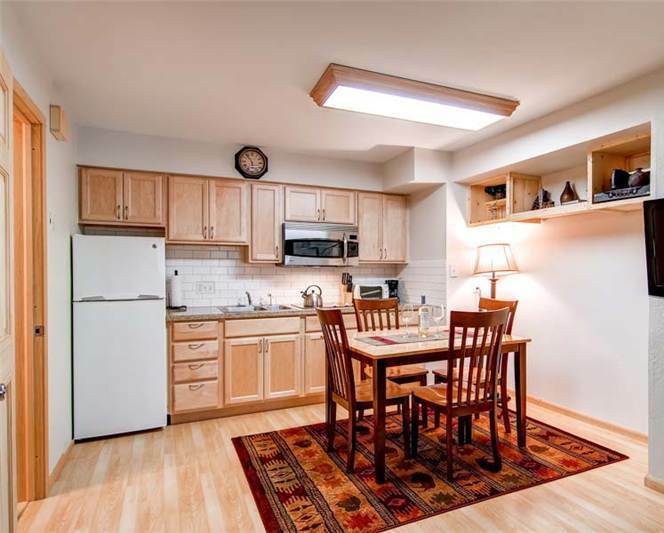 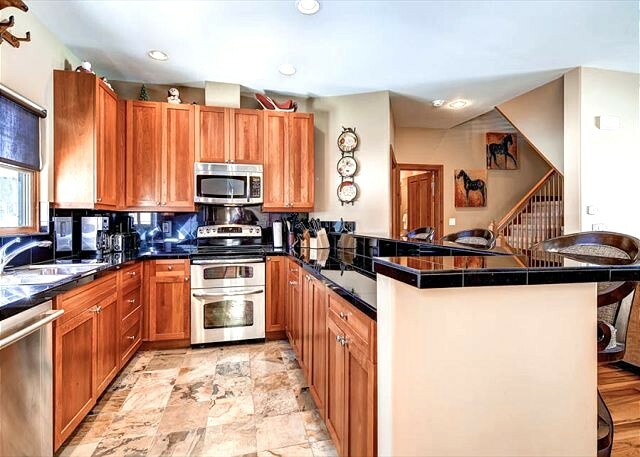 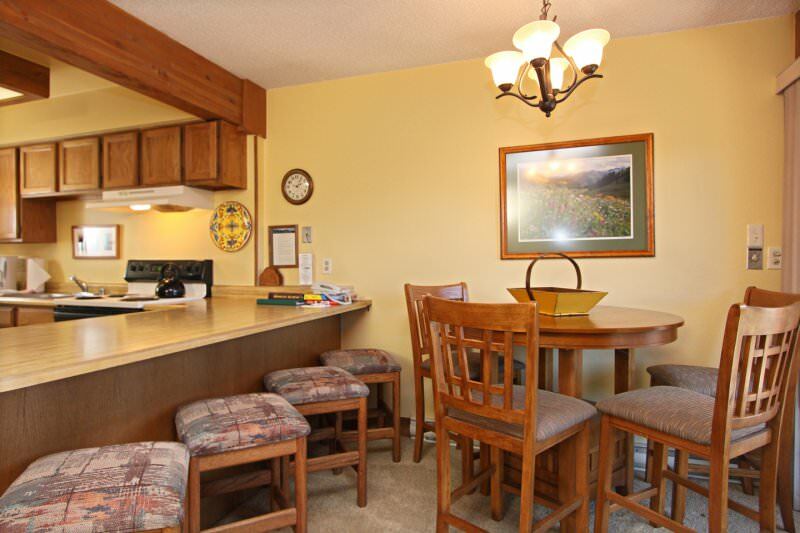 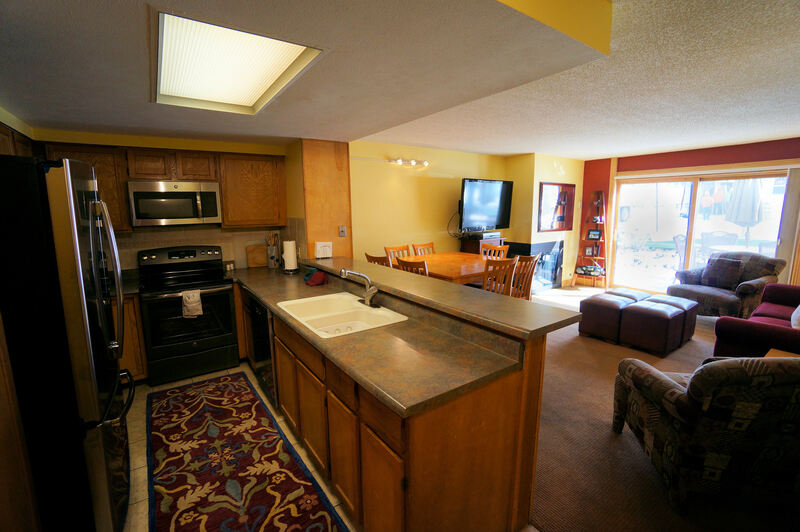 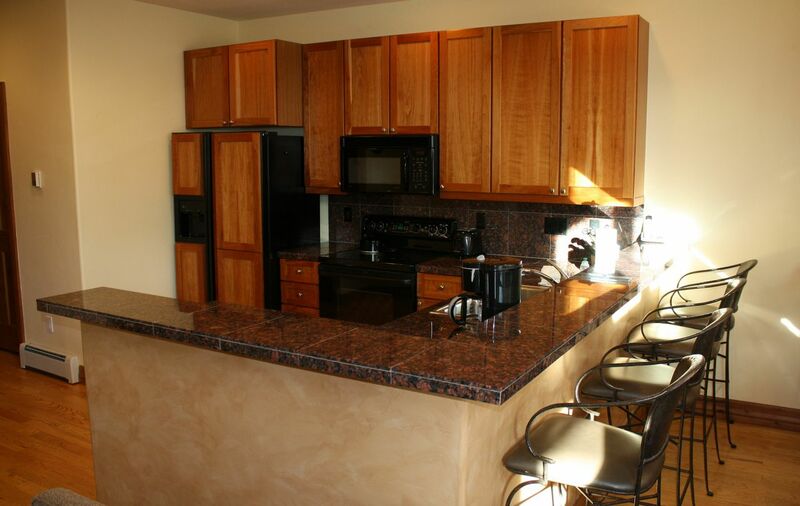 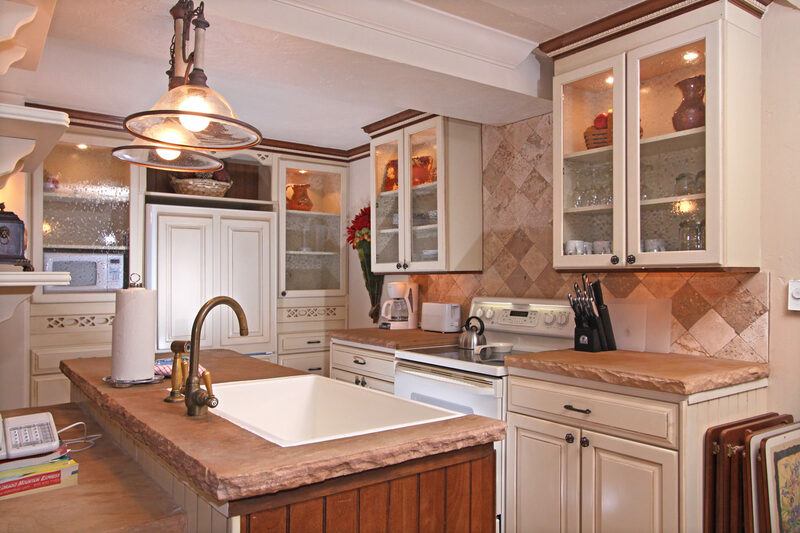 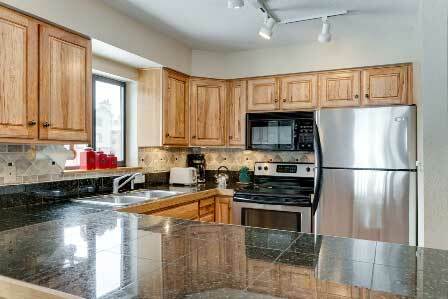 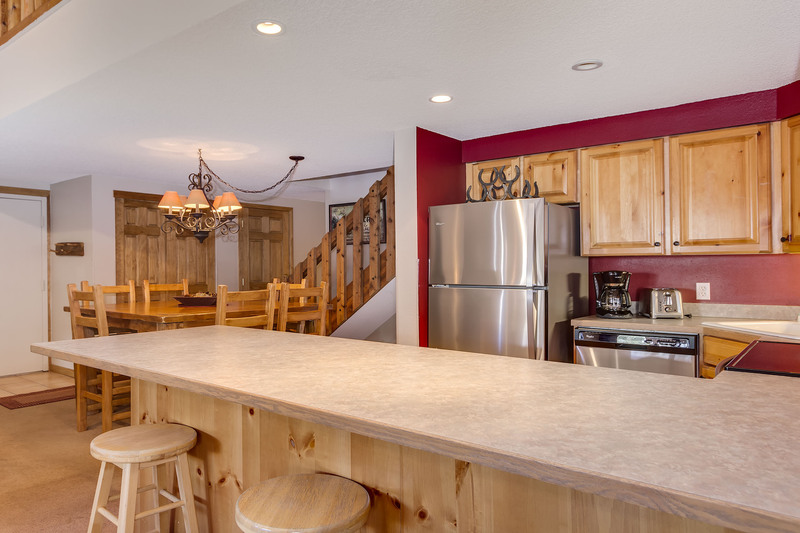 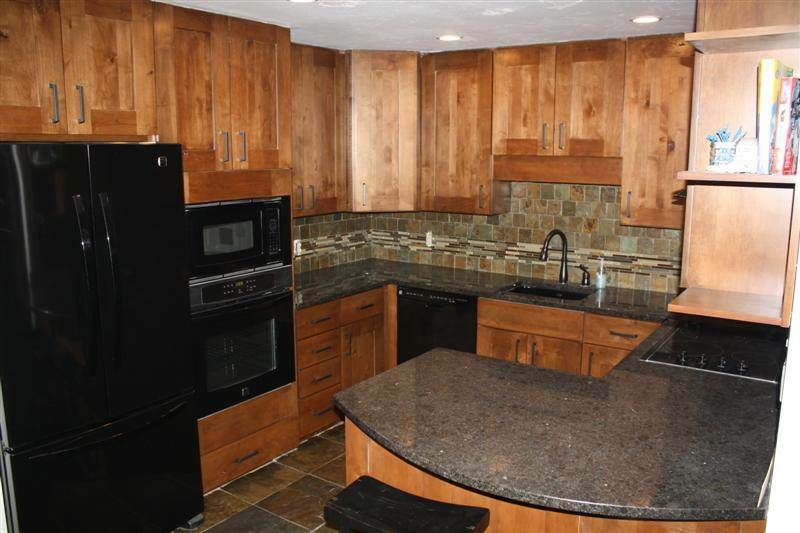 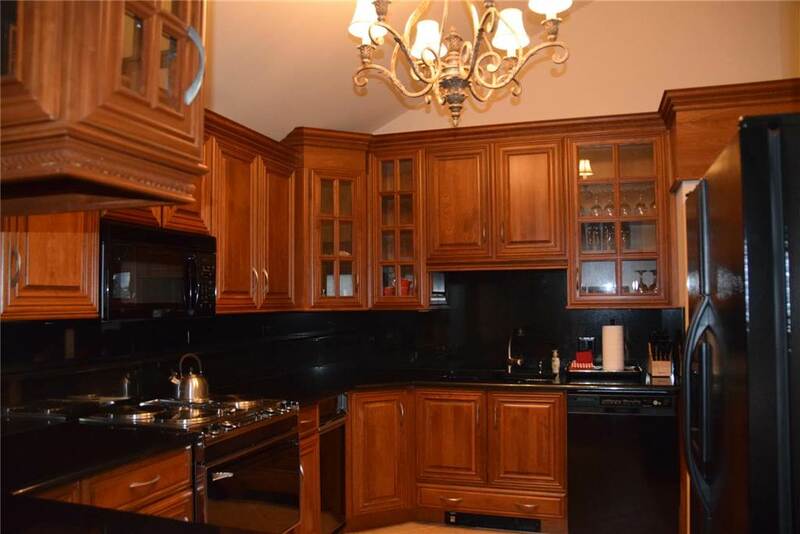 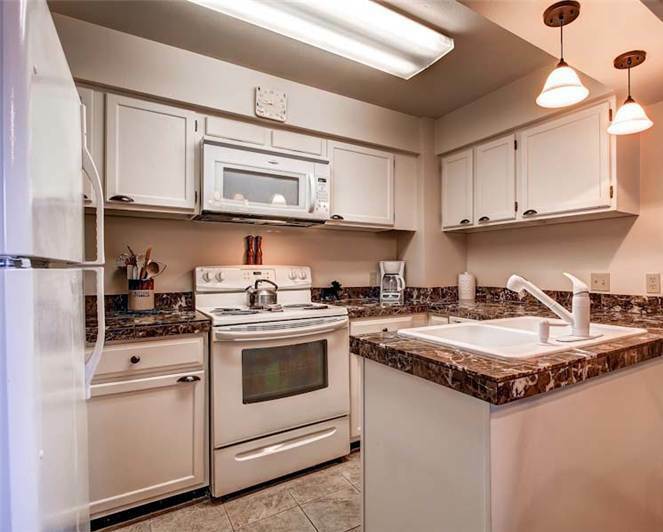 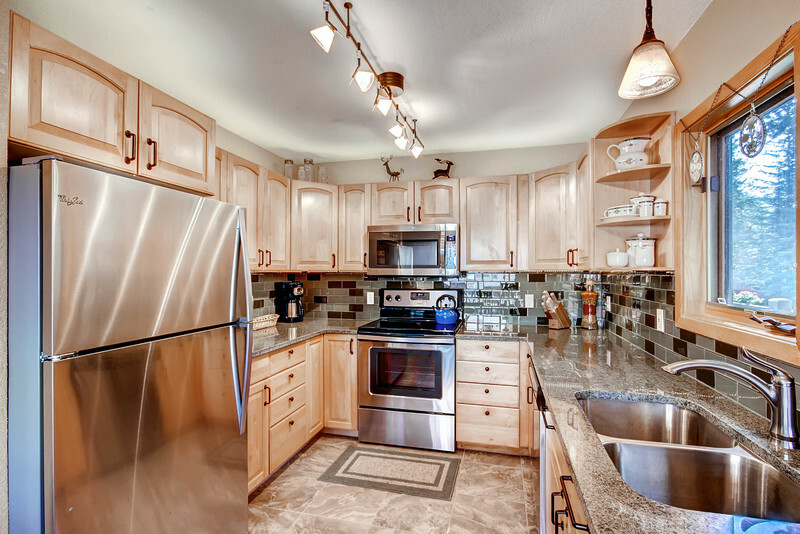 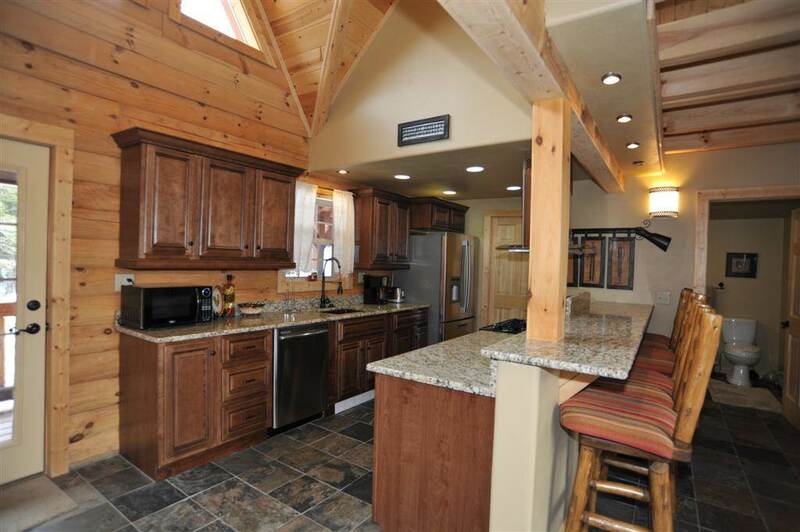 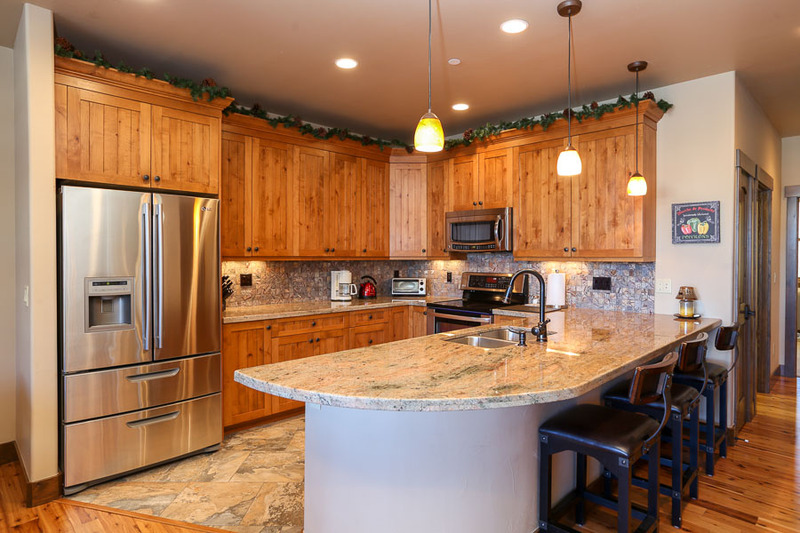 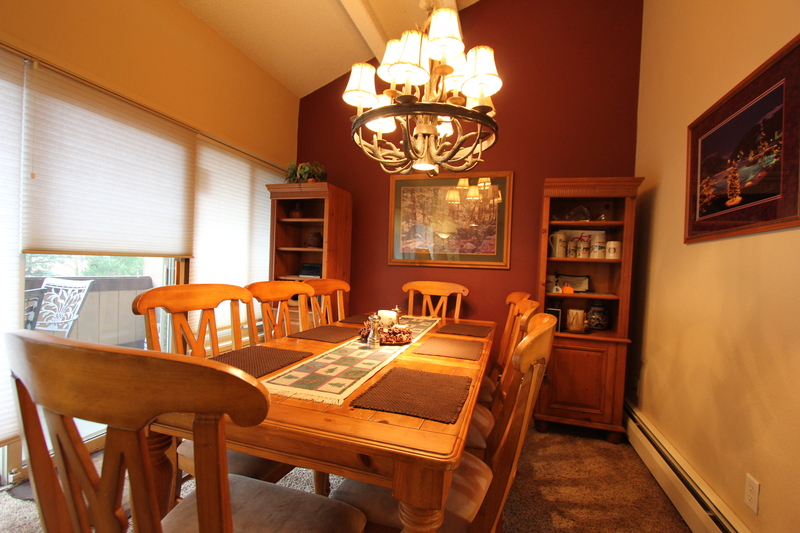 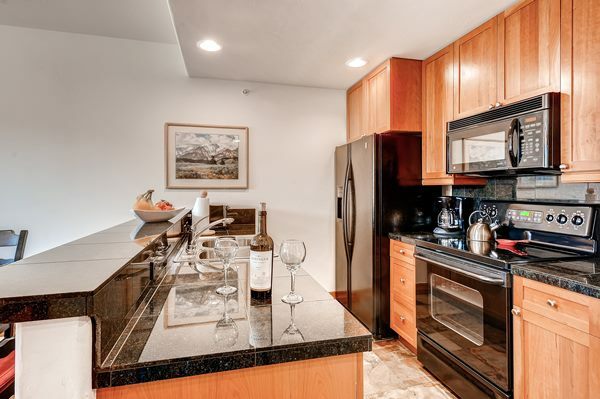 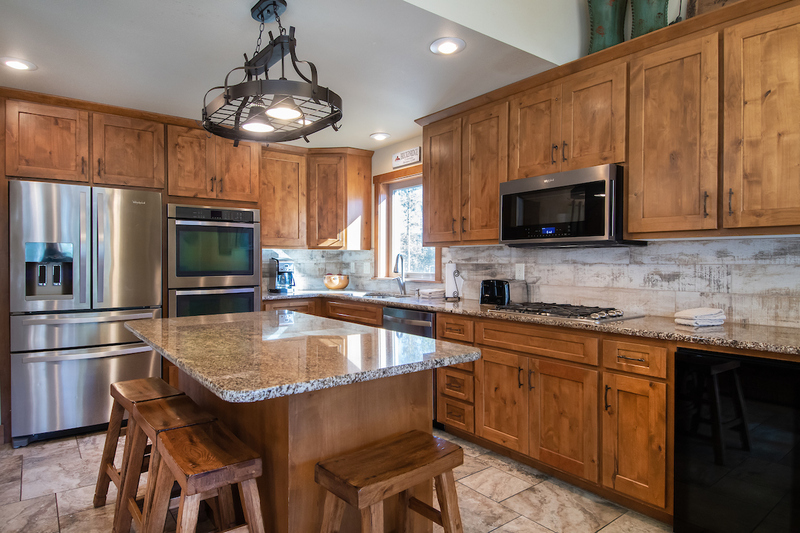 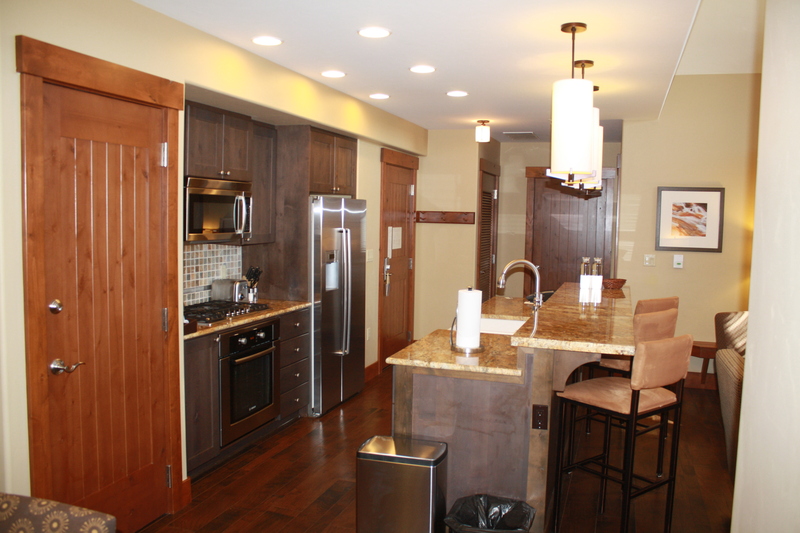 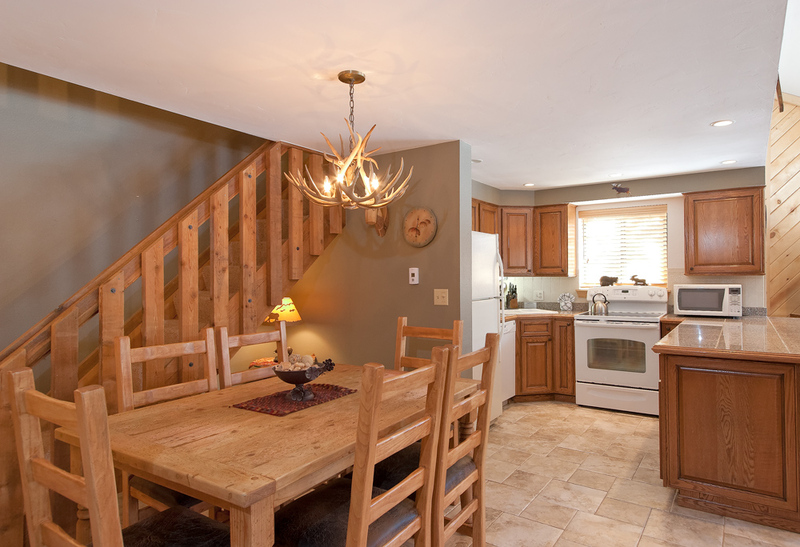 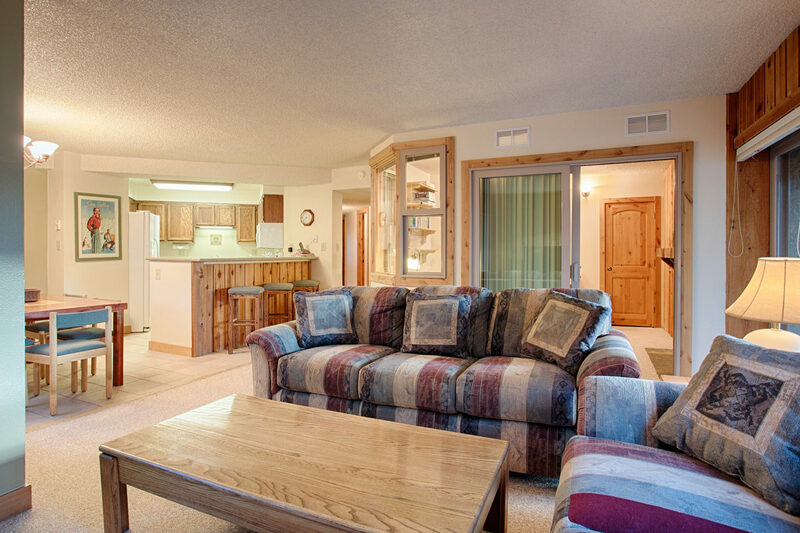 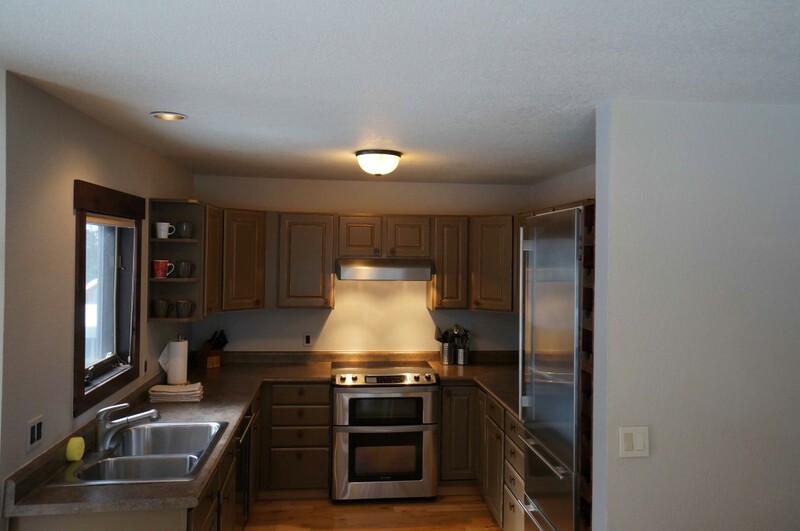 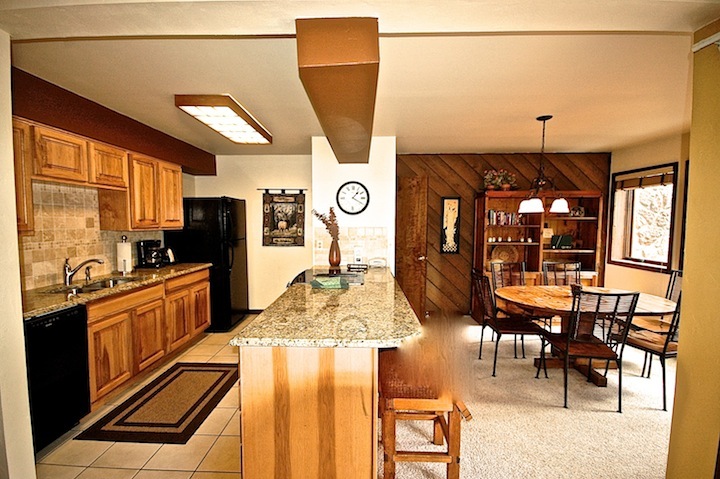 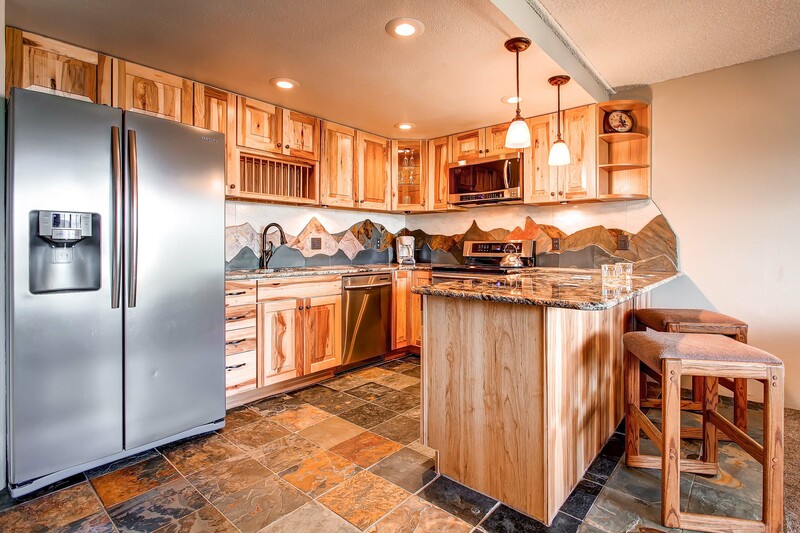 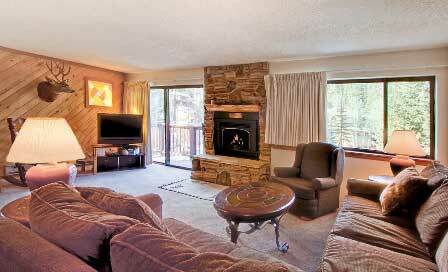 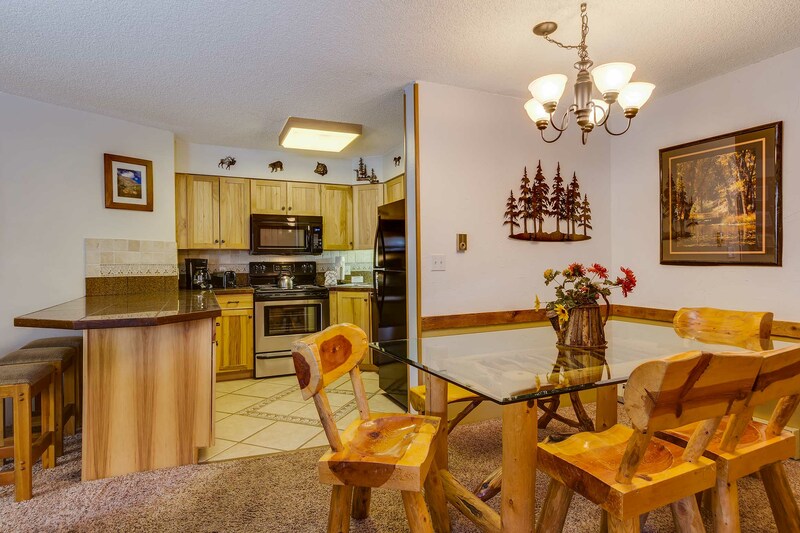 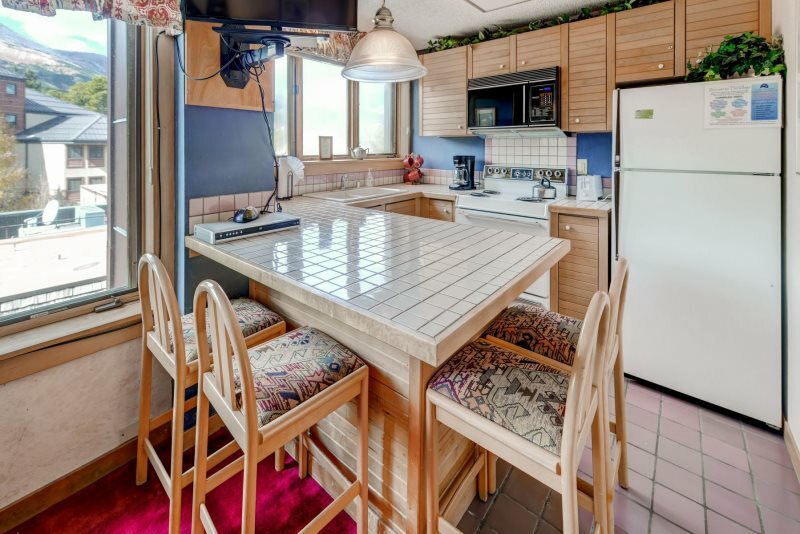 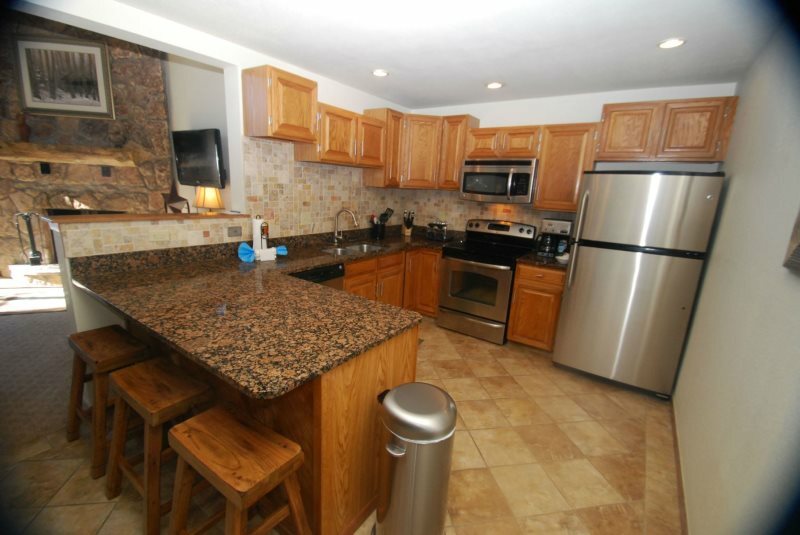 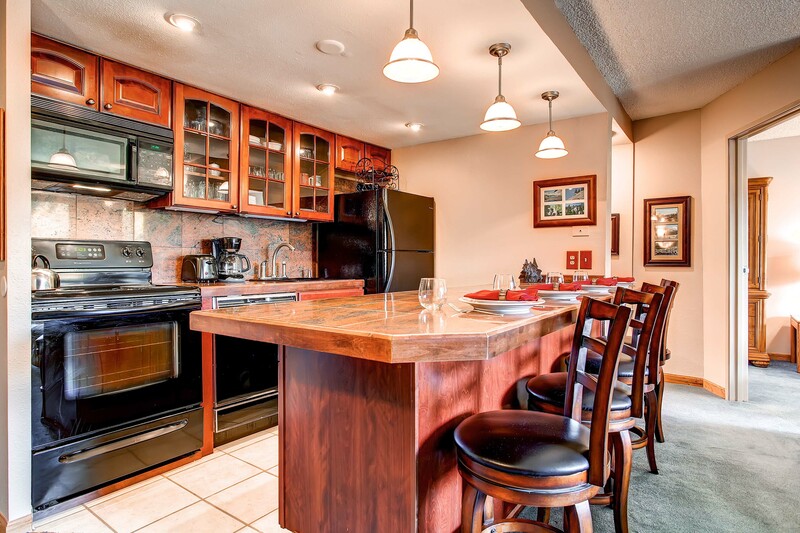 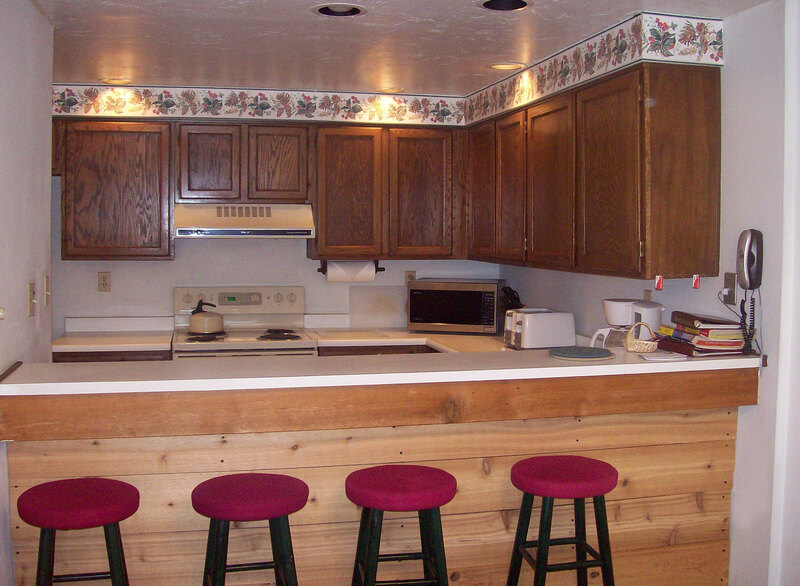 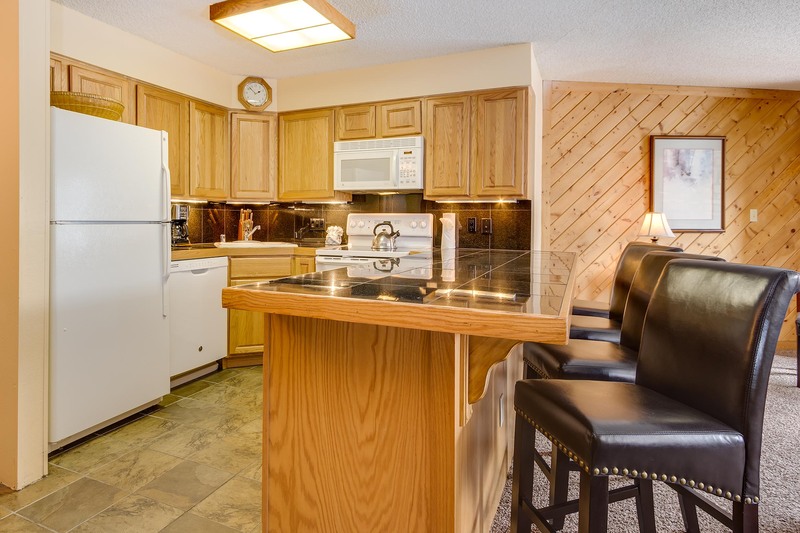 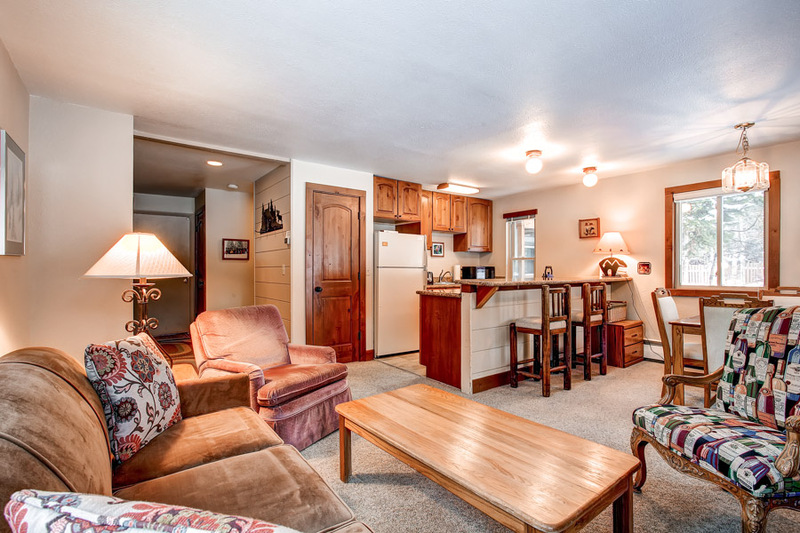 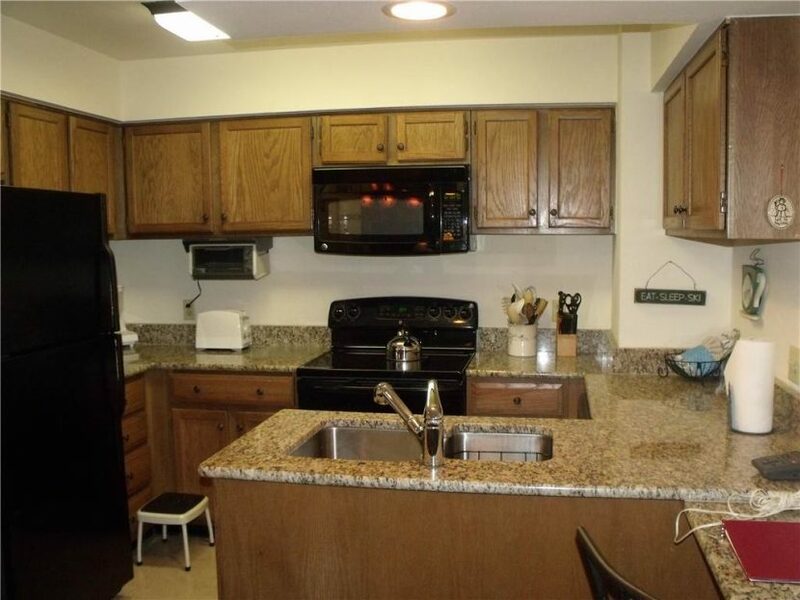 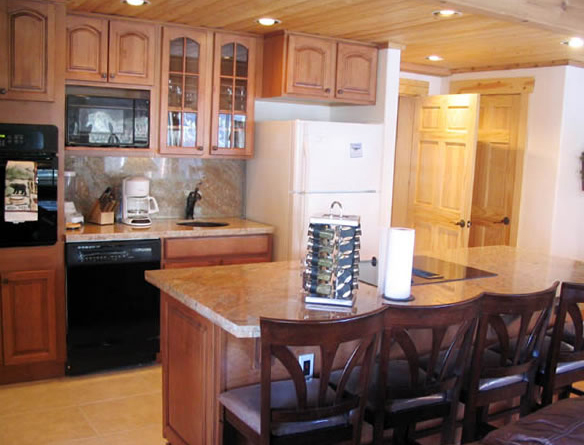 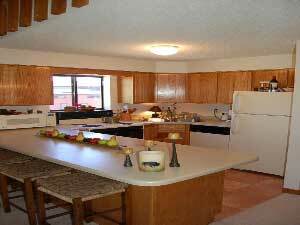 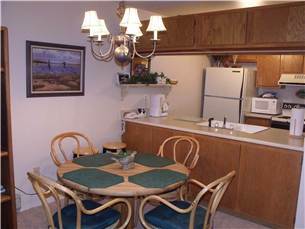 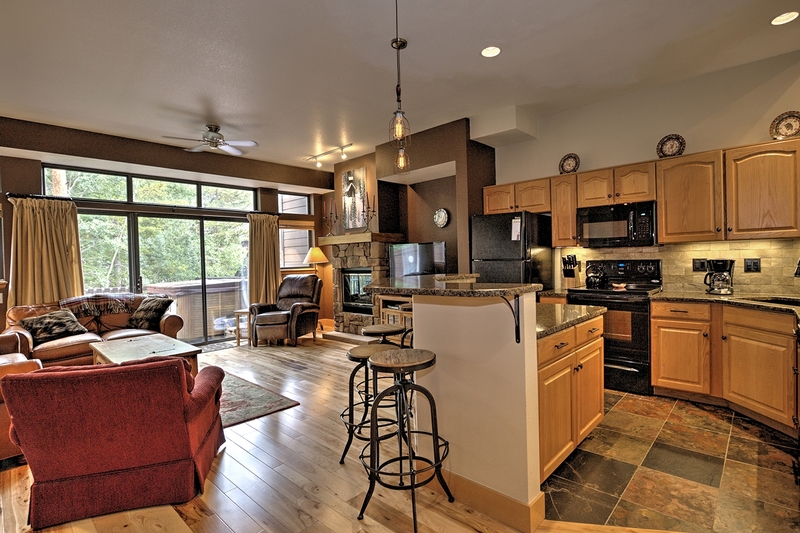 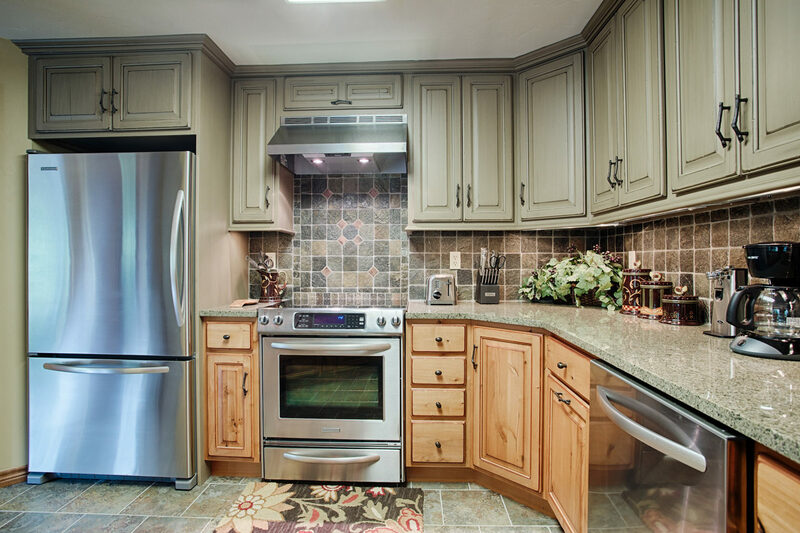 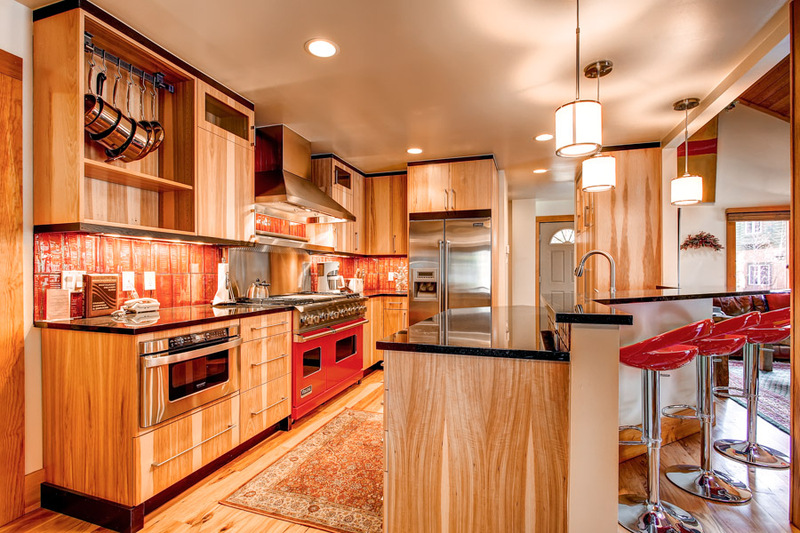 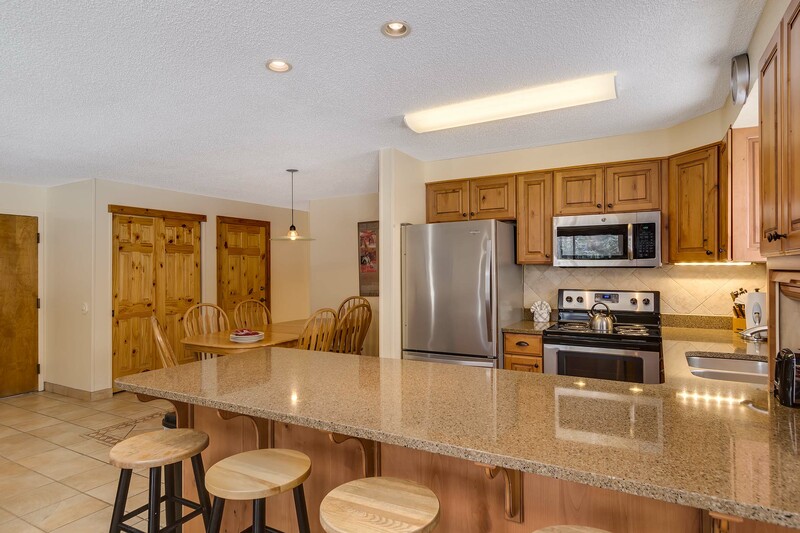 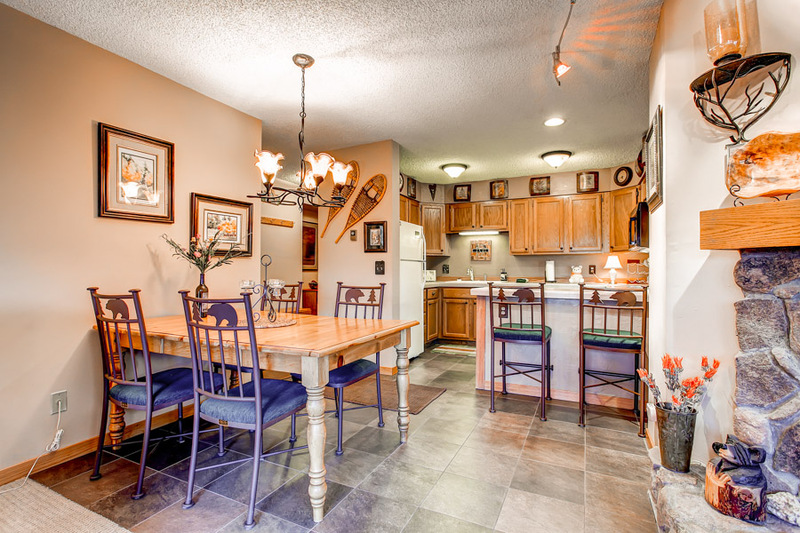 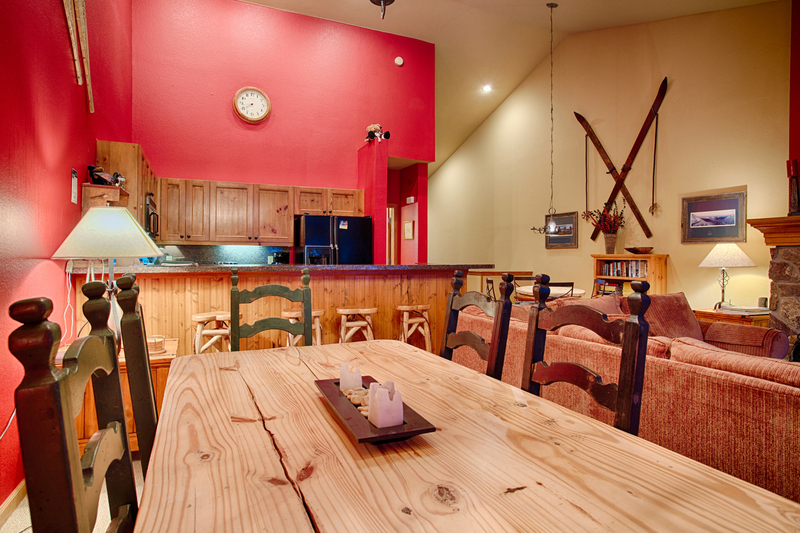 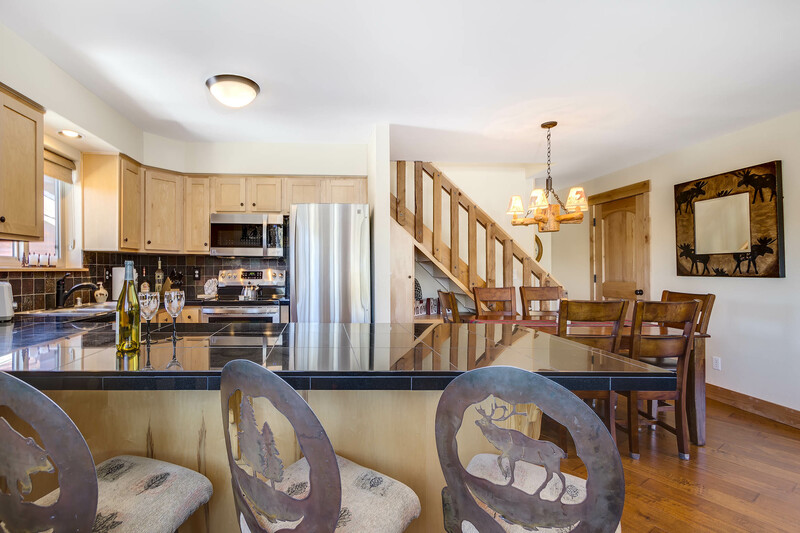 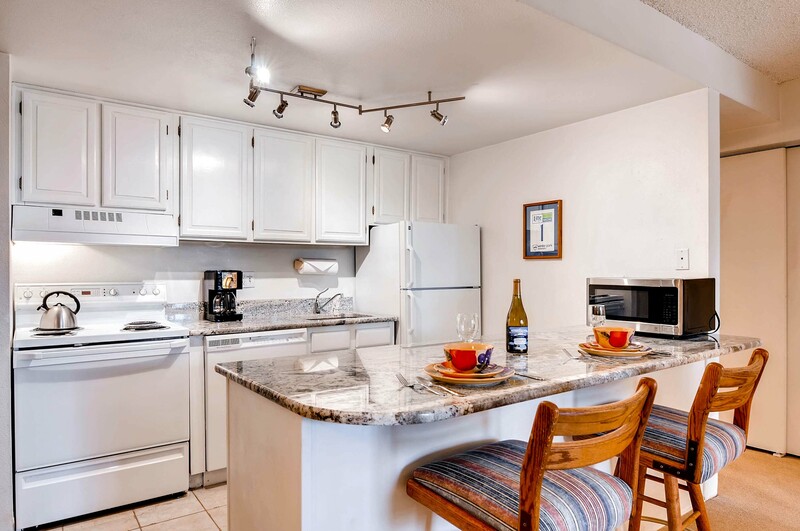 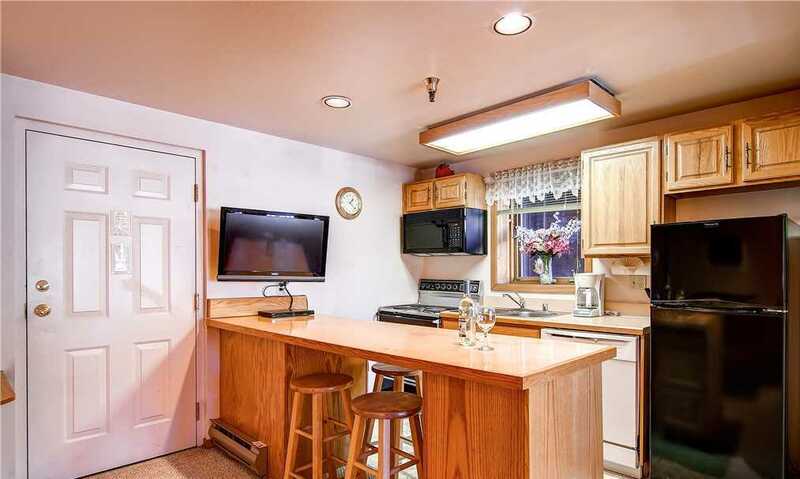 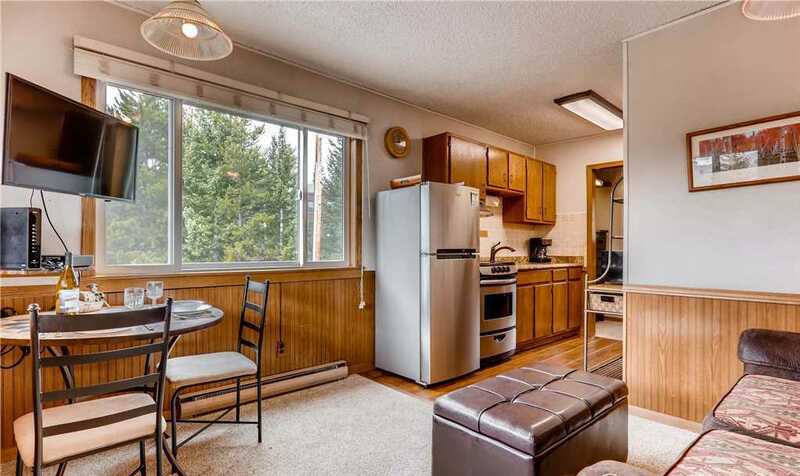 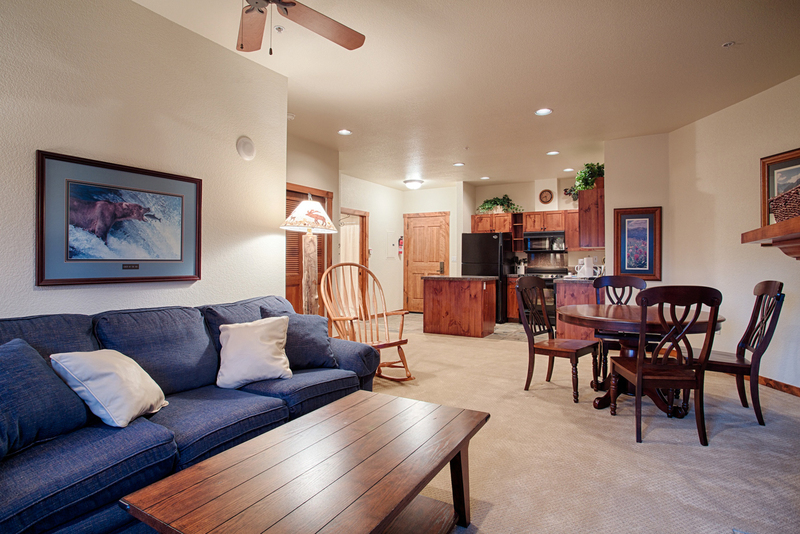 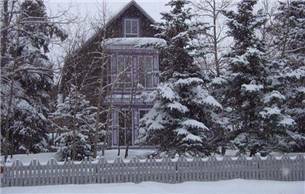 The kitchen also has all the necessary appliances; dishwasher, microwave, stove, oven, and refrigerator. 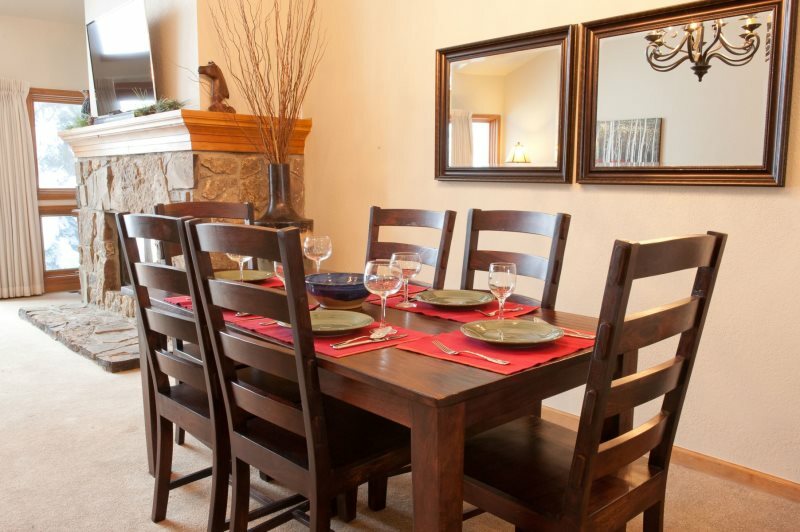 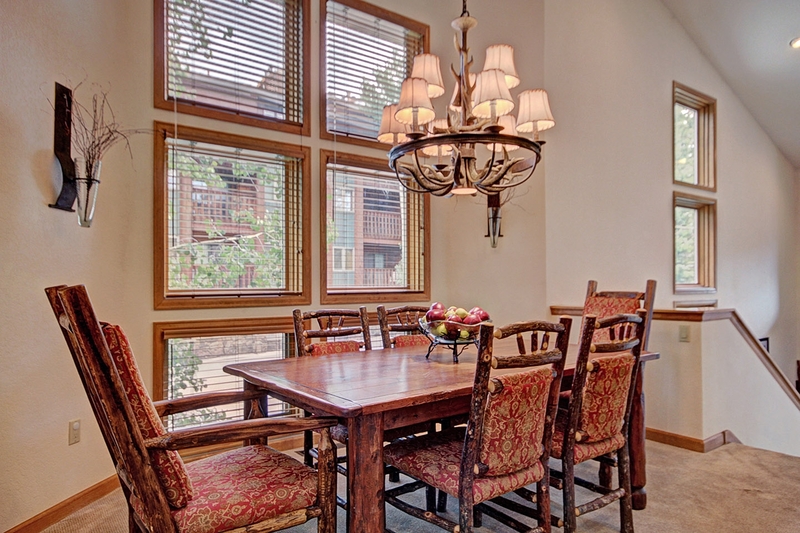 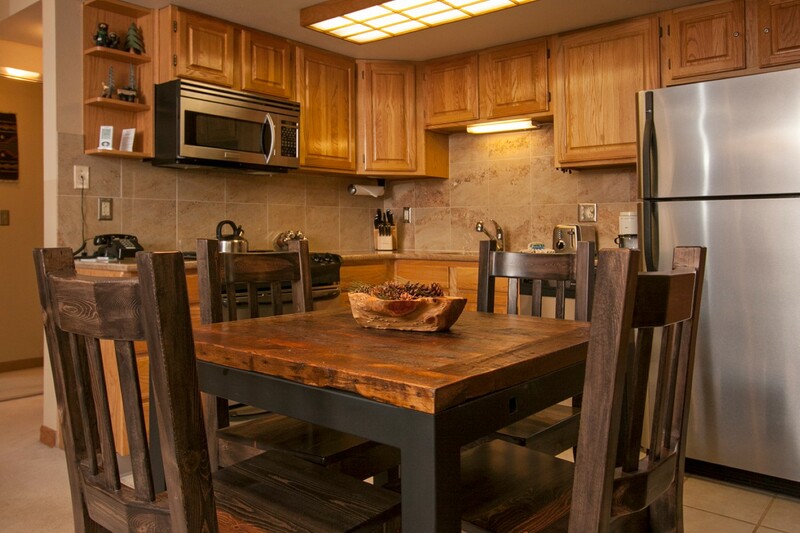 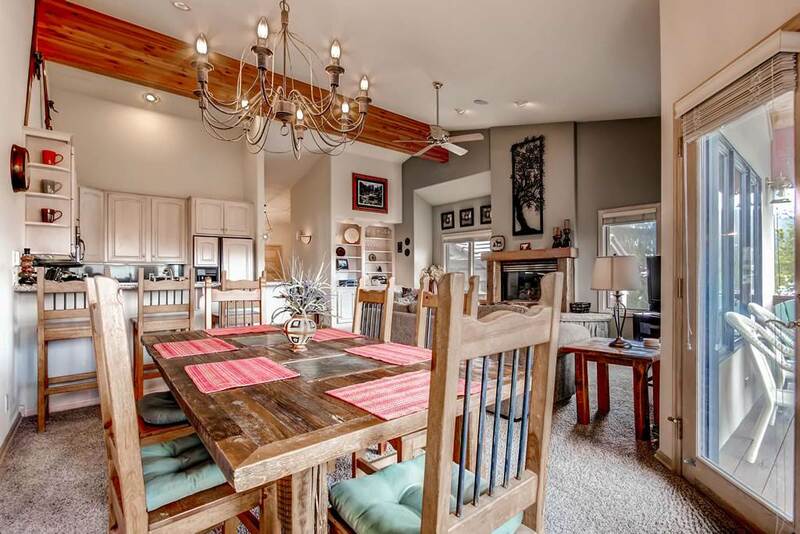 Enjoy a home cooked meal in the comfort of your own townhome at the wood dining table that has seating for six people with dinnerware and glassware provided. 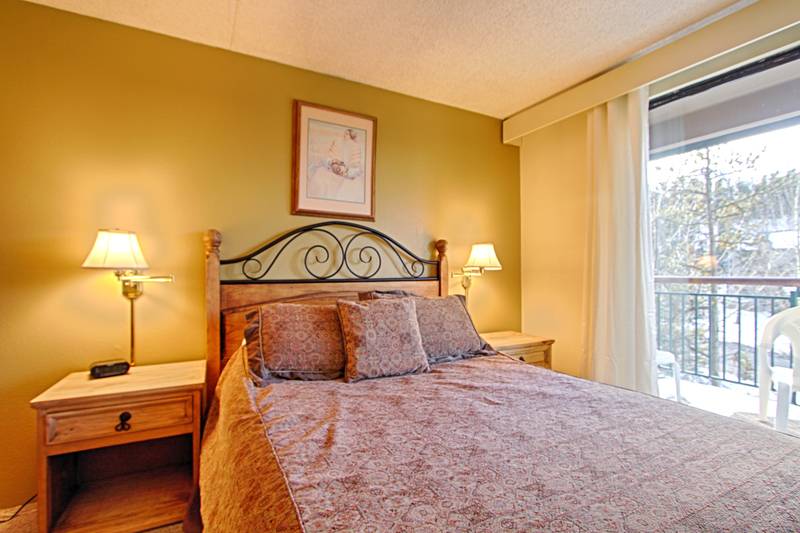 The cozy master bedroom has a comfortable Queen bed encased in luxurious bedding, a TV and unique bedside windows that allow the warm morning sun to be your wake up. 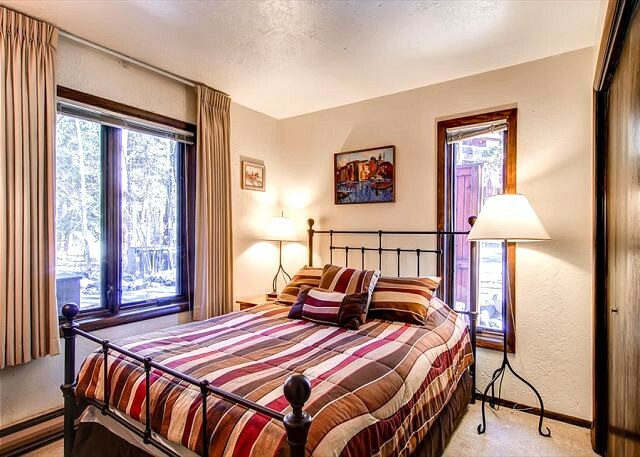 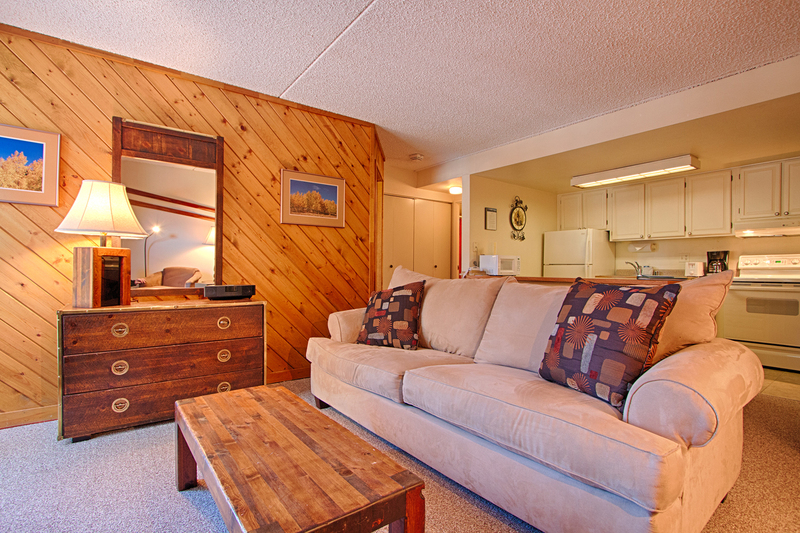 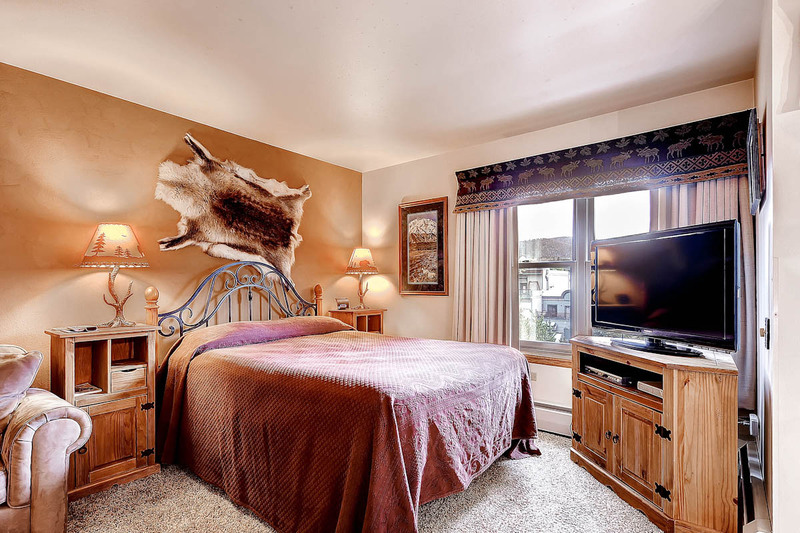 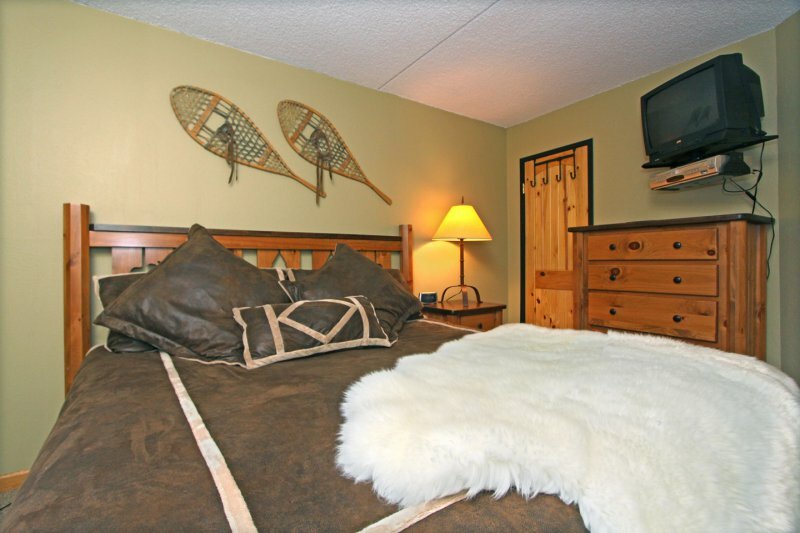 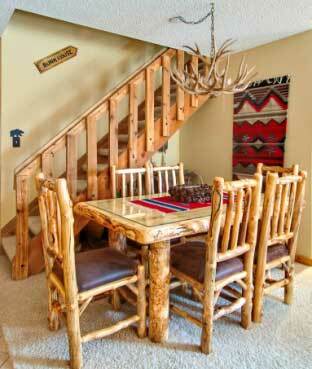 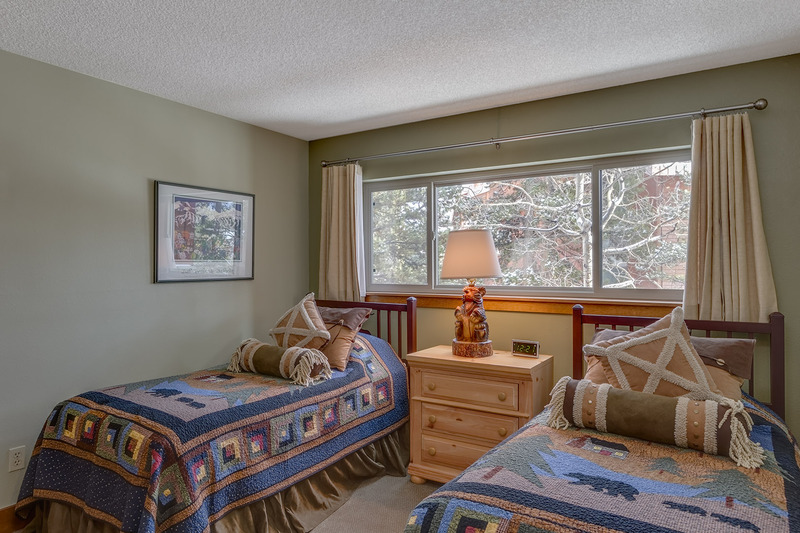 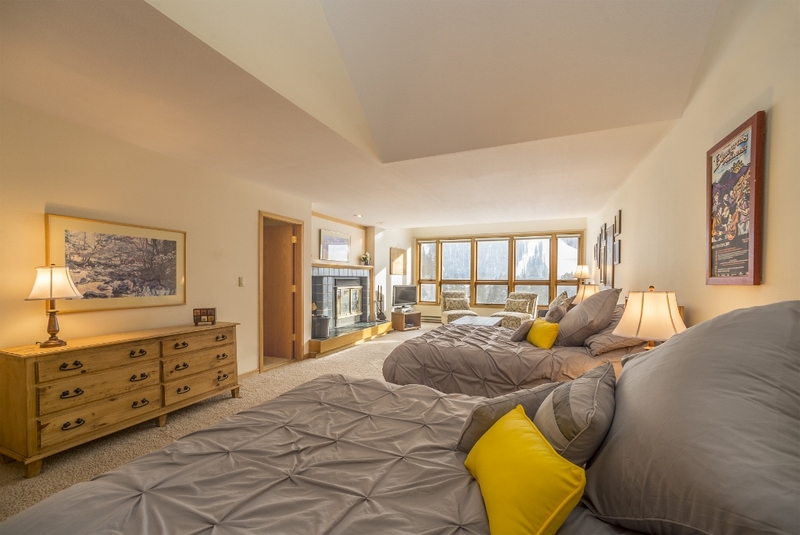 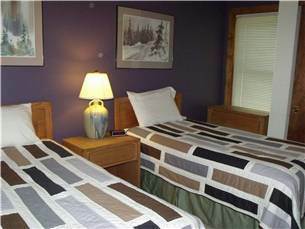 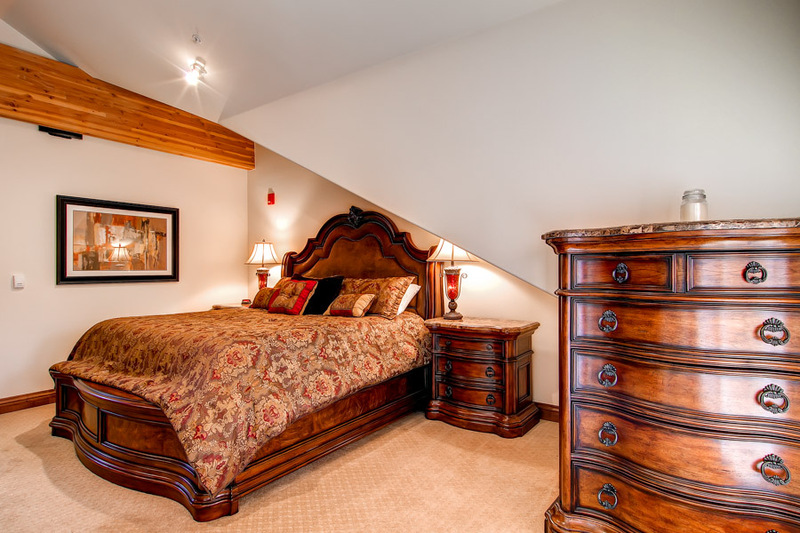 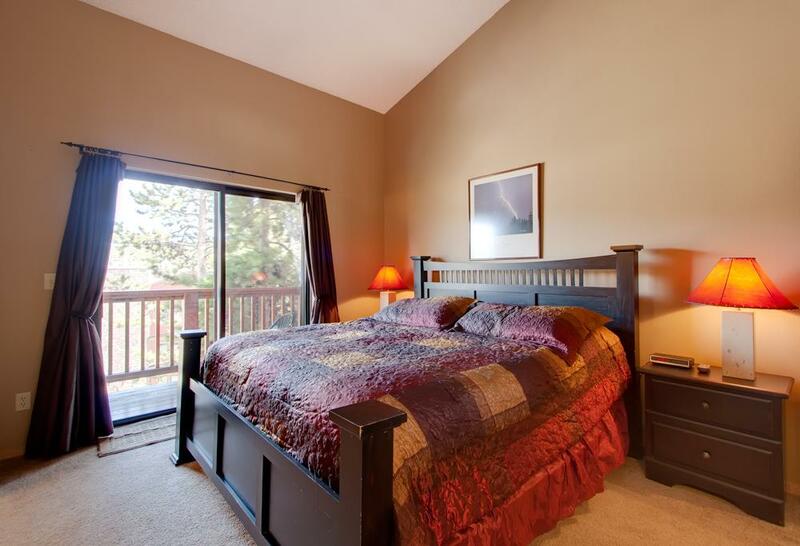 The second bedroom has a Queen bed that is furnished in all natural wood. 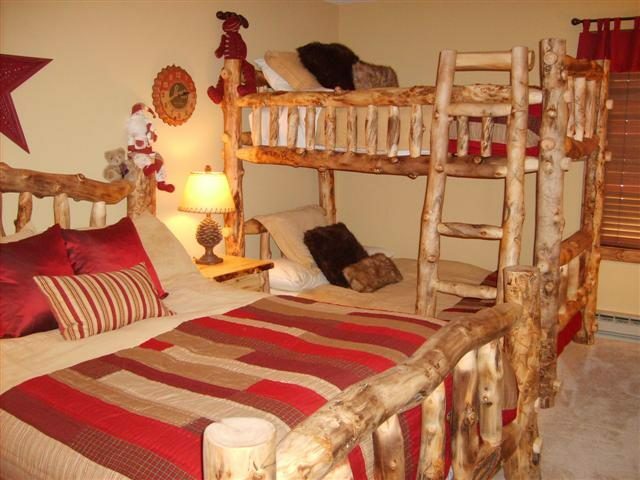 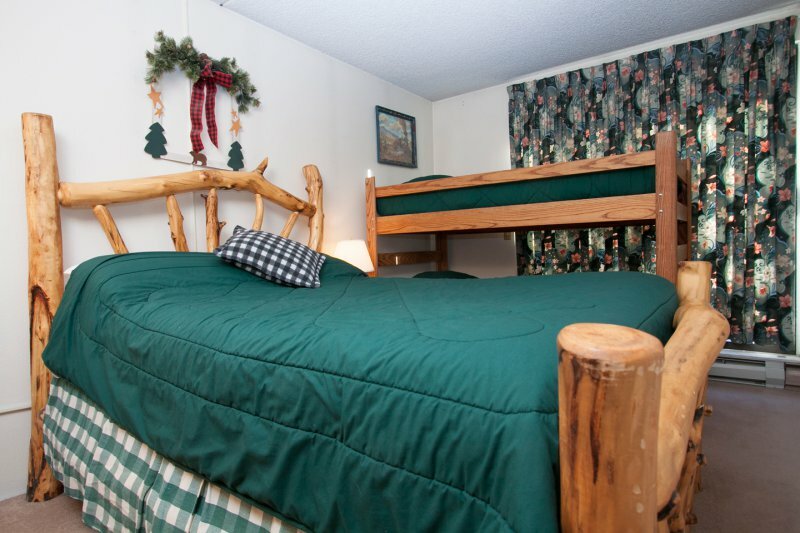 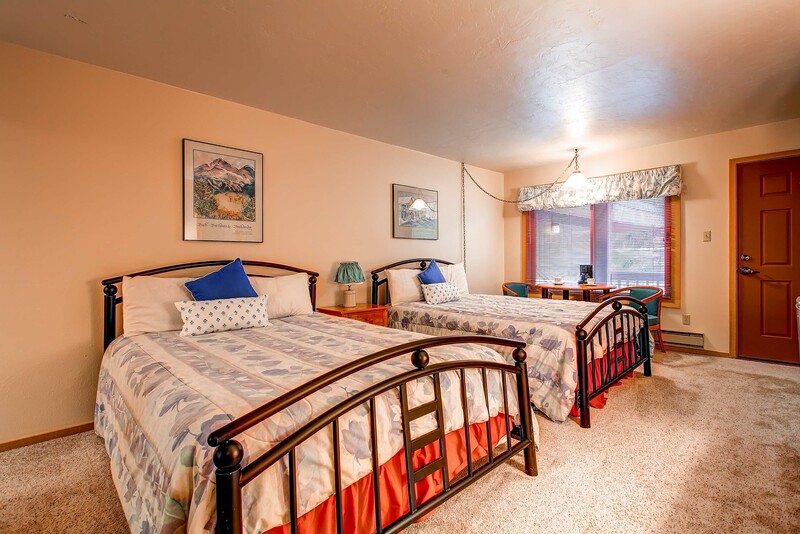 The third bedroom has a beautiful log Captains Bunk with a Double bed on the bottom and a Twin bed on the top. 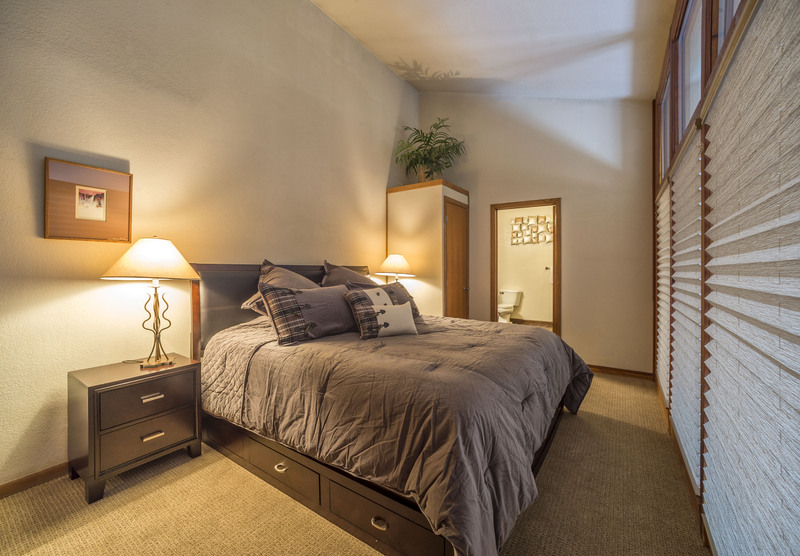 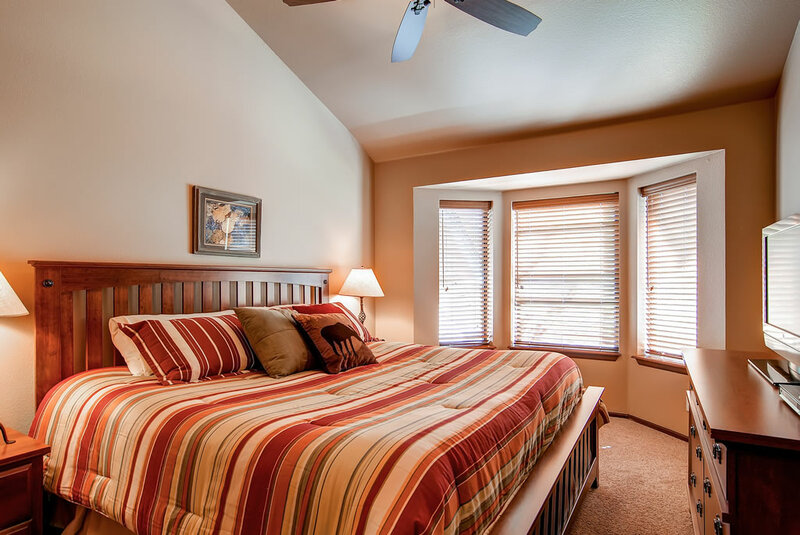 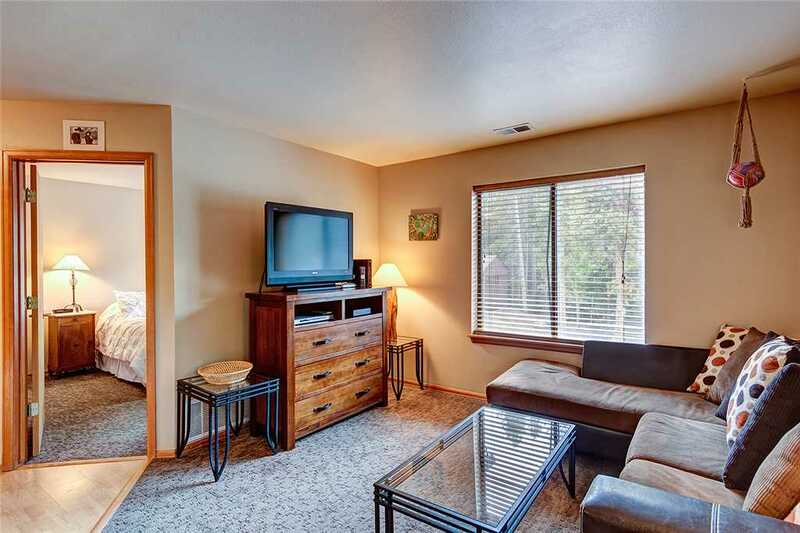 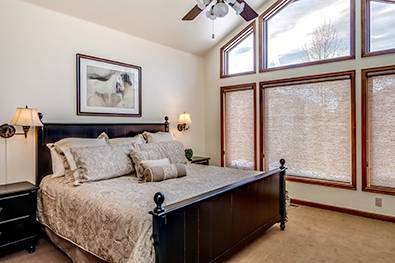 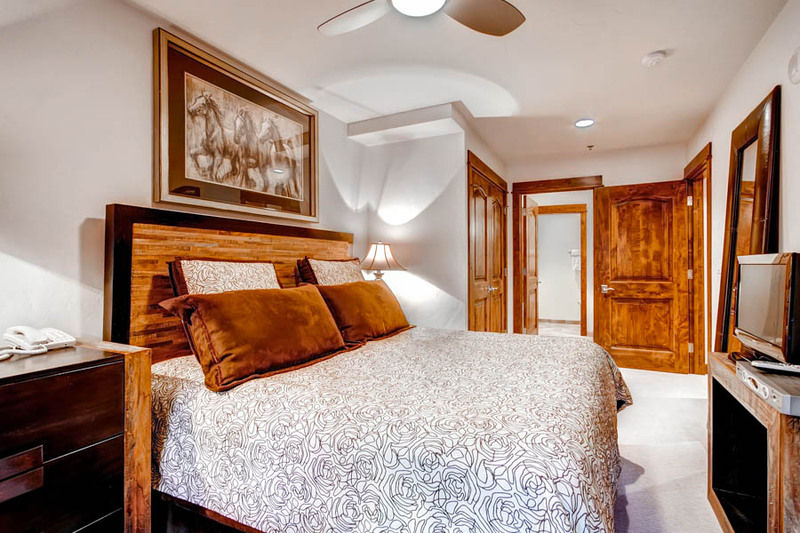 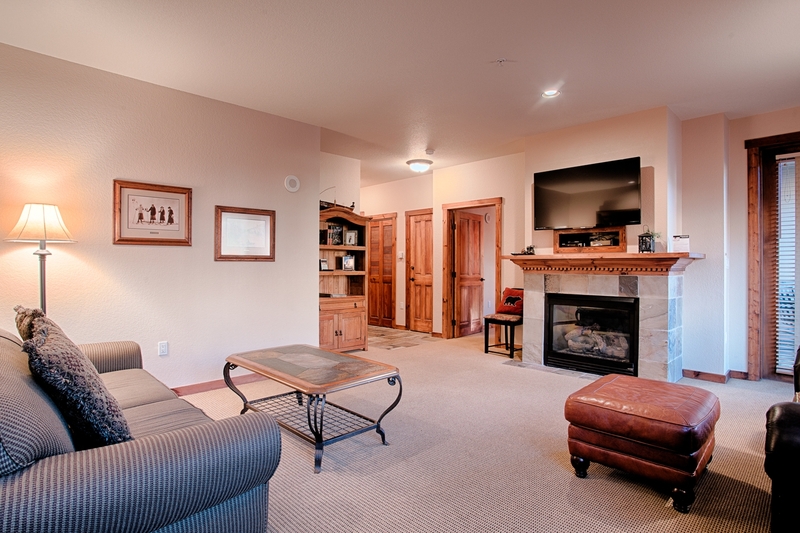 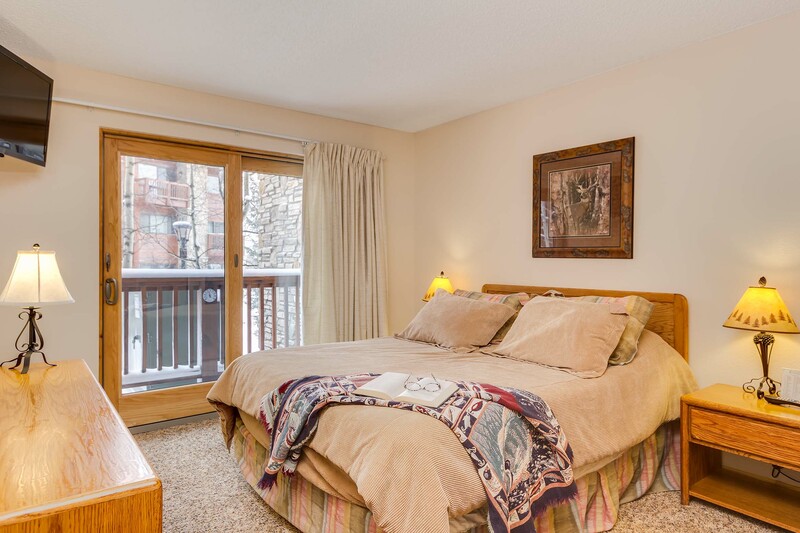 In case you should need additional sleeping space, there is a Twin Daybed in the sleeping alcove, allowing this spacious townhome to comfortably sleep up to eight people. 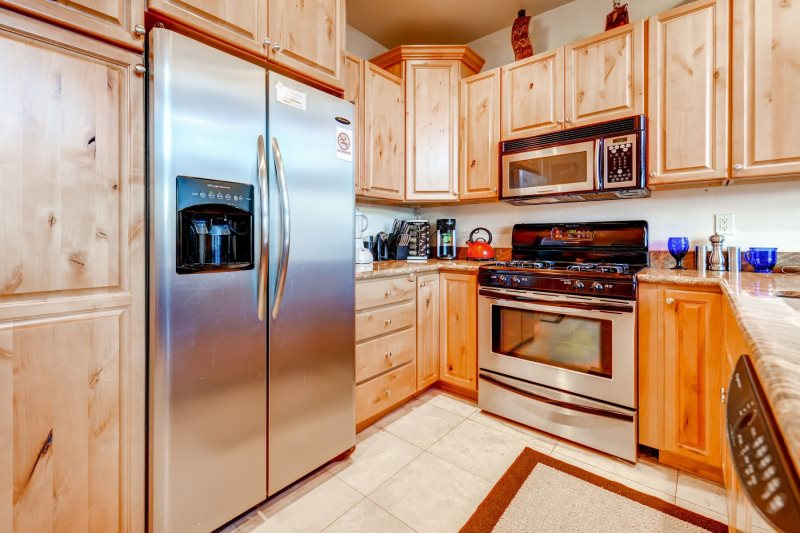 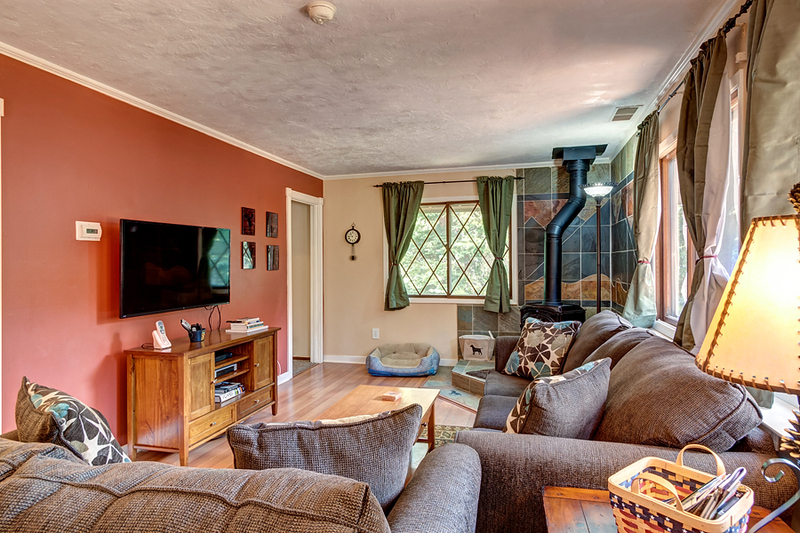 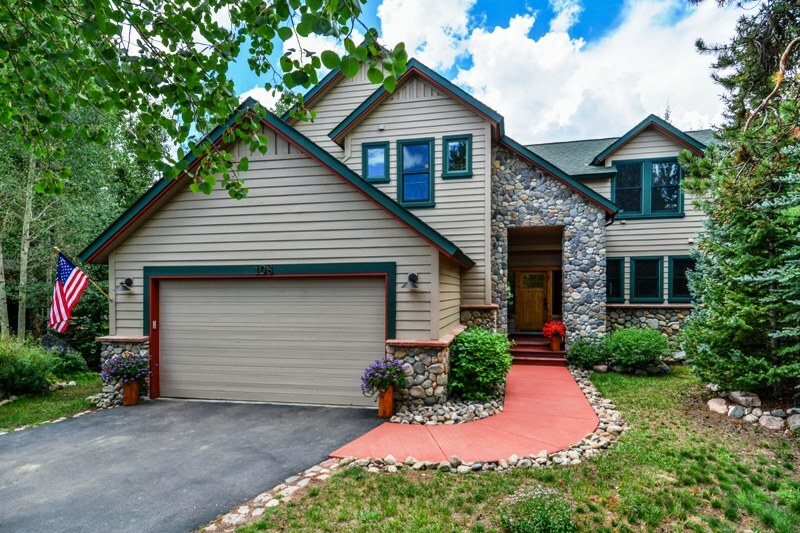 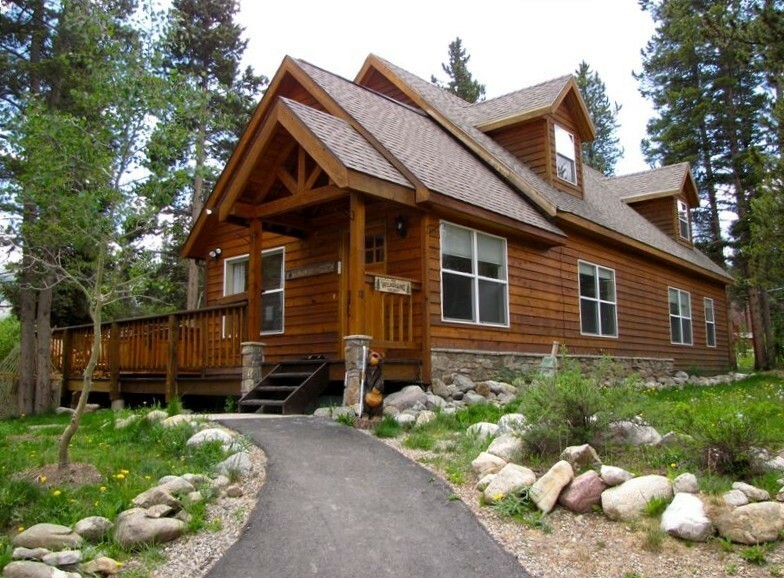 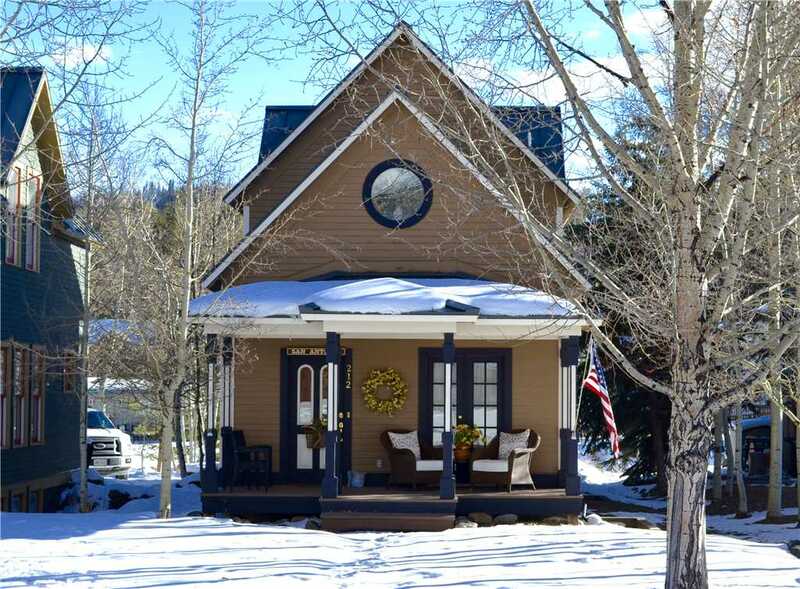 Other amenities include a full-size washer and dryer, wireless high speed internet and a private one car garage that all compliment this fine property. 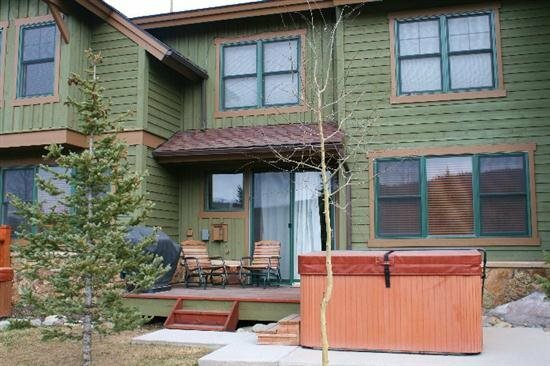 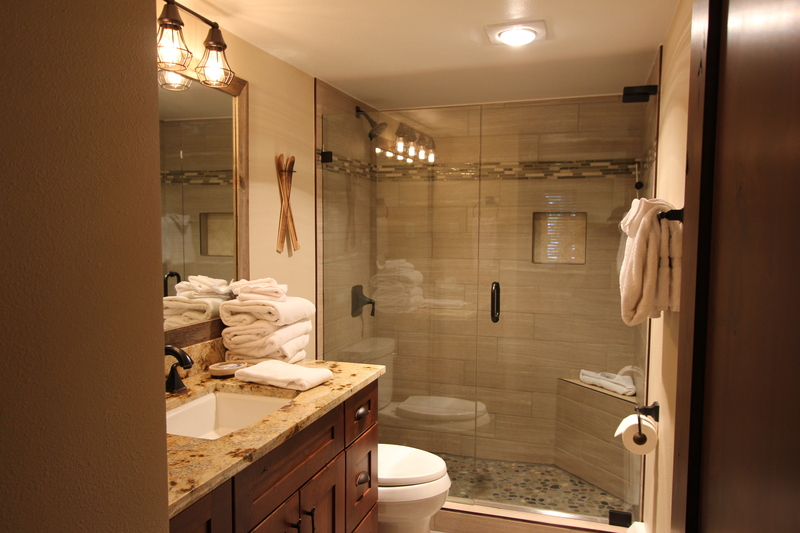 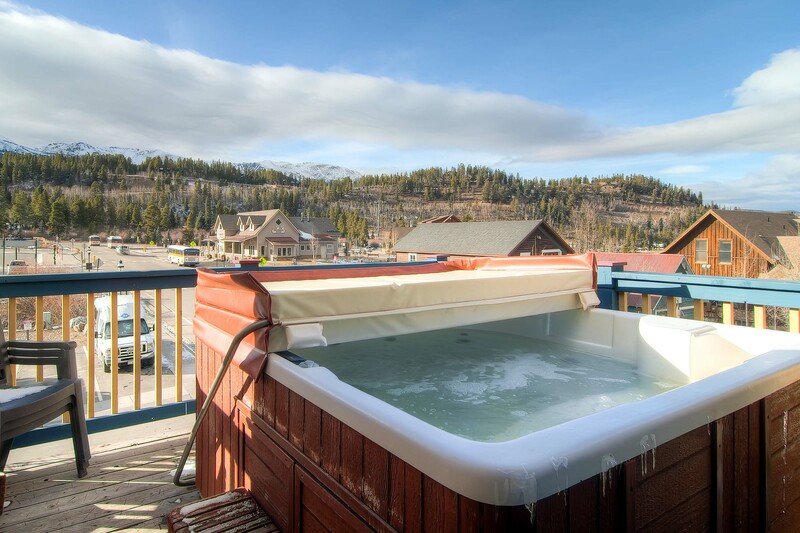 The walk-out deck is highlighted by a private outdoor hot tub, patio furniture and gas grill. 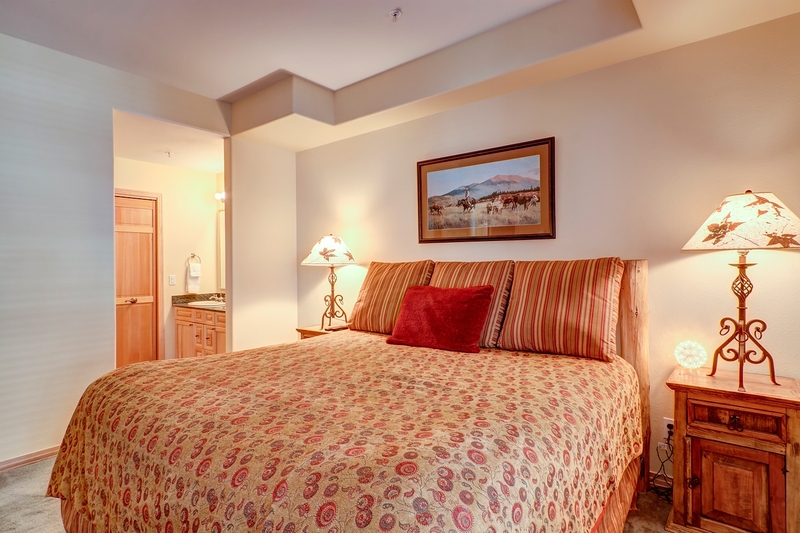 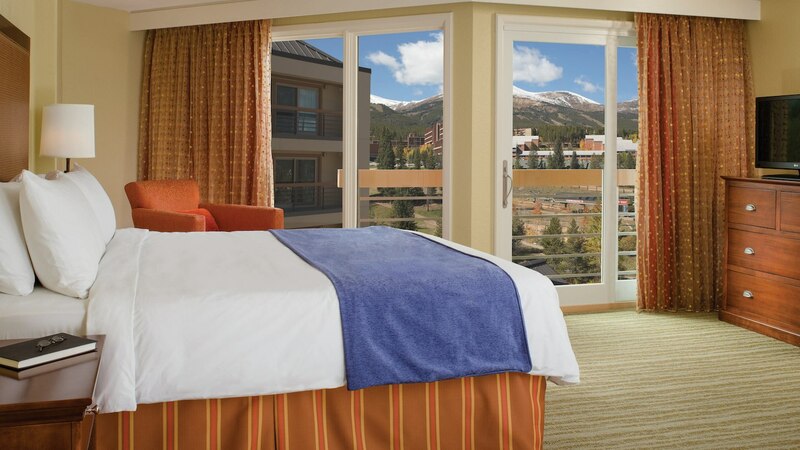 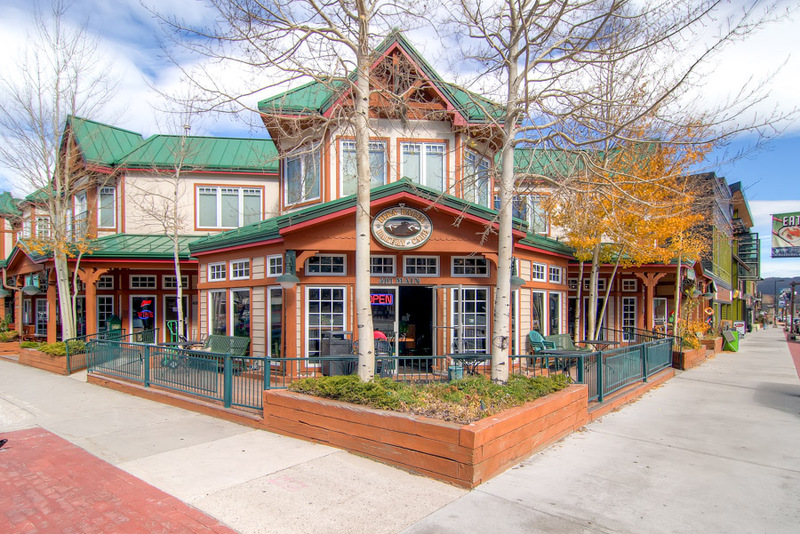 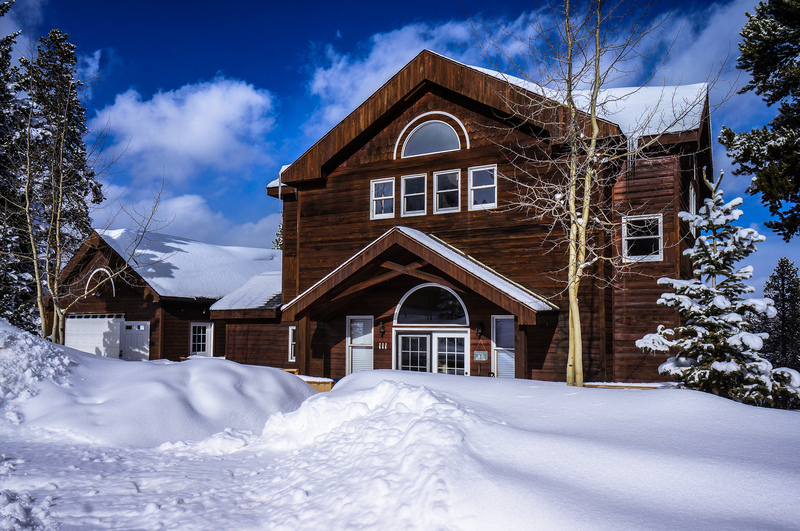 We encourage guests of this property to take advantage of the complimentary guest shuttle service provided by the property manager.